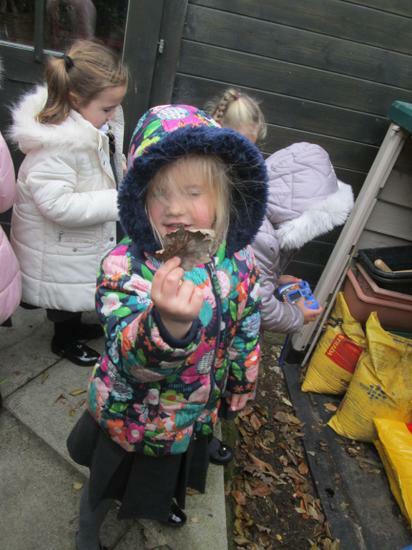 After all 5 of our painted lady butterflies emerged from their cocoons on the last day of term, I gave them sugar water, flowers and fruit and then released them on Monday. 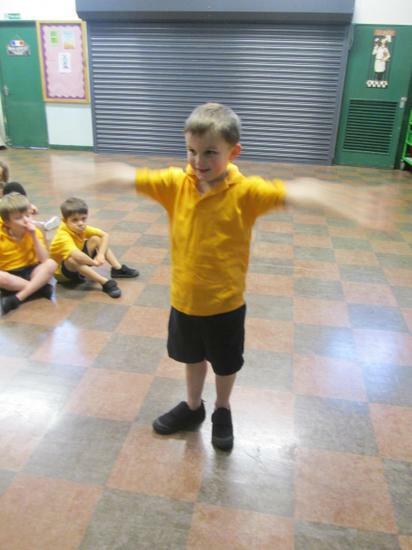 So far 3 have flown away, with some pictures below. 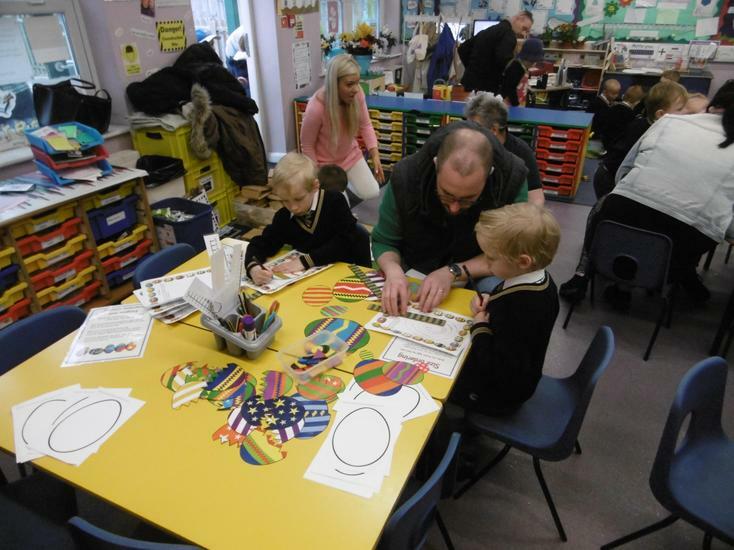 We had a lovely afternoon exploring all the aspects of our maths curriculum. 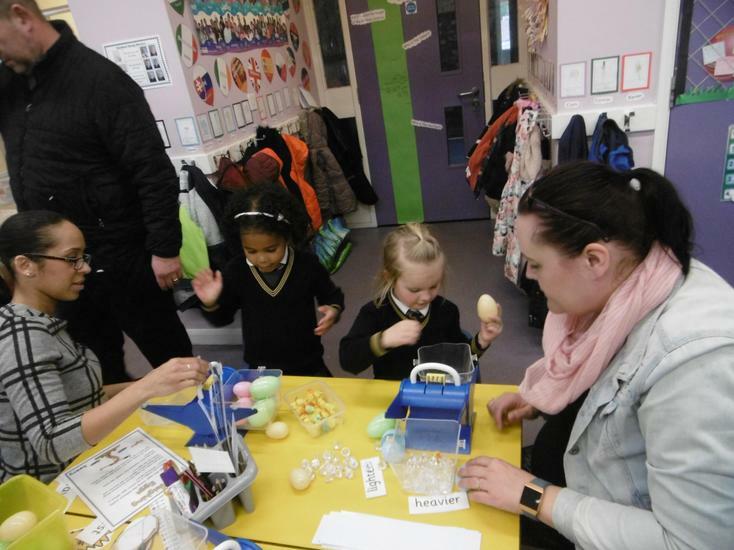 We counted objects, solved sums, found missing numbers and estimated the number of chicks and eggs. 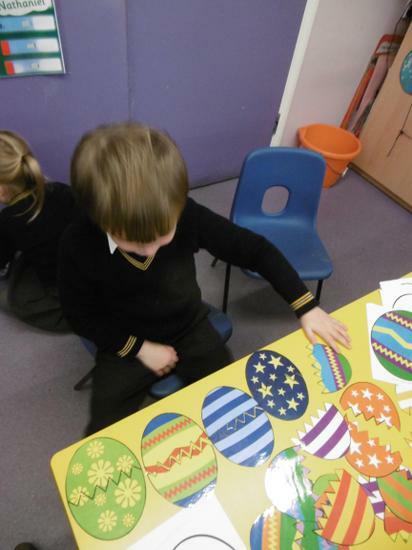 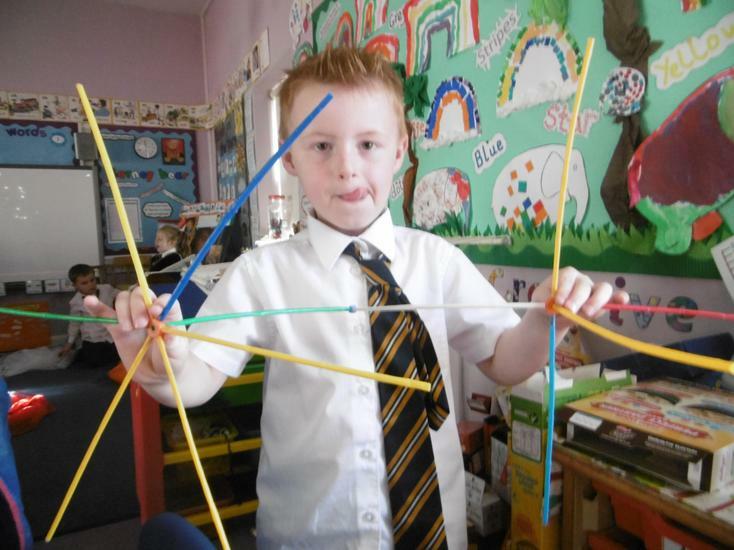 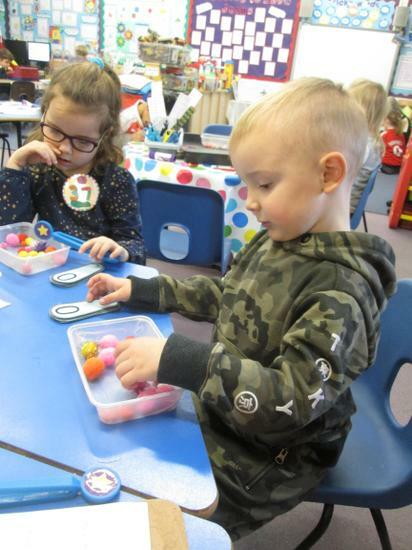 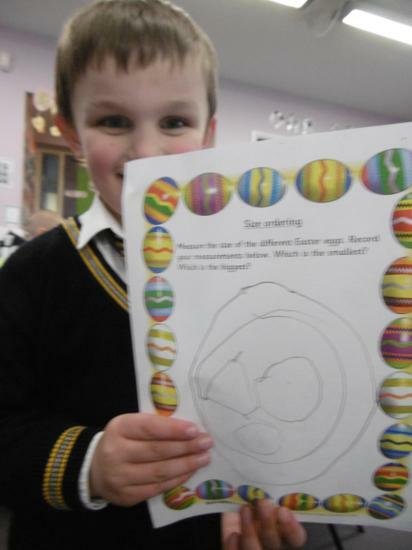 We also made symmetrical shape patterns and patterned eggs using 2d & 3d shapes, weighed objects and described the position of the rabbit, sheep and chick. 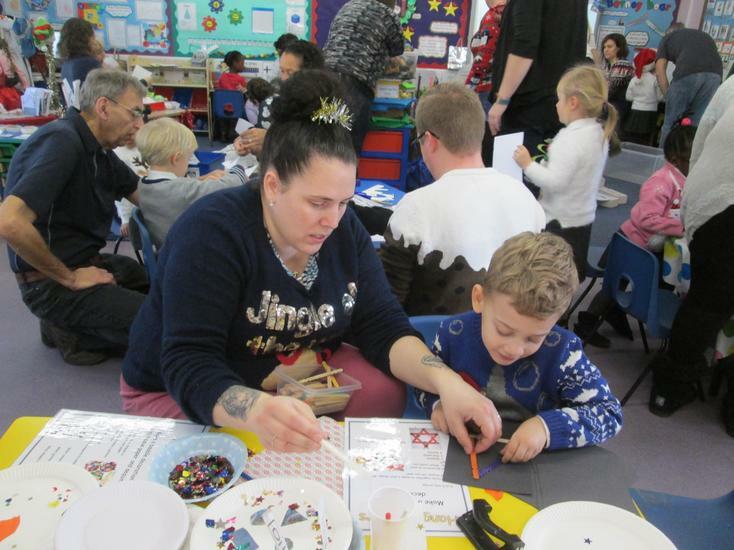 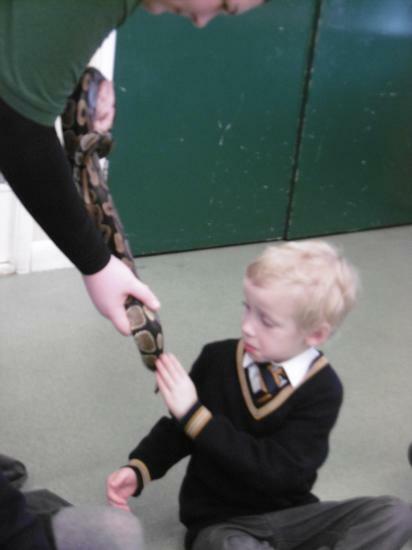 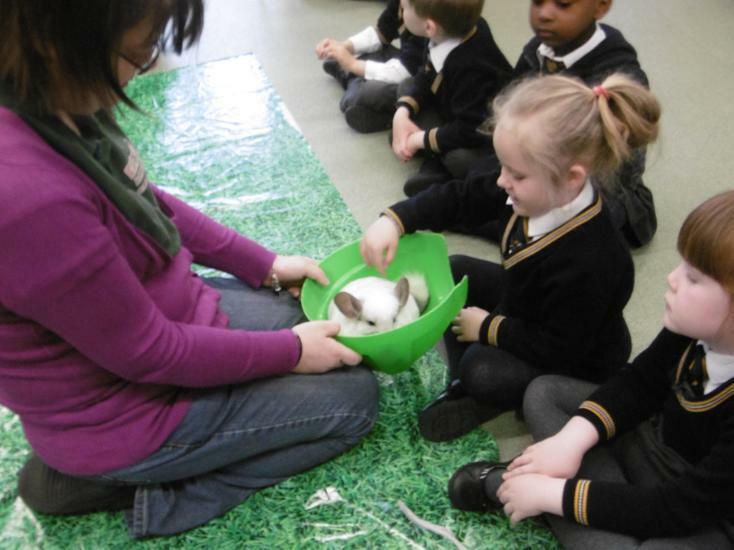 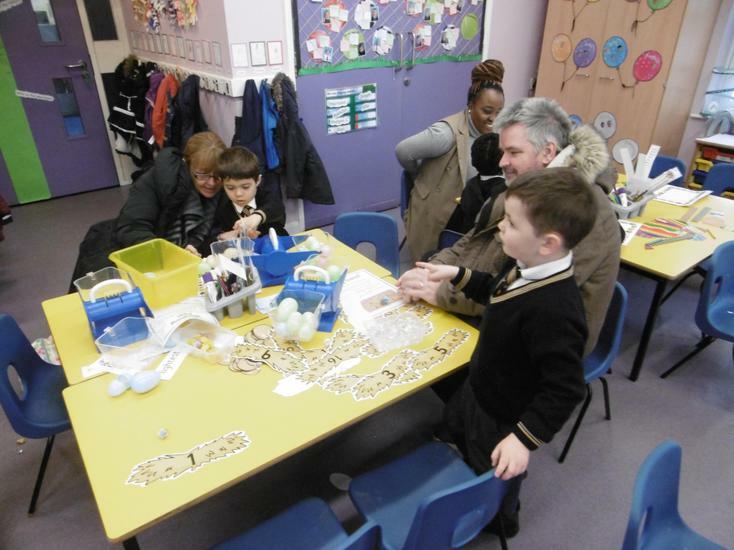 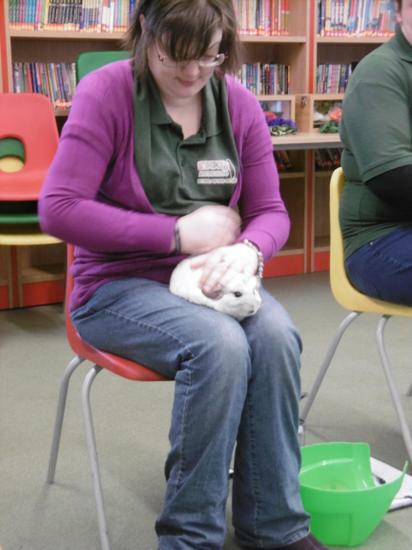 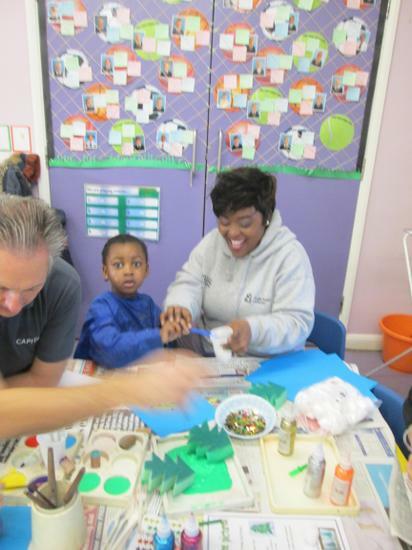 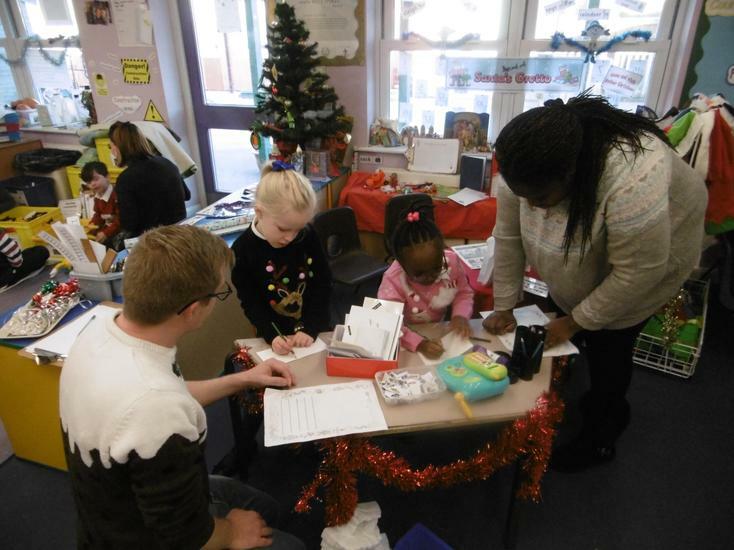 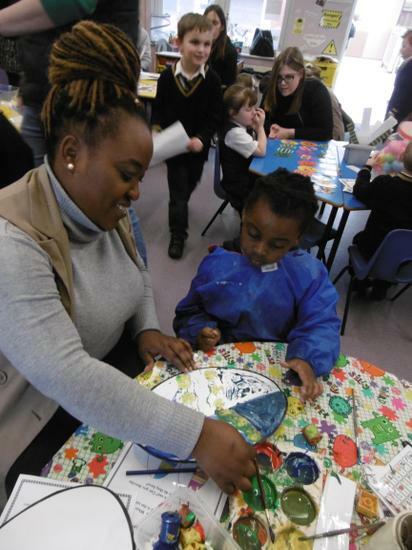 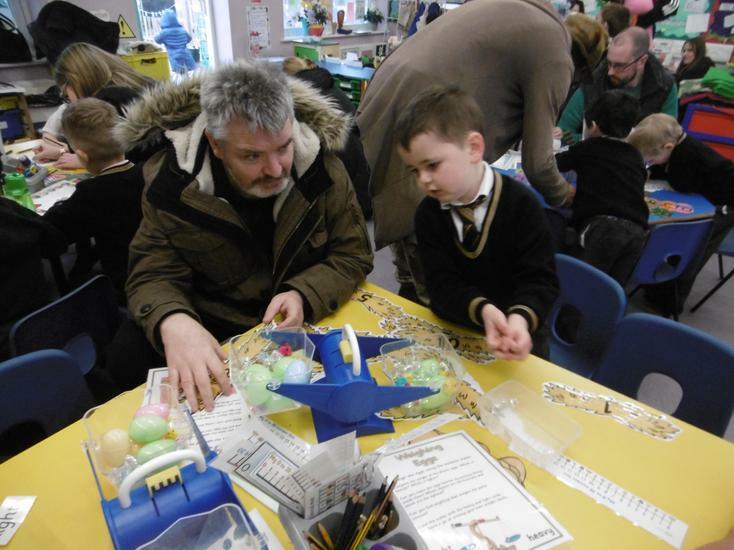 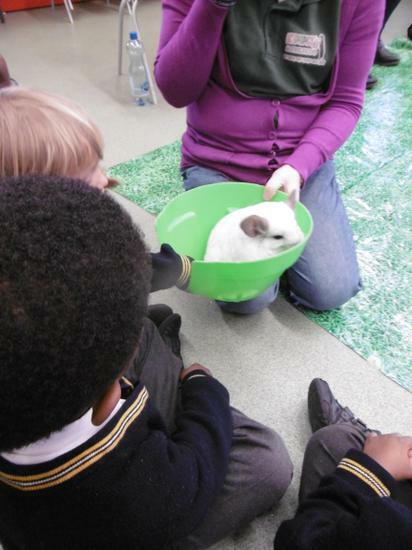 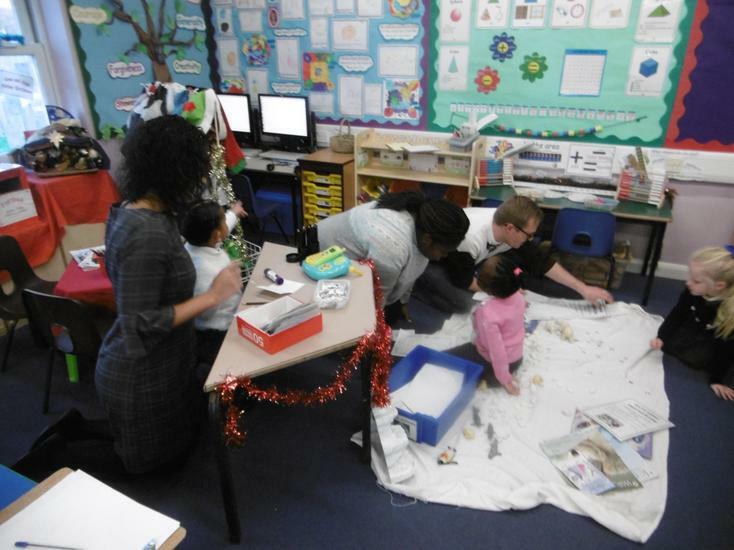 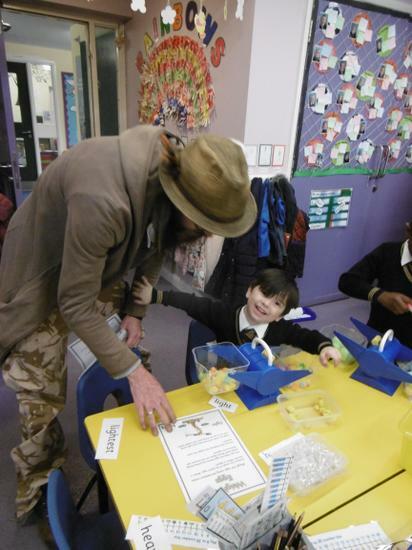 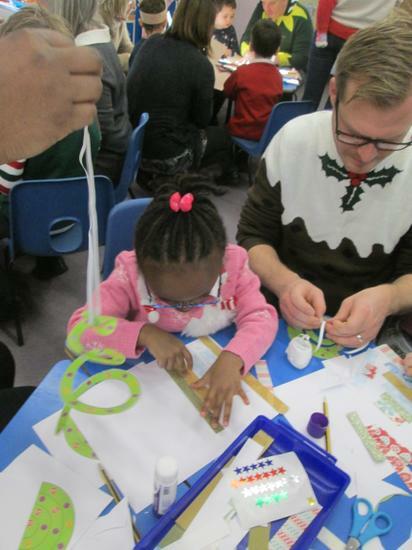 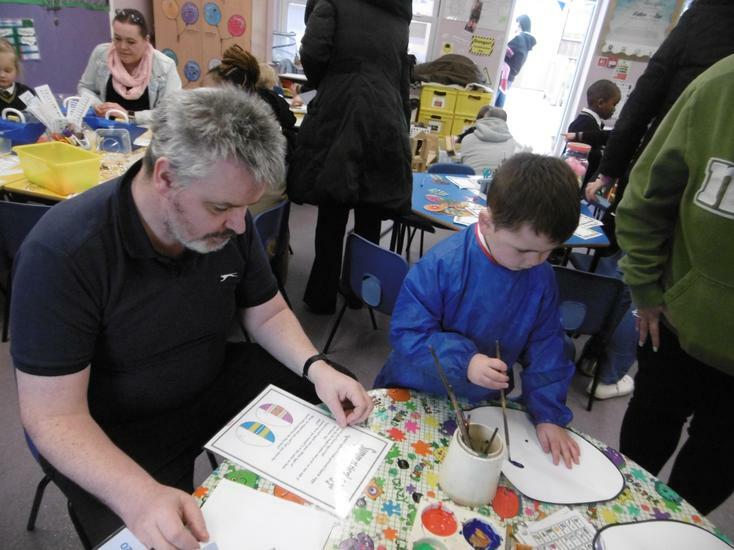 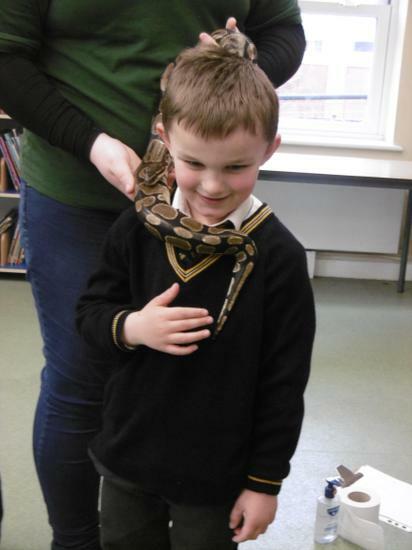 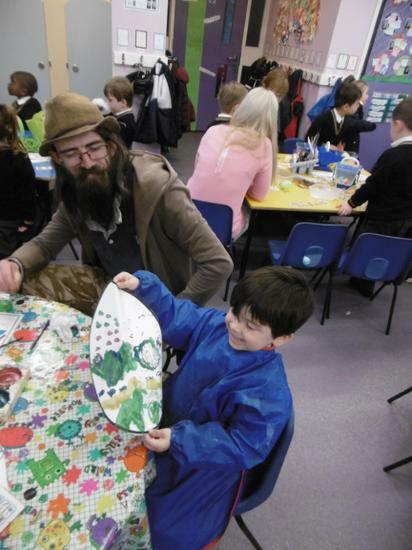 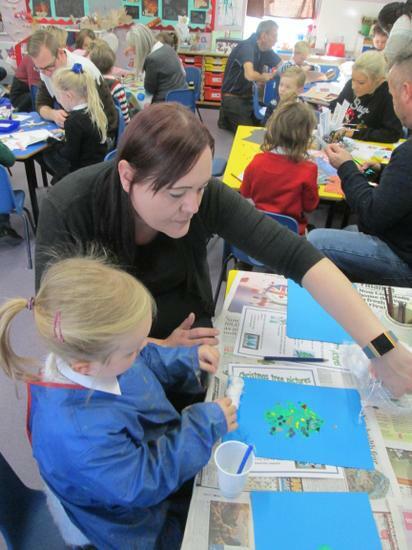 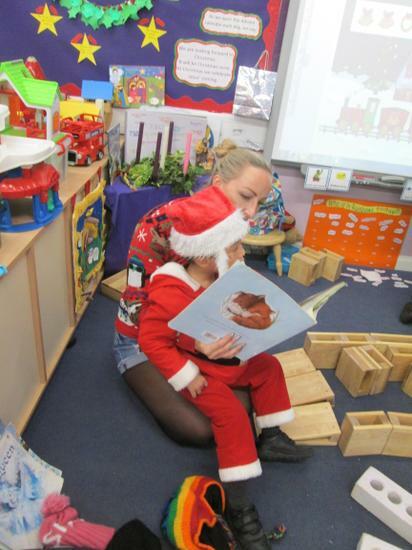 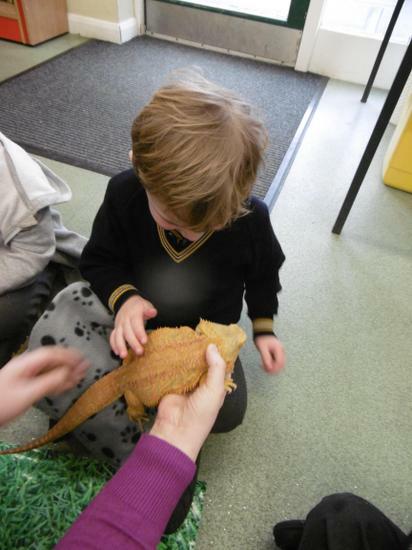 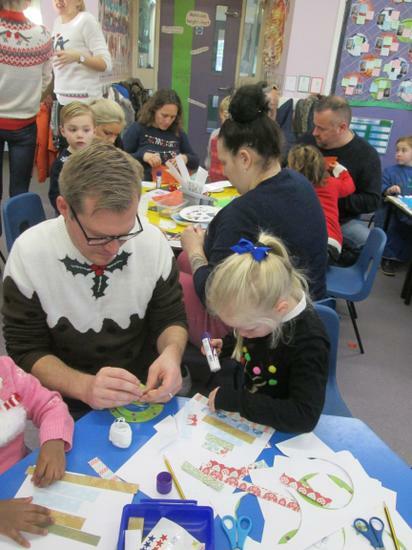 Thank you to those adults who joined us and we hope you enjoyed yourselves as much as the children did! 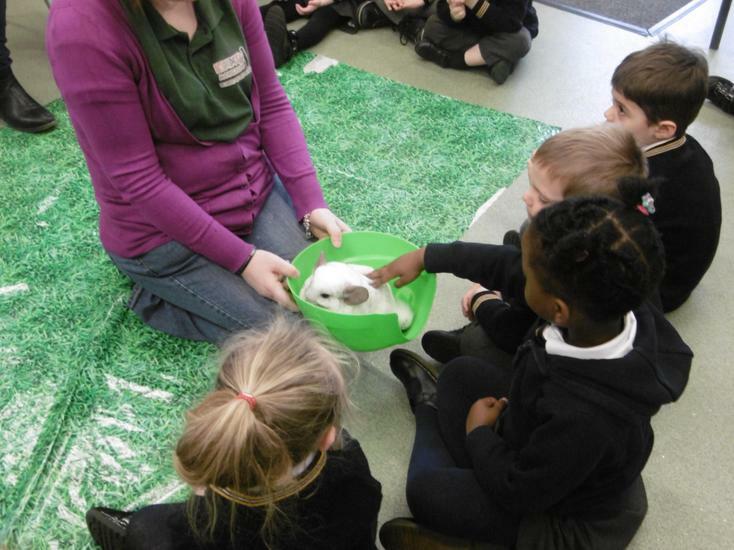 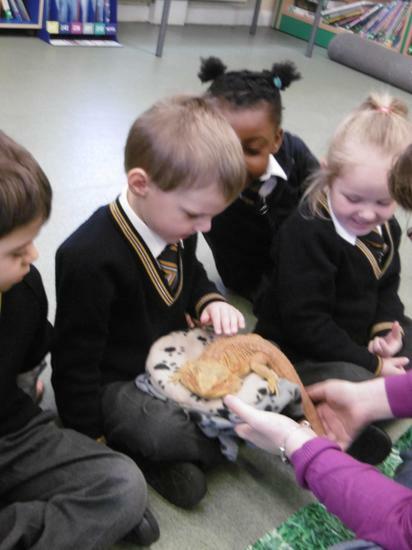 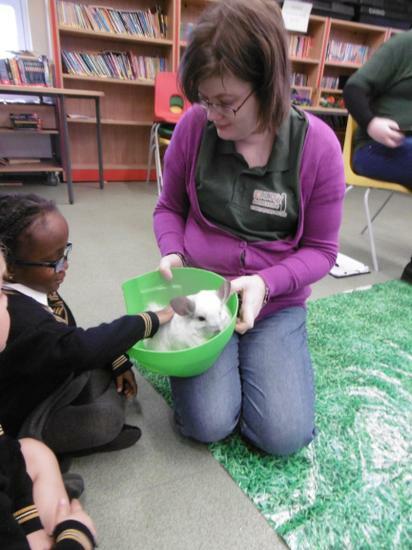 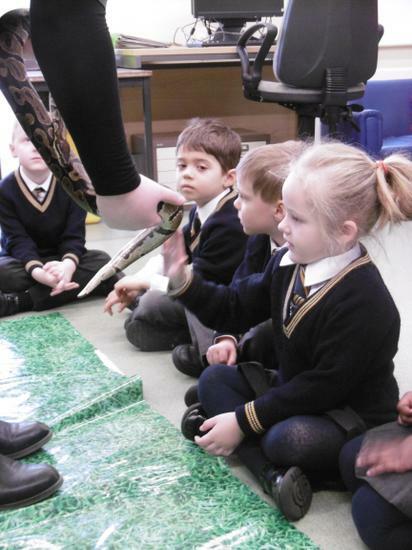 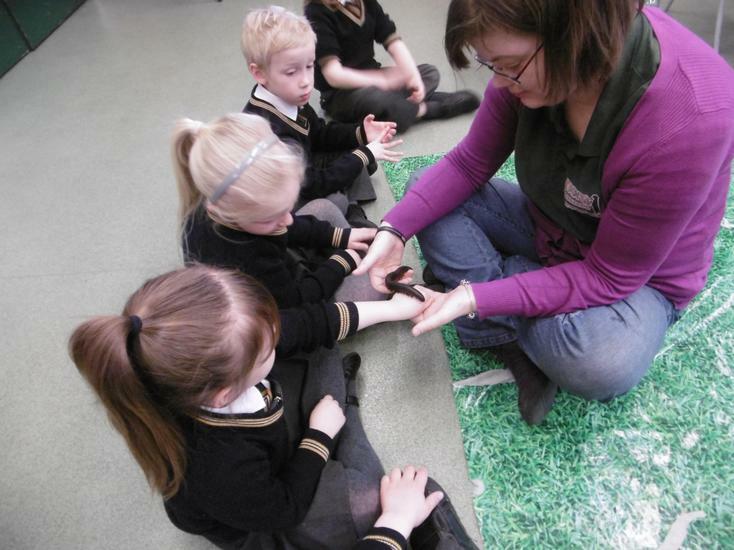 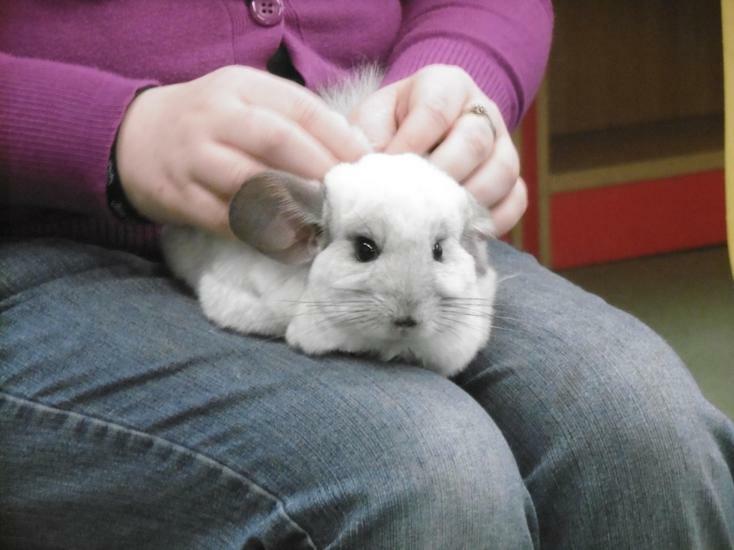 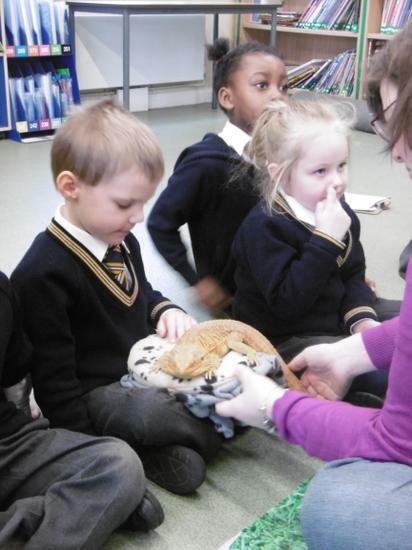 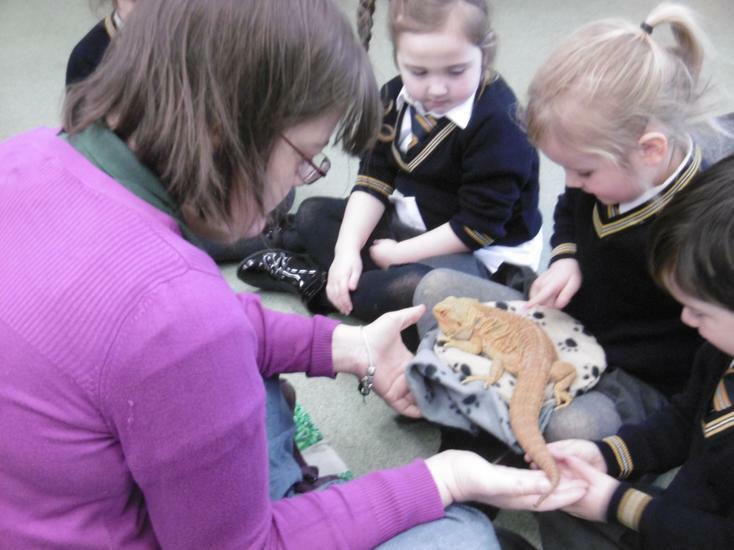 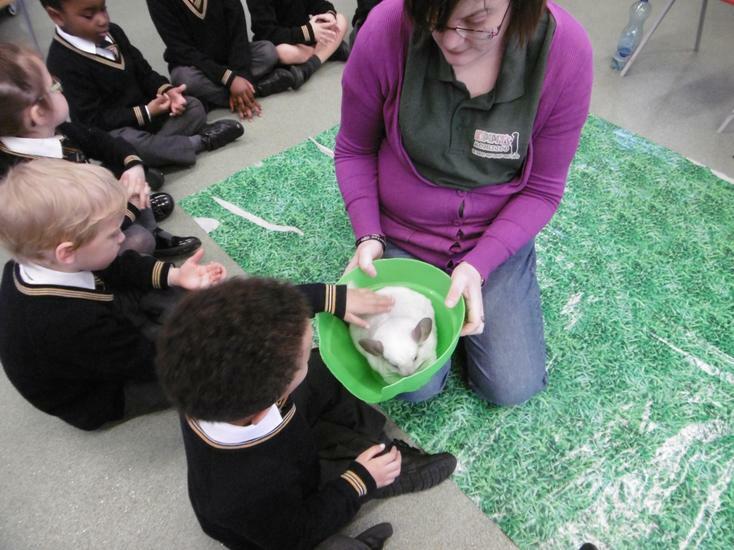 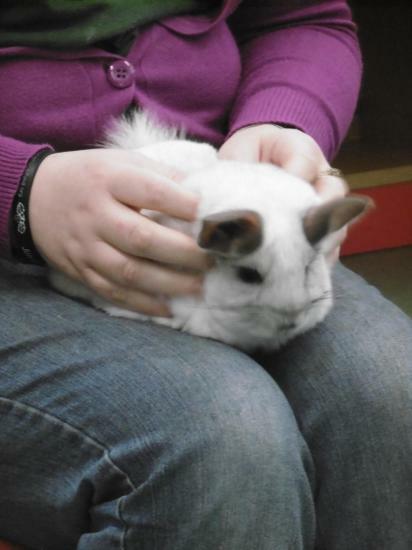 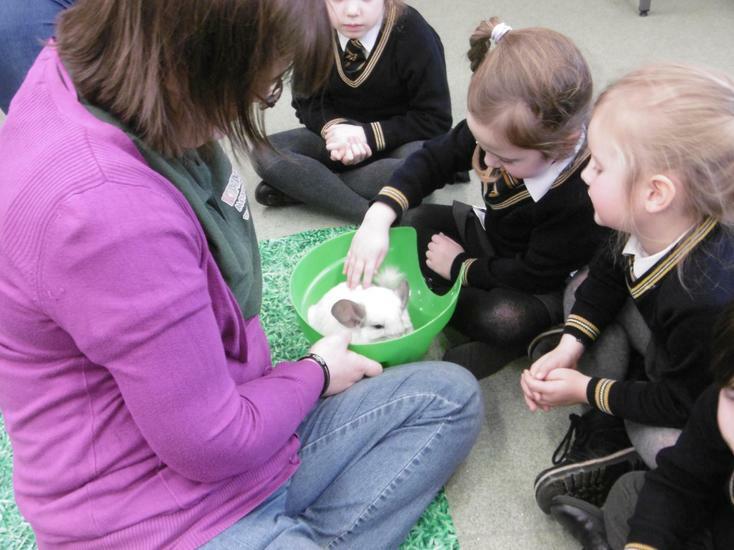 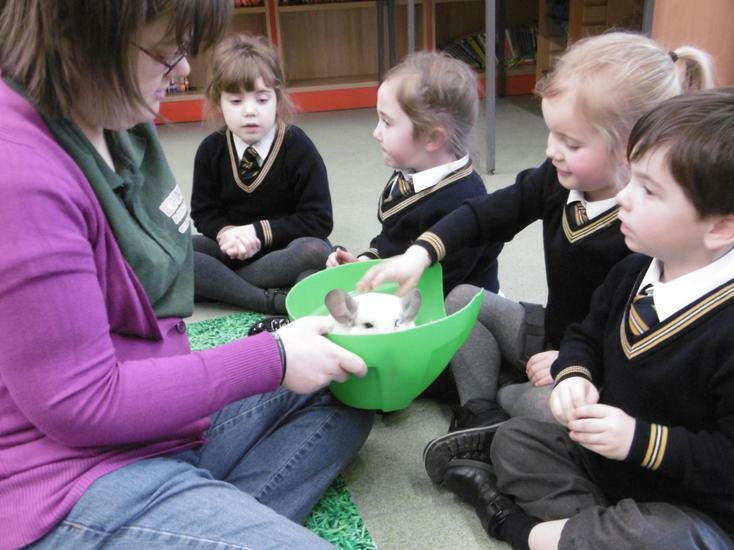 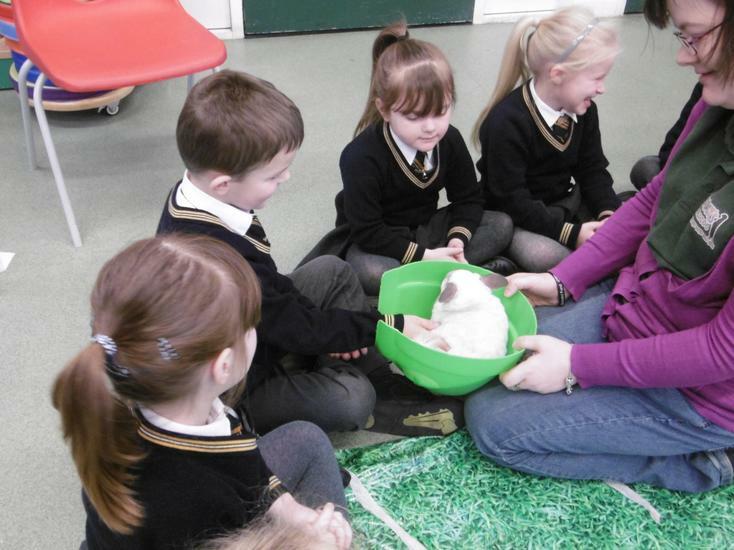 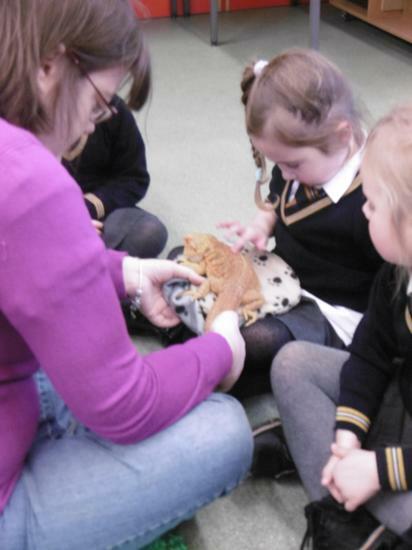 We split into two groups this morning for a very exciting visit from Kimmy's Zoo. 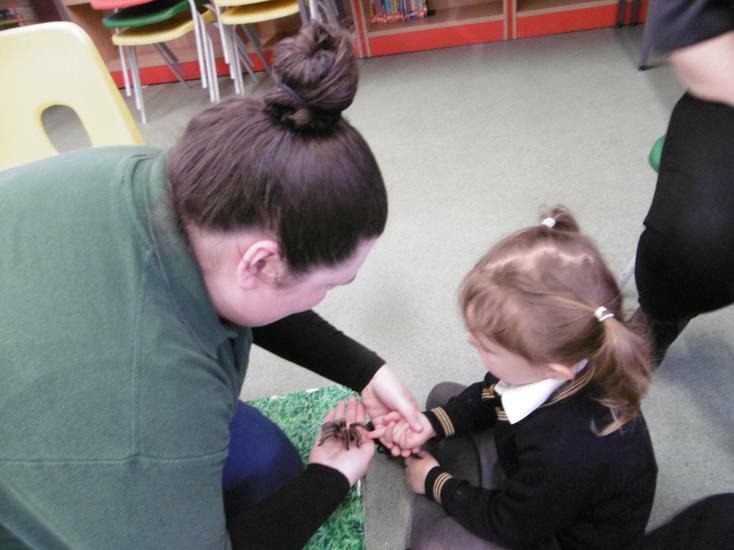 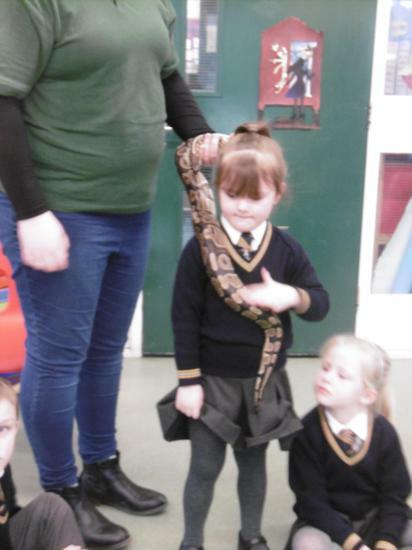 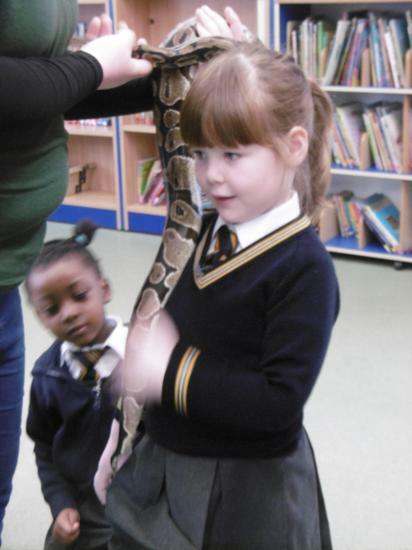 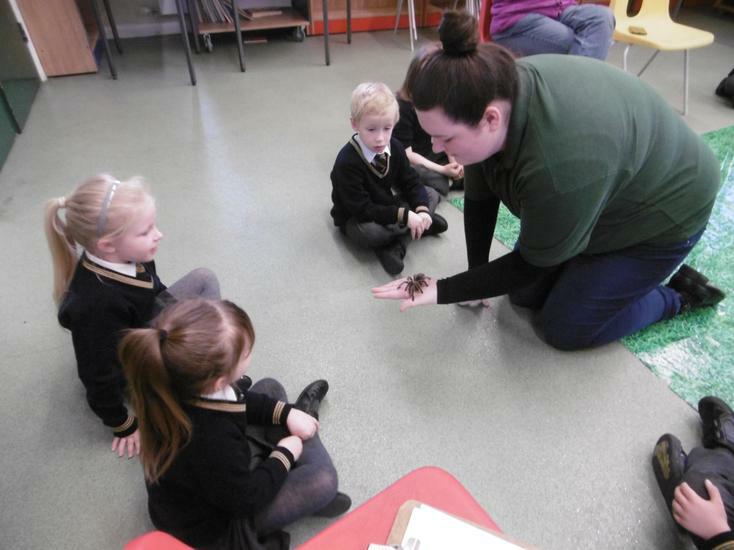 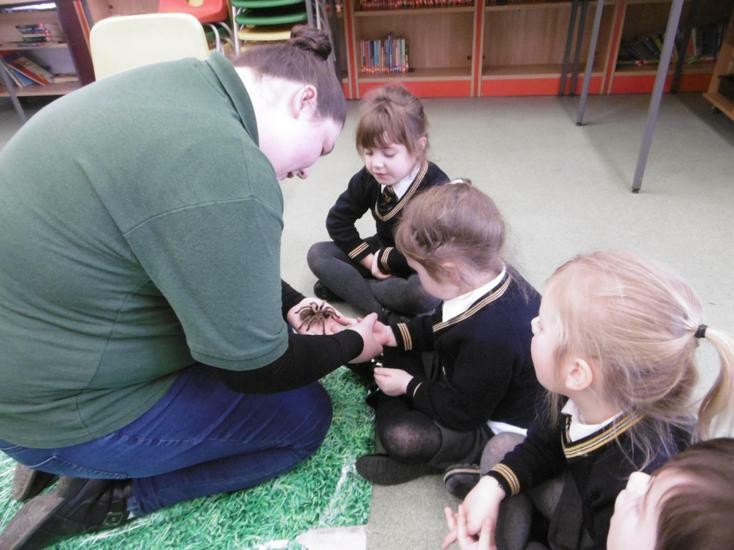 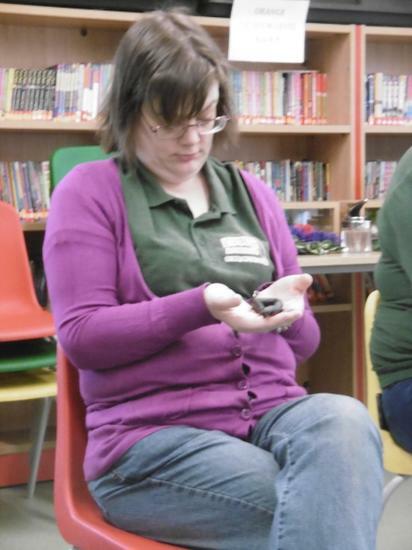 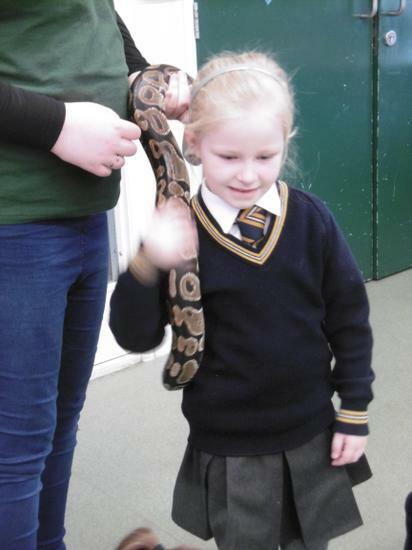 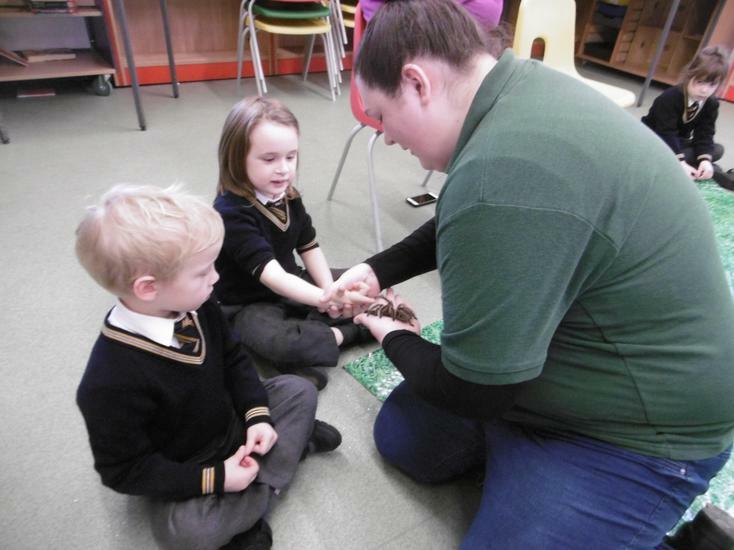 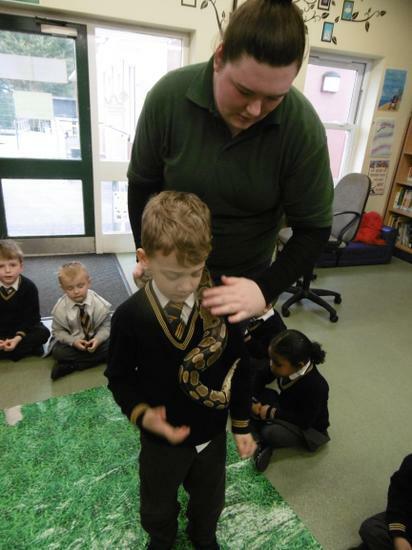 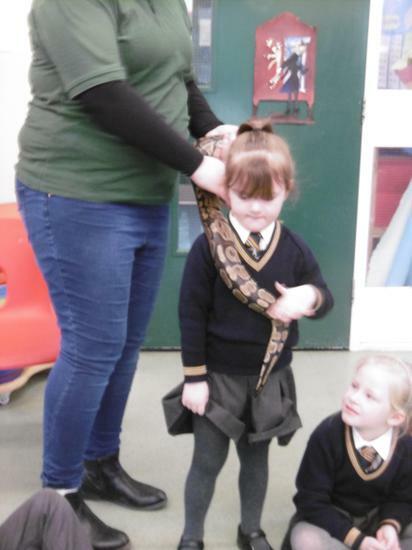 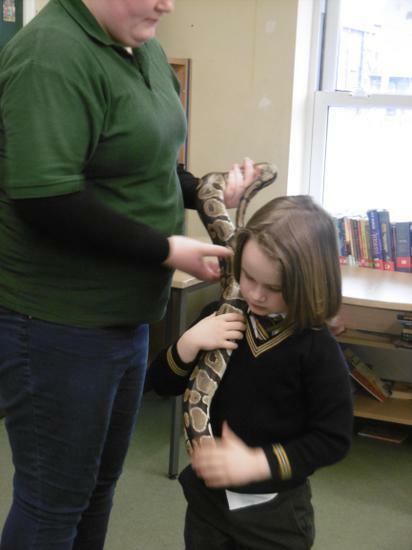 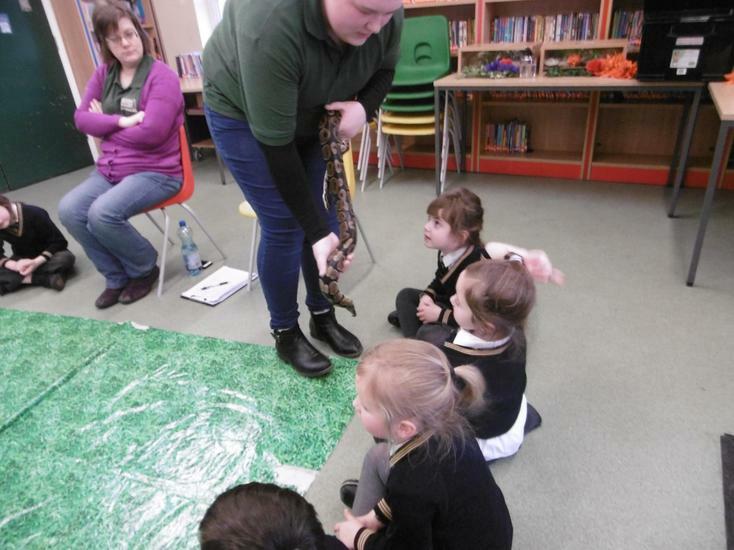 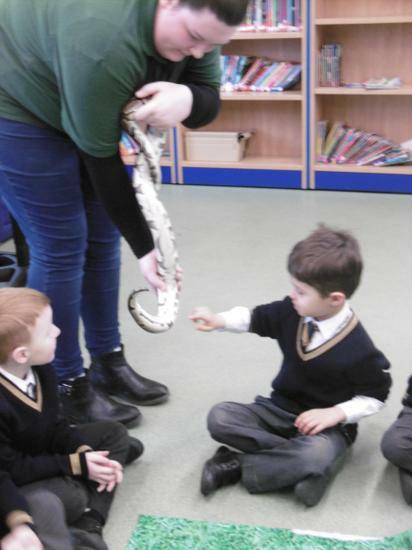 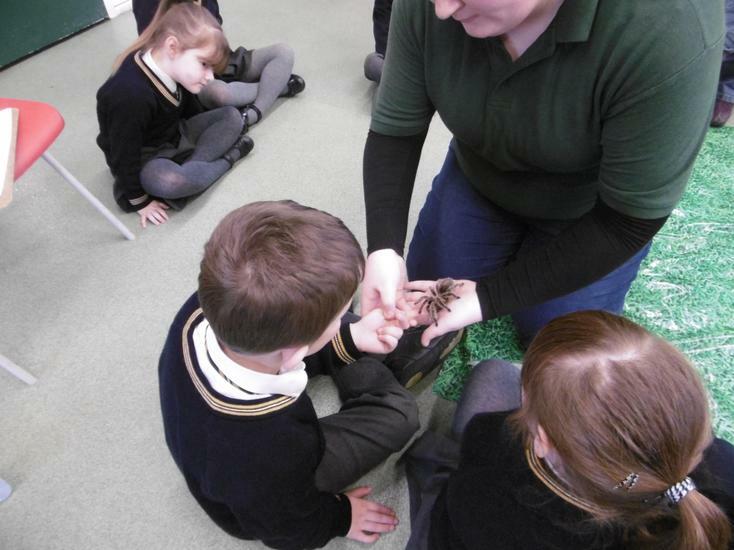 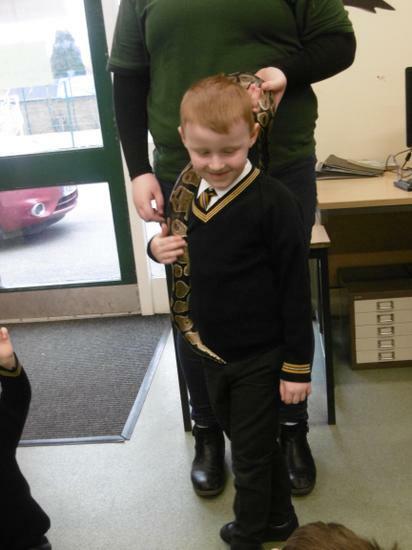 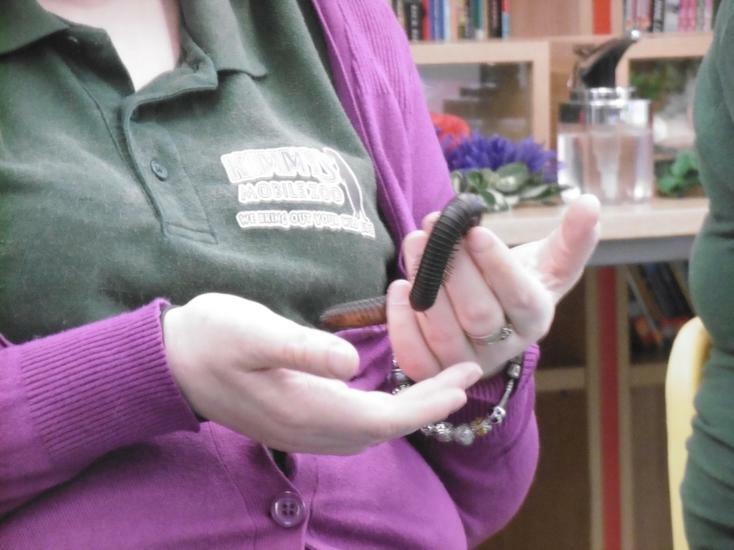 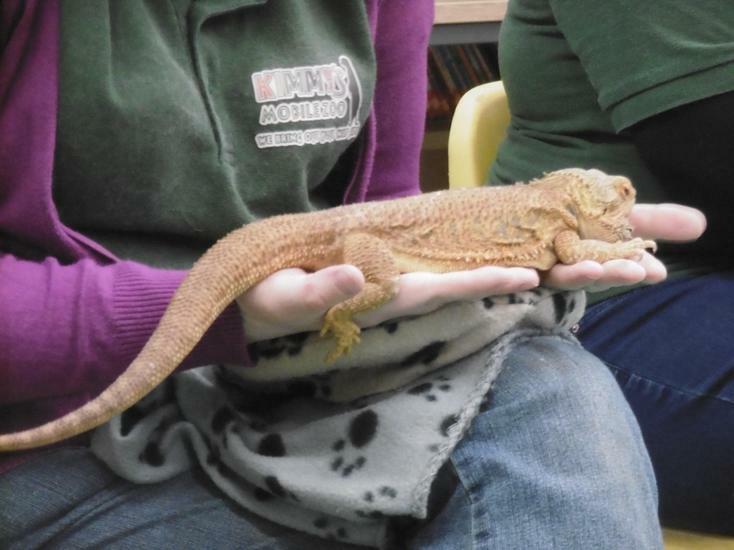 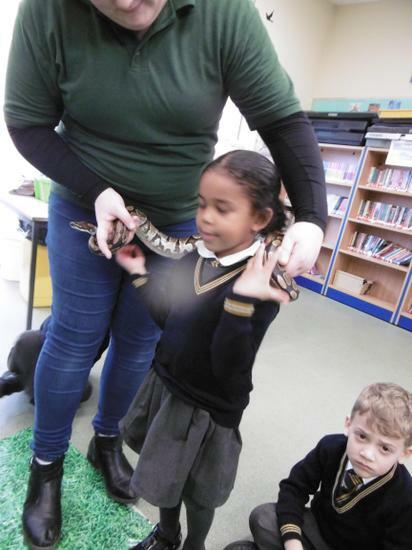 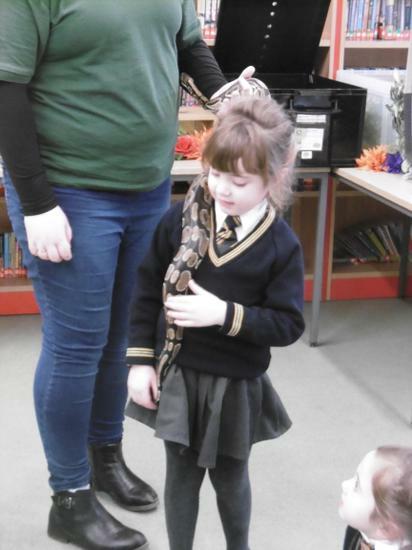 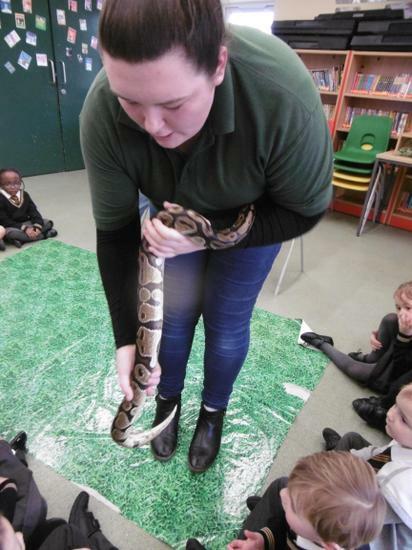 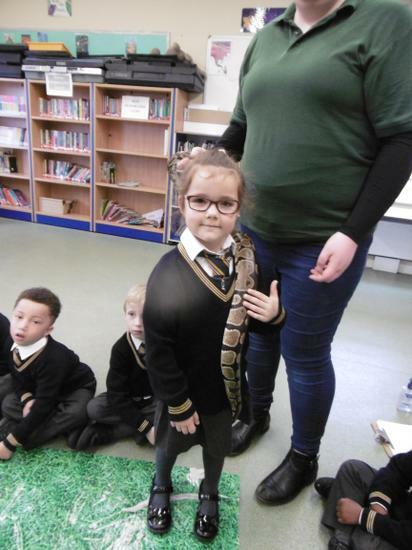 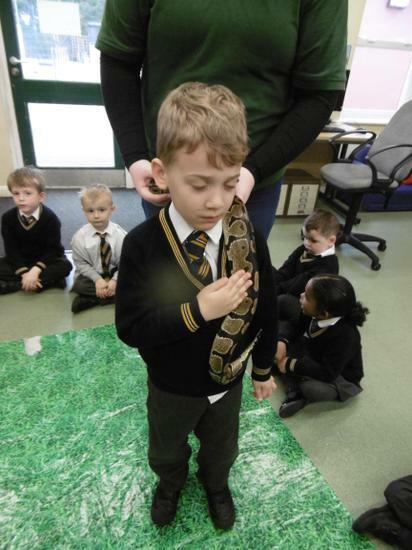 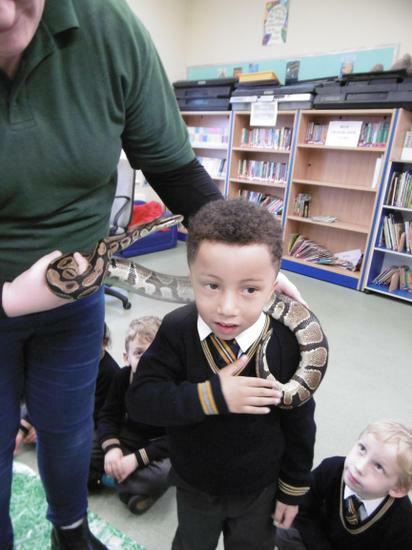 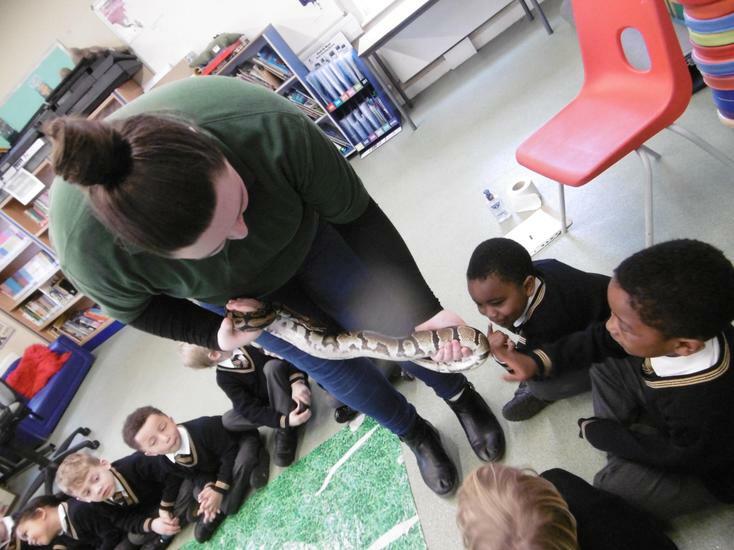 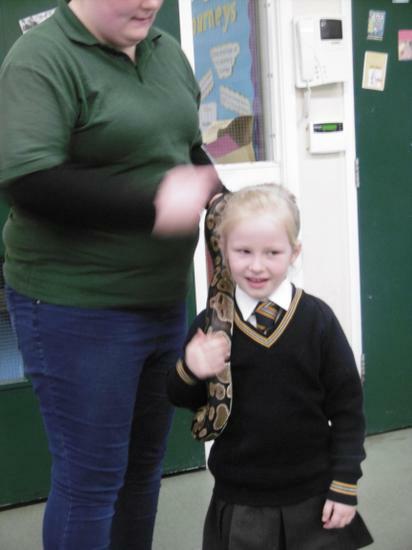 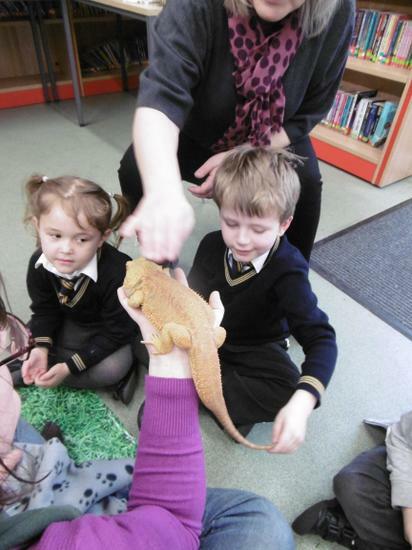 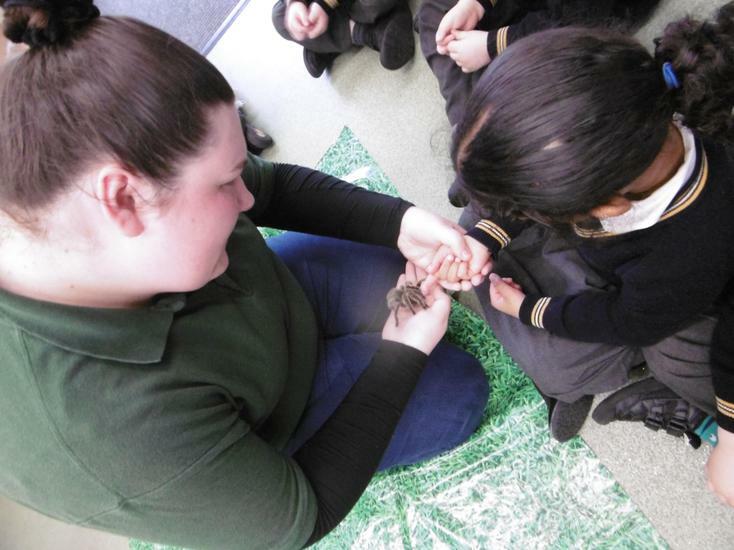 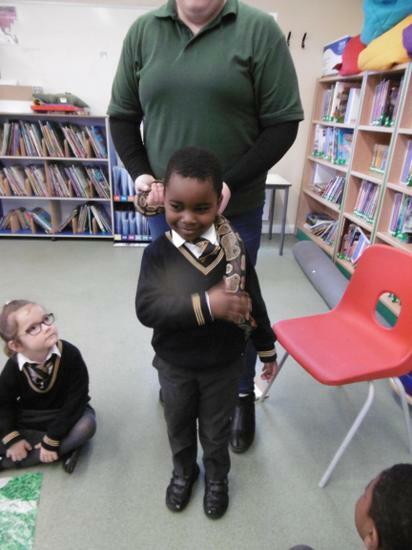 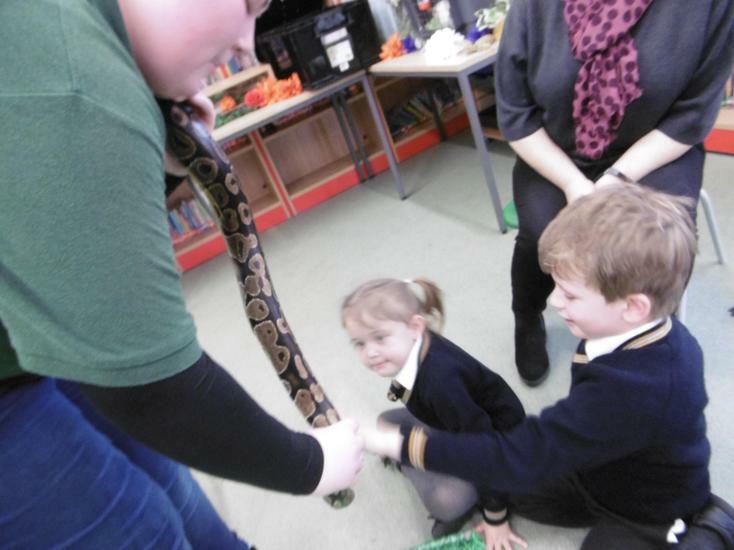 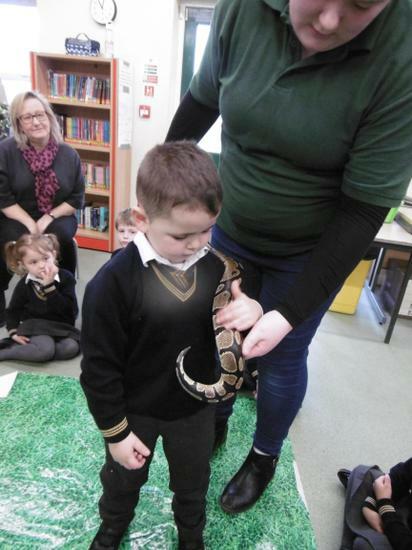 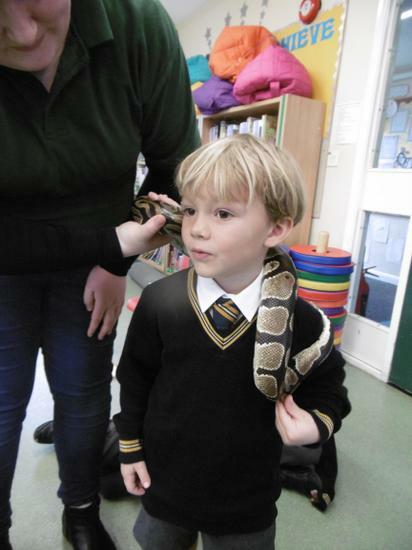 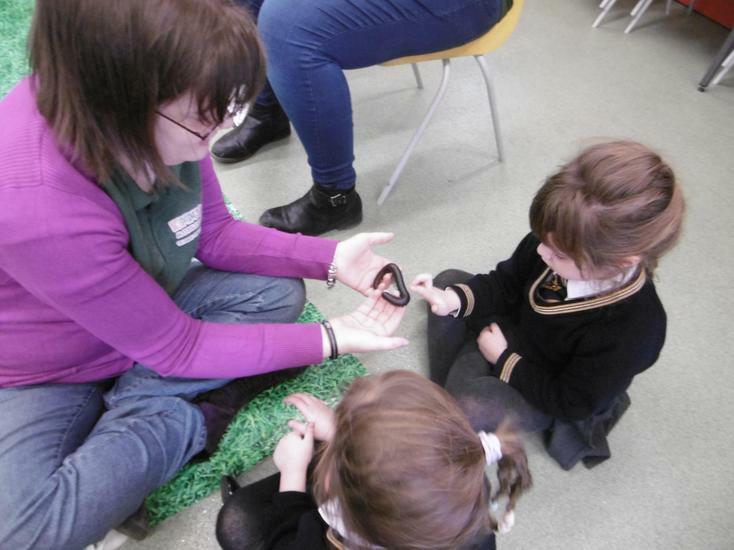 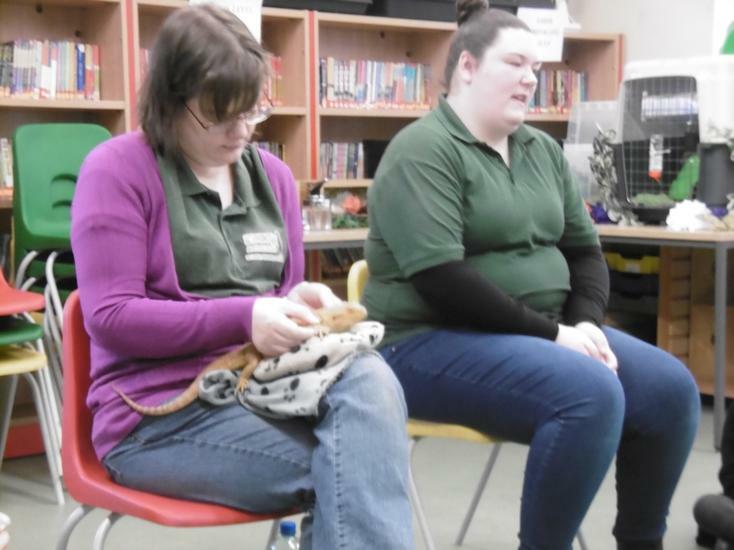 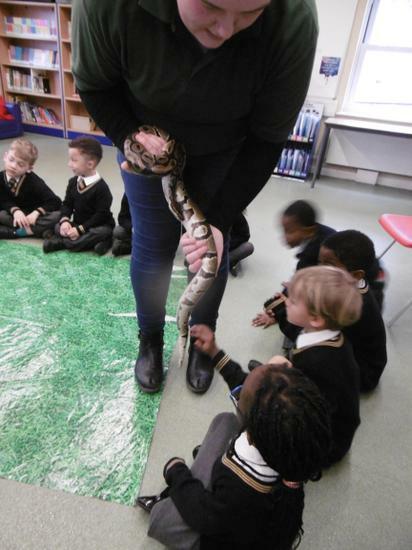 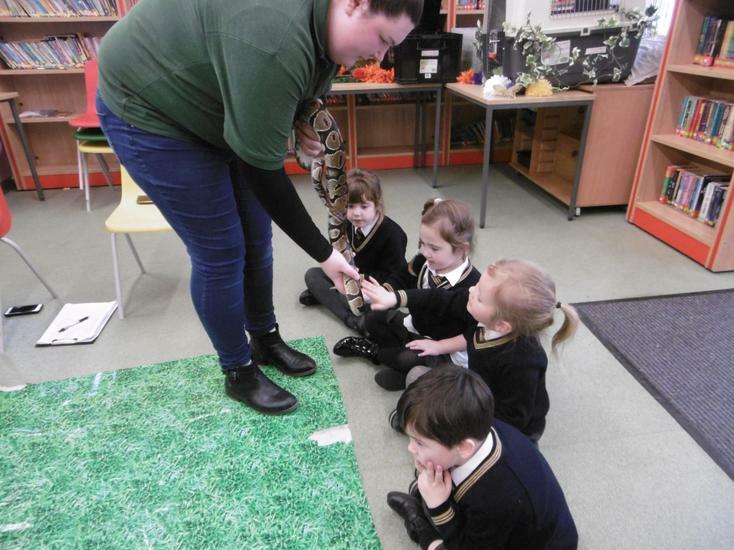 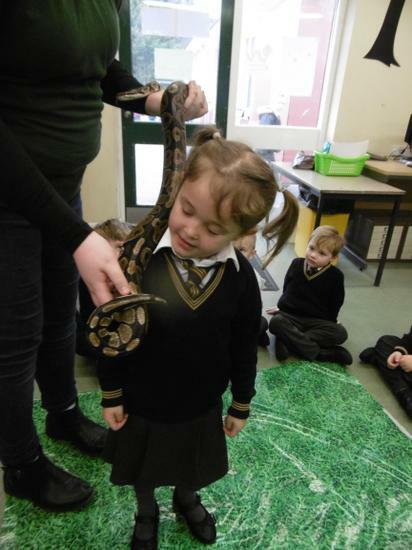 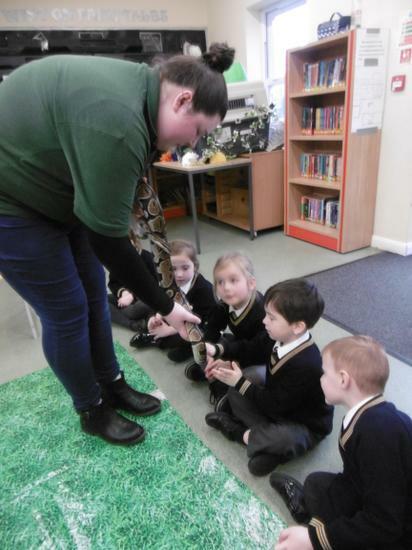 Amy and Sarah introduced us to 5 creatures; a bearded dragon, royal python snake, giant millipede, tarantula and chinchilla. 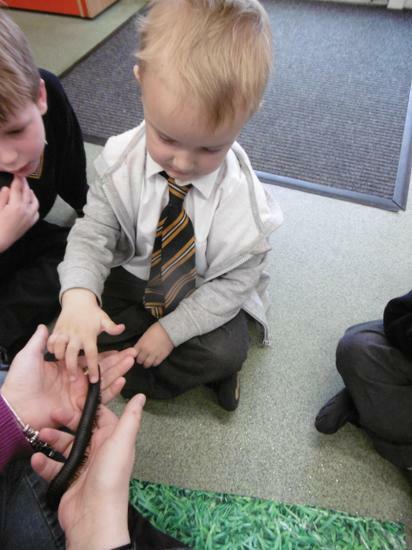 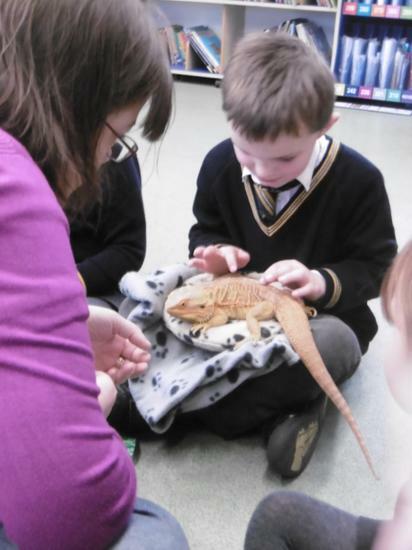 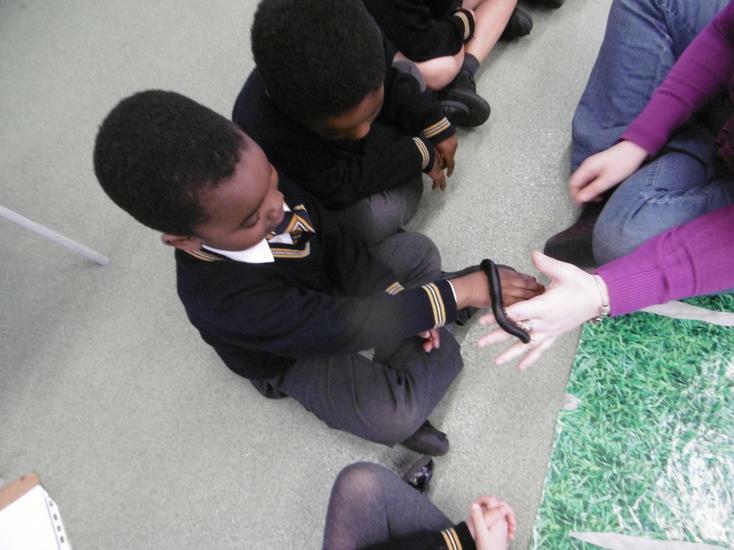 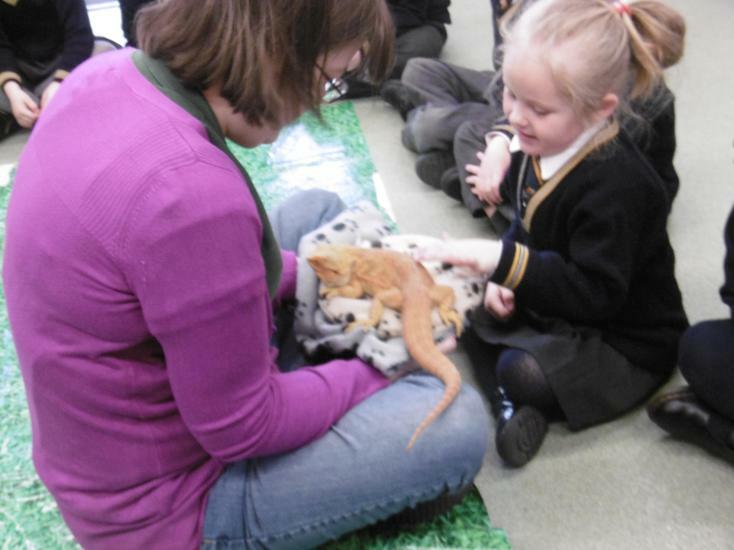 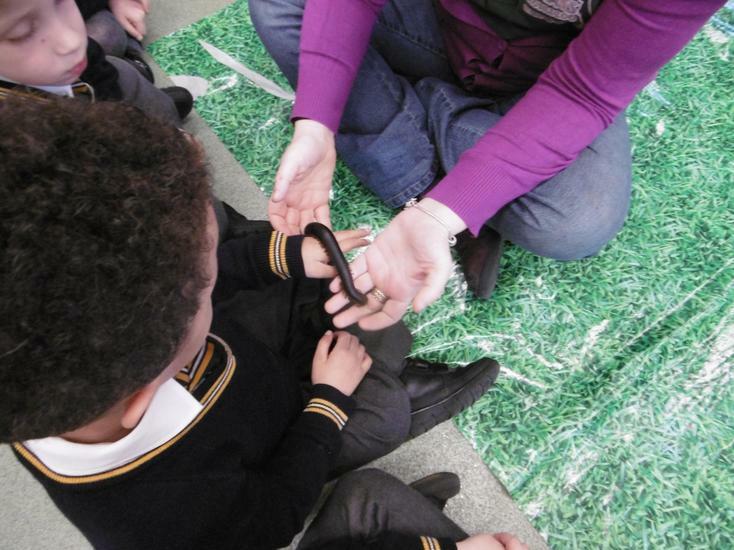 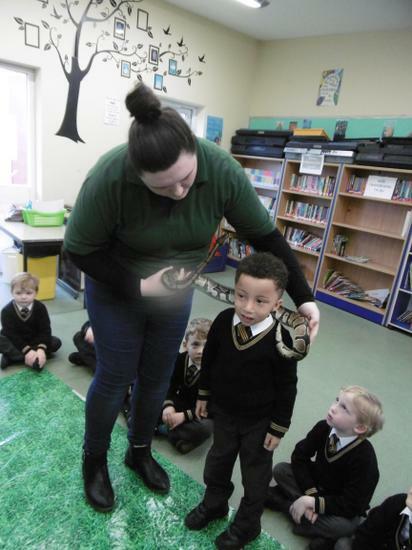 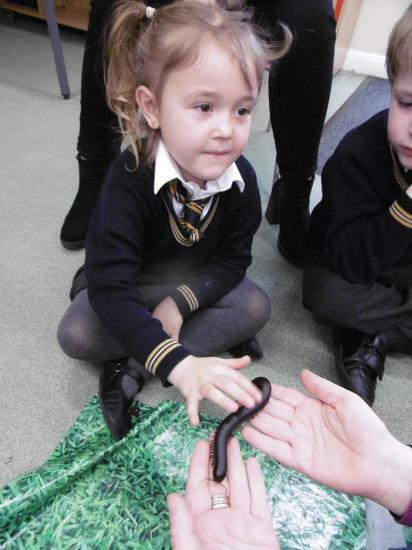 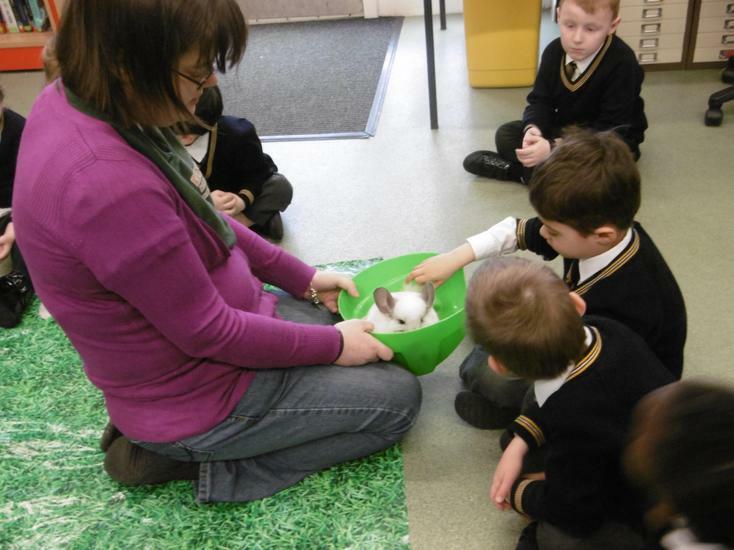 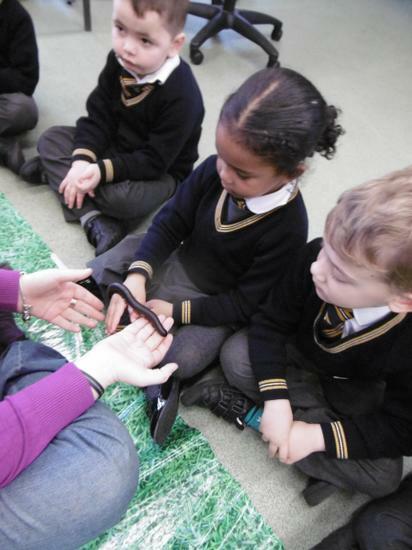 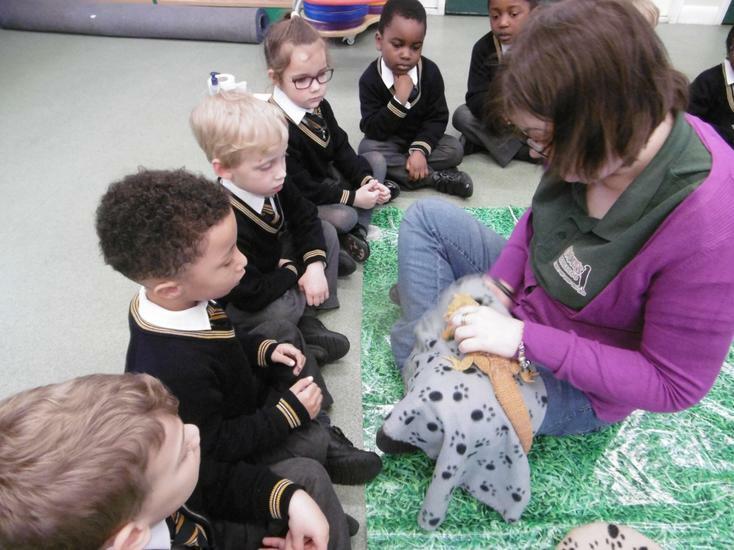 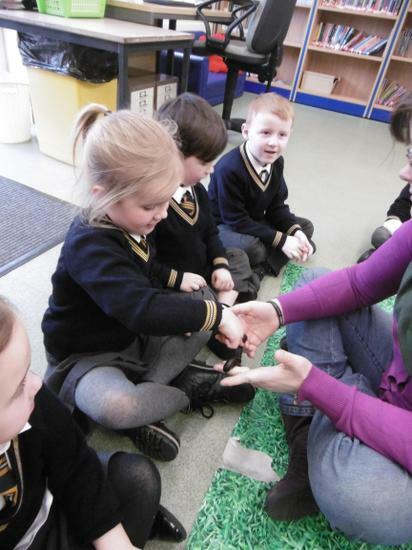 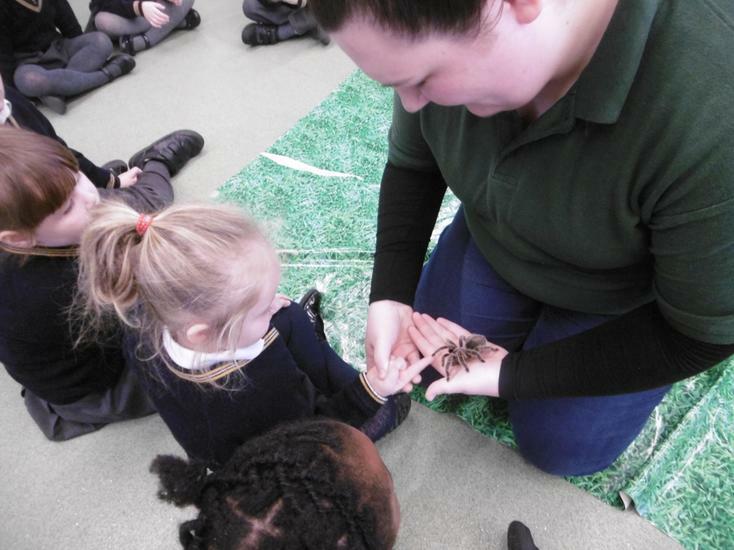 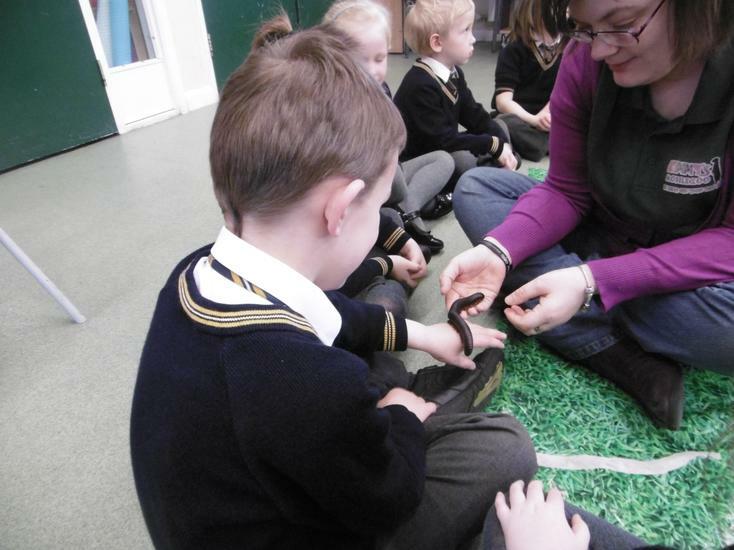 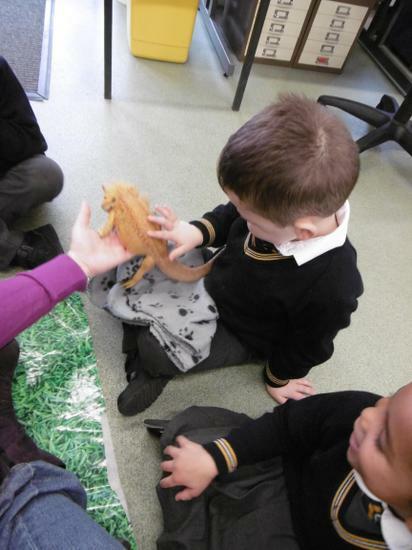 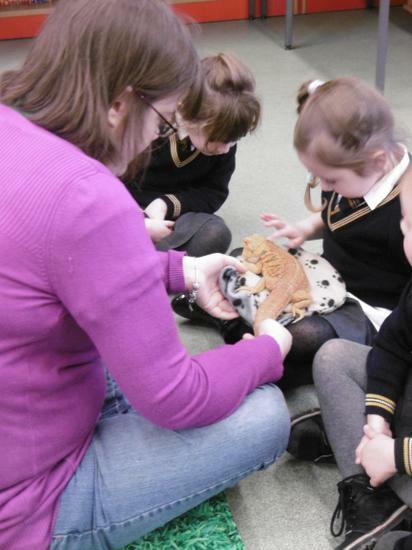 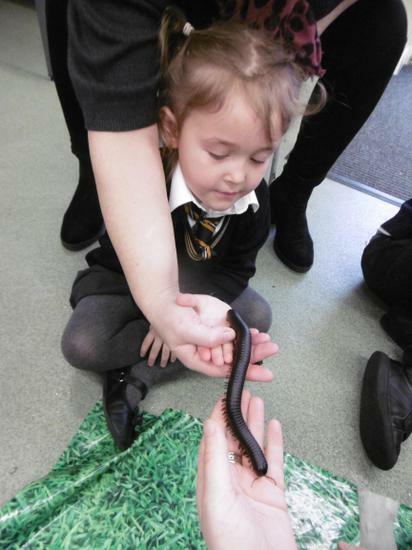 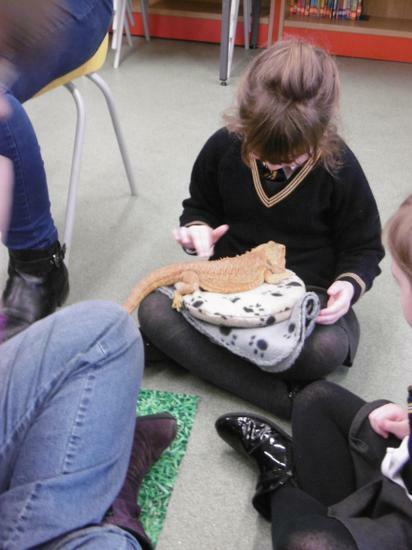 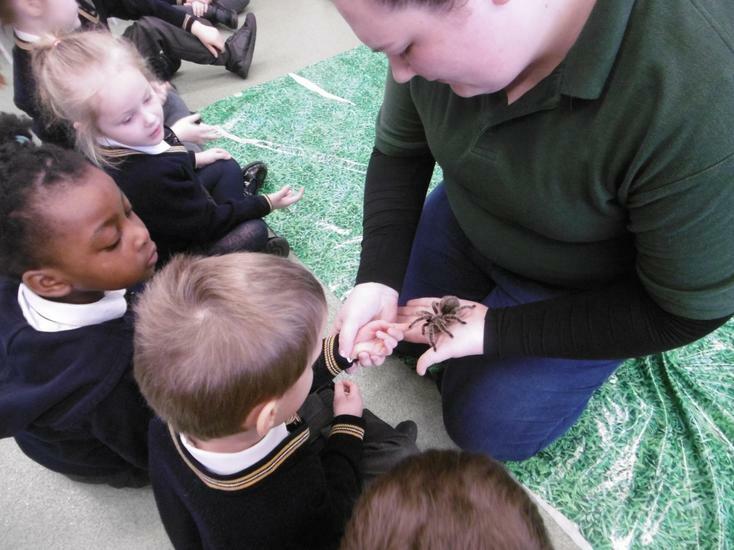 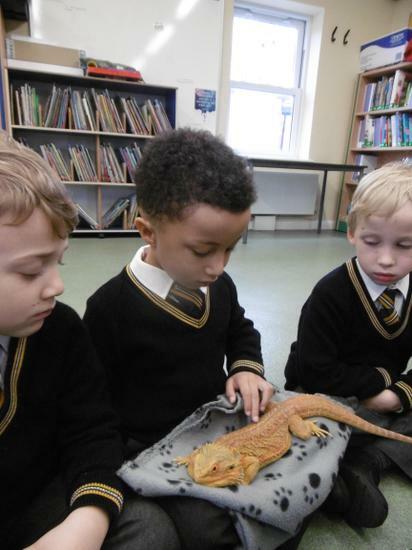 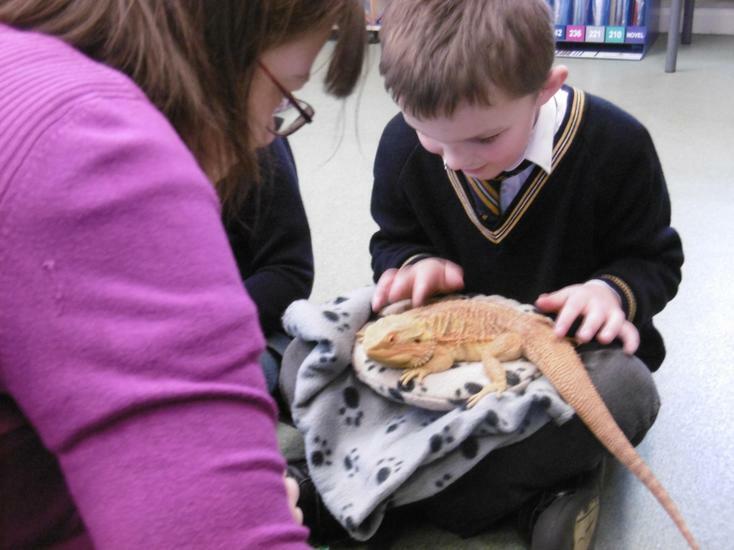 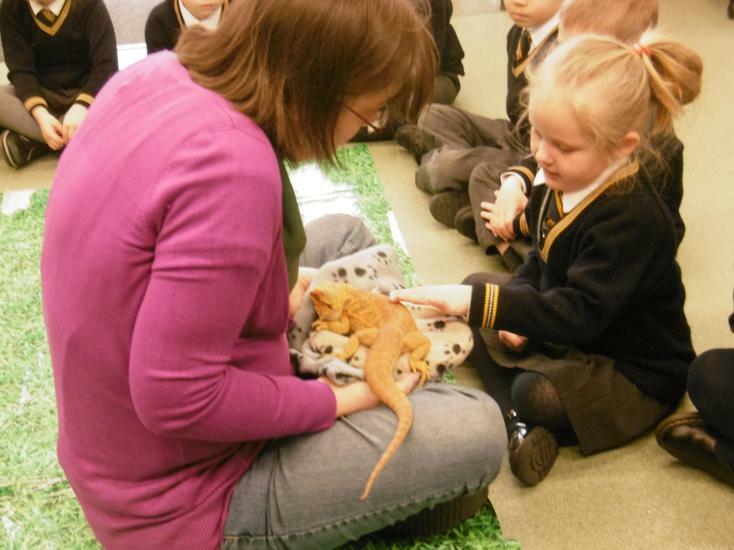 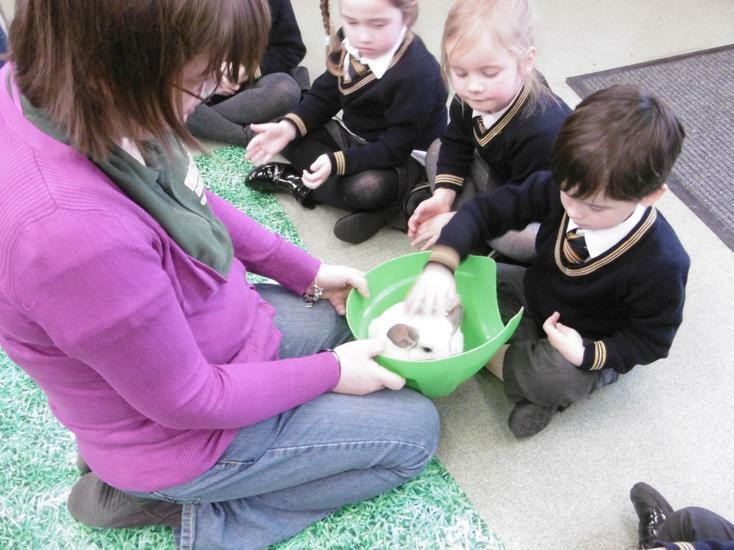 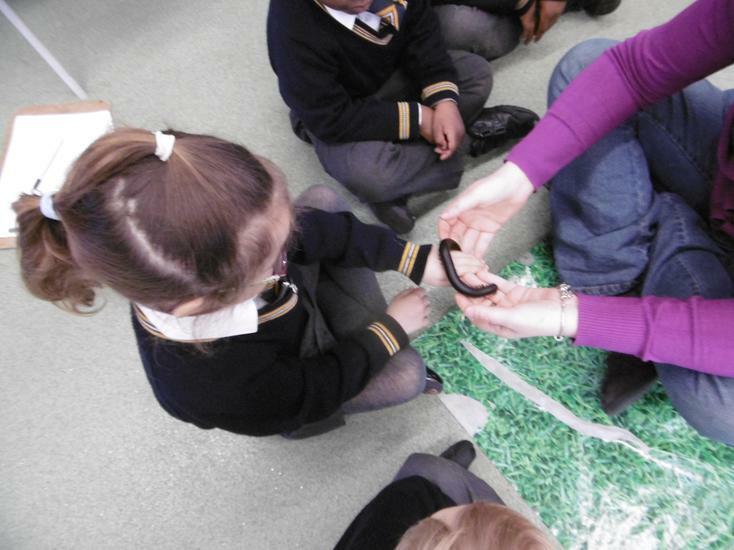 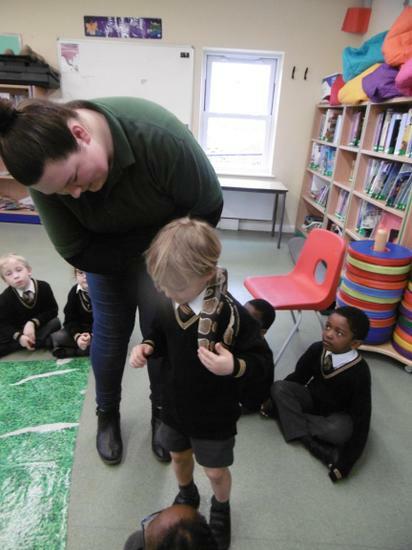 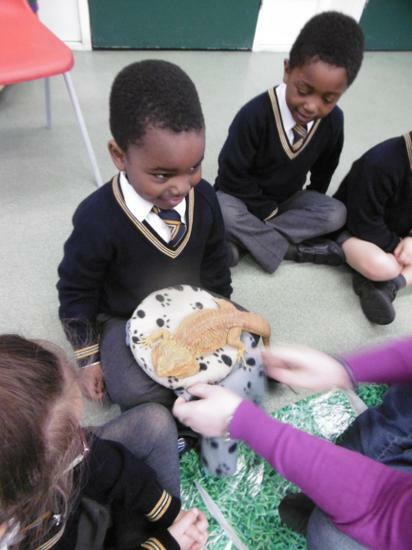 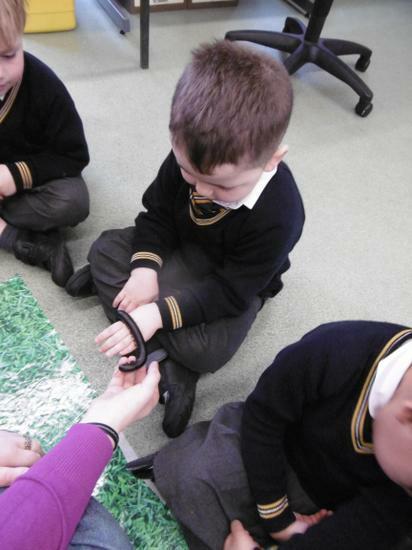 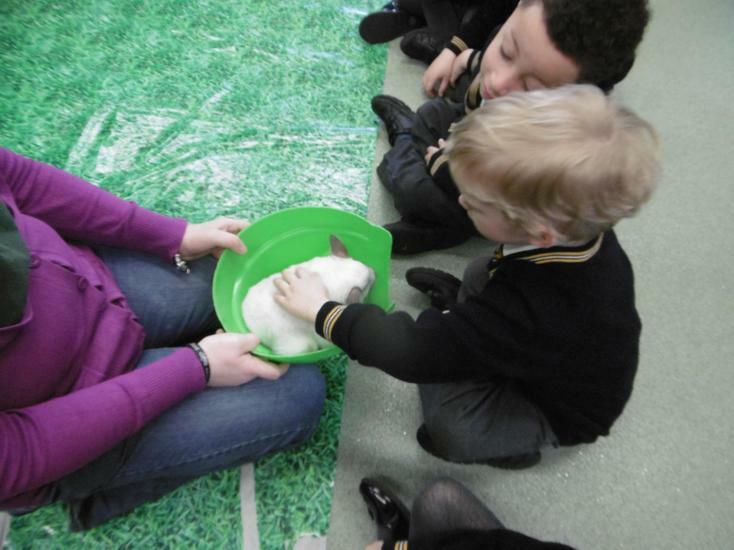 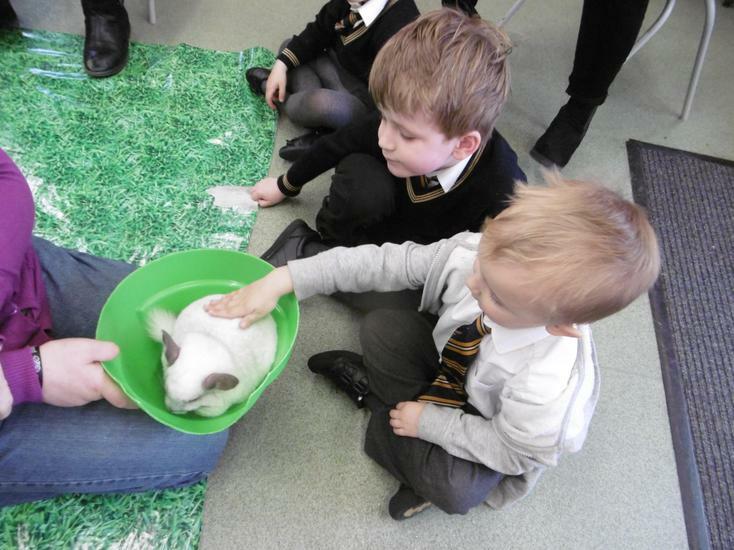 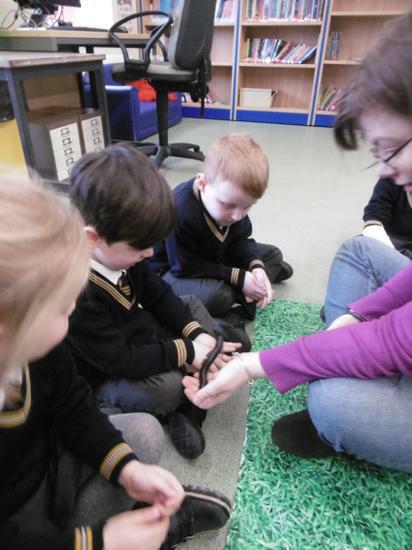 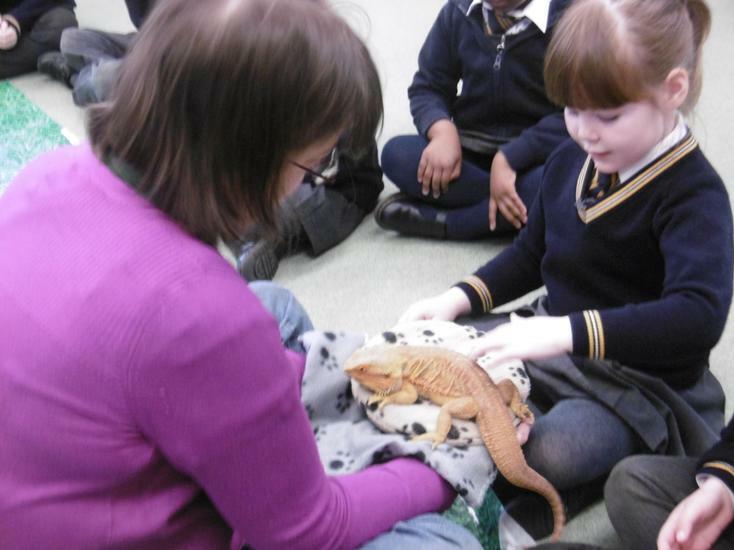 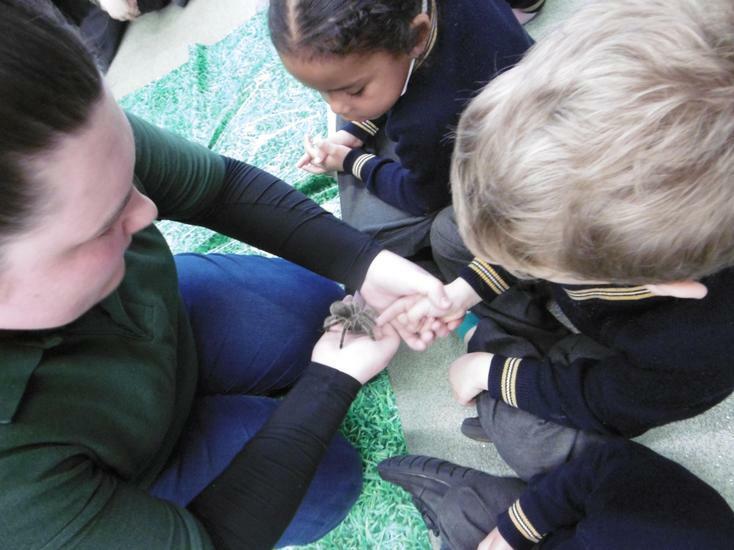 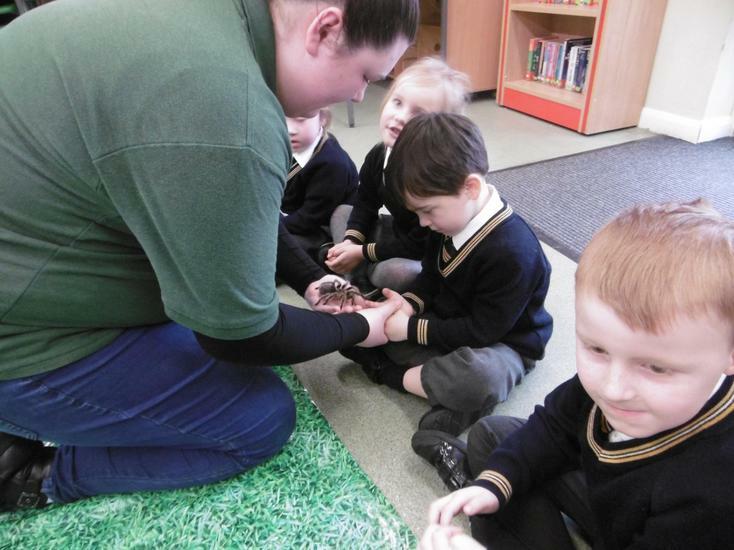 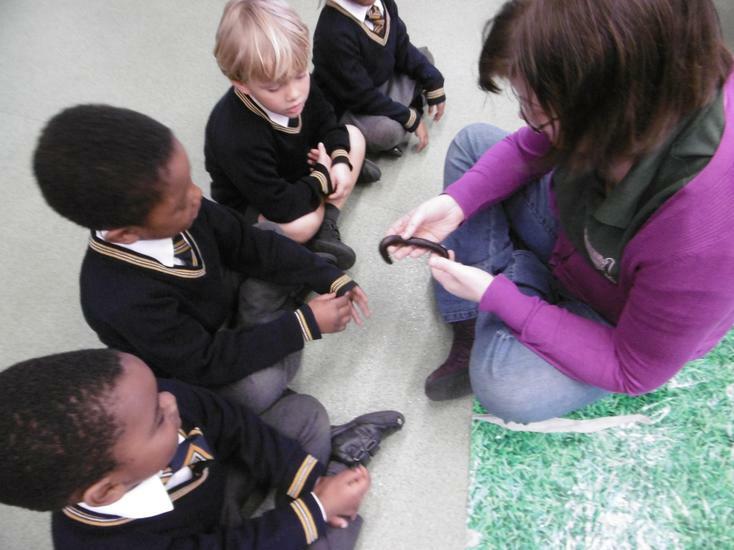 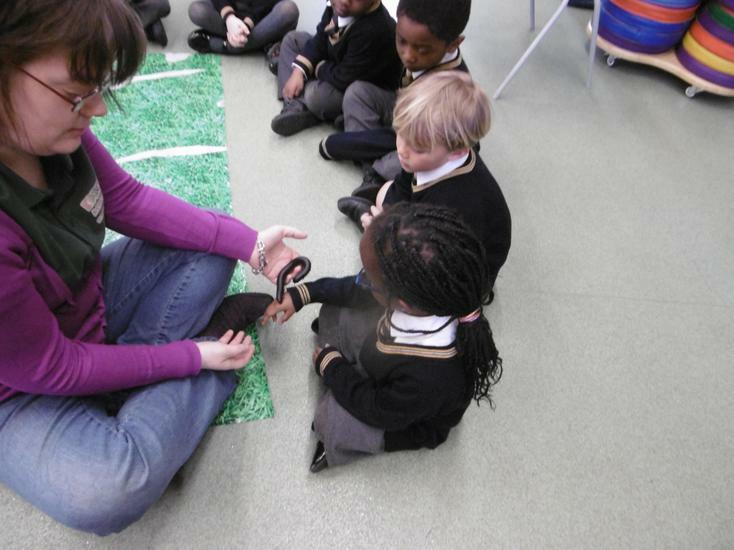 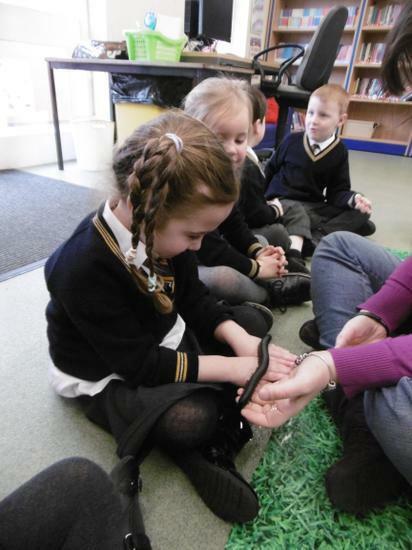 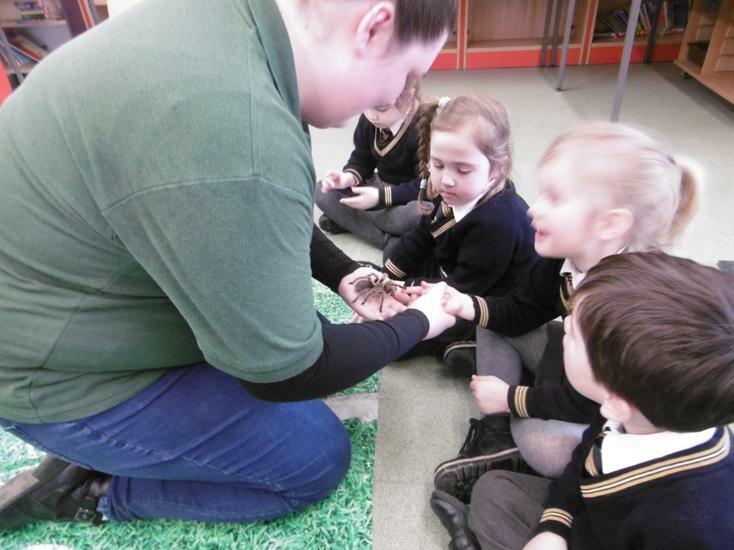 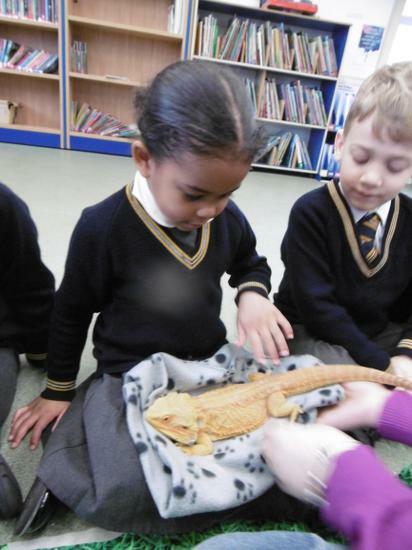 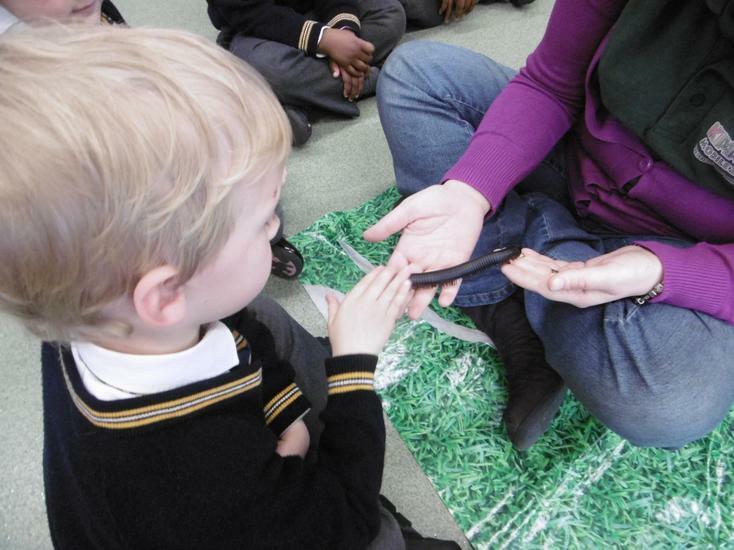 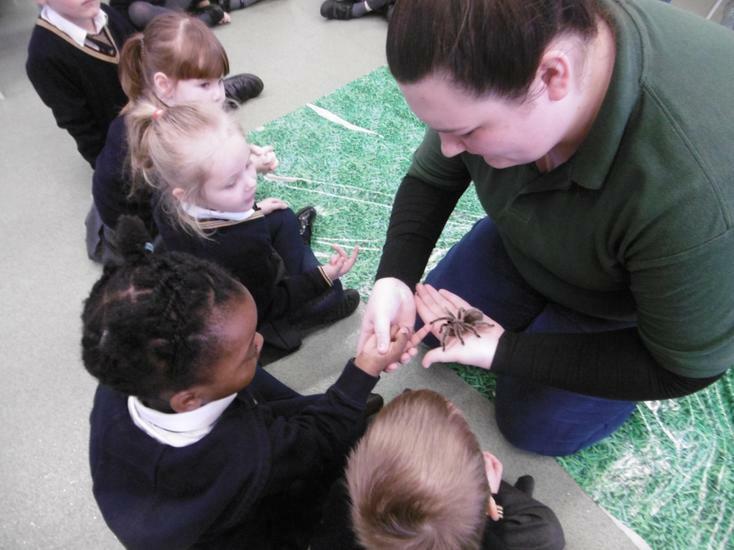 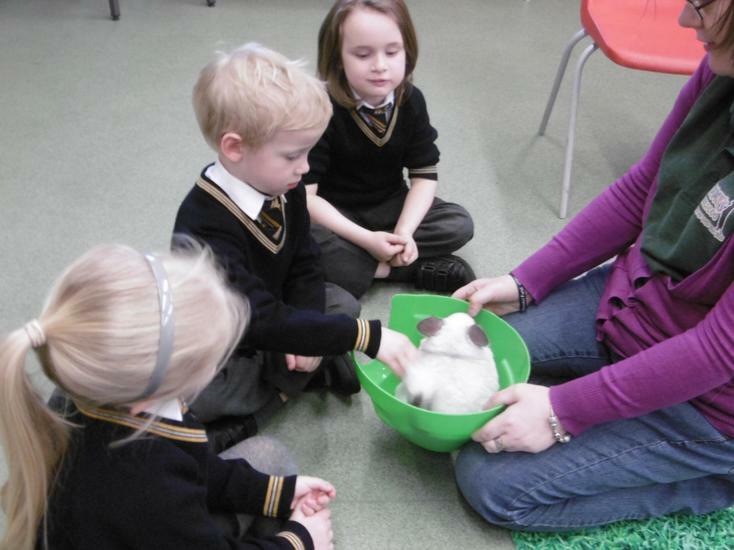 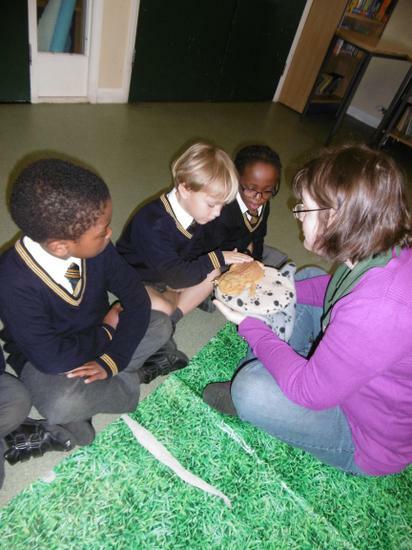 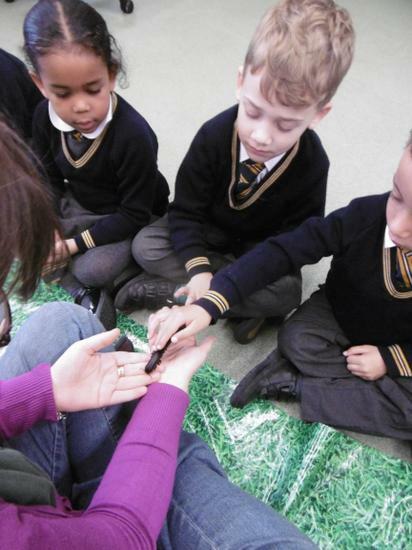 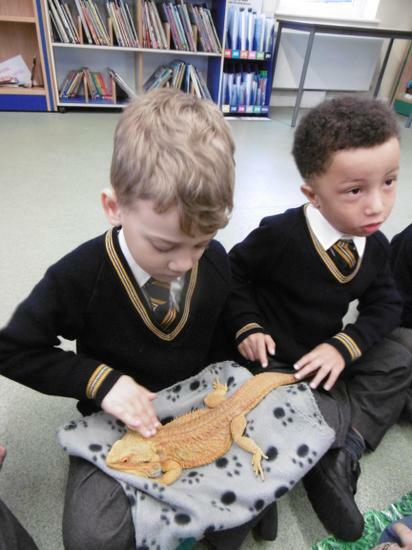 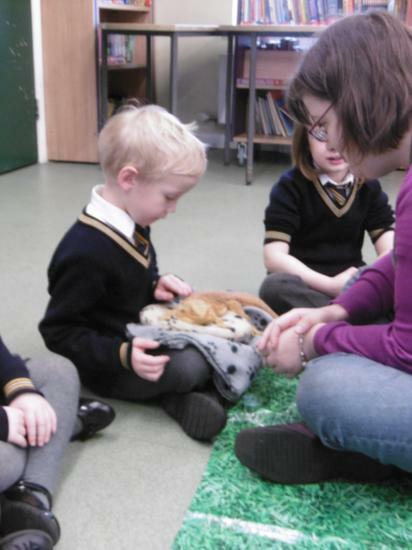 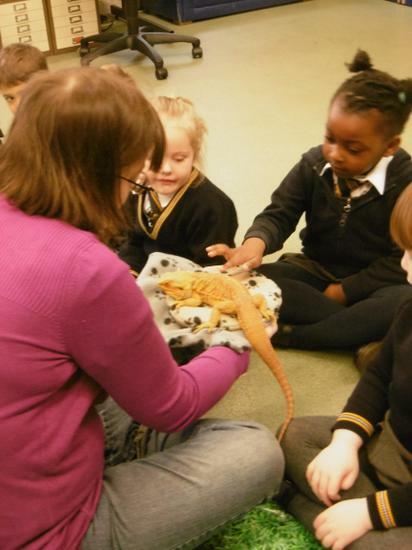 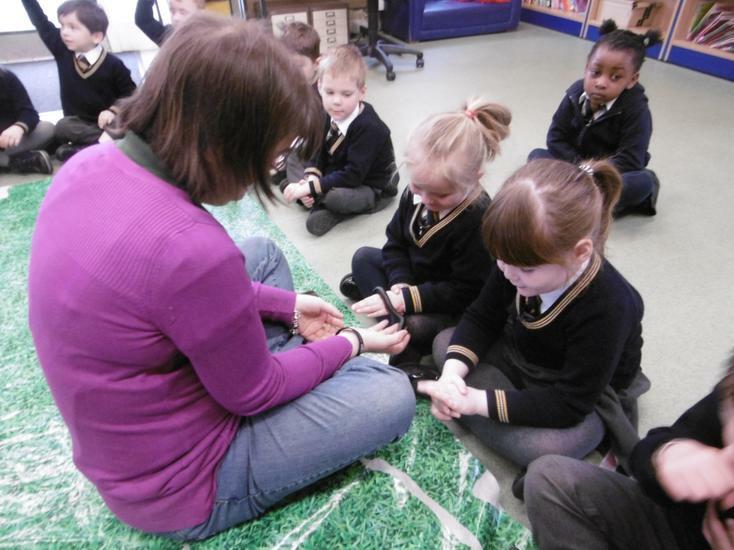 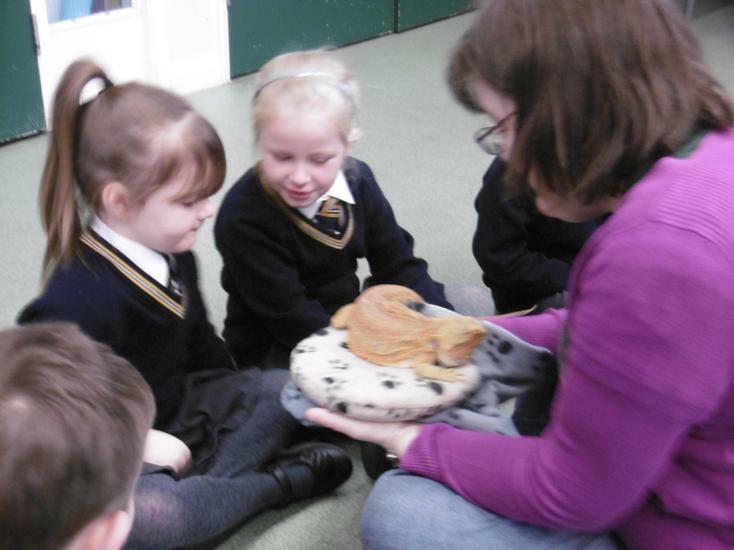 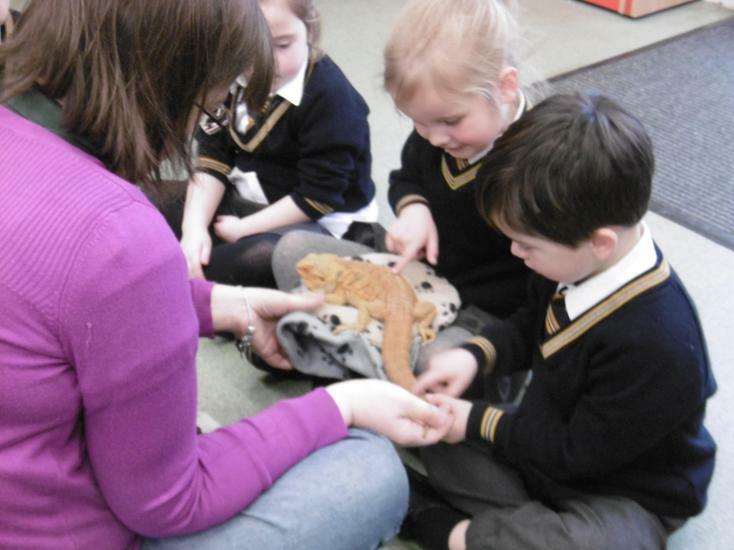 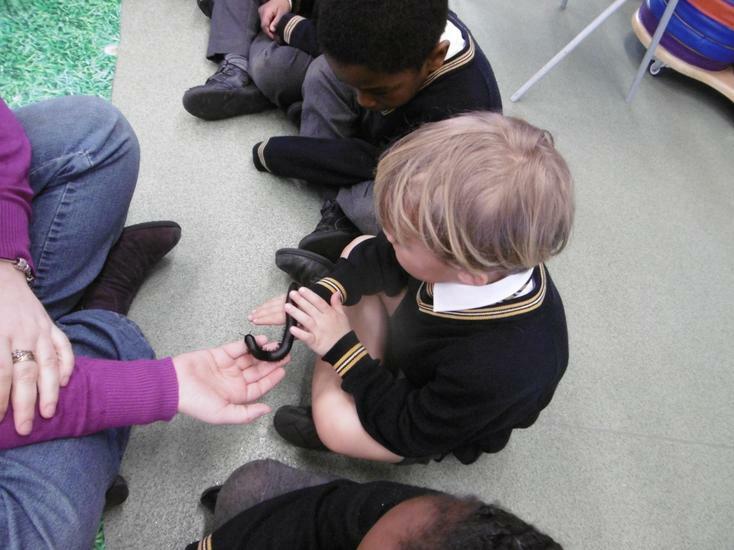 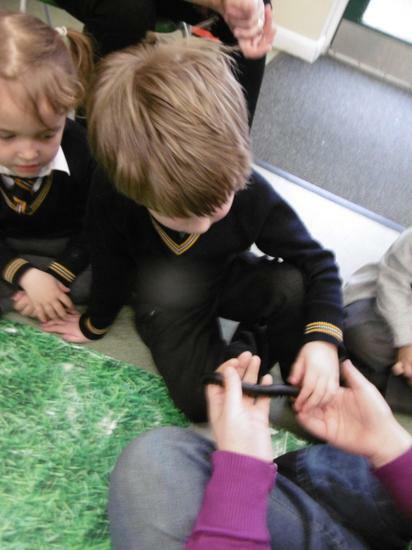 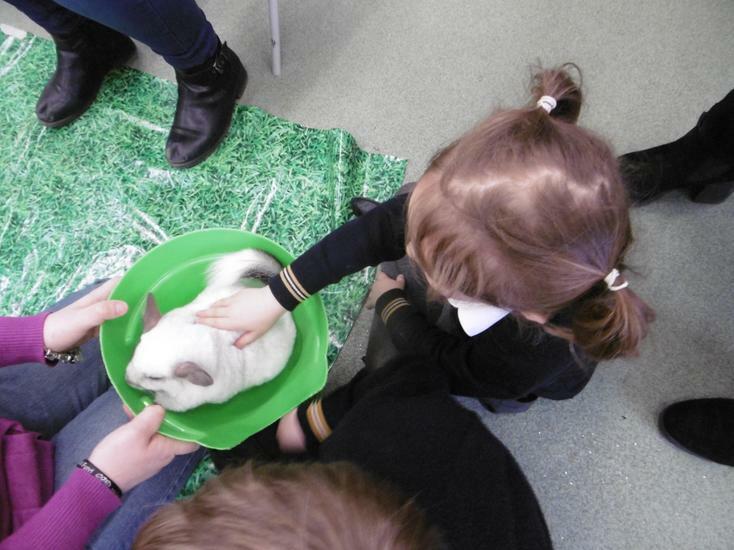 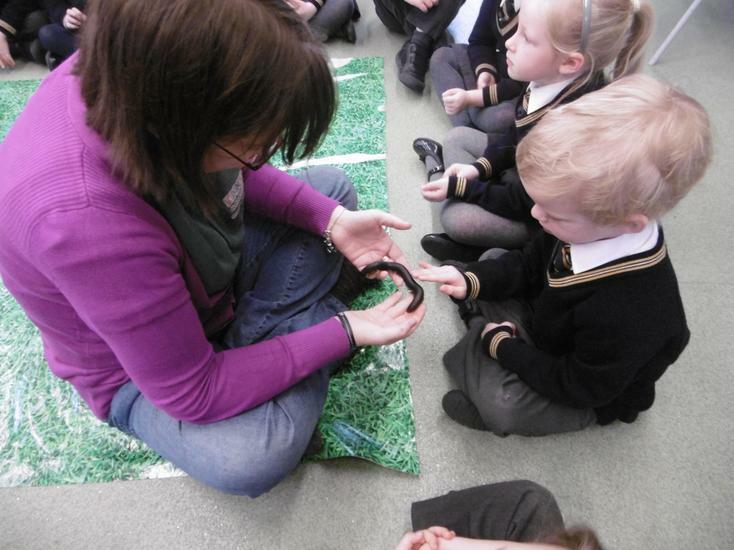 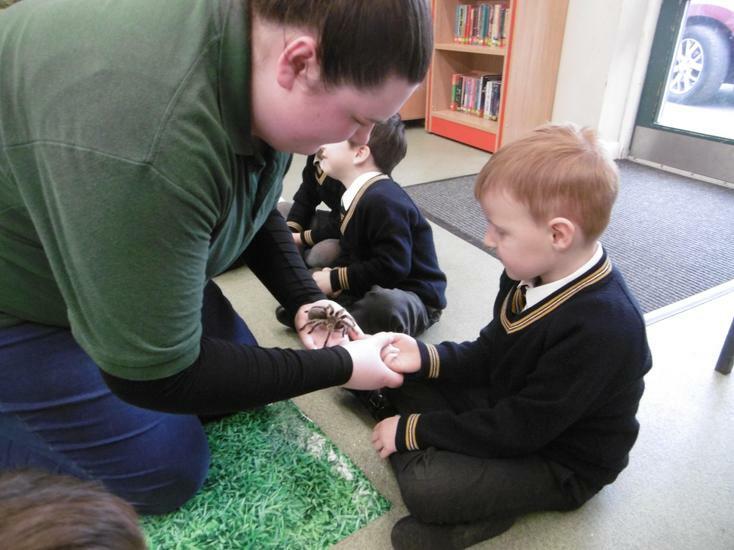 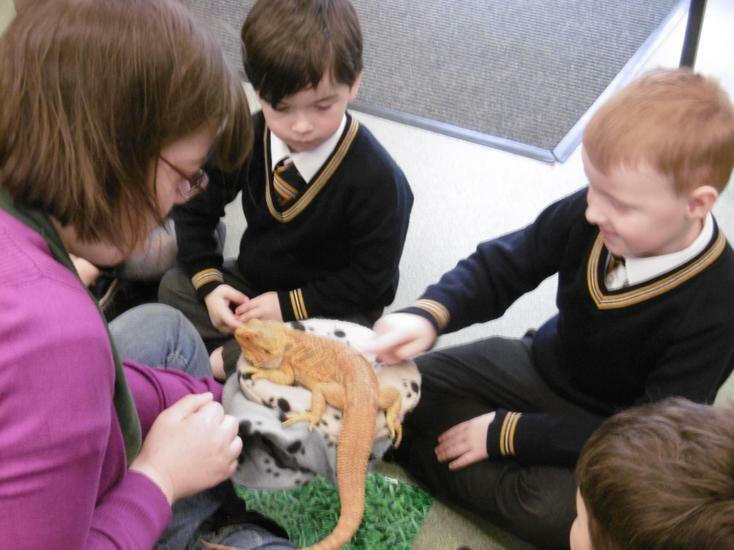 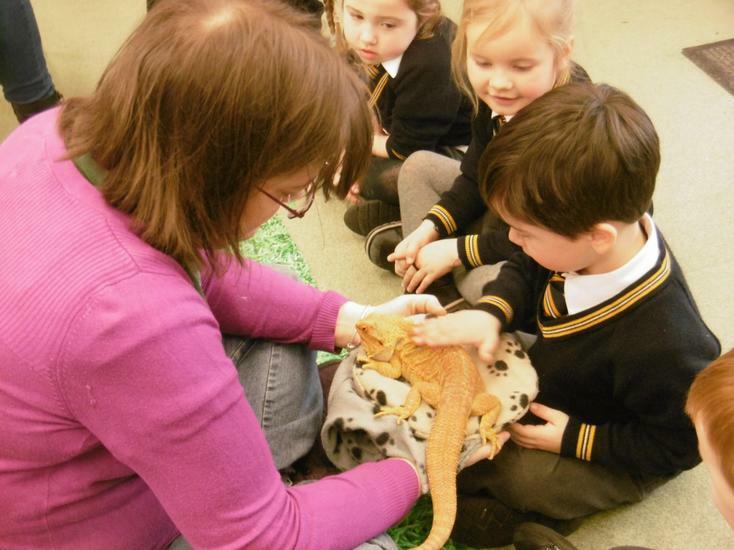 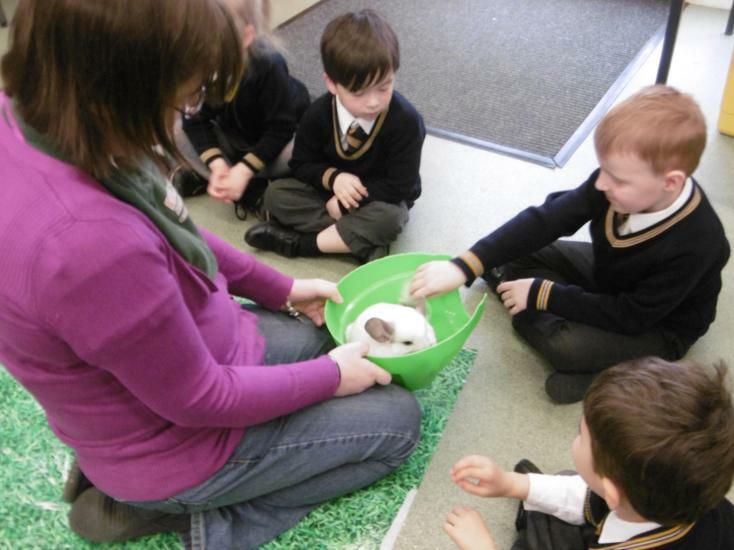 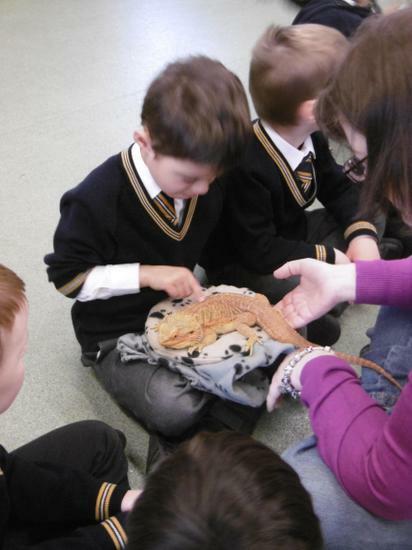 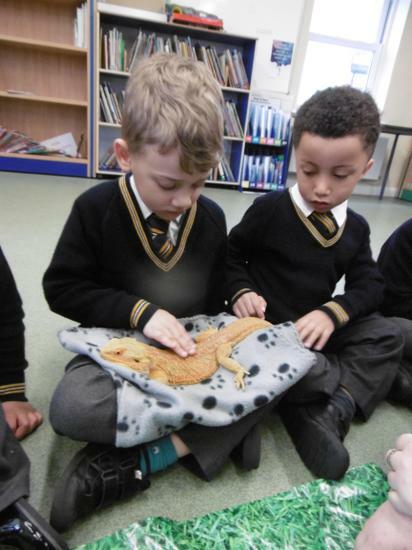 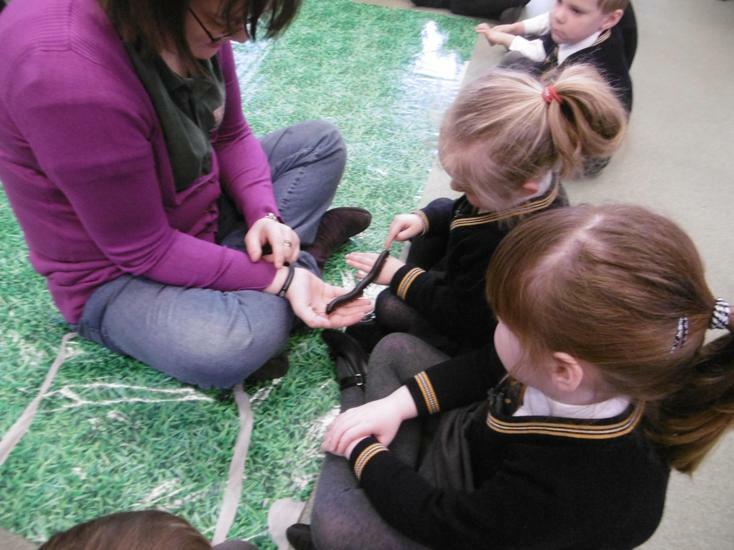 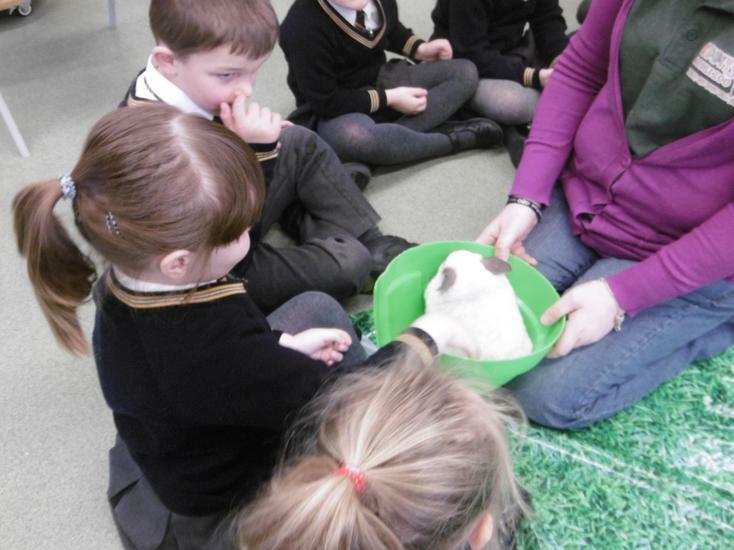 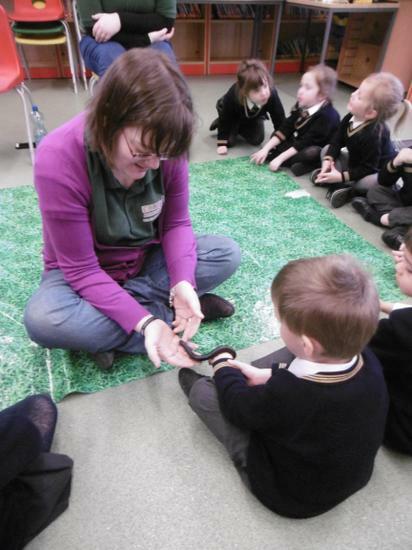 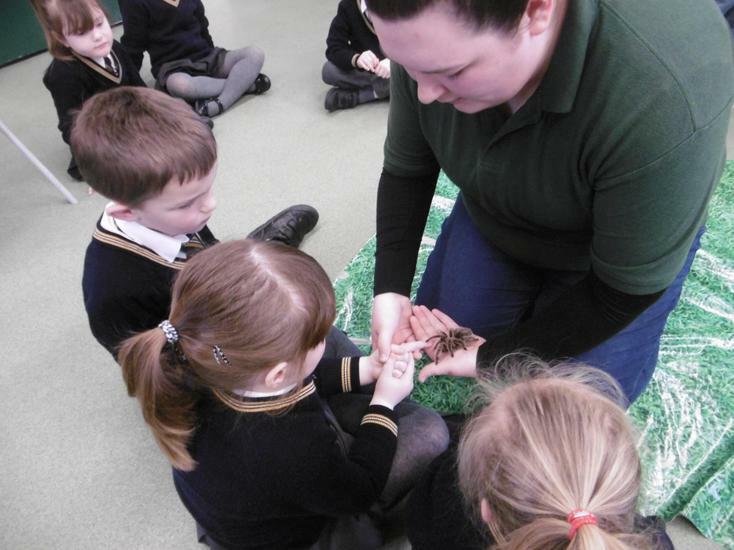 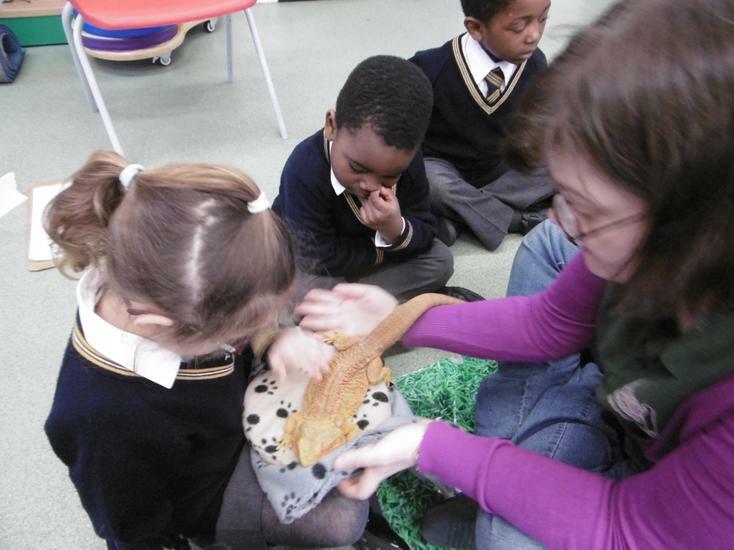 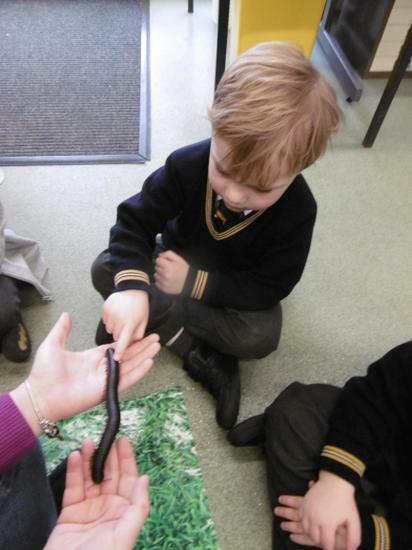 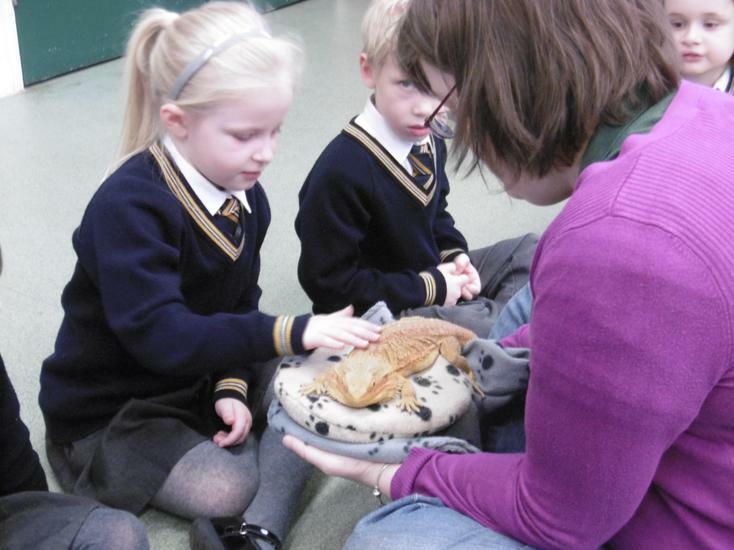 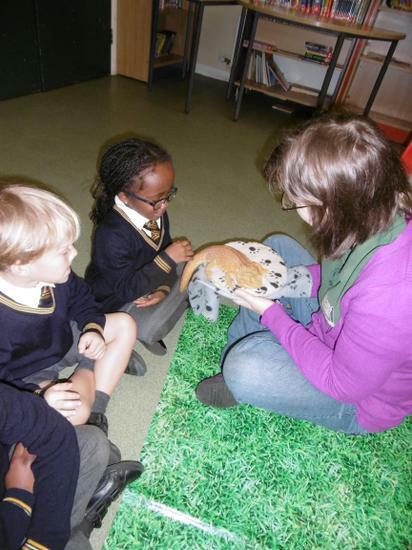 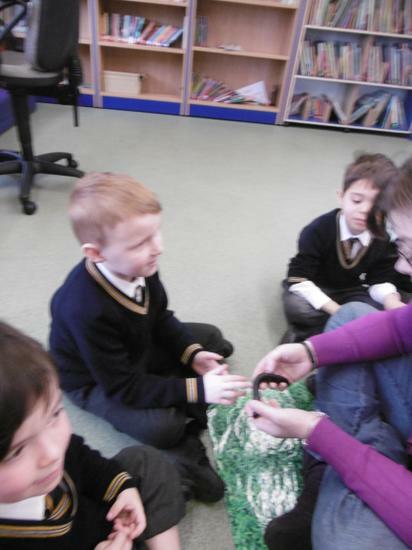 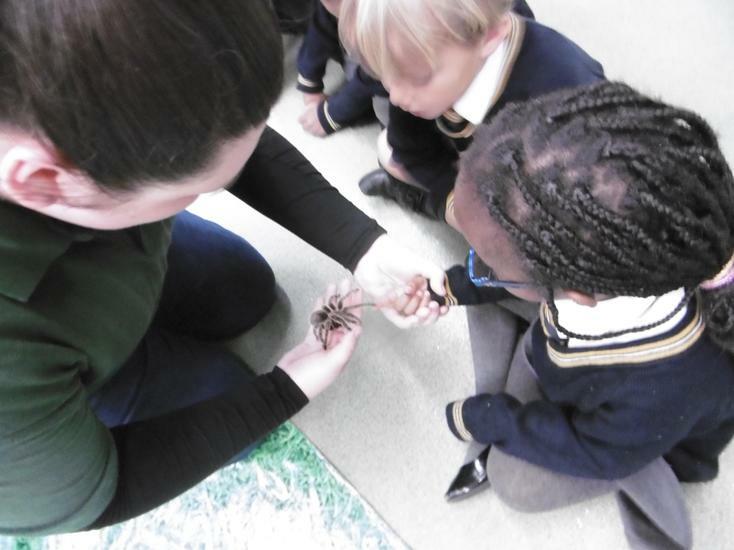 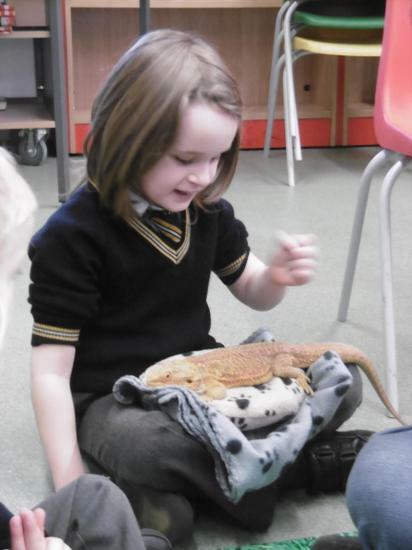 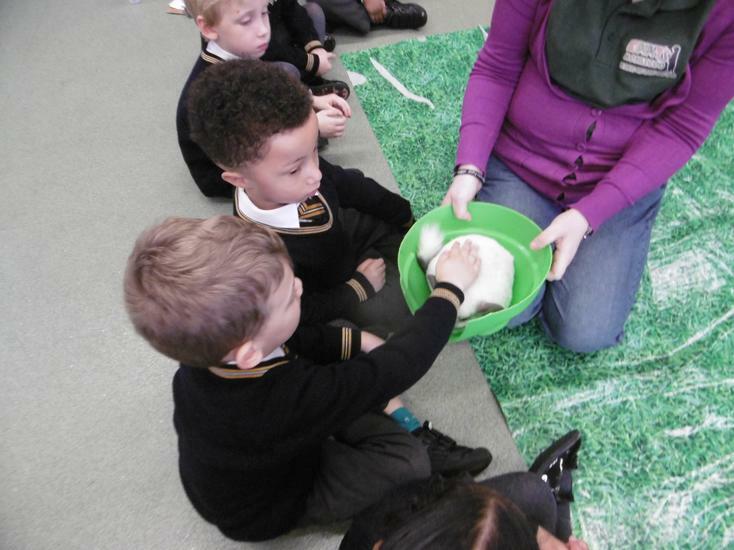 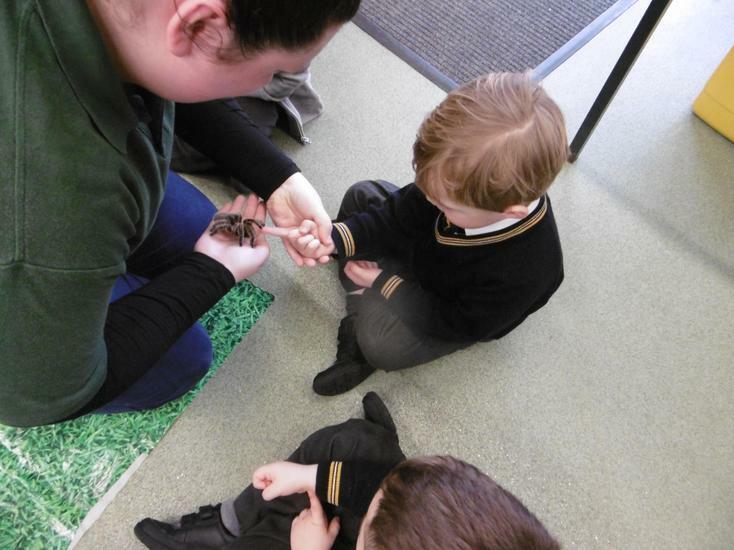 We listened carefully to the information about each creature, asking questions and talking about what the creatures felt like as we held and stroked them. 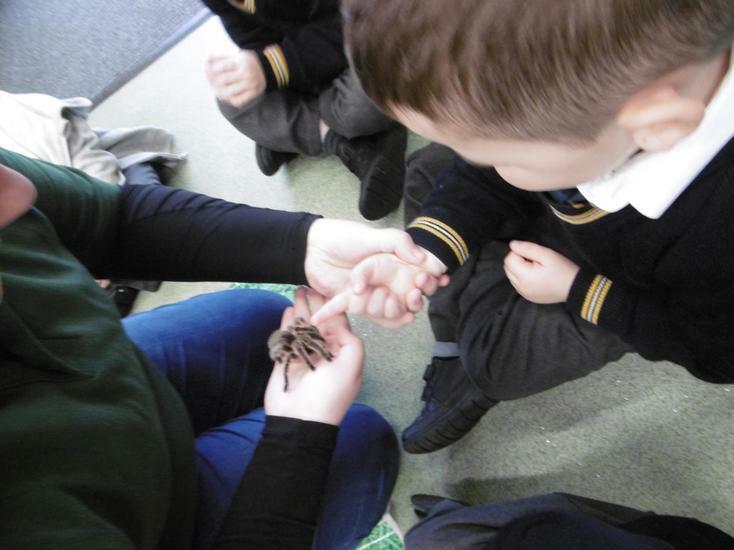 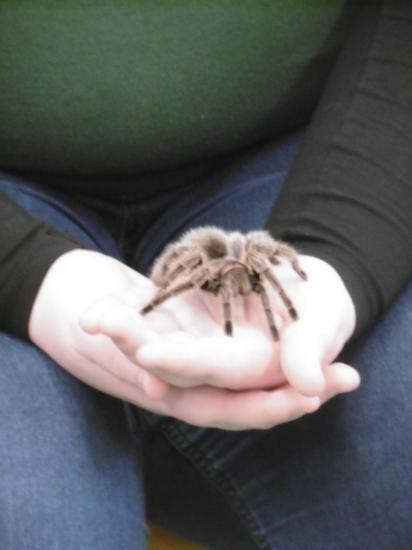 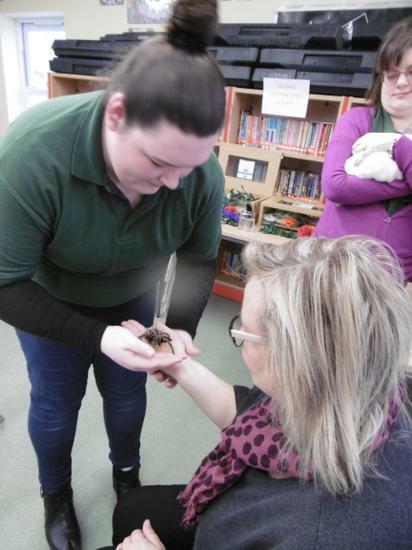 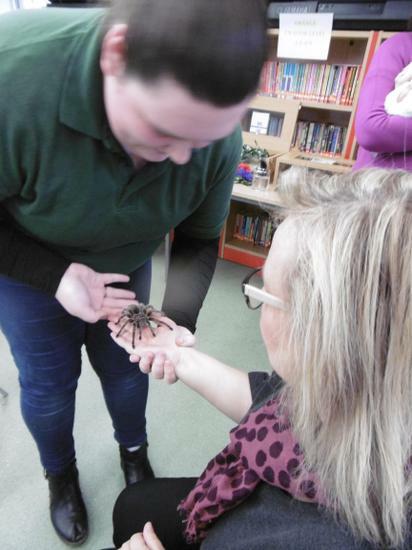 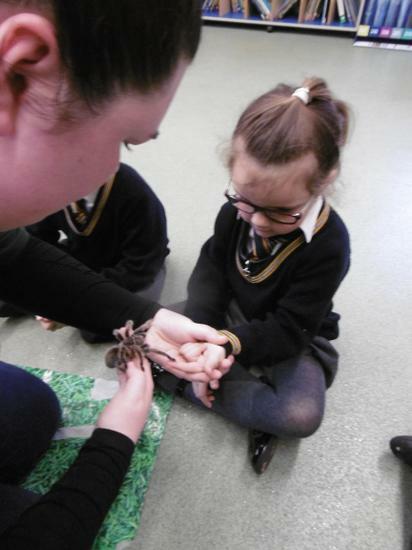 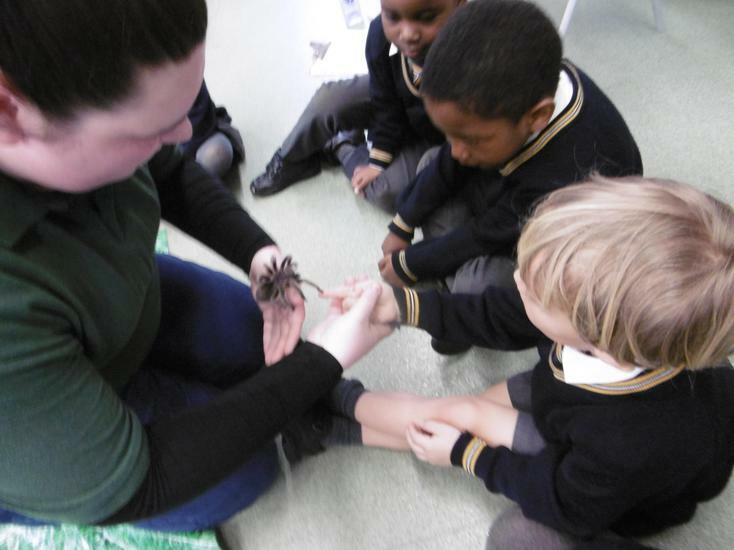 Some of us even gave Princess Jasmine, the tarantula, a high five! 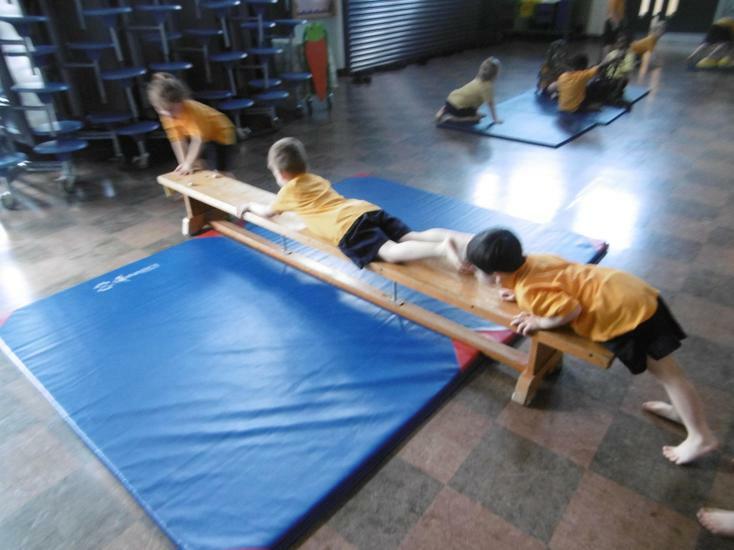 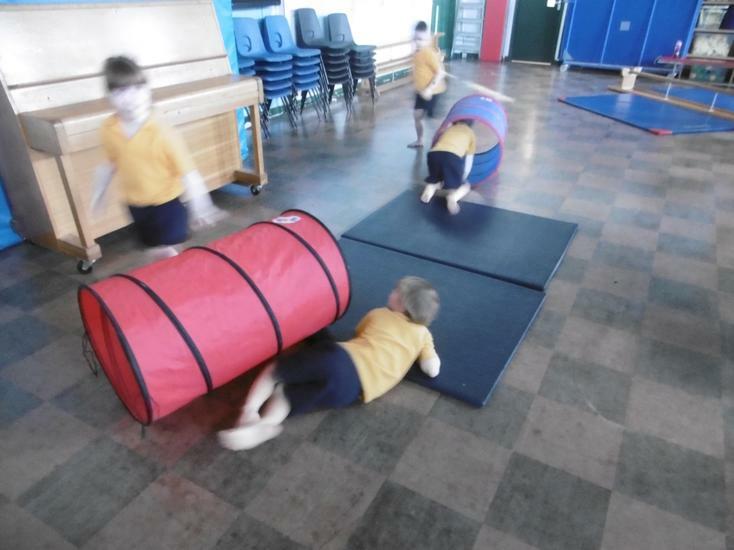 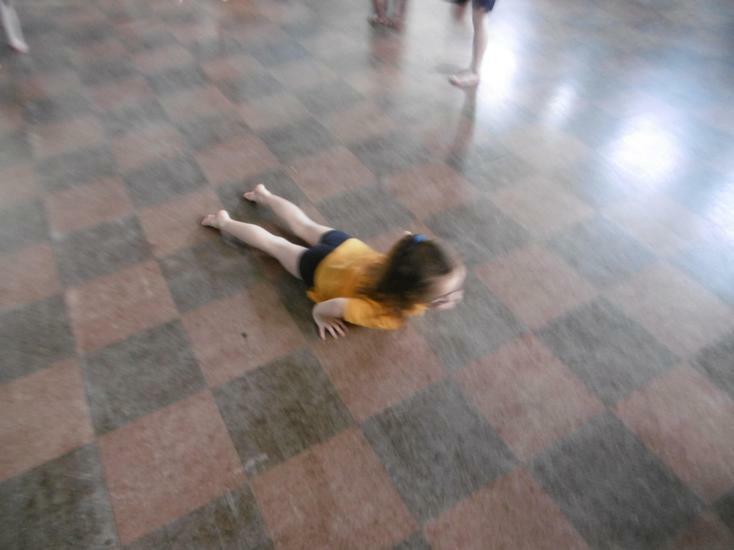 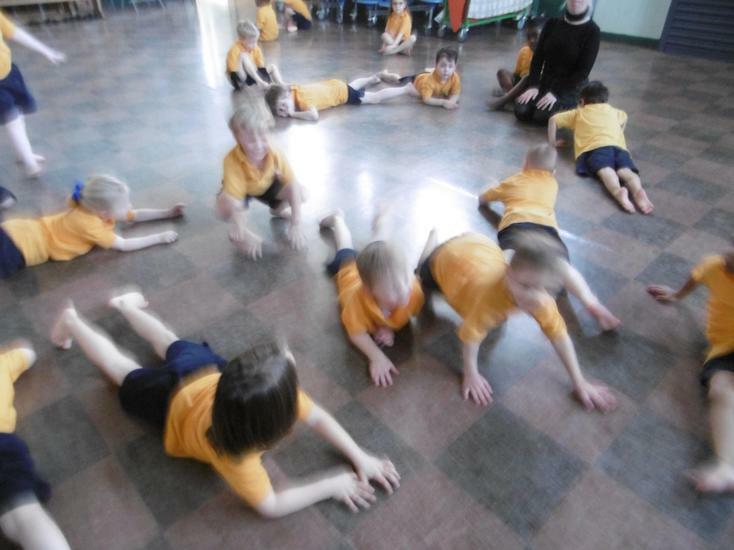 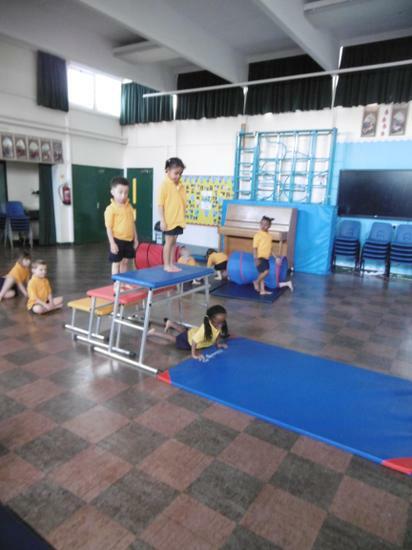 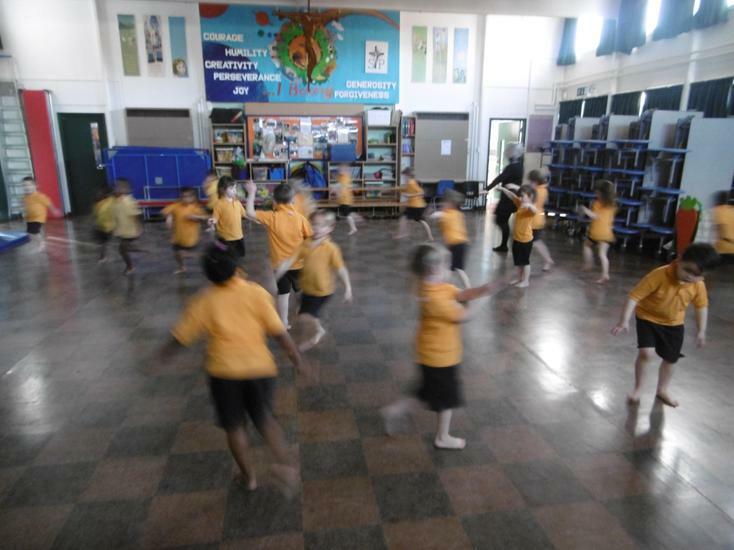 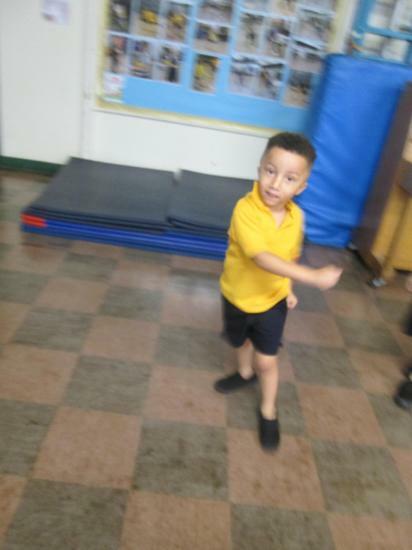 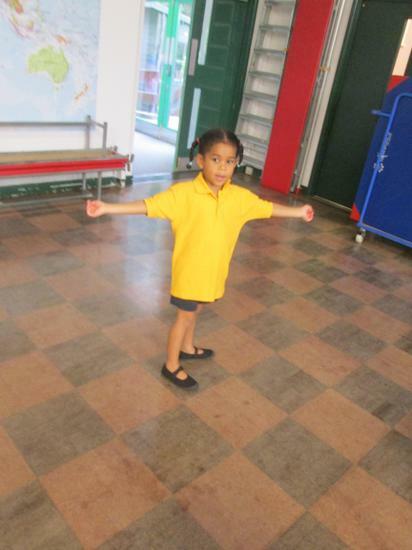 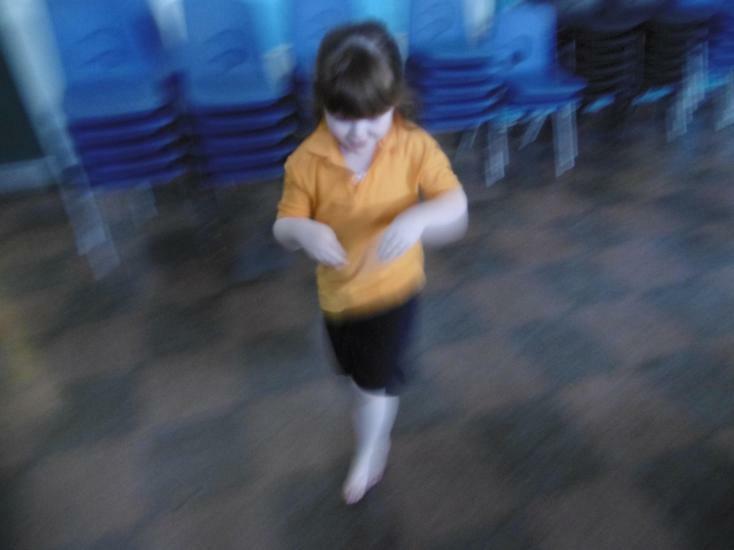 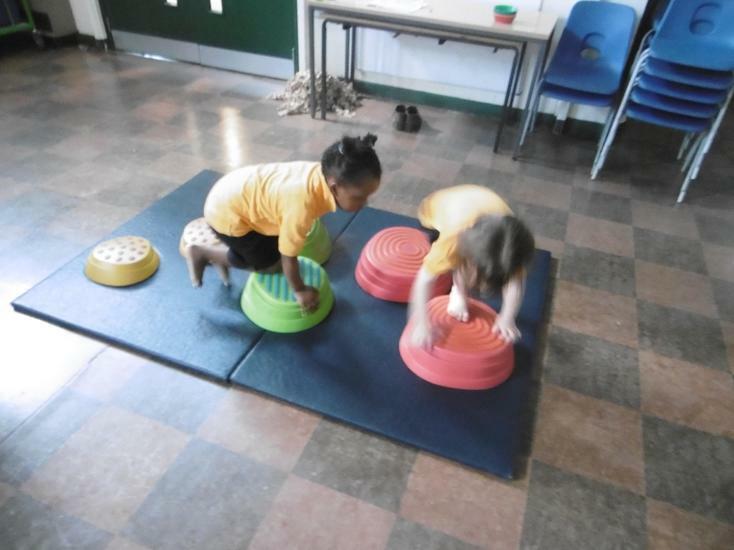 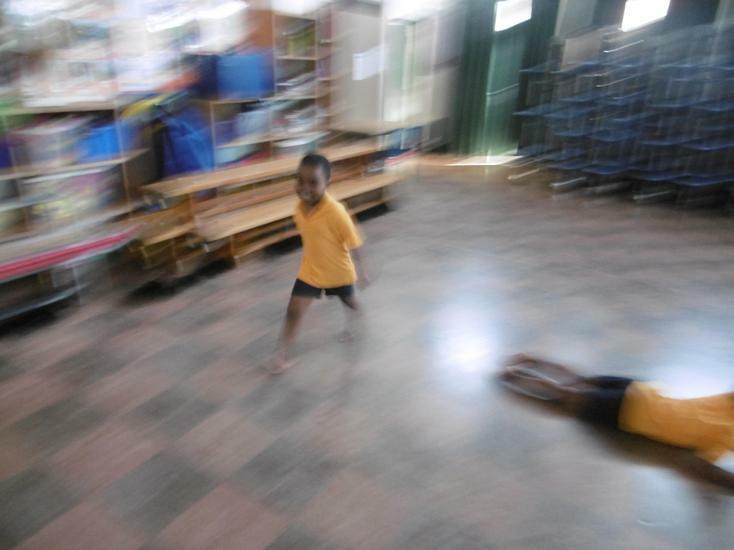 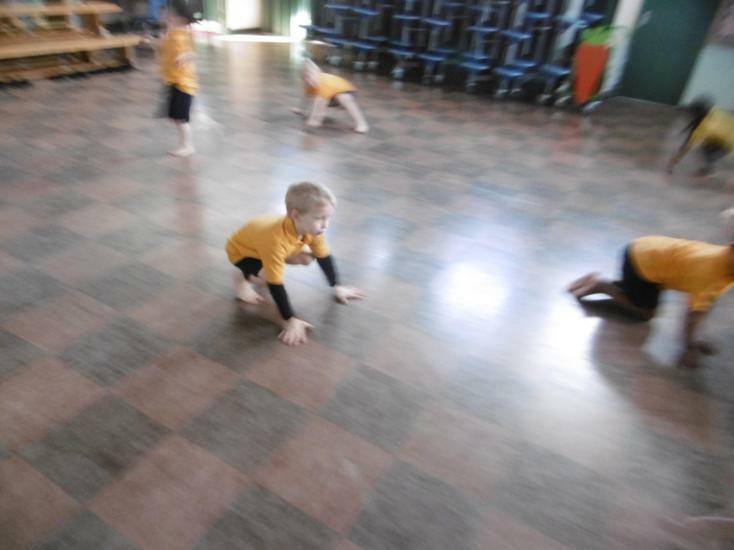 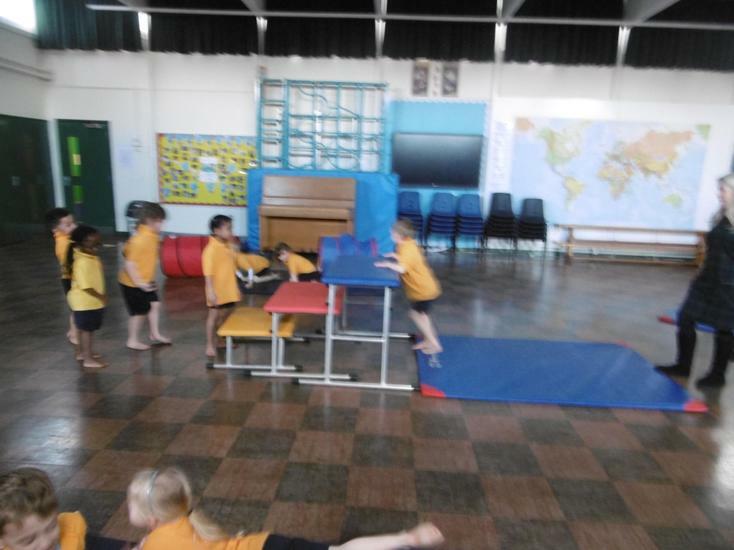 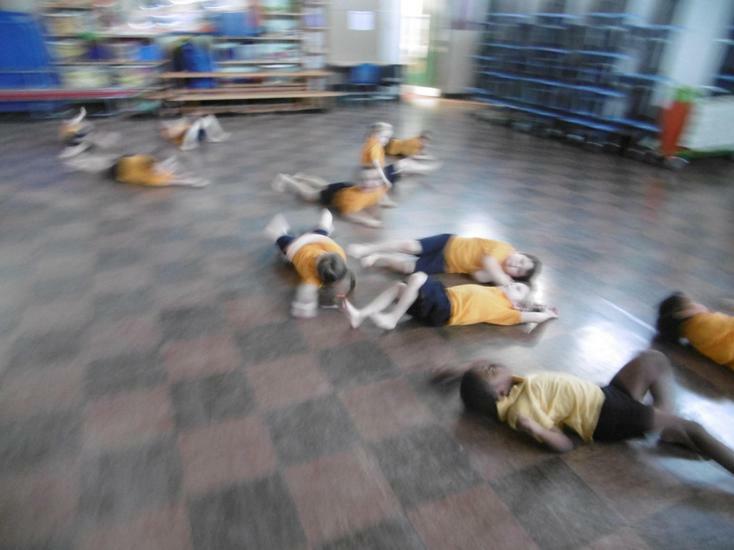 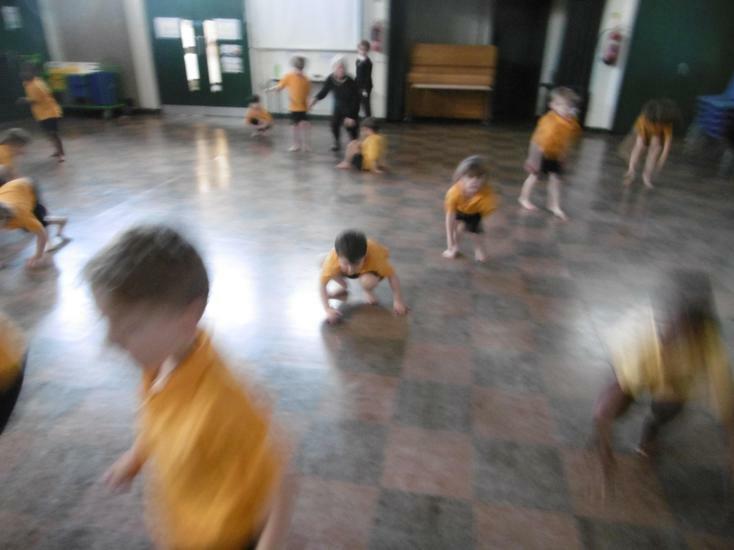 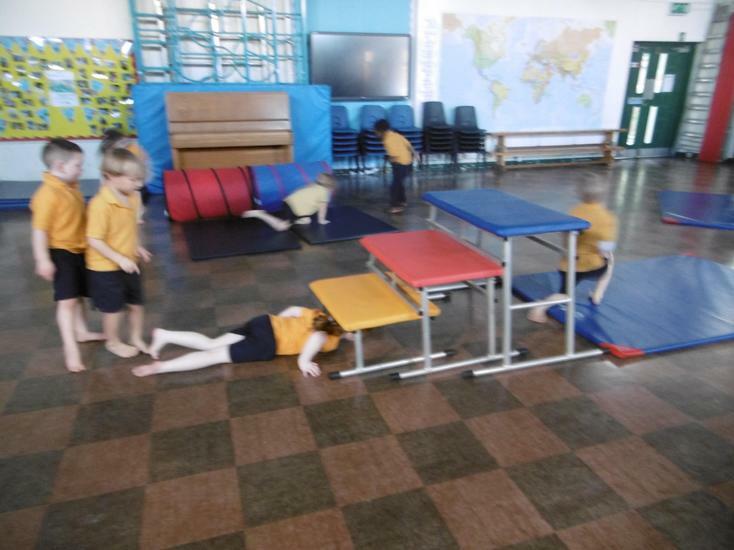 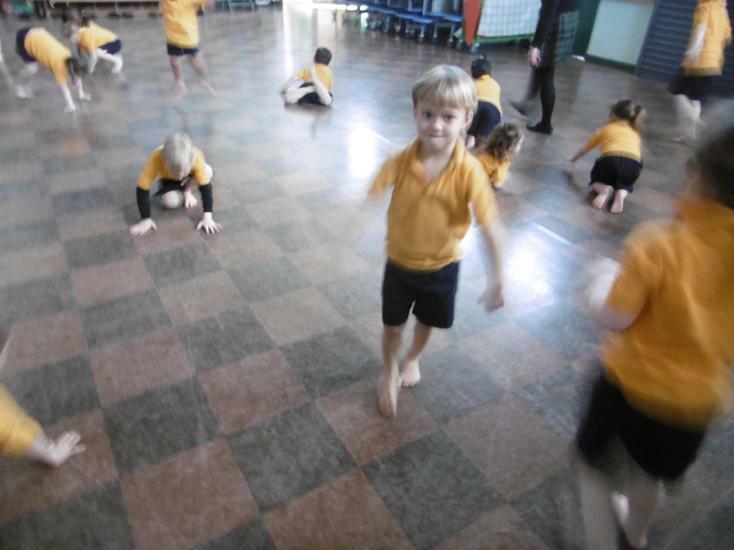 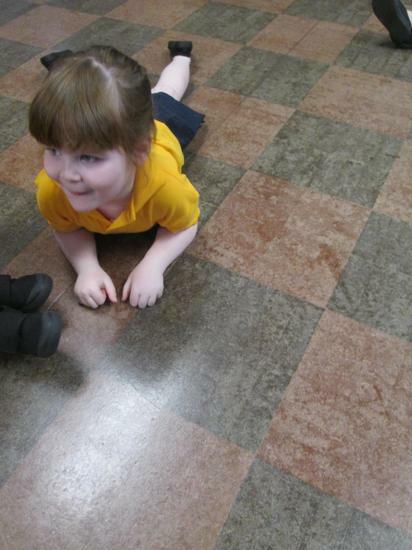 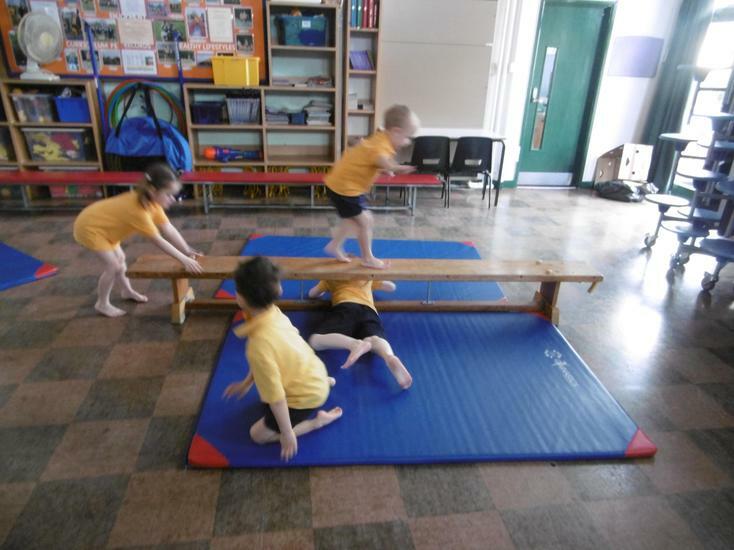 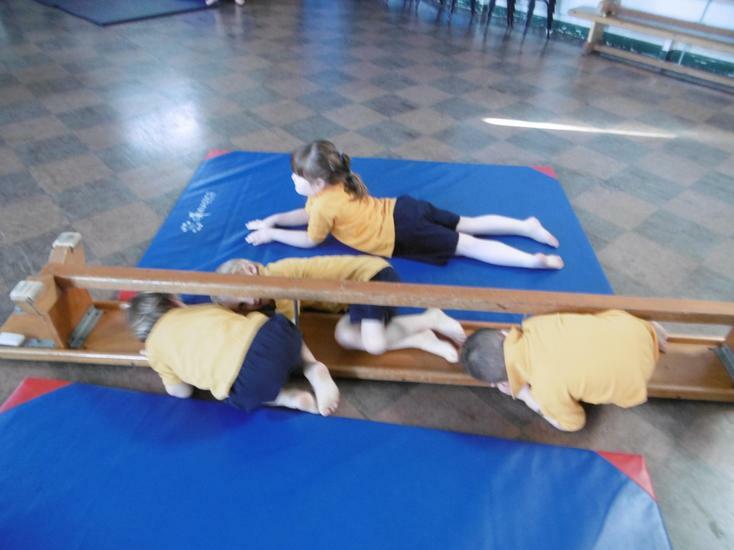 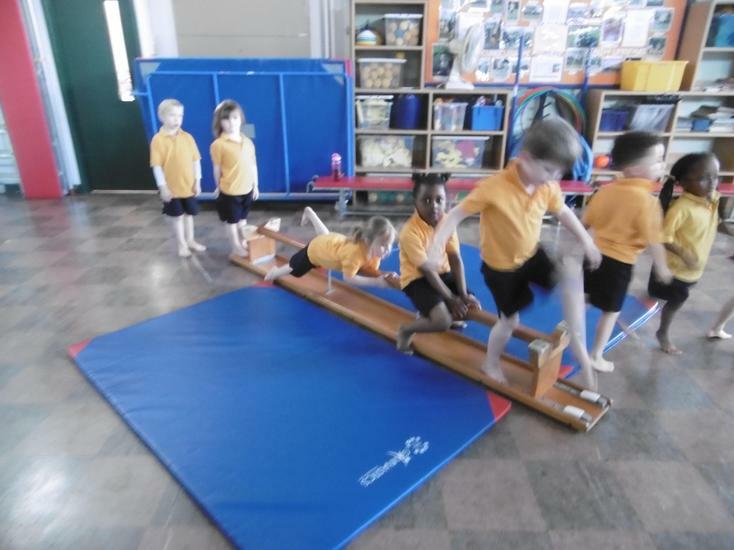 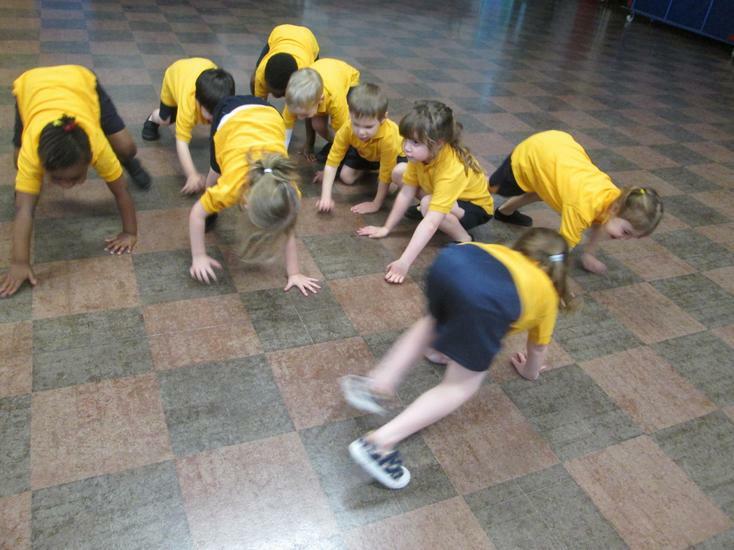 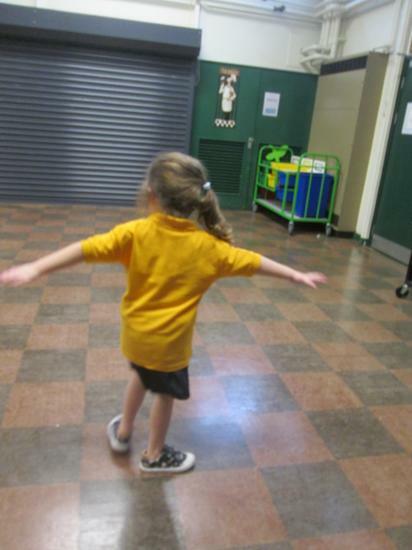 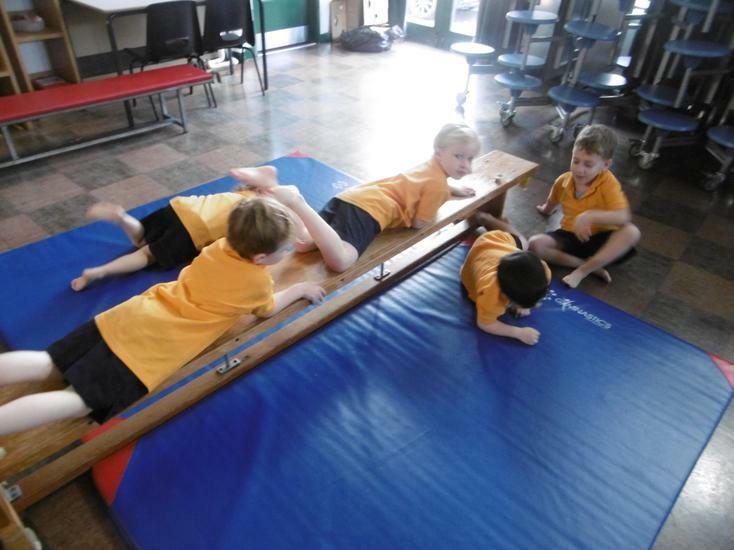 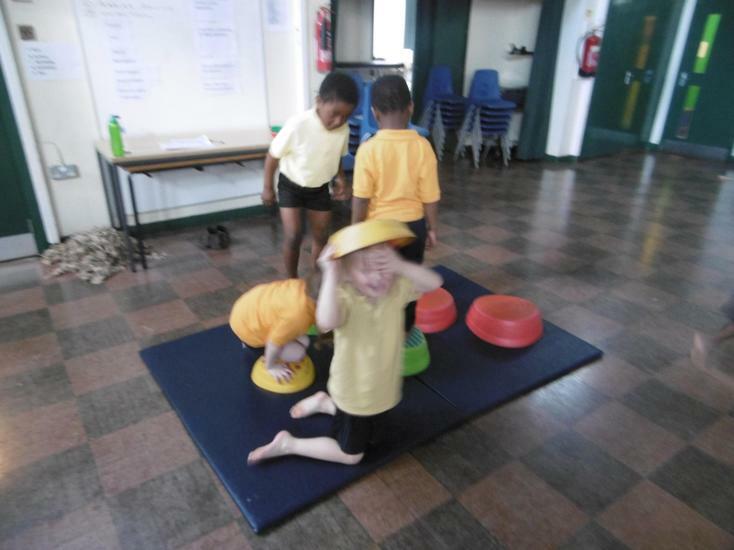 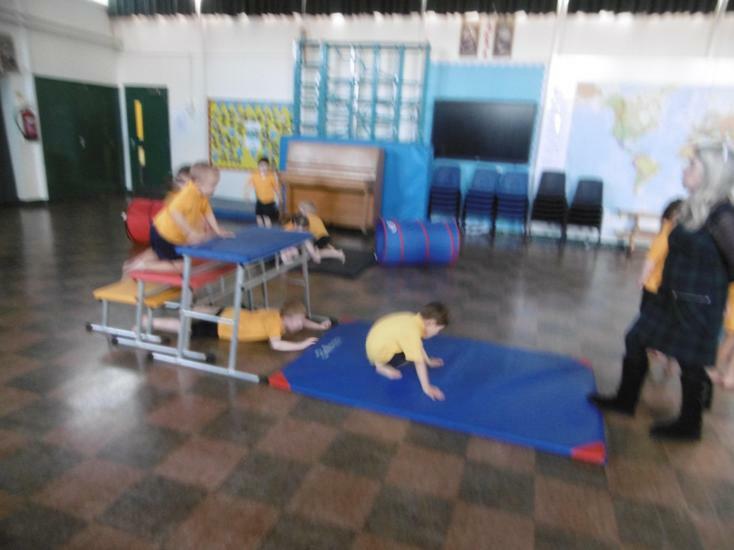 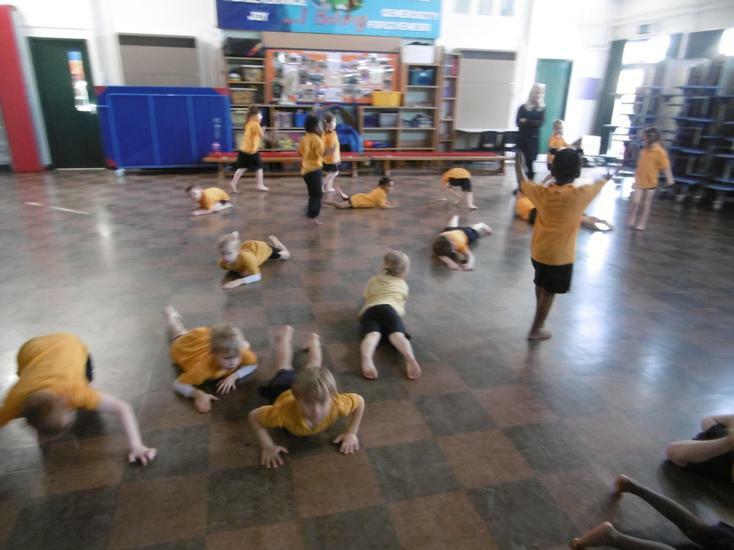 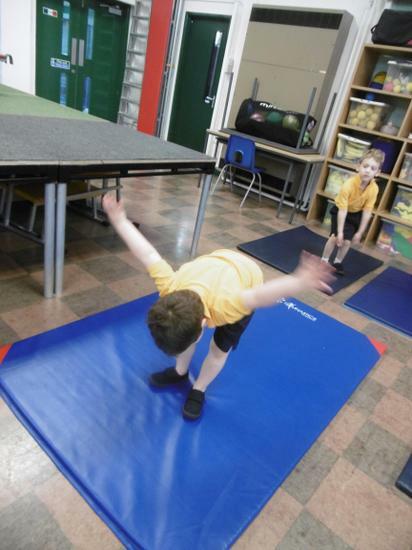 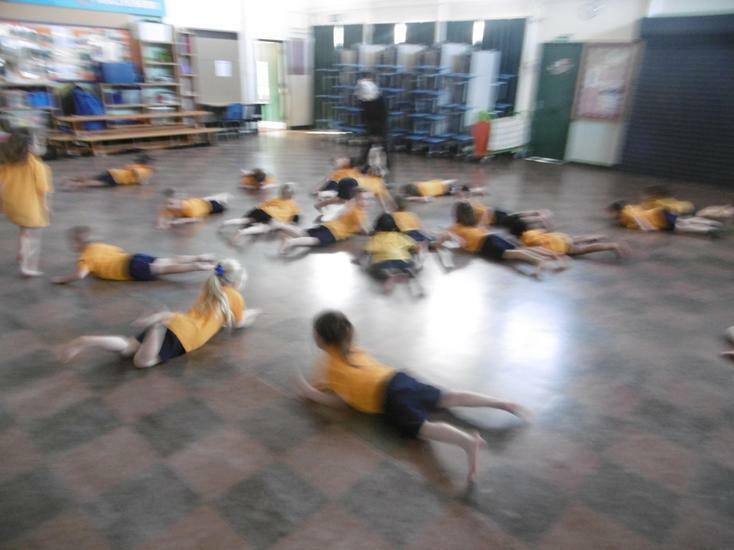 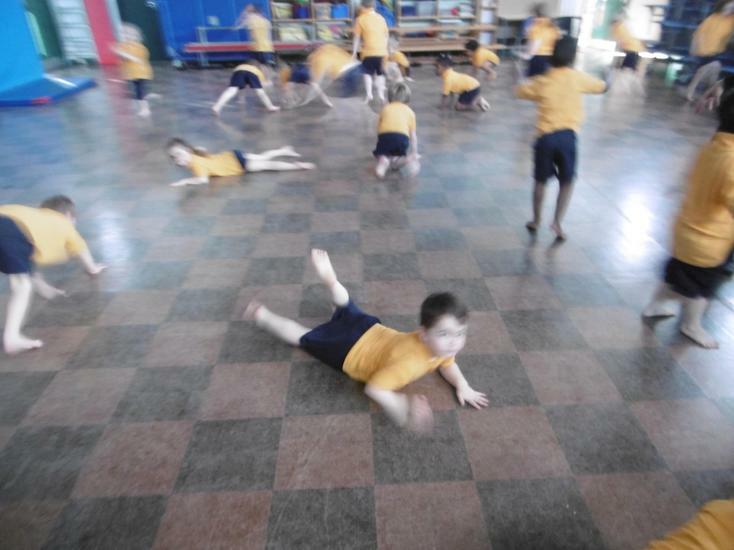 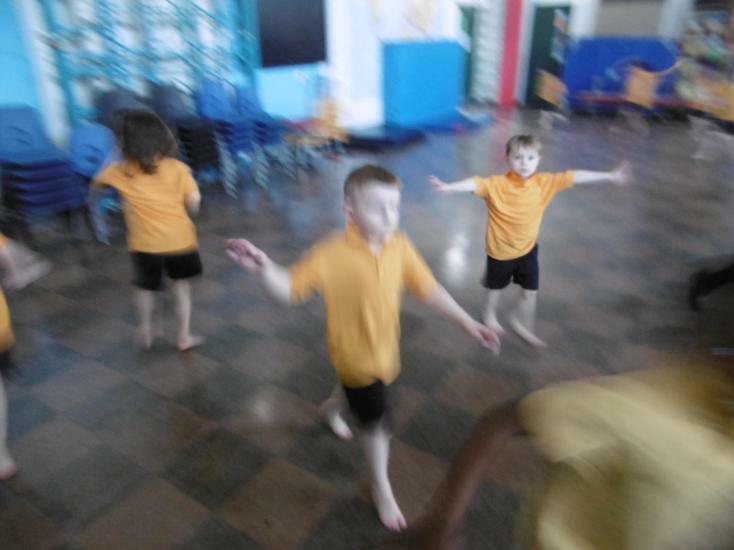 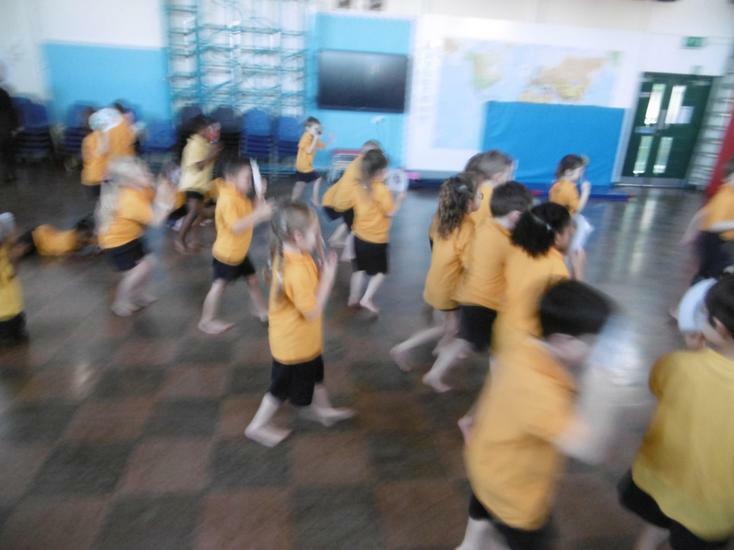 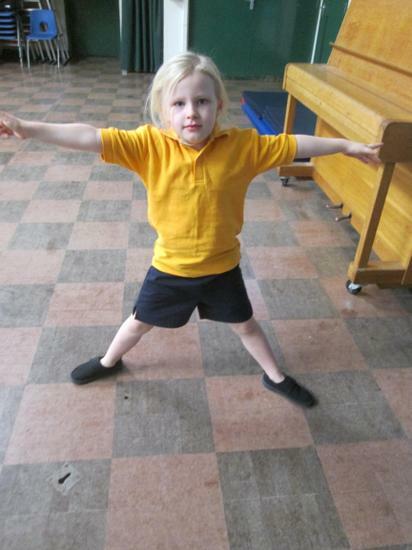 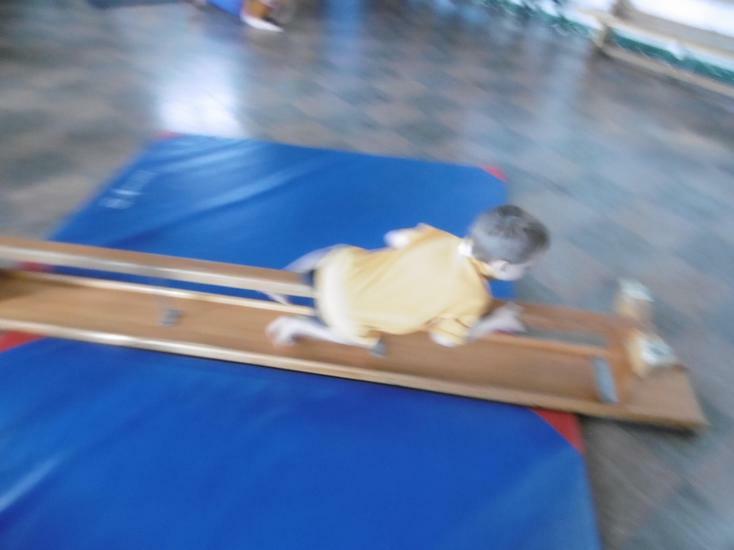 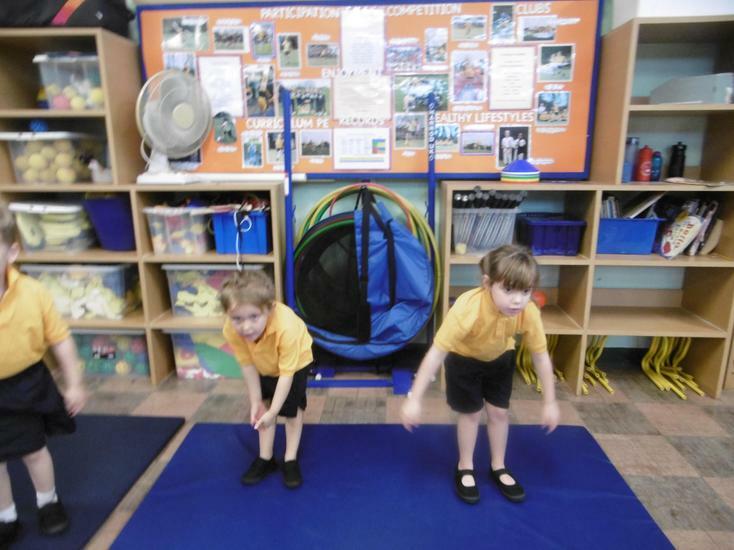 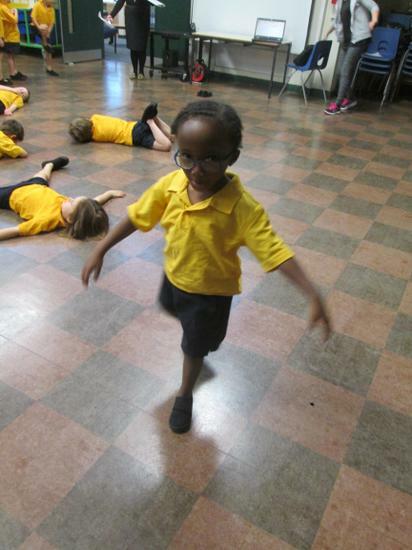 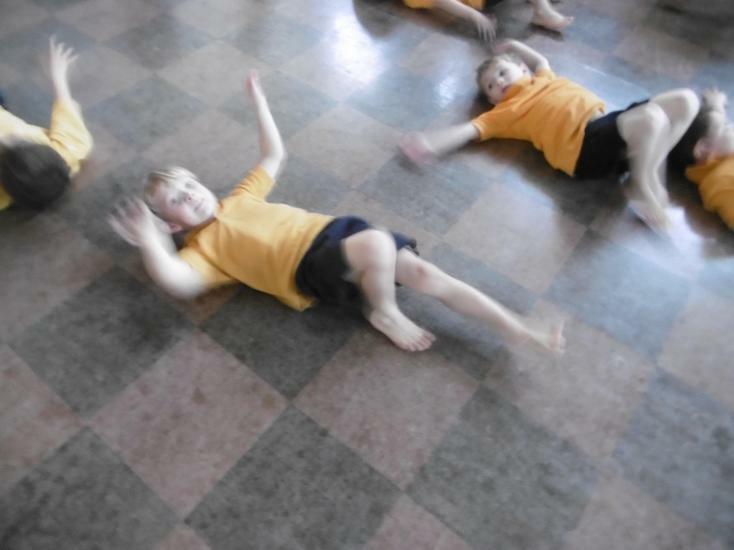 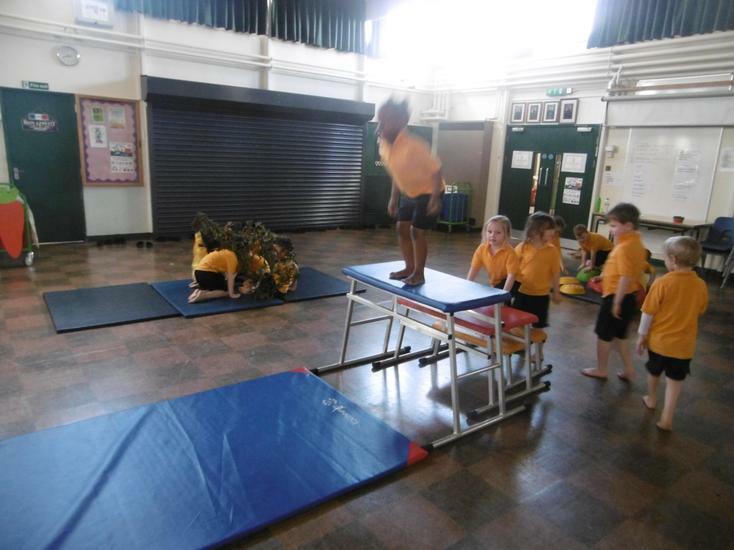 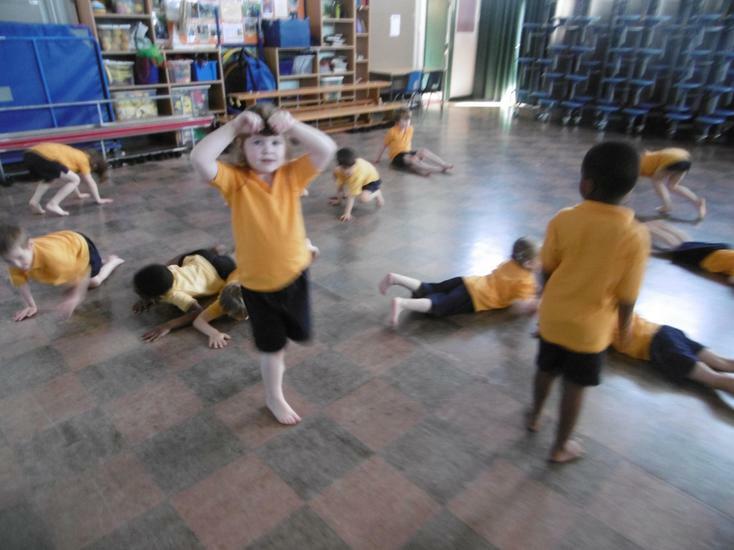 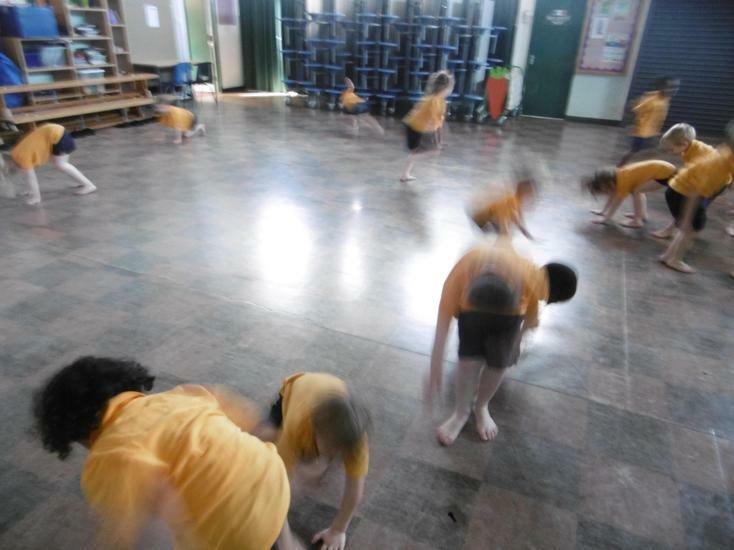 In PE today, we moved like different types of minibeasts, creeping, flying, crawling and slithering around the hall. 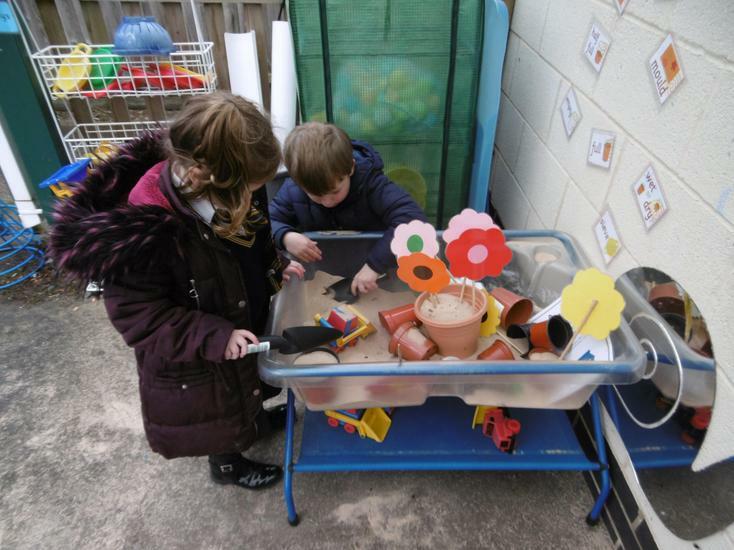 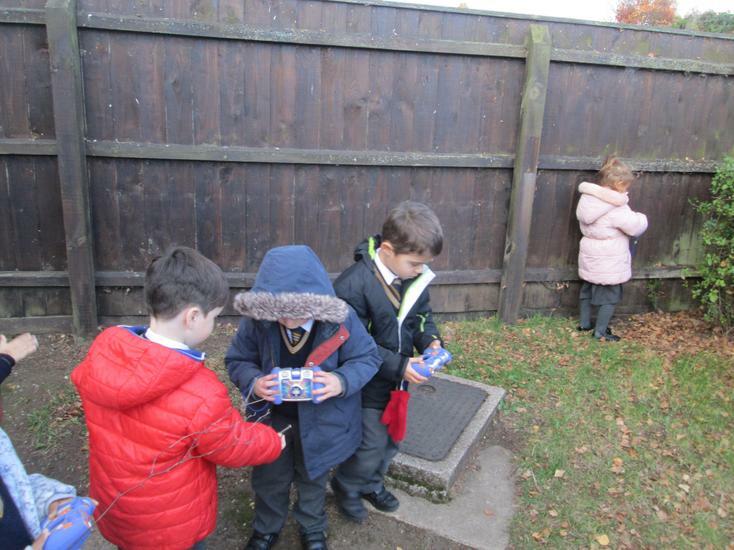 We then used the equipment to create different habitats, including rocks, stones, leaves, tunnels and branches, exploring how we could move on, across, under and off them. 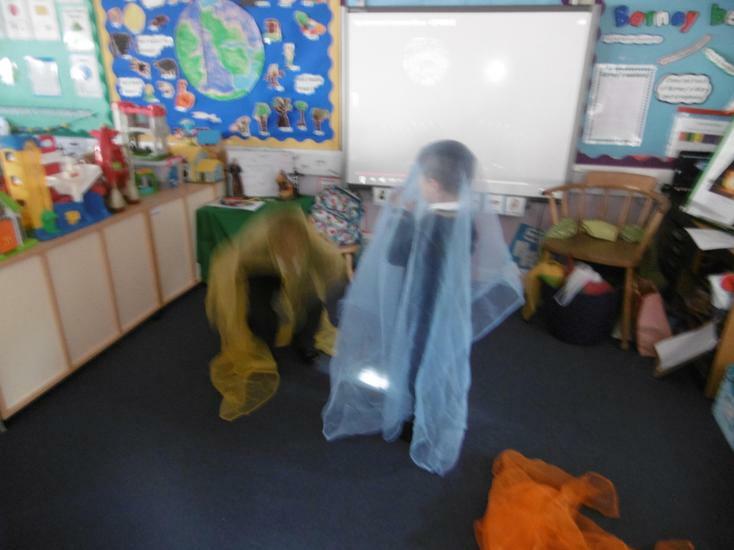 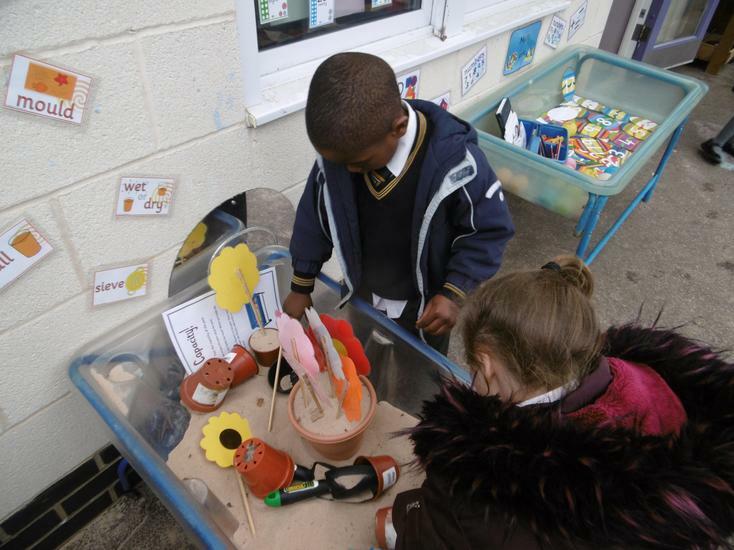 We also found places to freeze and 'hide' when the bird came, looking for minibeasts to eat. 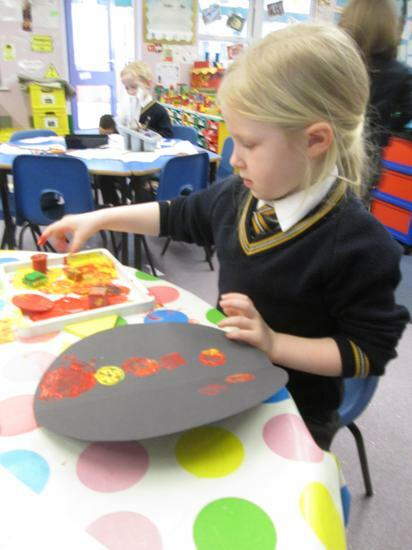 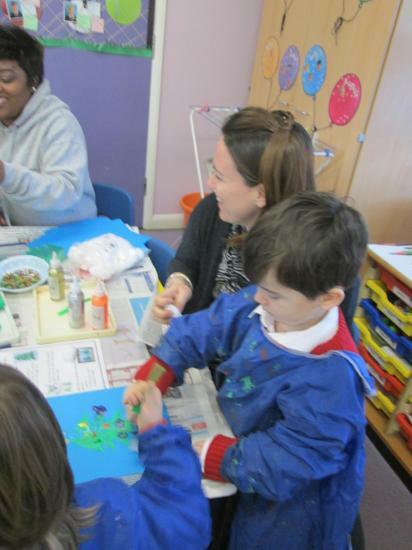 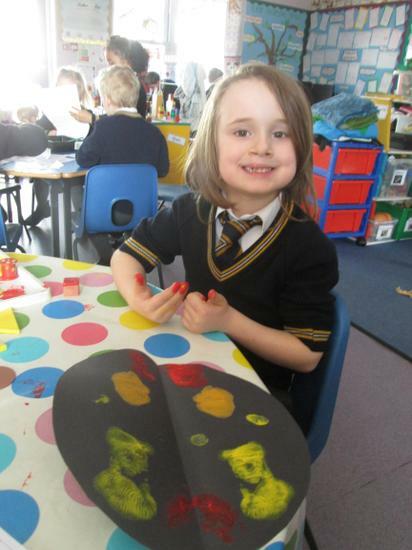 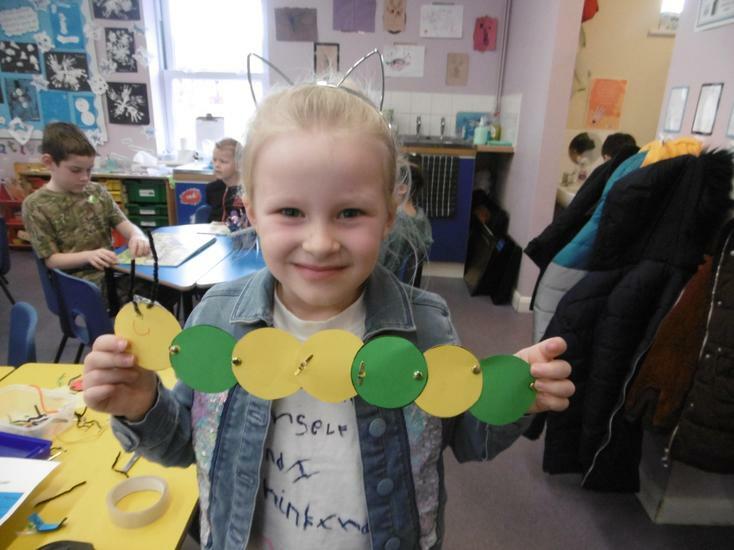 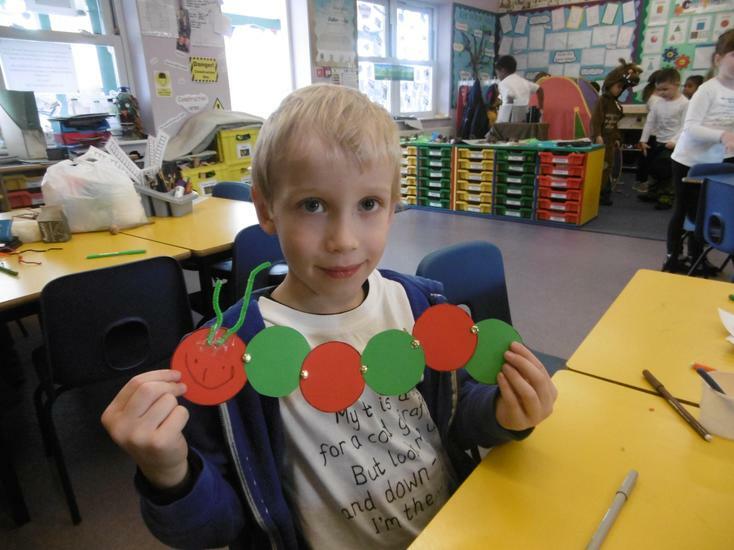 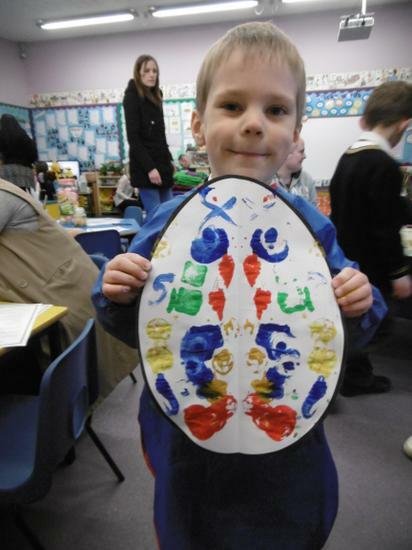 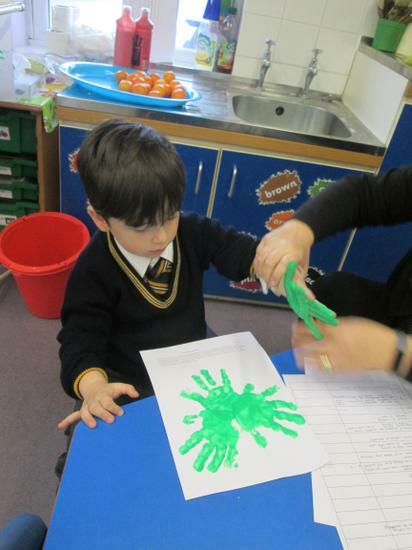 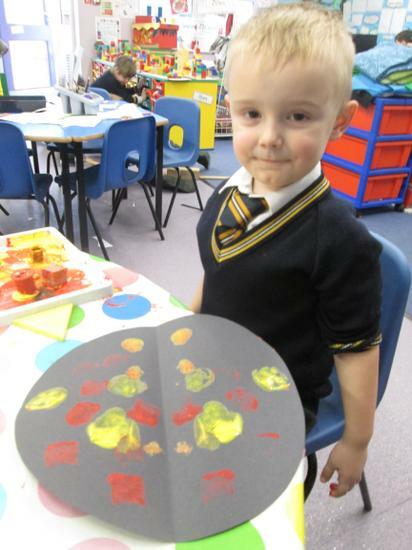 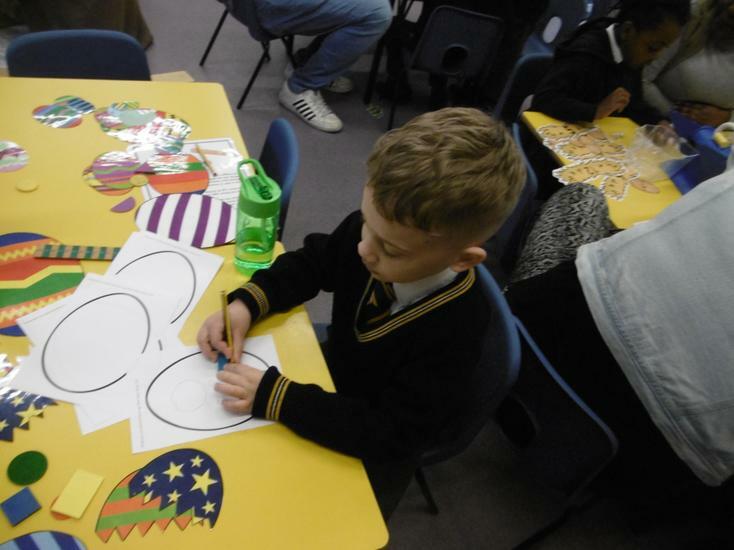 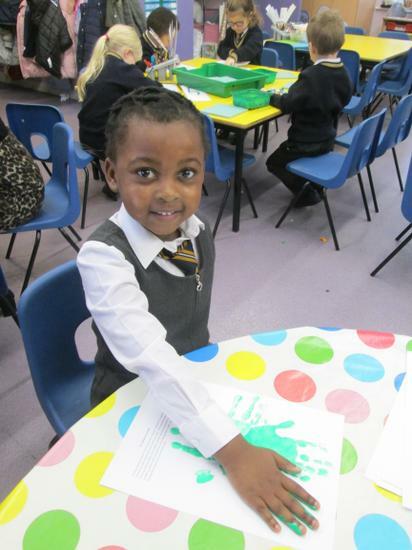 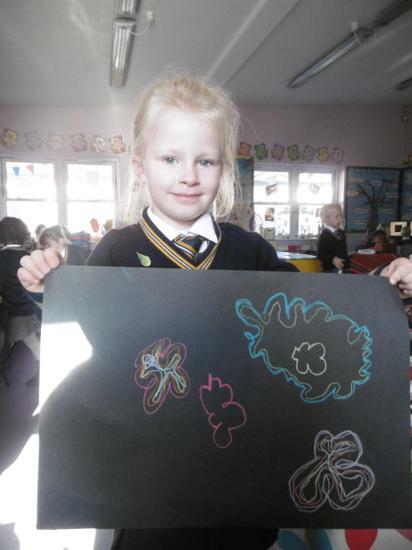 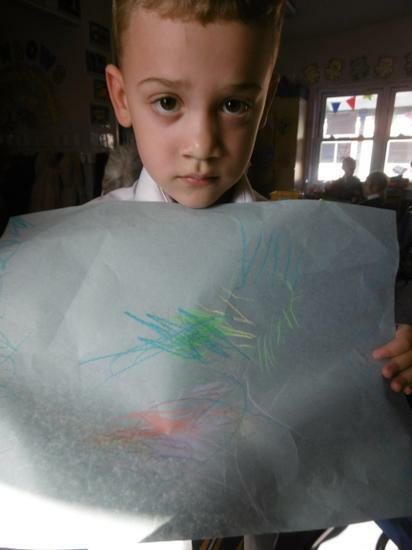 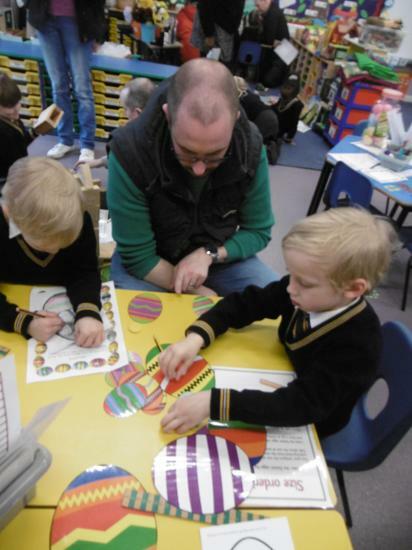 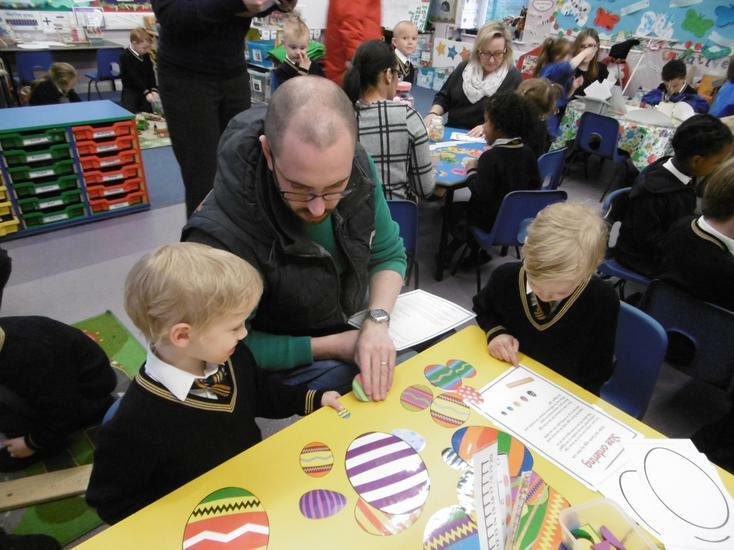 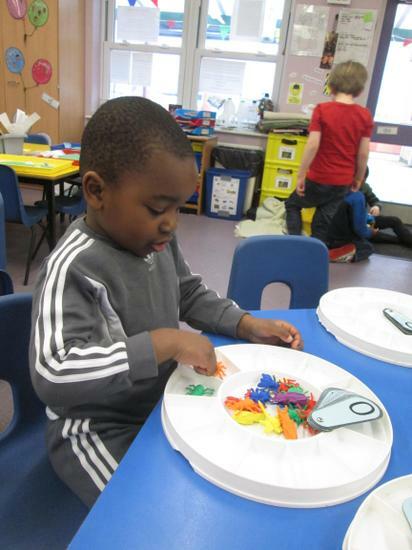 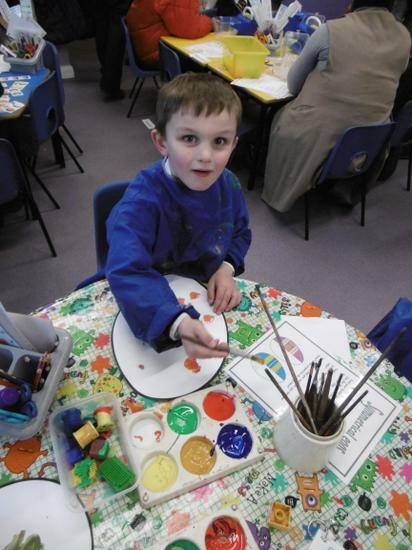 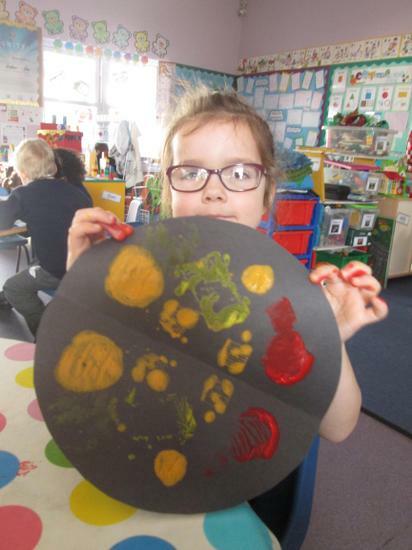 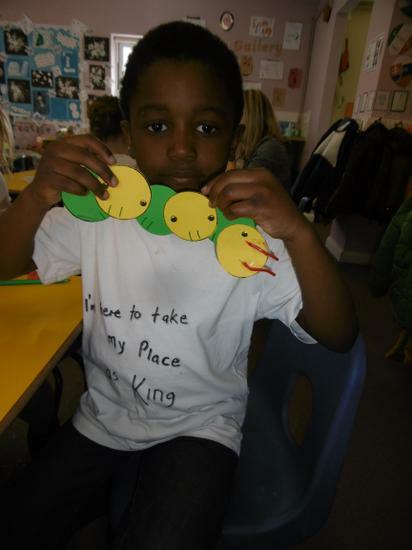 As part of World Book Day this week, we focused our work on the story of The Very Hungry Caterpillar by Eric Carle. 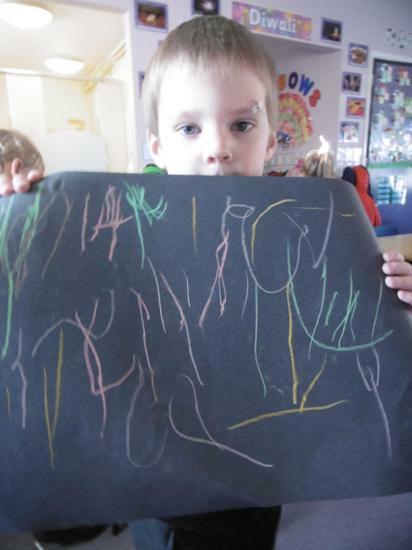 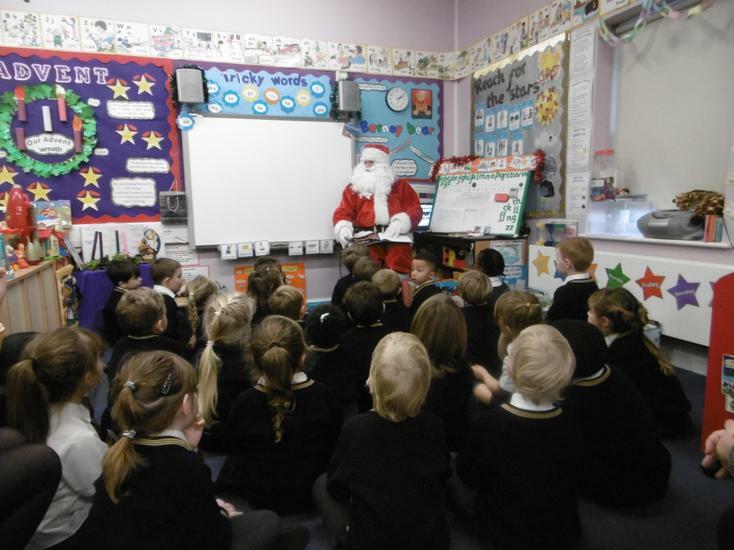 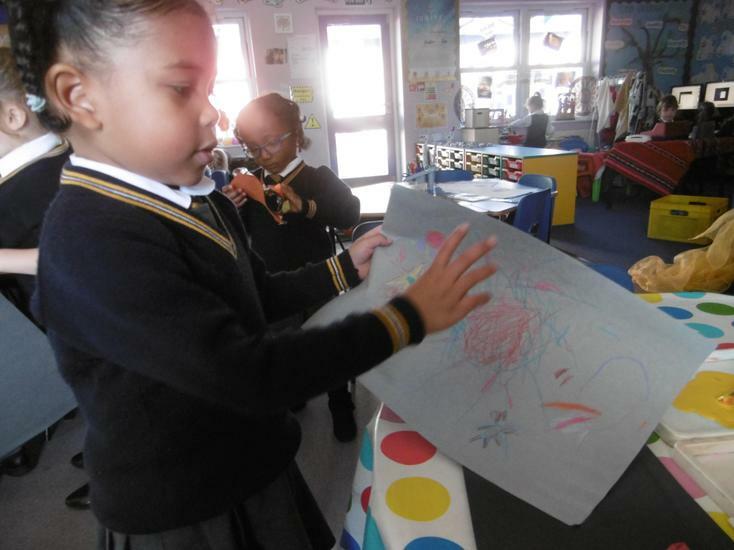 The children listened to the story, and watched a version of the story of the whiteboard. 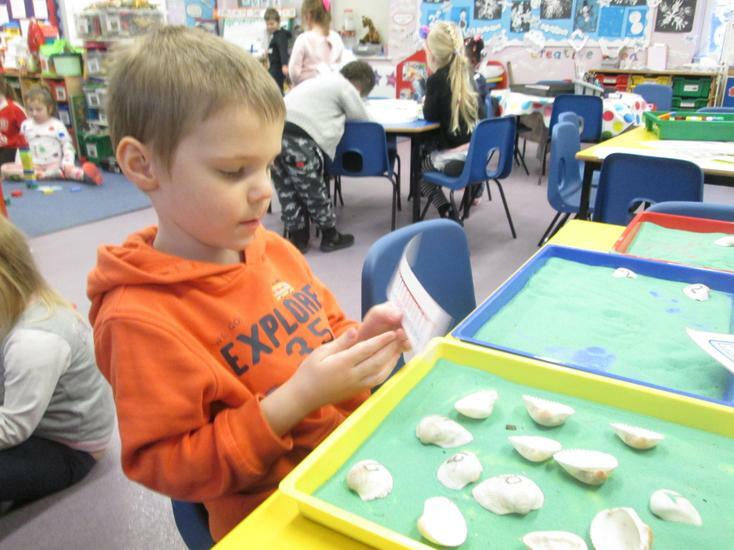 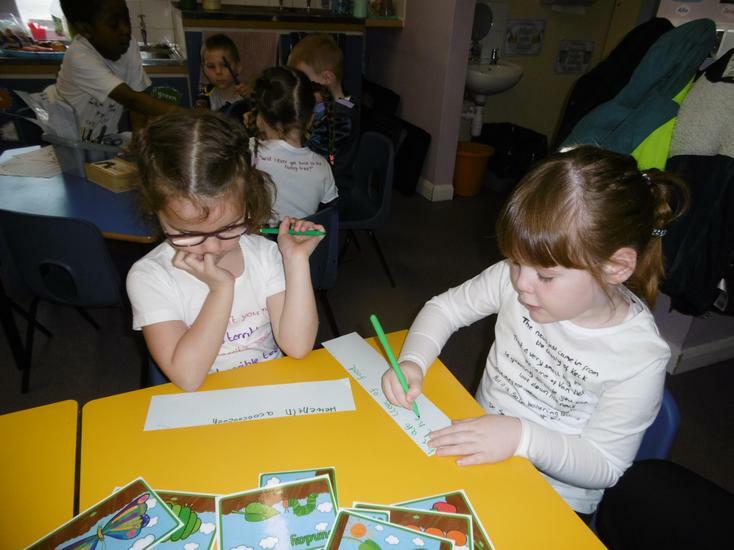 We had a busy day of activities, sequencing and retelling the story using picture cards. 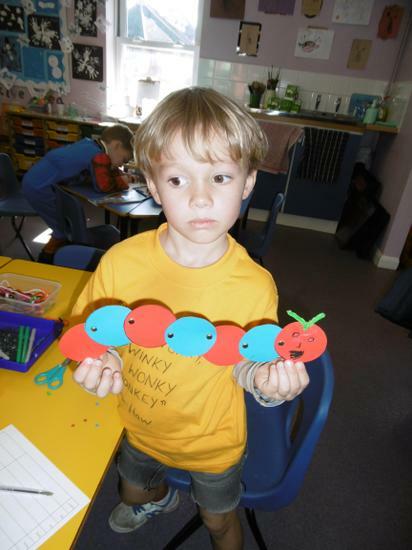 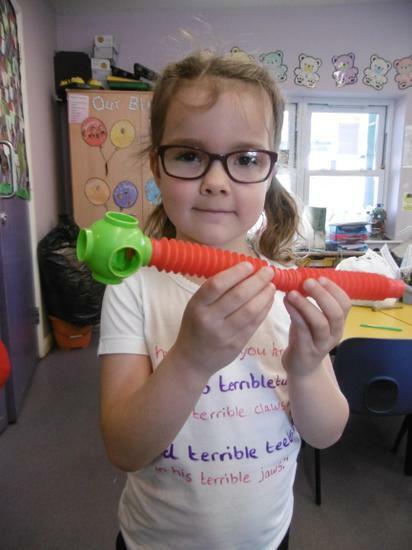 We also made our own moving caterpillars, investigating what material would be best to make it move up and down and why. 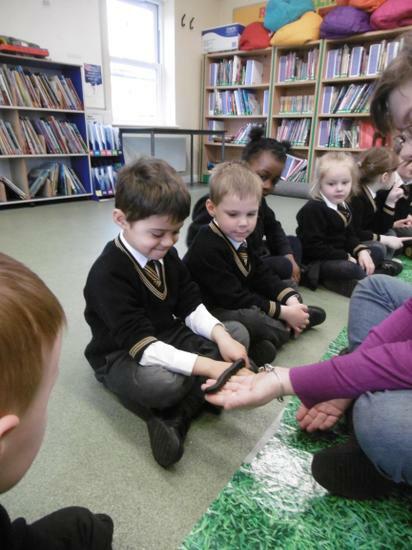 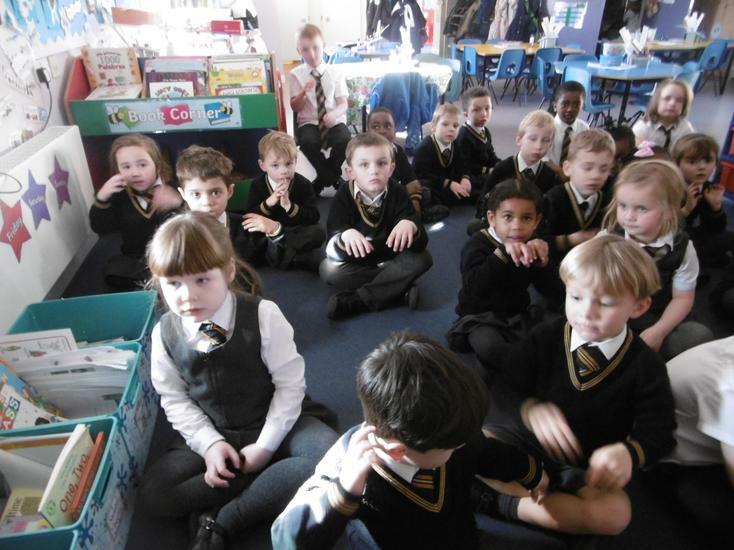 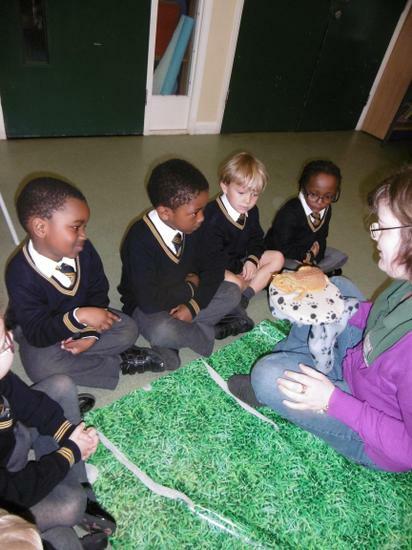 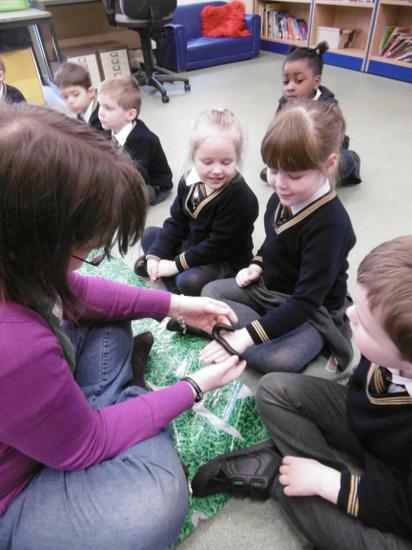 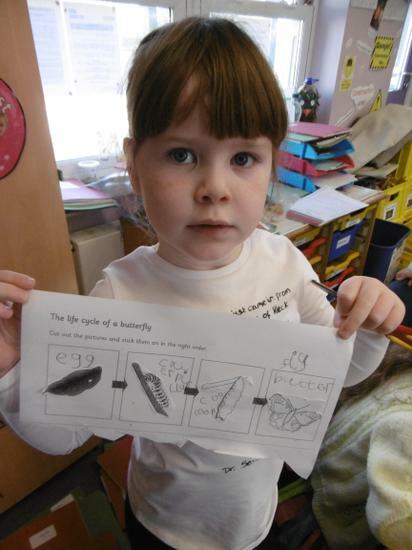 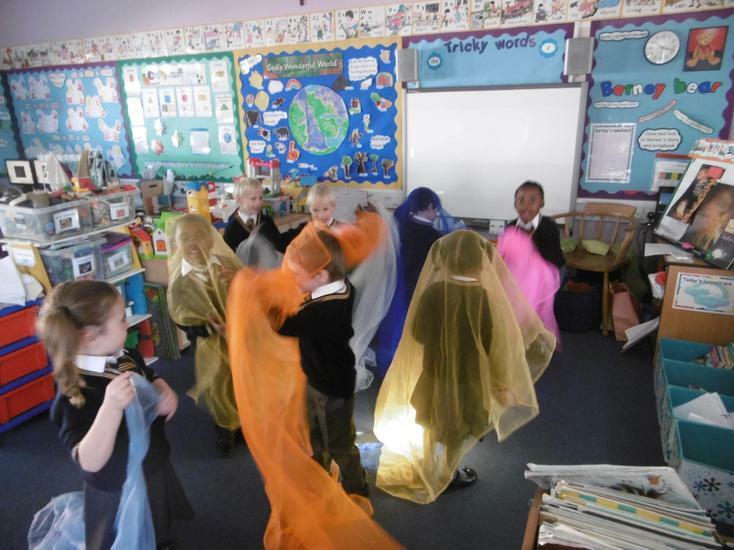 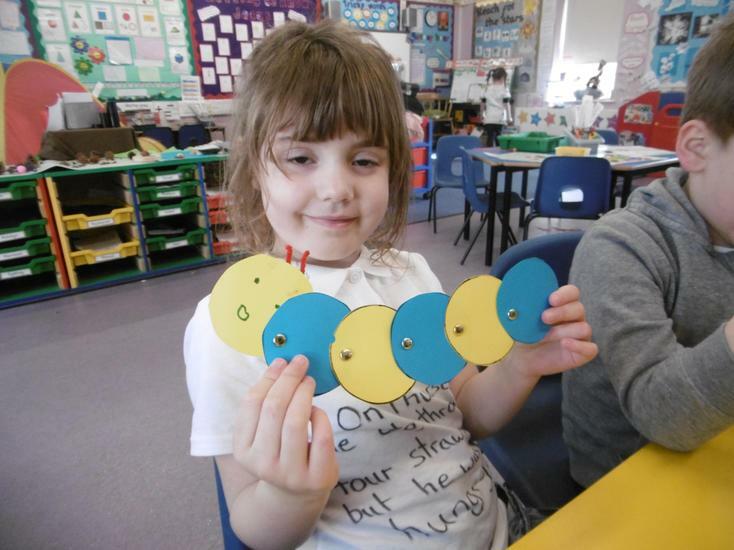 The class had a fun day and learnt lots about the life cycle of a butterfly and the importance of reading books. 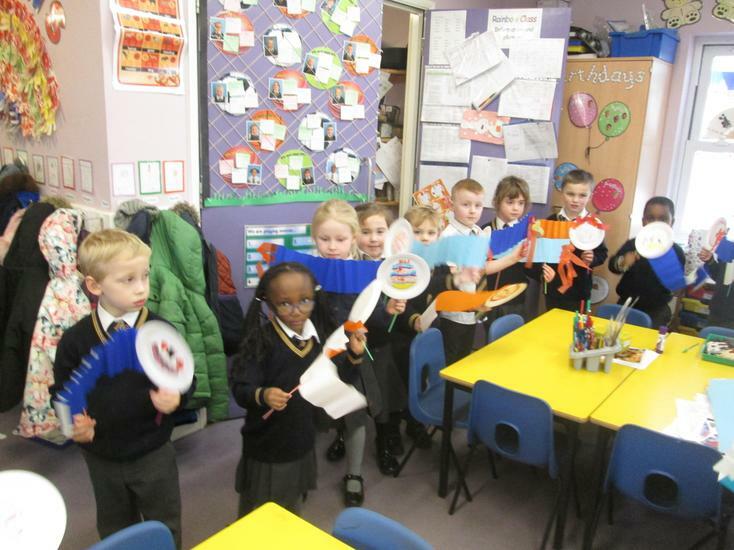 After finding out about Chinese New Year, we had a celebration afternoon to end our focus on this festival. 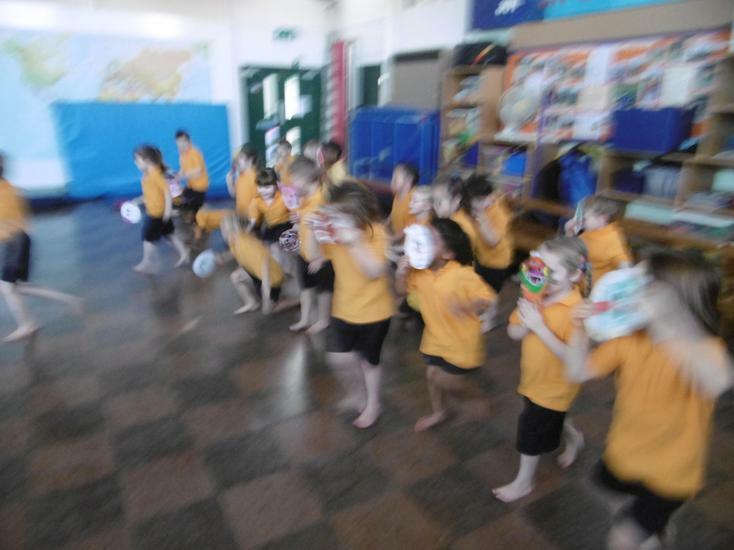 We began by learning a Chinese New Year song, adding actions and movements, before going on a lantern parade with the lanterns we'd made. 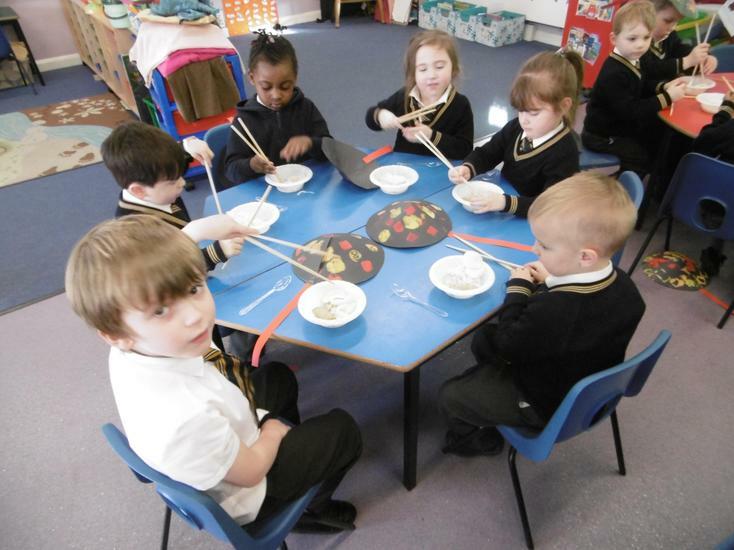 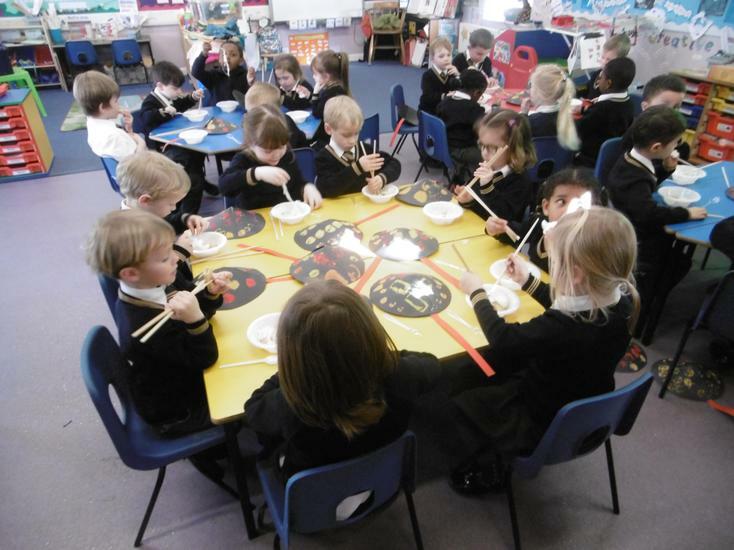 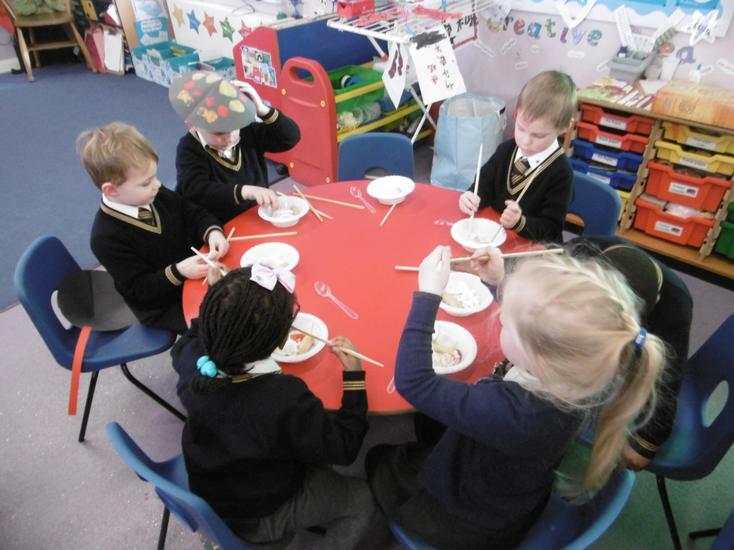 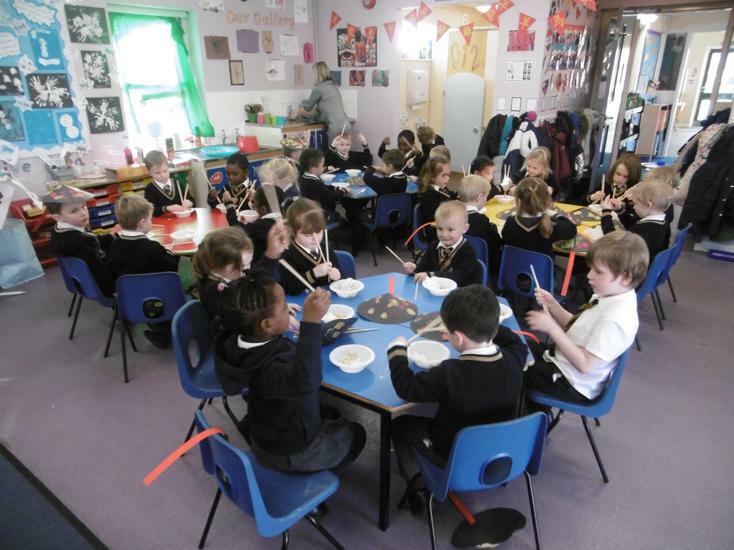 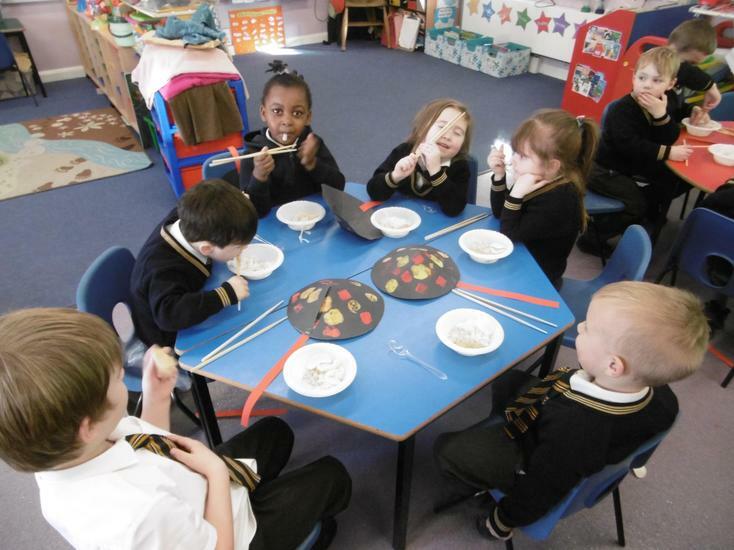 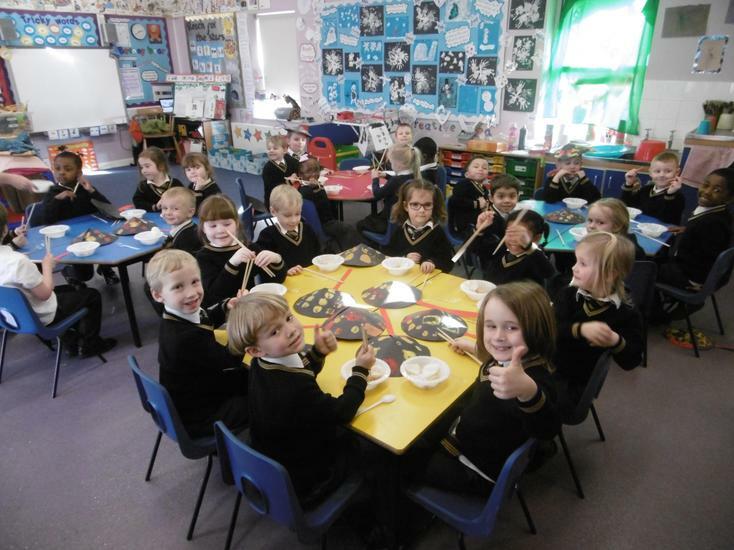 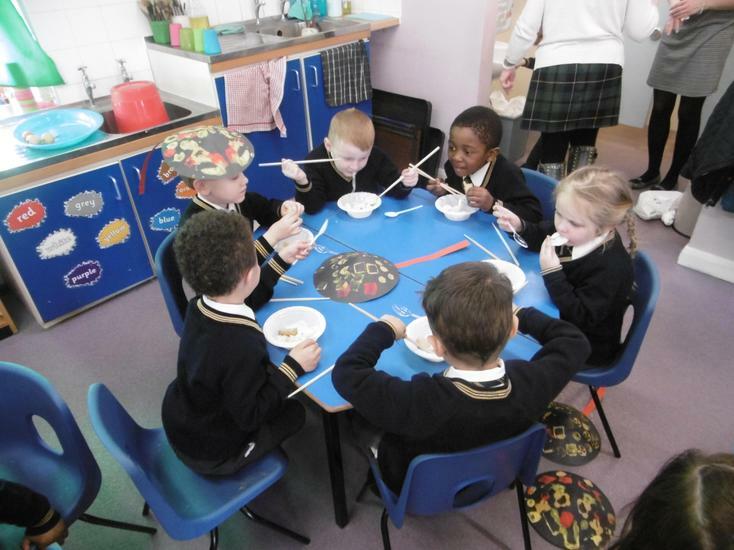 We then put on our Chinese hats and had some Chinese food, trying rice, noddles, spring rolls, prawn crackers and sweet and sour sauce, even having a go using chopsticks! 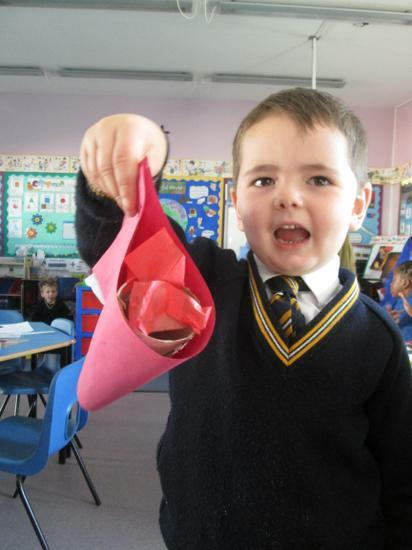 We also had fortune cookies, finding out what our fortunes would be! 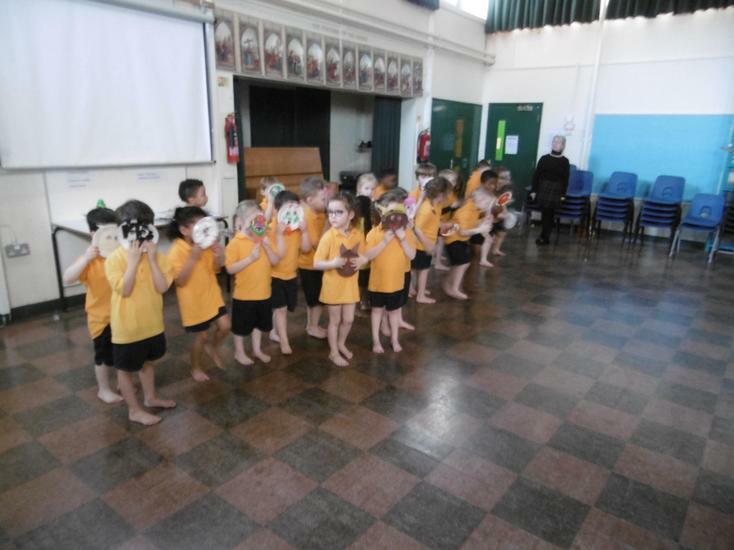 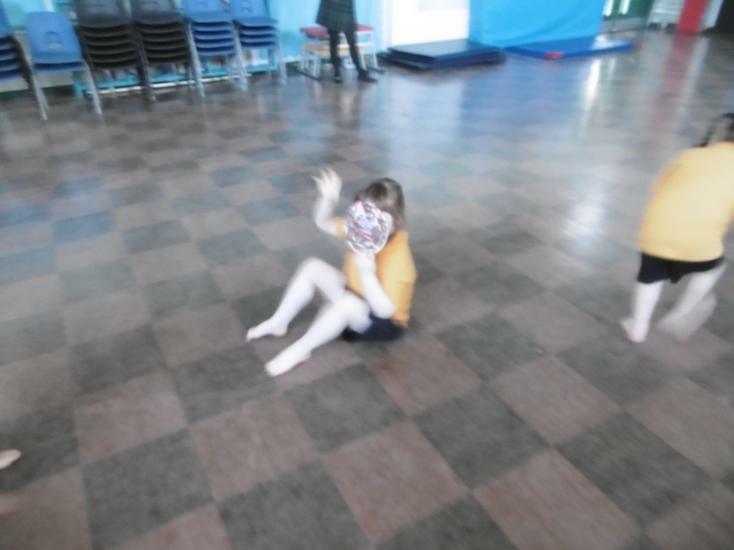 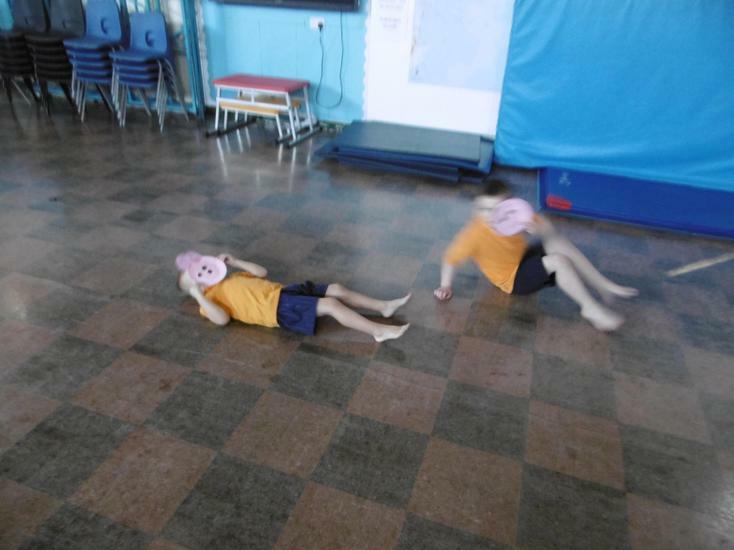 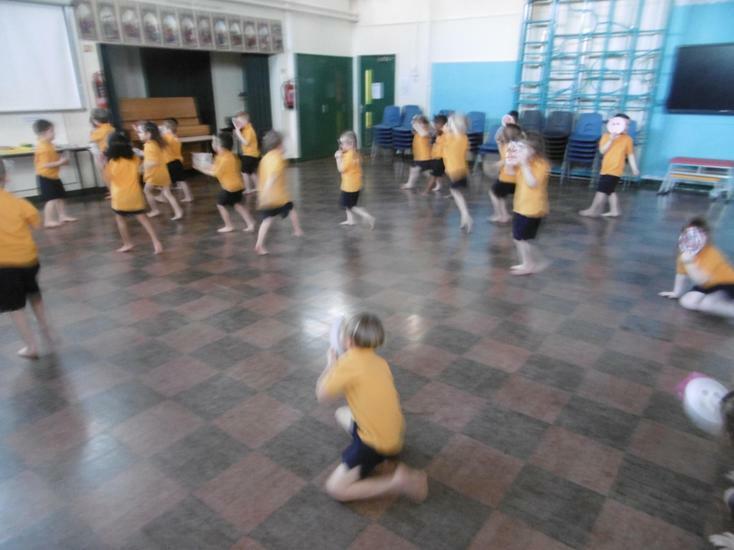 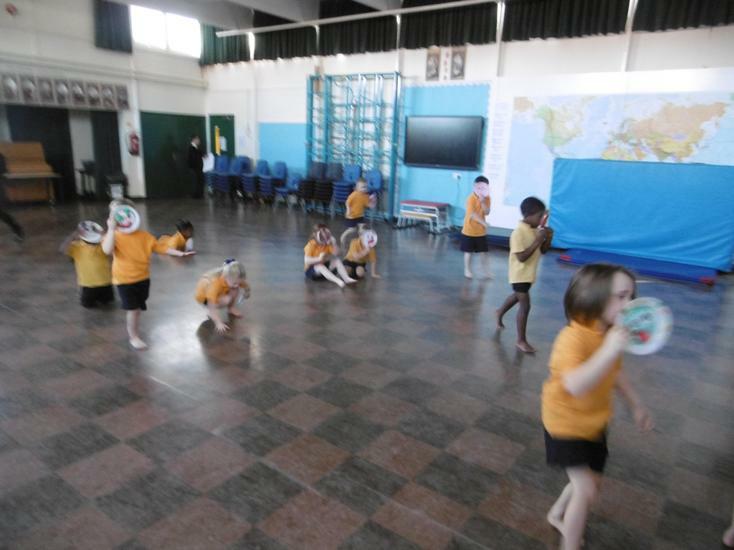 We continued our work on Chinese New Year by retelling the great race story in PE, using our bodies to move like the animals, as well as using the animal masks we had made to have our own great race! 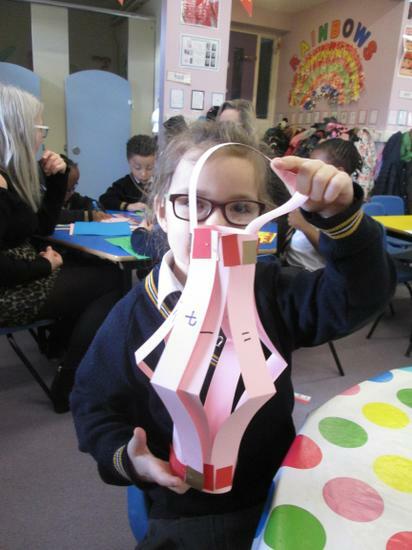 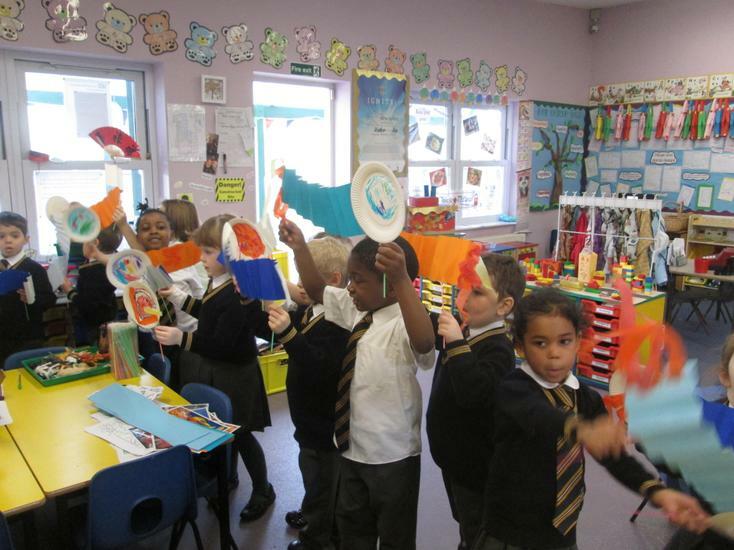 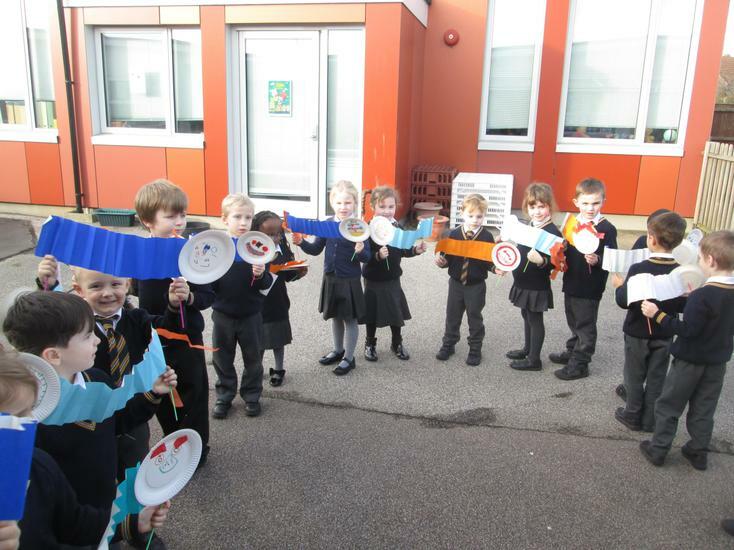 As part of our Chinese New Year celebrations, we made our own dancing dragons. 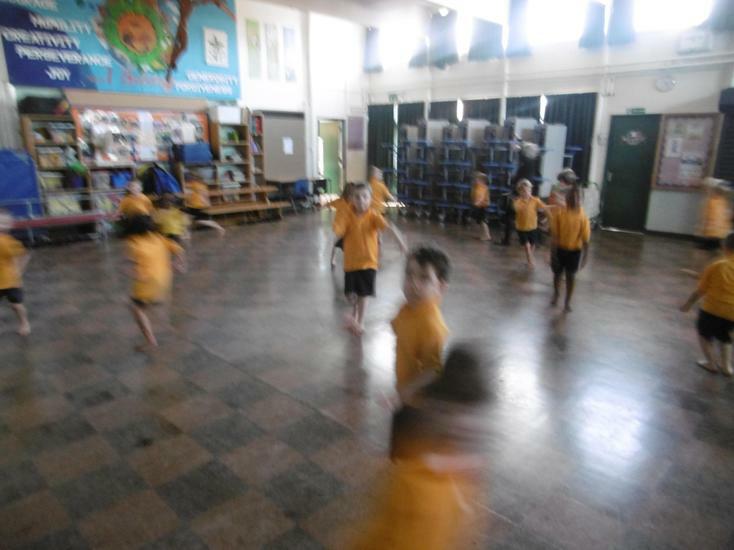 We watched some videos on the whiteboard of the dragons moving up and down and following the ball. 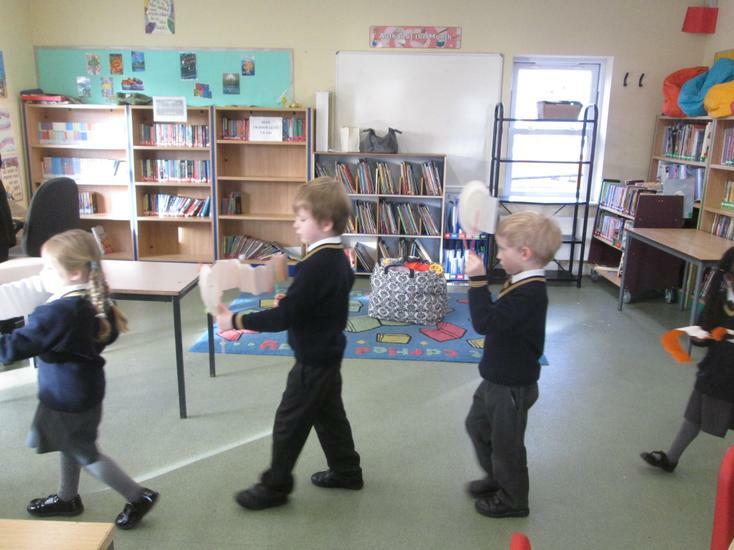 They were being held up with sticks and moved around very fast with lots of instruments being played. 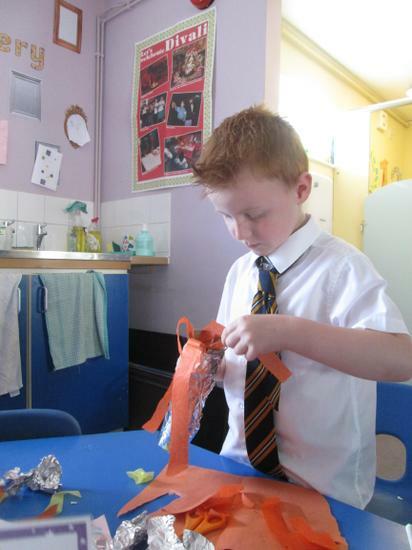 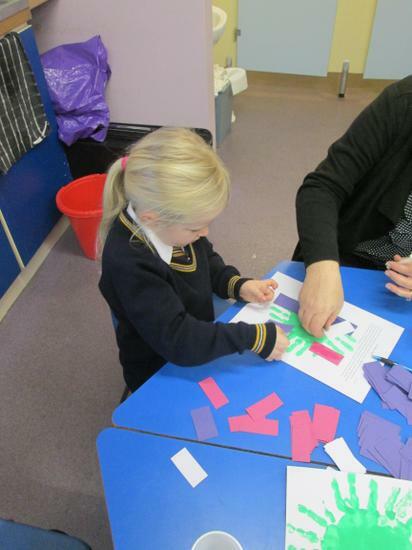 We choose what colour we wanted our dragon body to be and began folding it for a concertina effect. 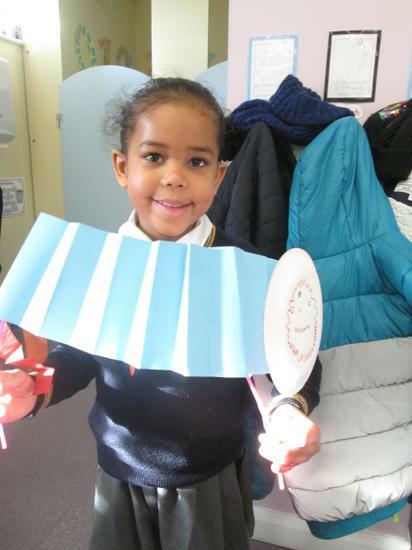 When we opened it up, we recognised we had made a fan! 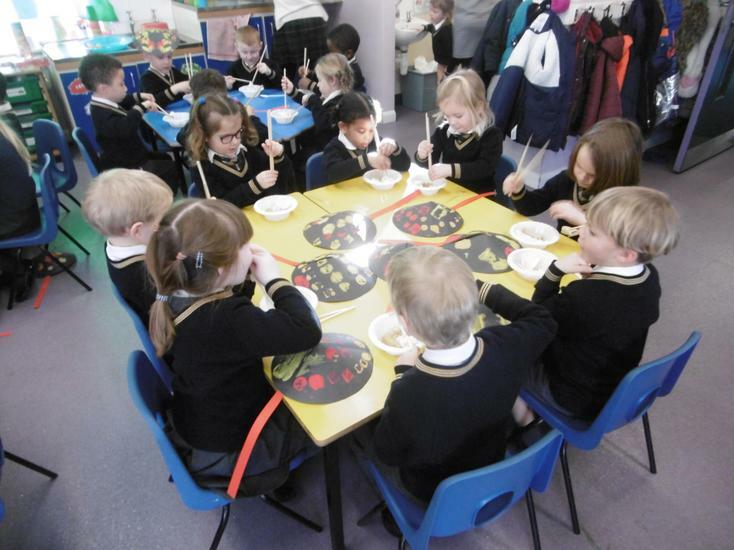 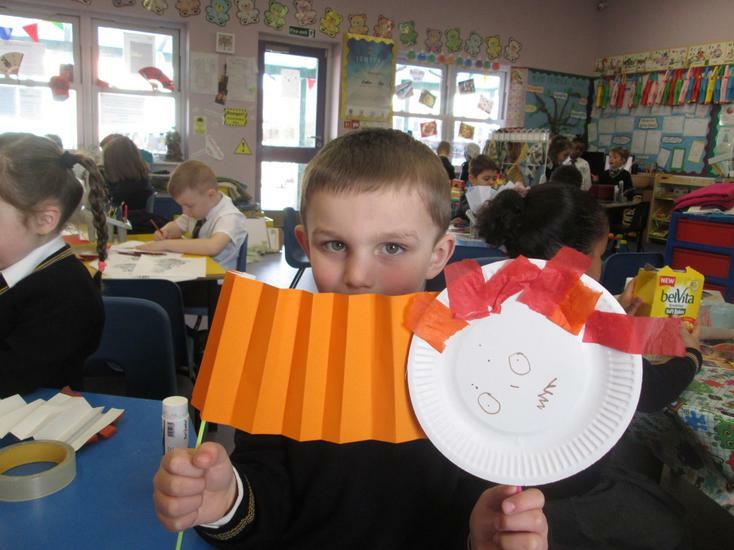 We then decorated our scary dragon masks, using paper plates, pens and different materials and then attached with straws to hold up. 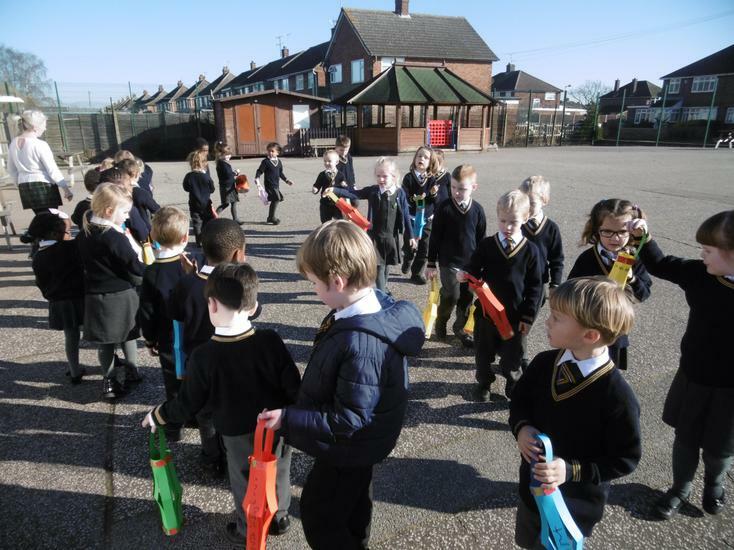 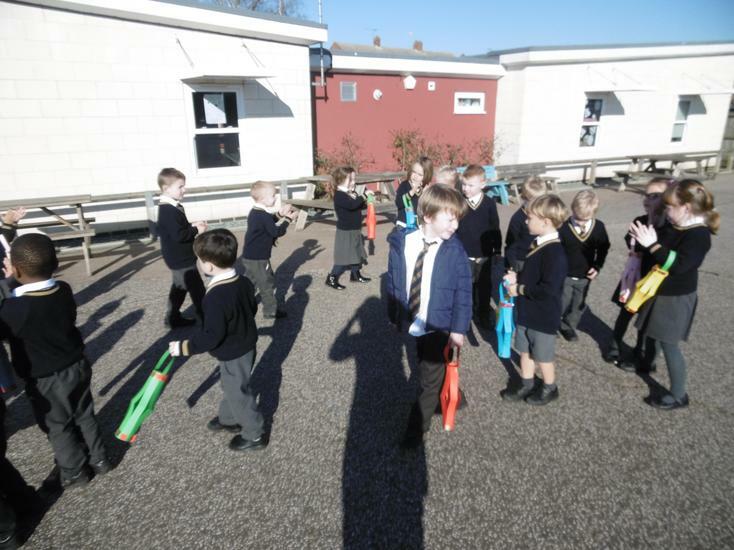 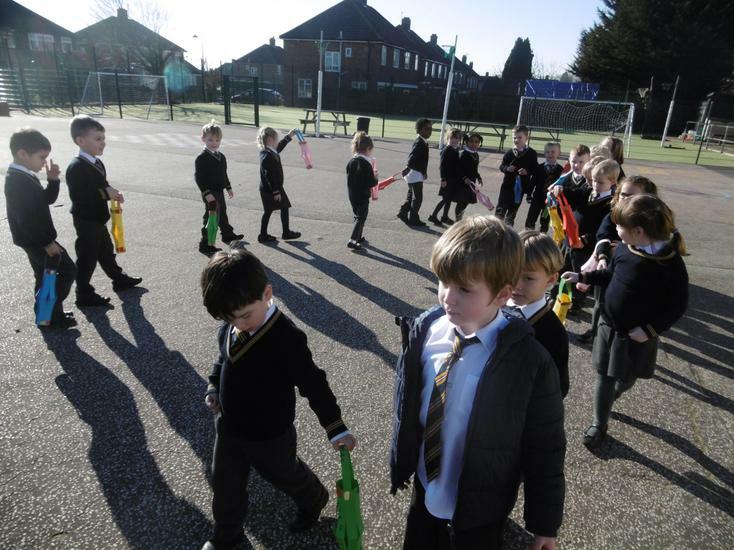 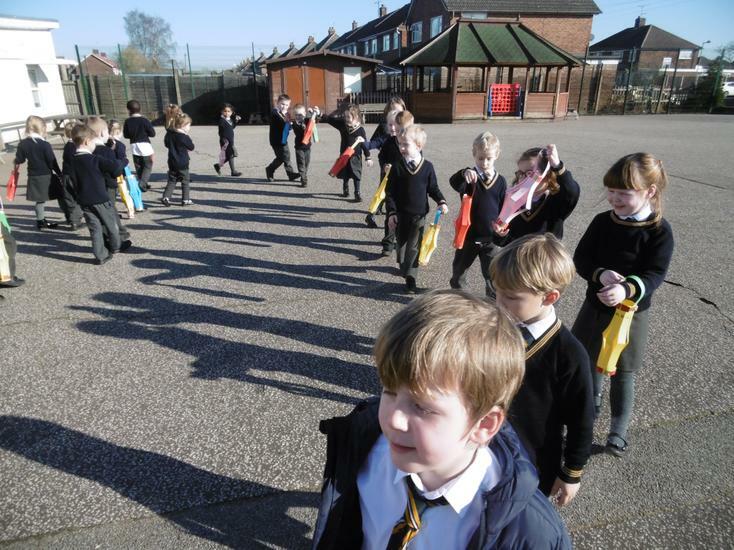 This afternoon we went on our own dragon dance outside and in the classroom, following the leader and moving our dragons up and down like we had watched on the videos. 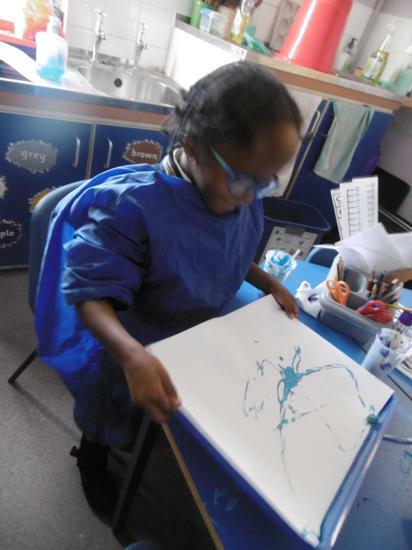 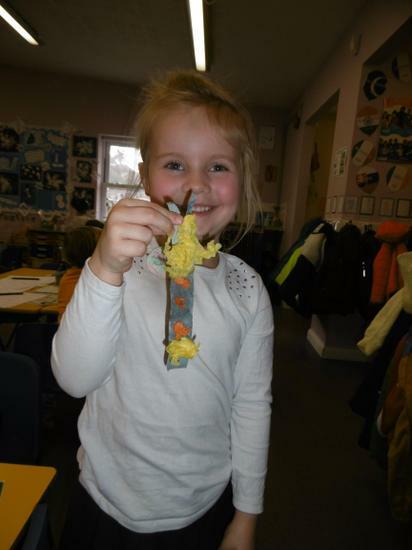 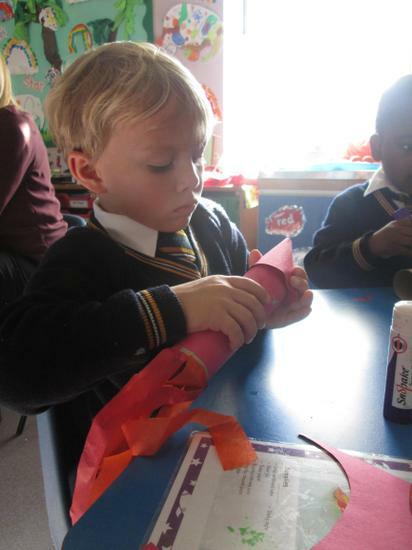 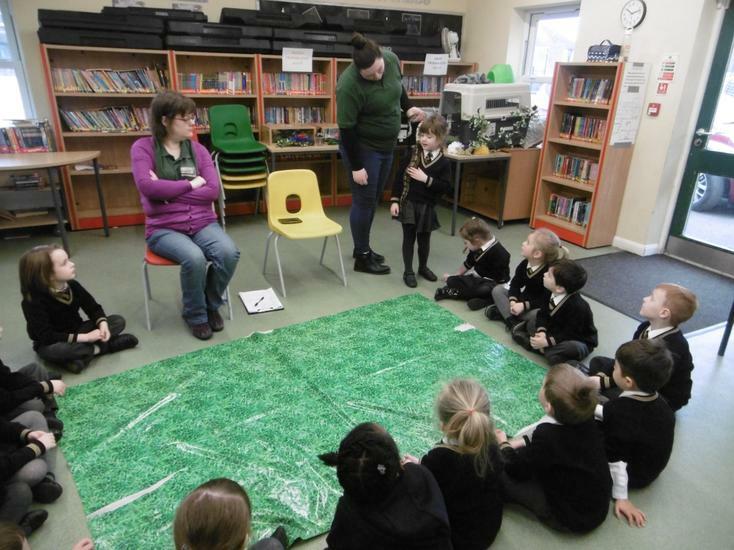 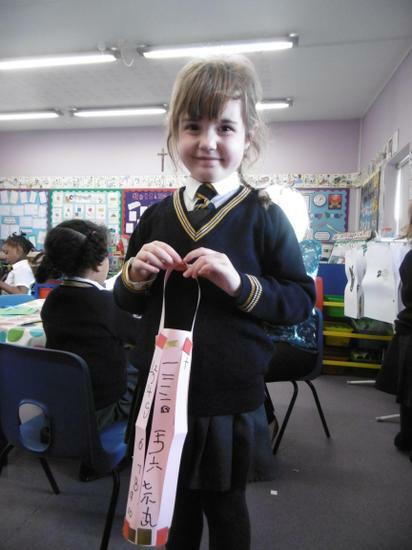 It was important that we stayed behind each other and kept up to make a really long and scary dragon! 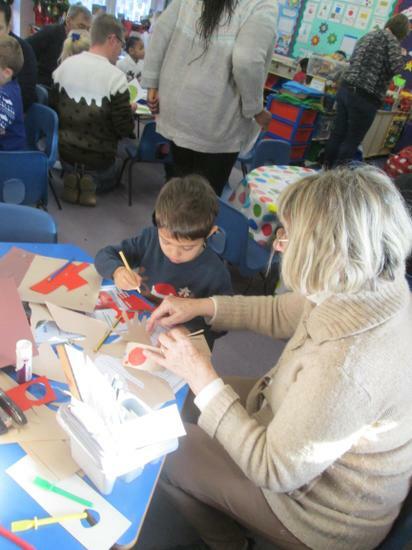 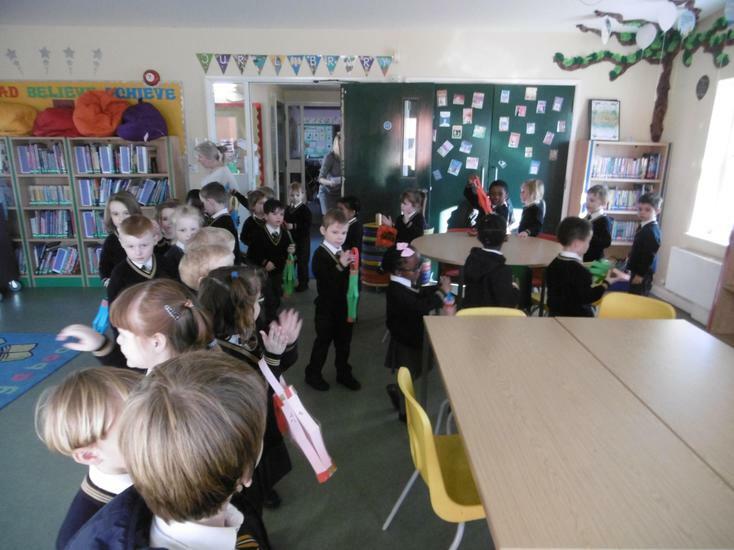 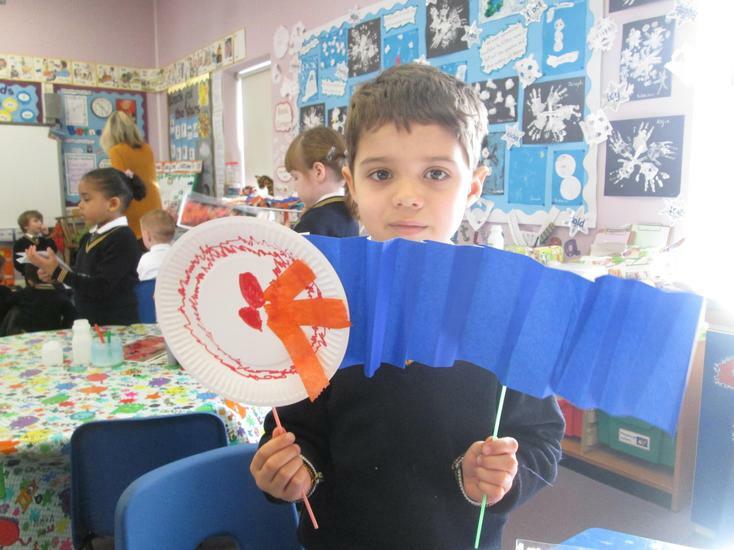 We have had a busy week learning about the Chinese New Year festival. 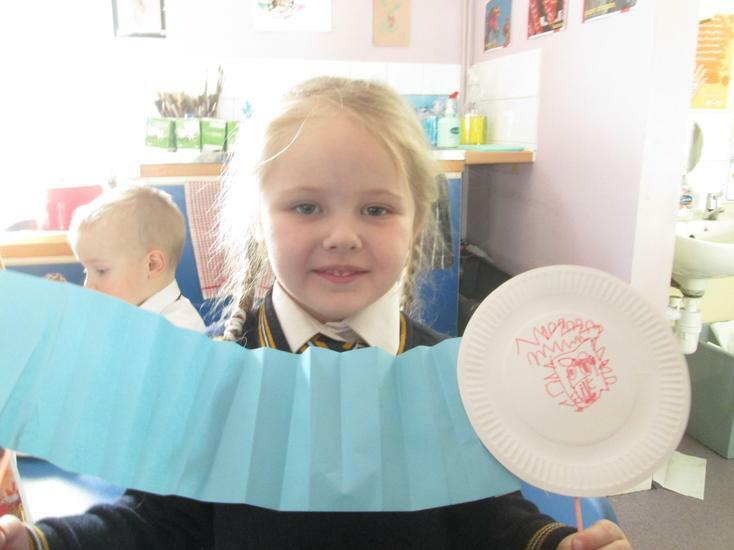 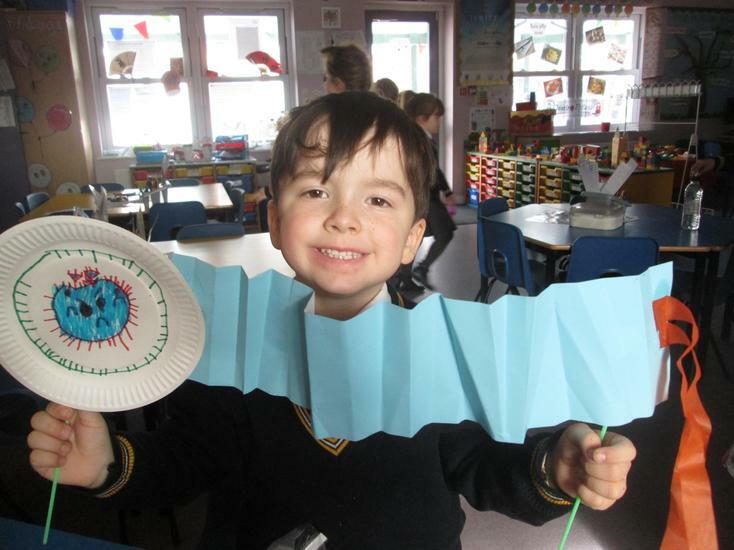 This week in Maths, we made our own Chinese hats, printing with 2D shapes using lots of different tools. 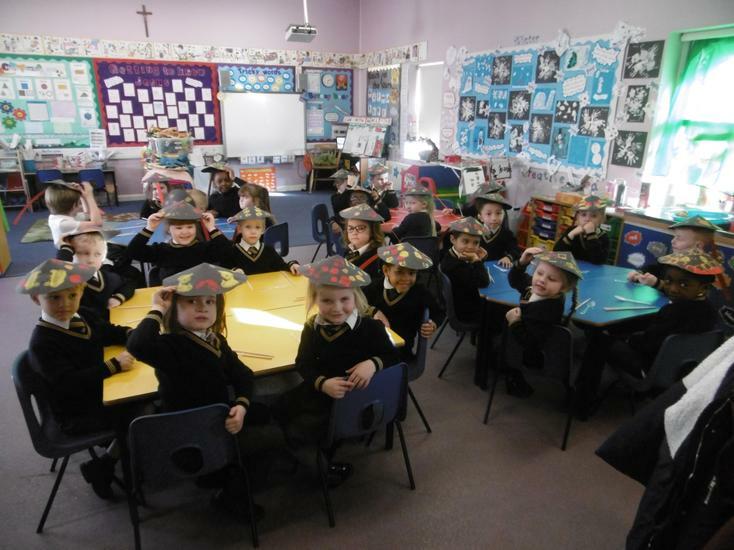 We also learnt about symmetry, when we folded our hats in halve, it was the same on both sides! 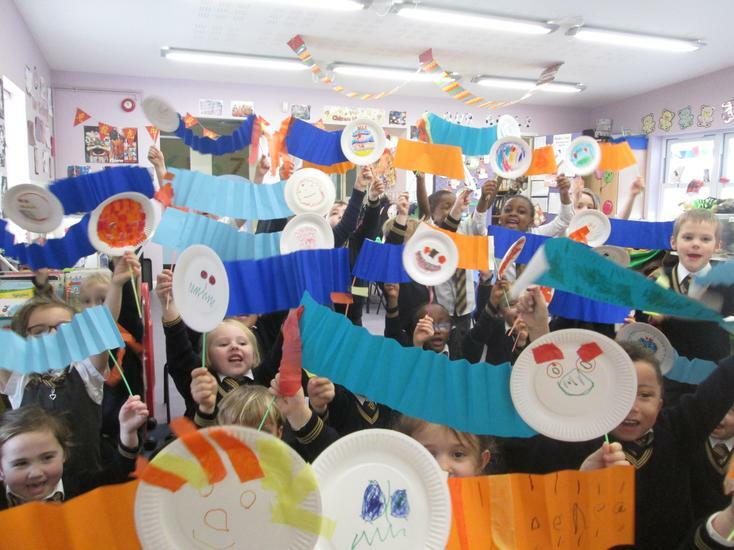 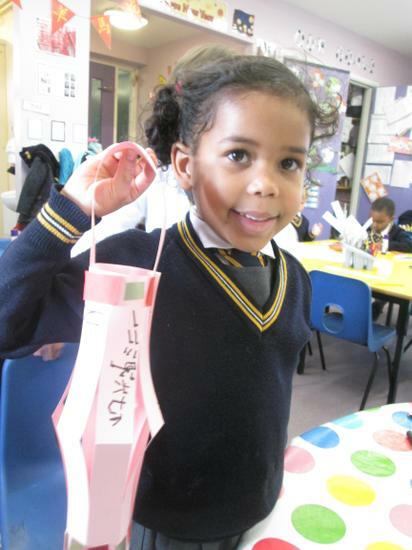 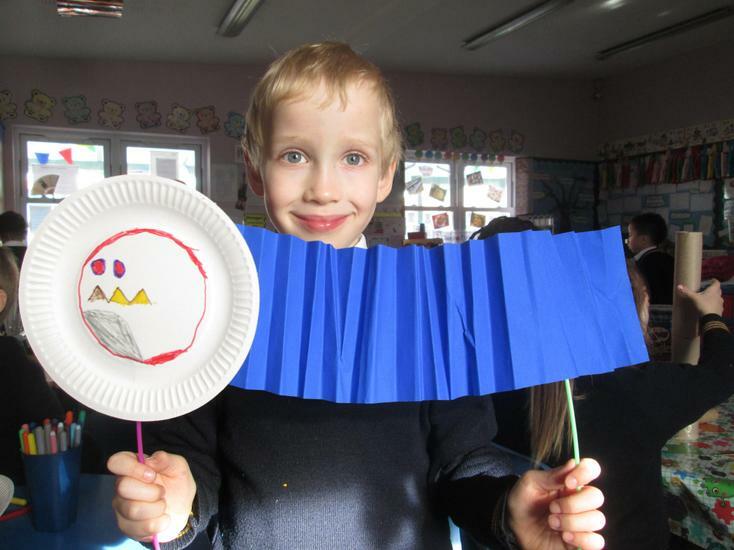 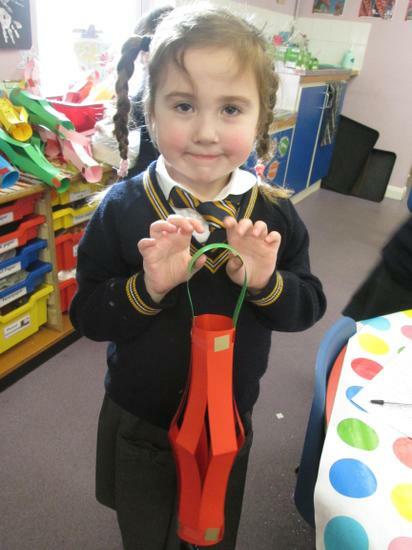 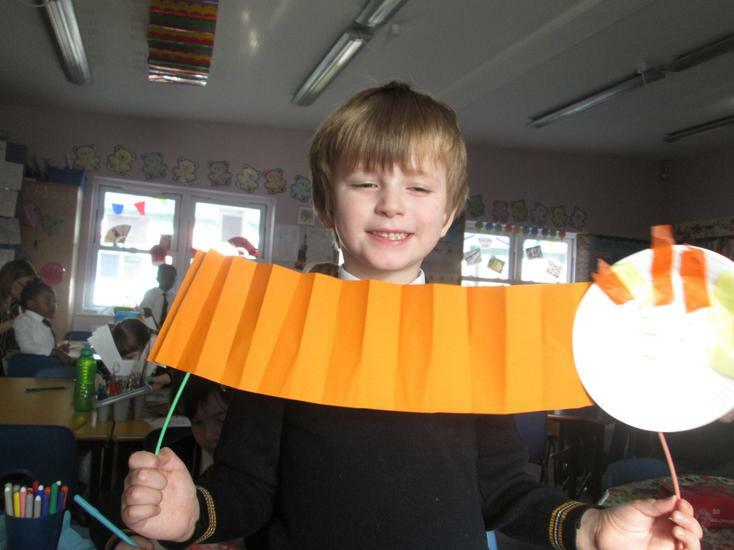 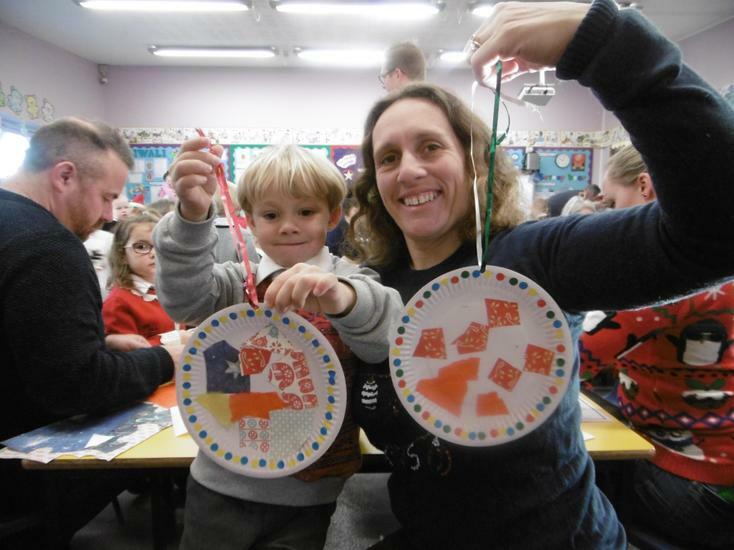 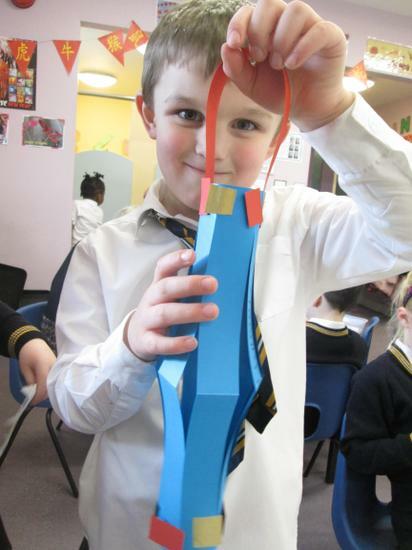 We have also made Chinese lanterns, learning about the lantern festival which takes place on the fifteenth day. 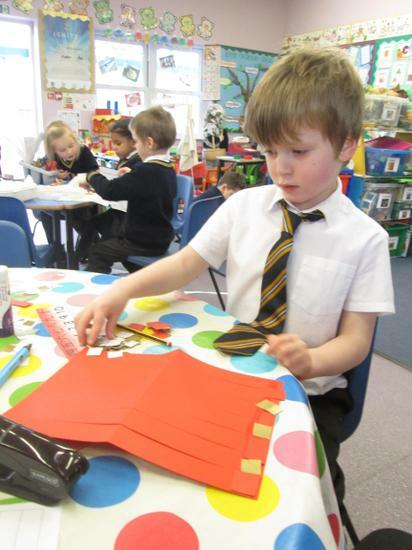 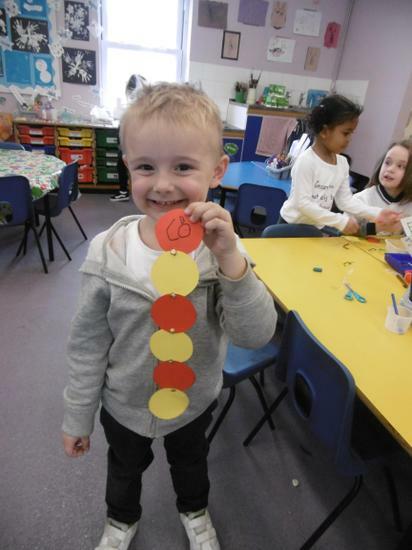 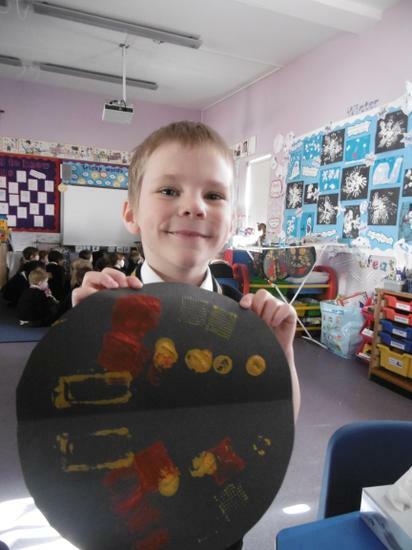 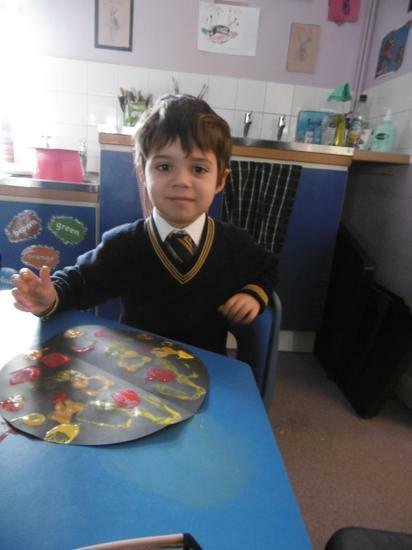 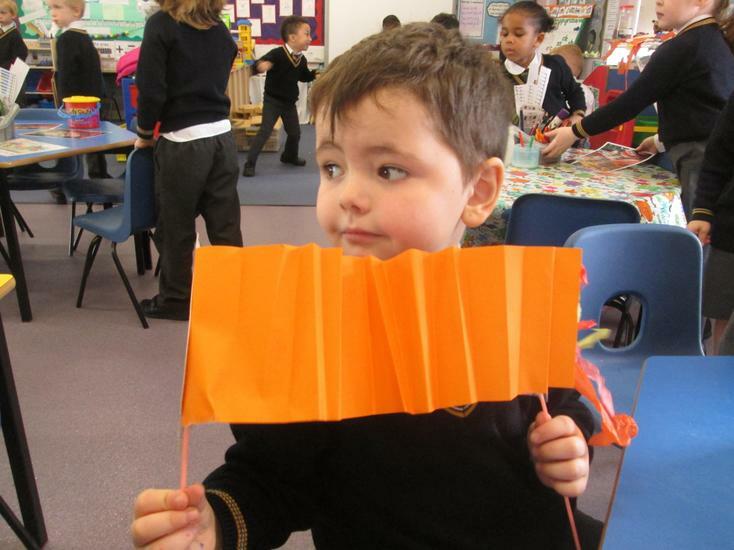 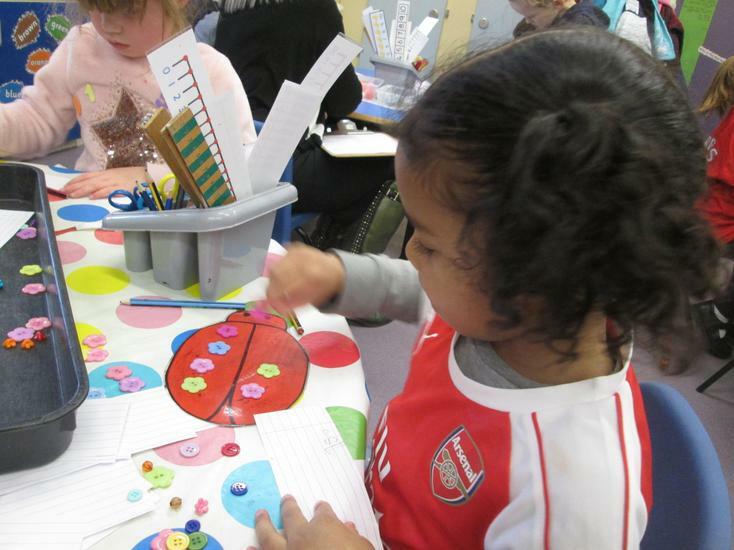 We made our own repeating patterns using red and gold paper, these are the colours meaning luck. 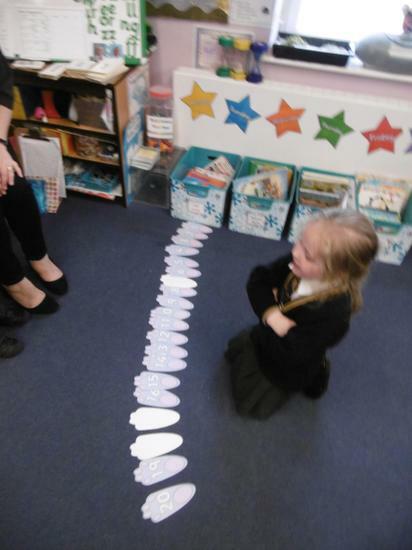 We then used a Chinese number line to copy some Chinese numbers to 10. 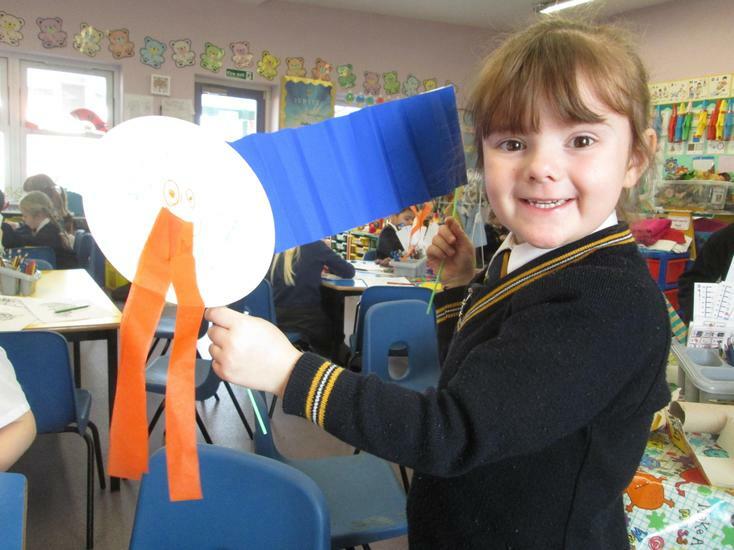 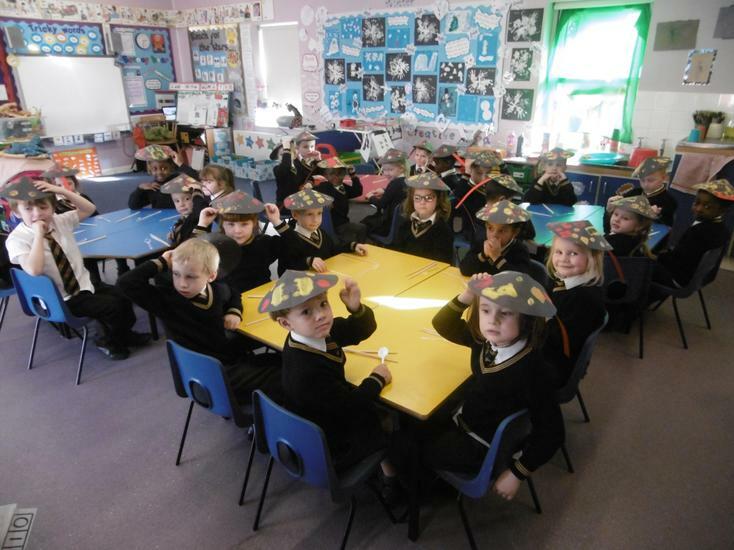 We can't wait to wear our hats and go on a lantern parade next week! 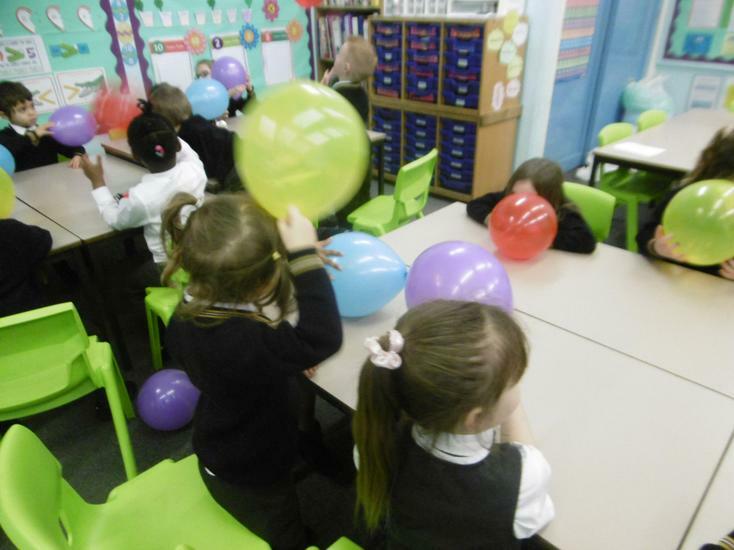 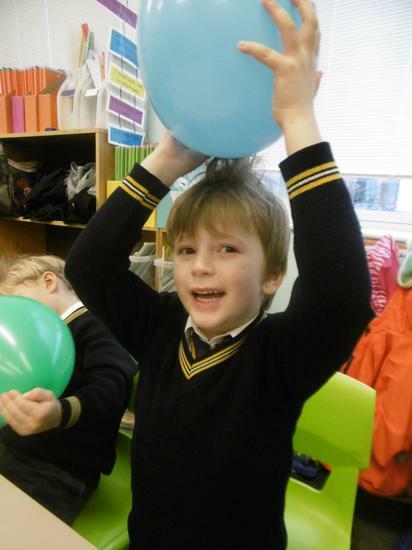 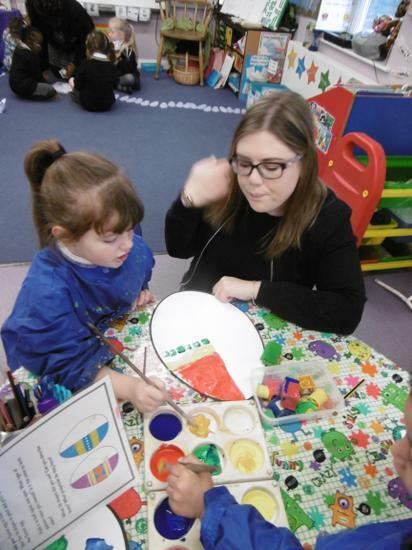 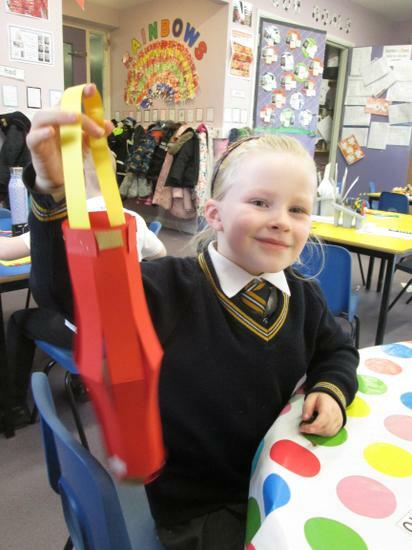 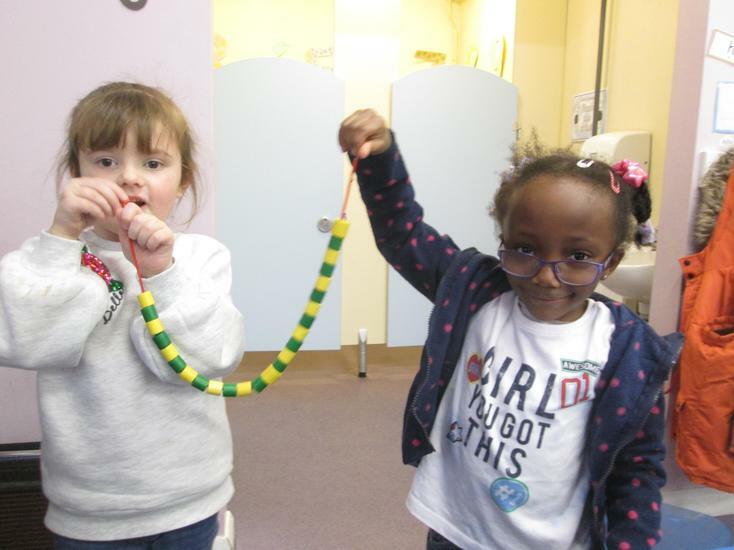 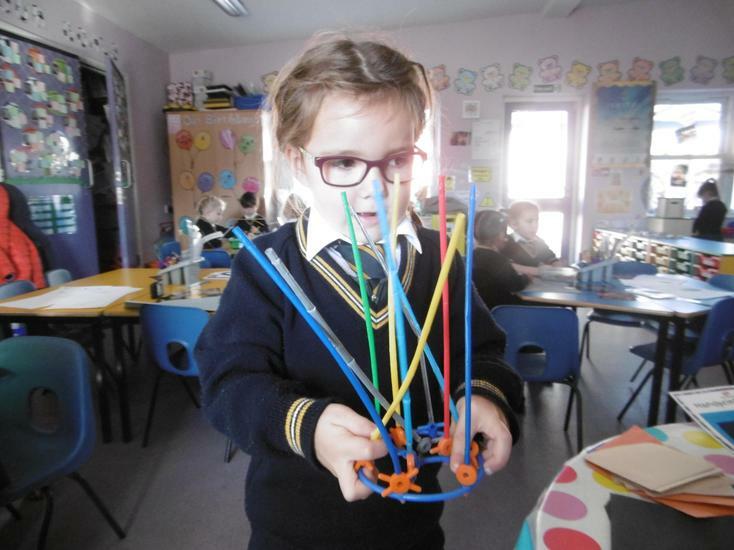 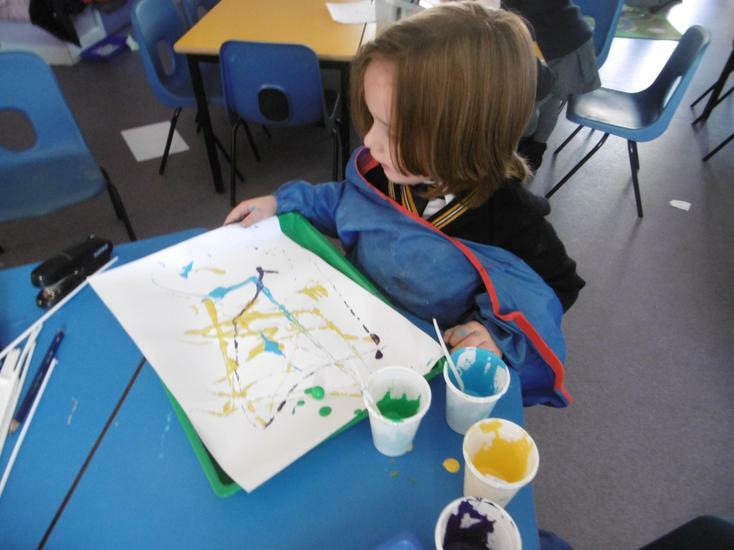 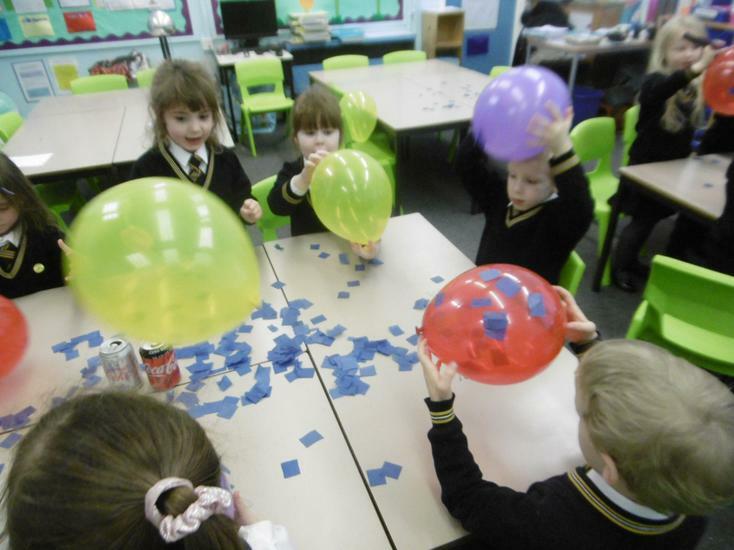 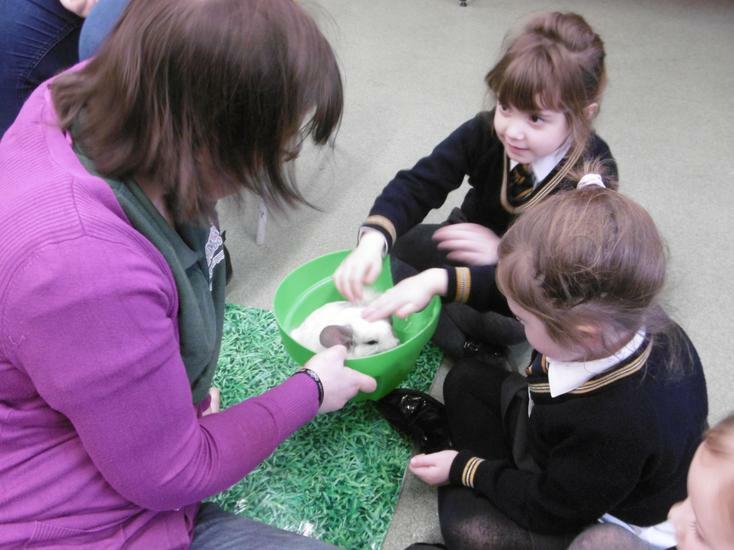 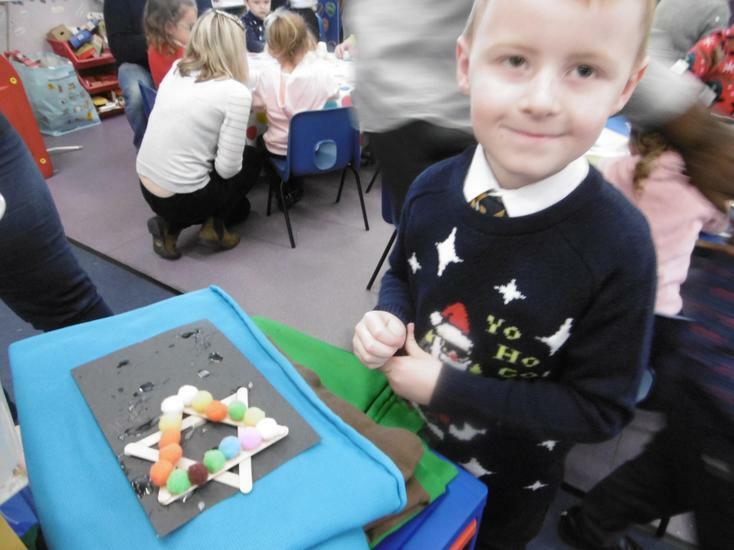 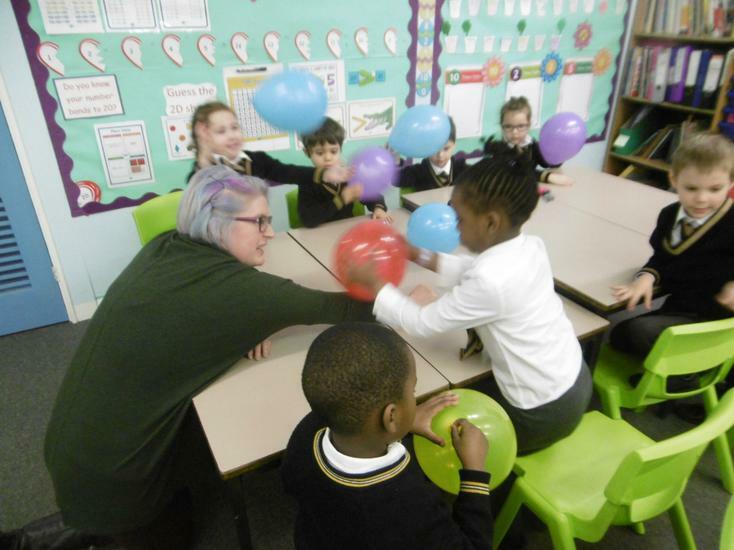 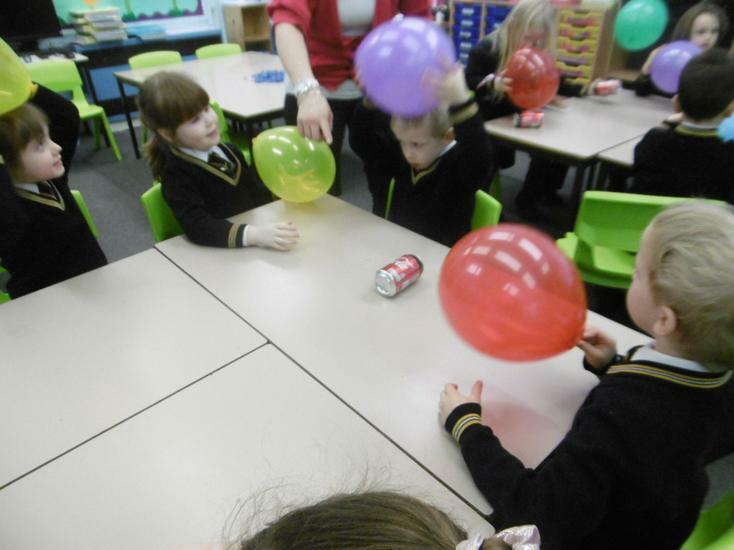 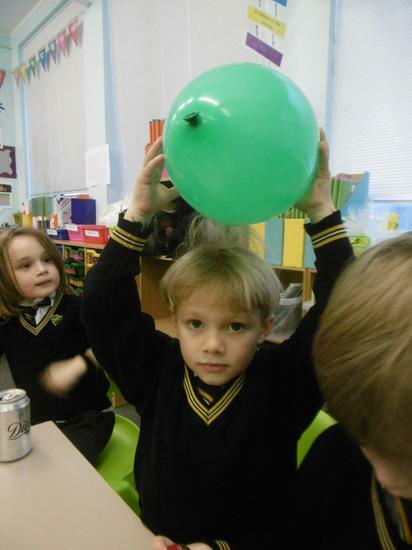 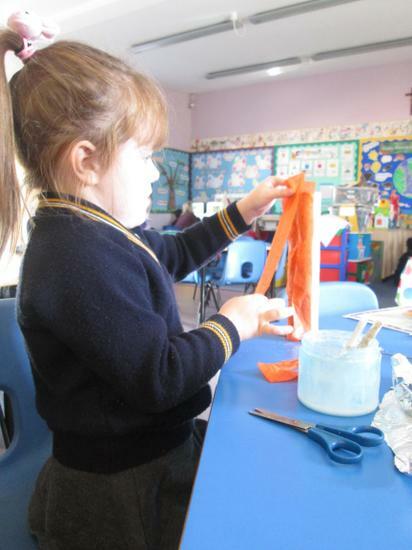 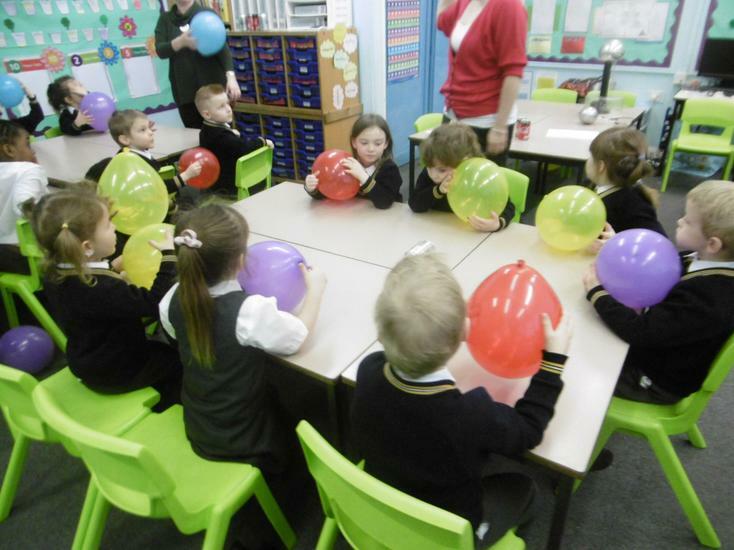 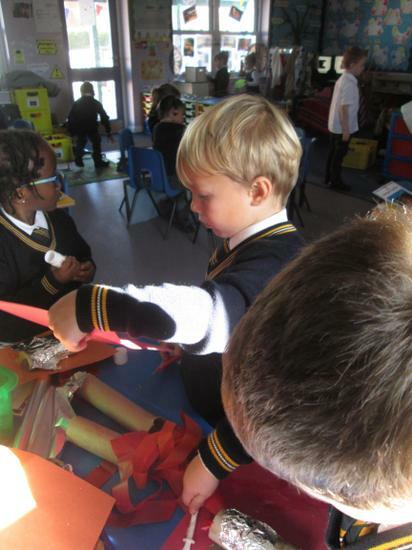 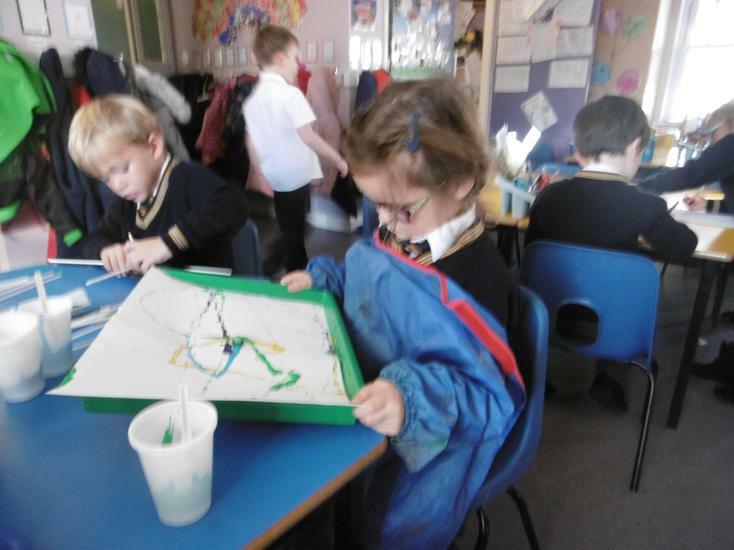 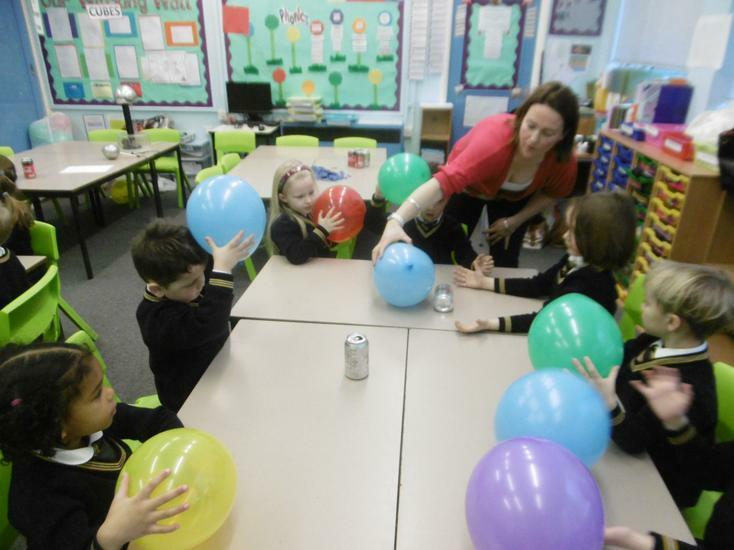 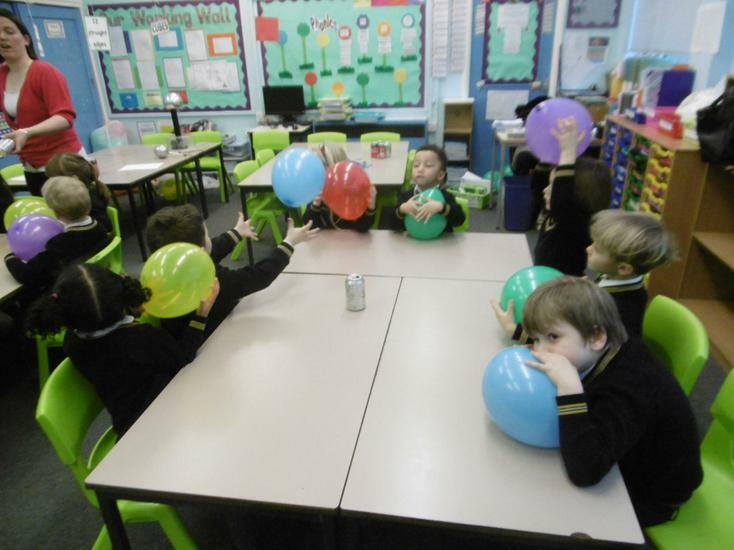 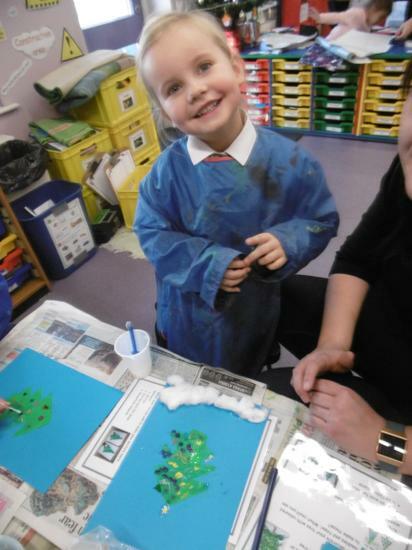 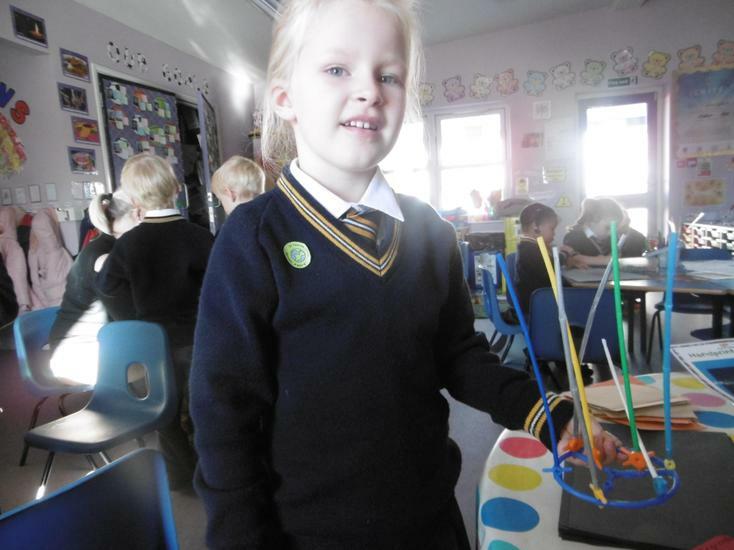 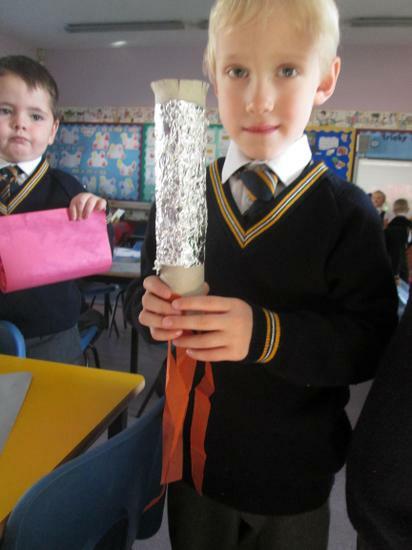 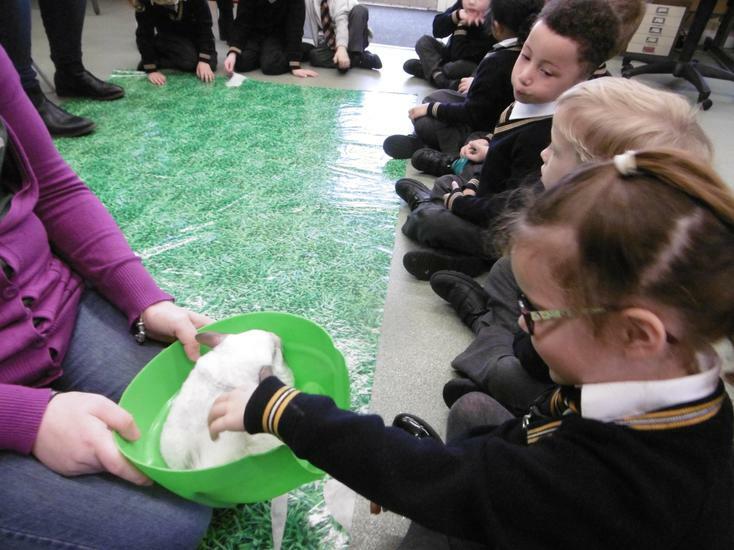 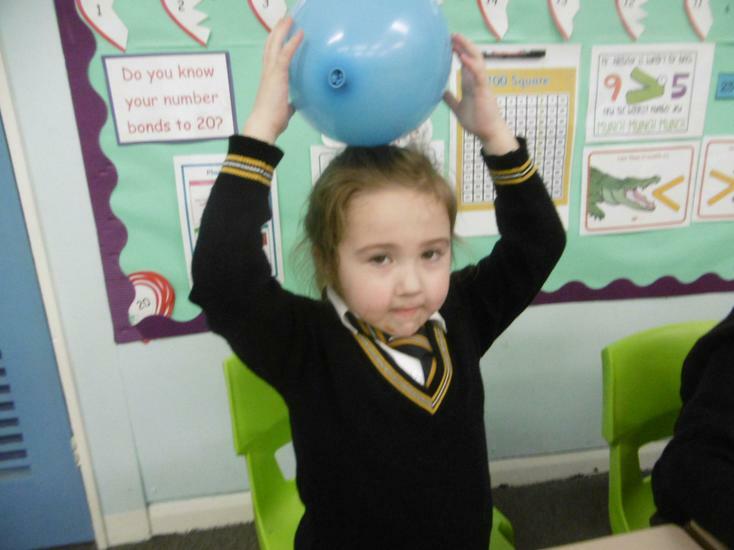 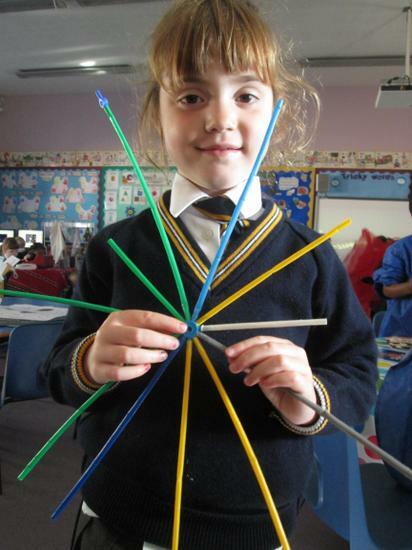 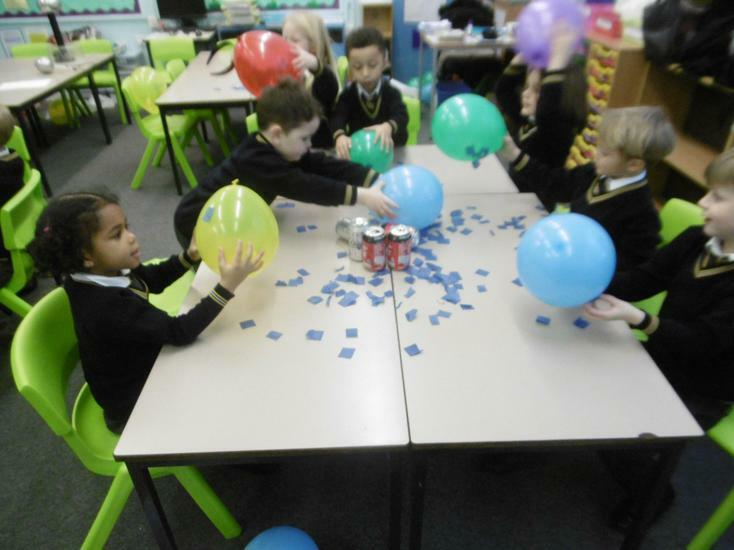 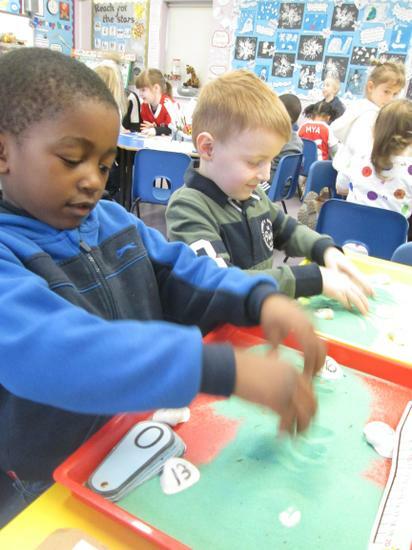 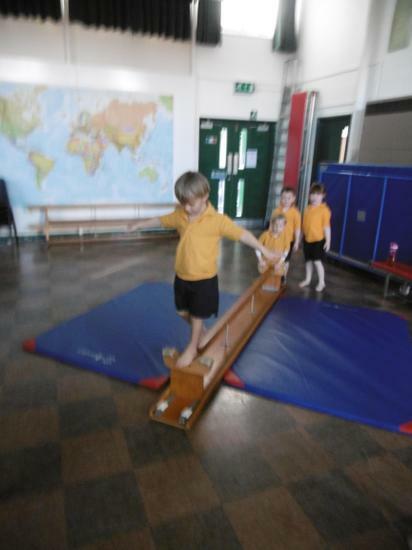 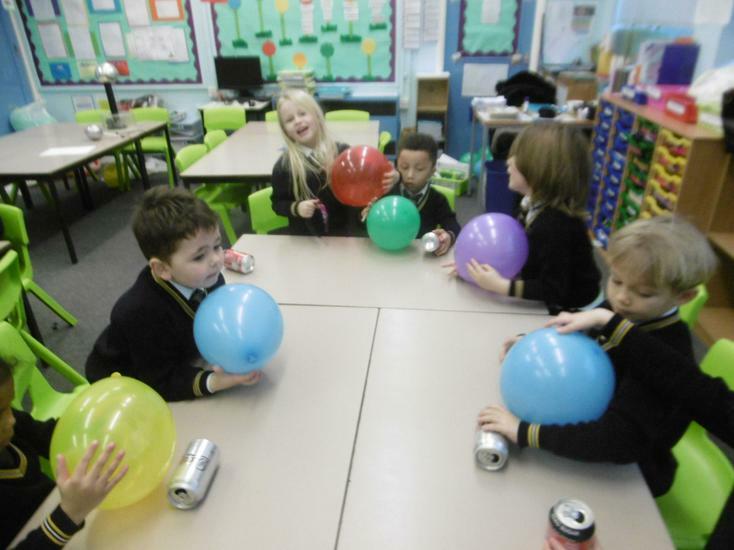 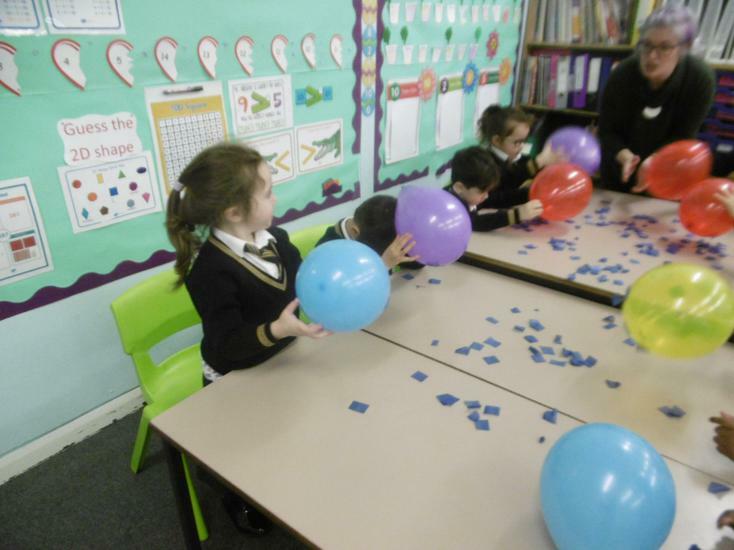 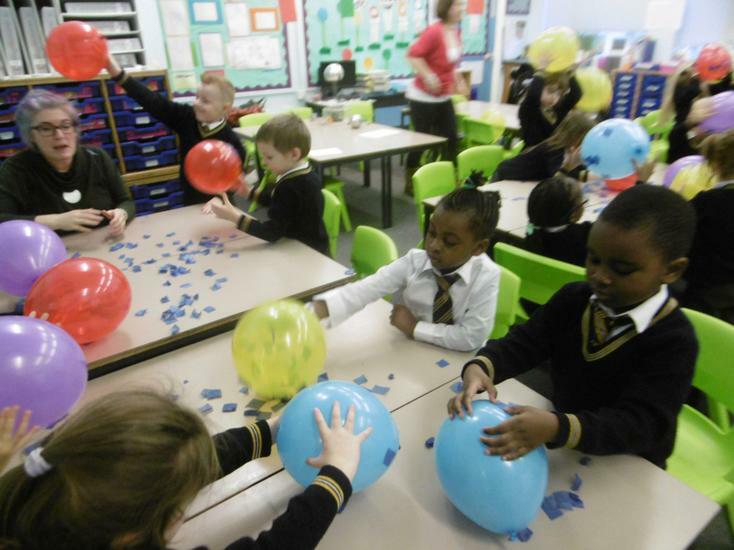 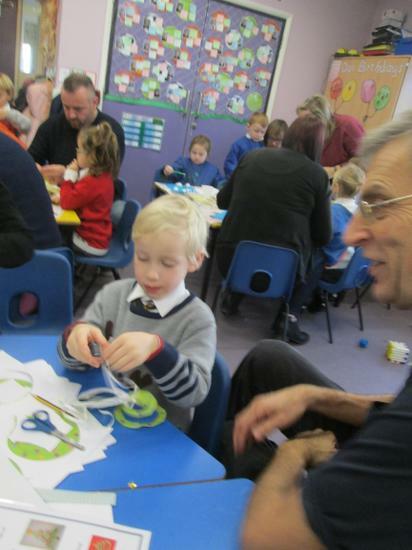 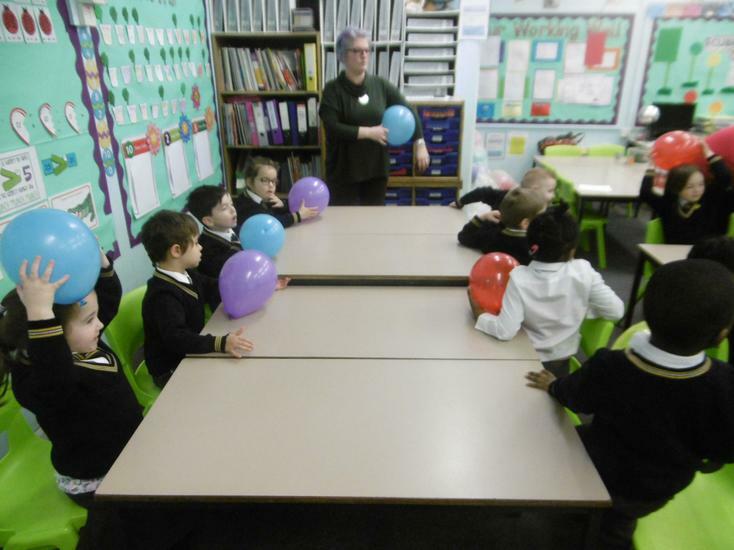 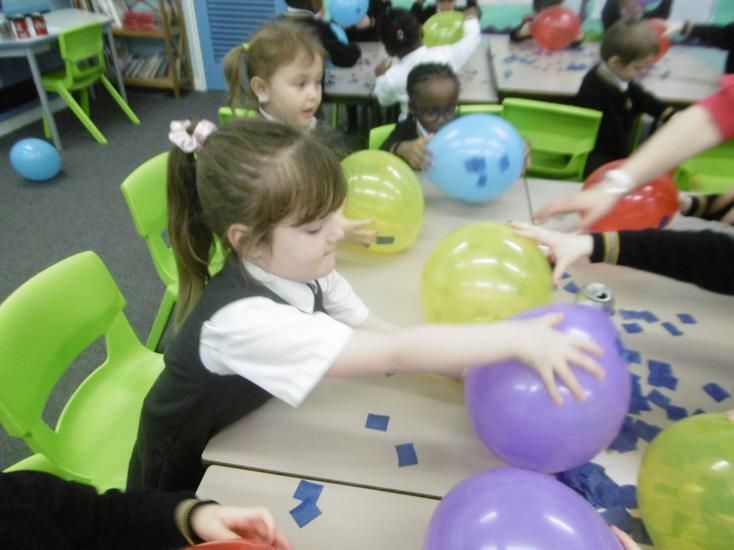 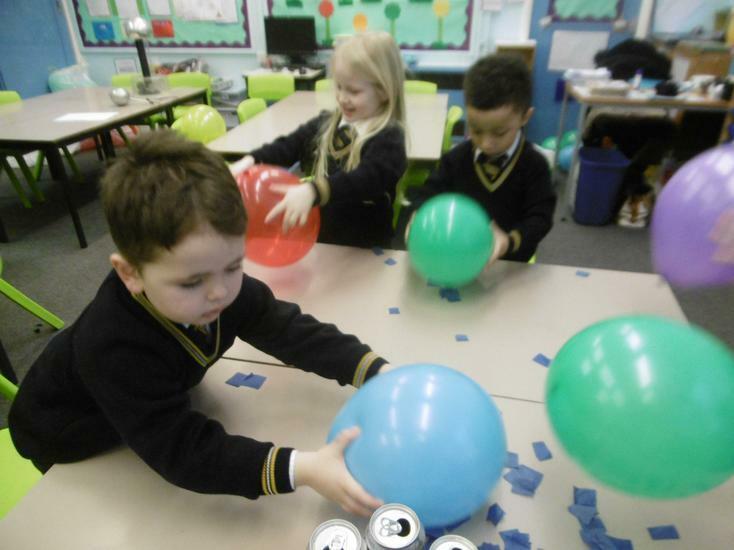 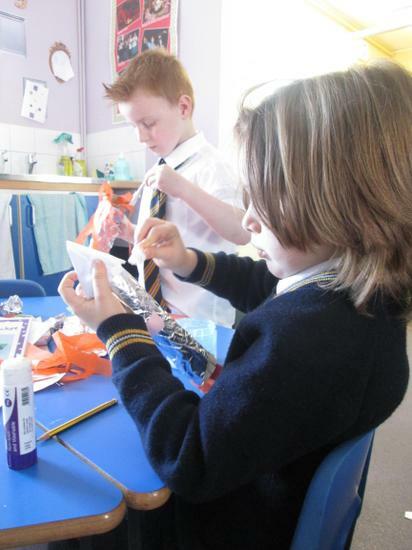 The children in Rainbows had a fantastic time at Science club this week. 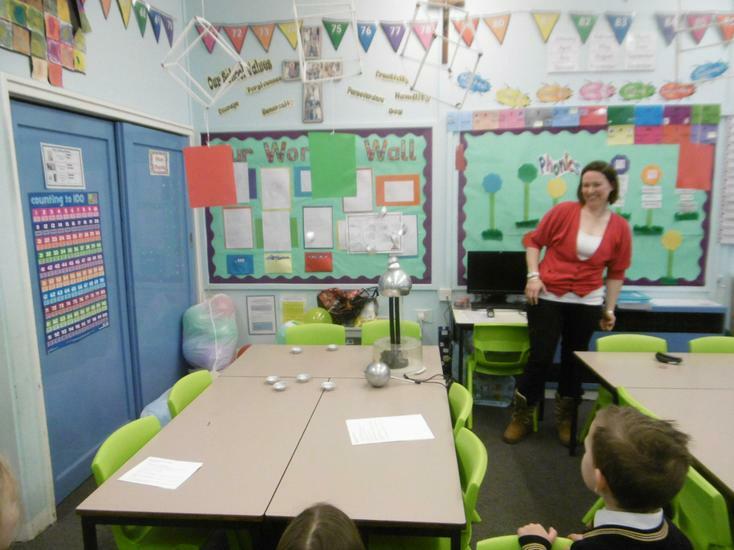 They took part in 3 experiments to do with Static Electricity and watched a demo of a Van de Graff with impressive results! 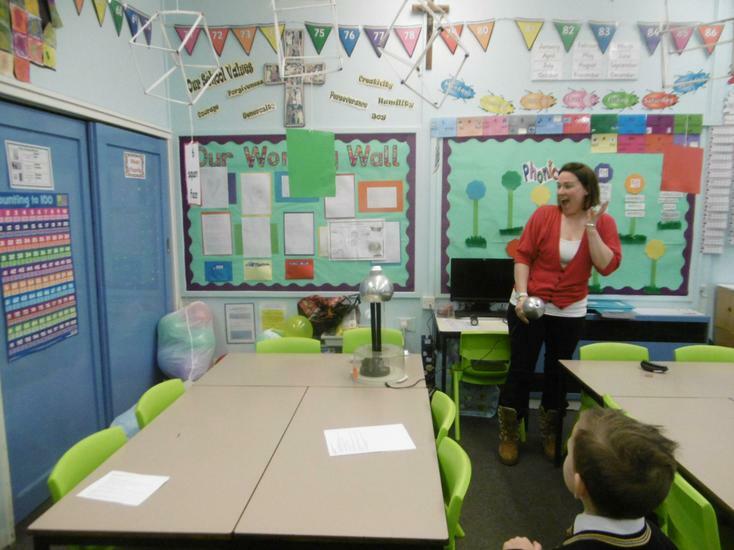 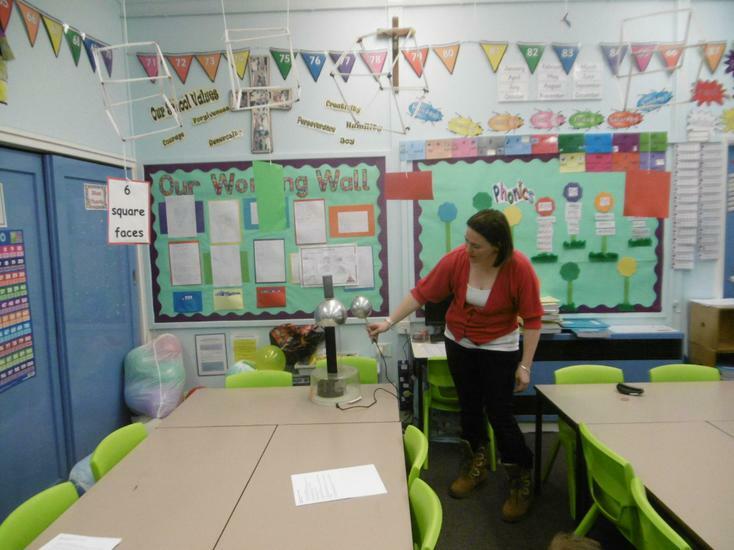 A big thank you to Mrs Anderson-Hurst & Mrs Candey for their time and love for Science. 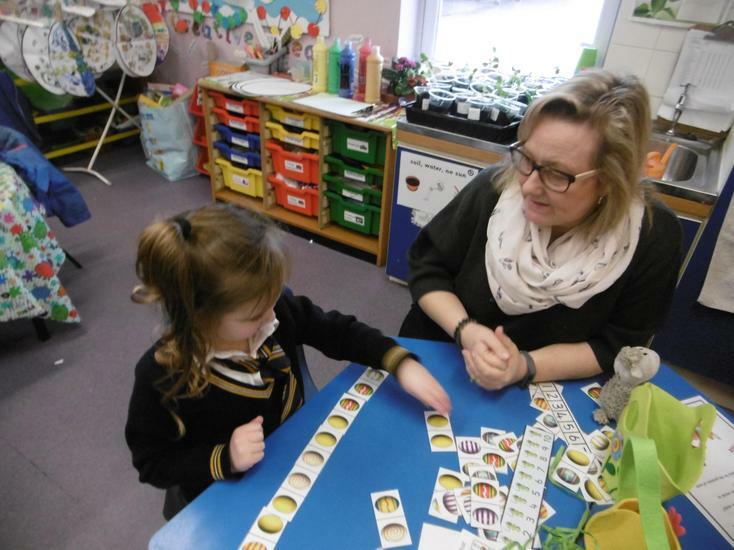 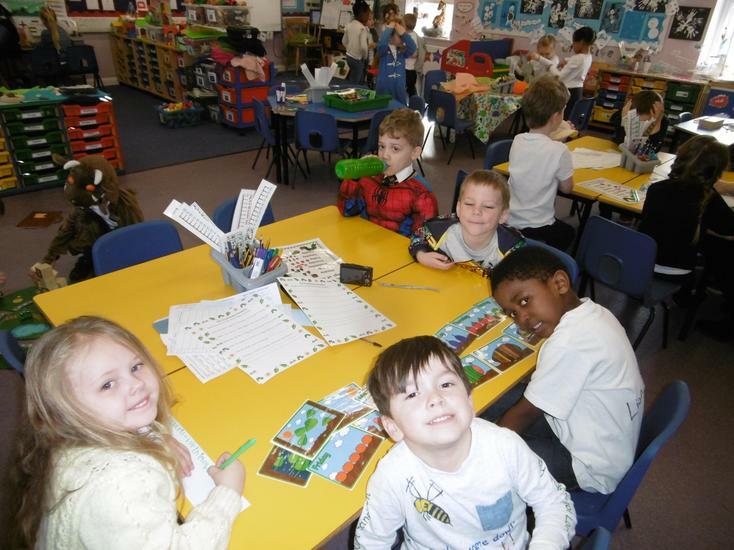 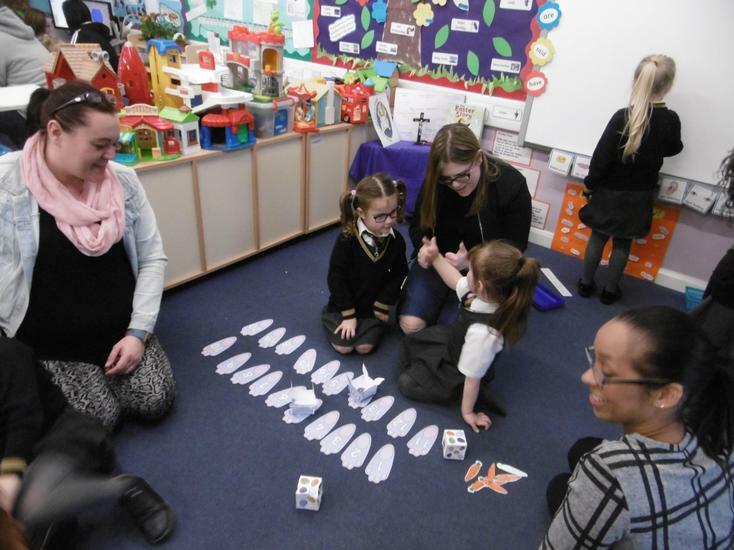 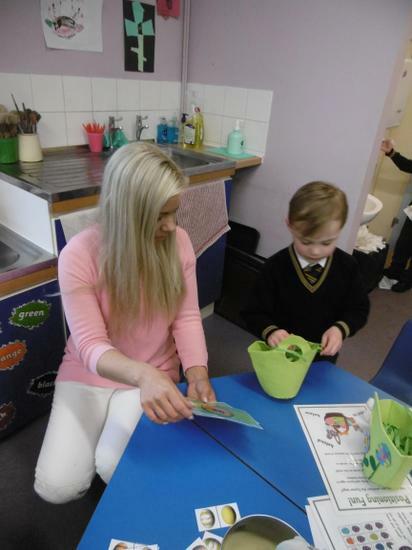 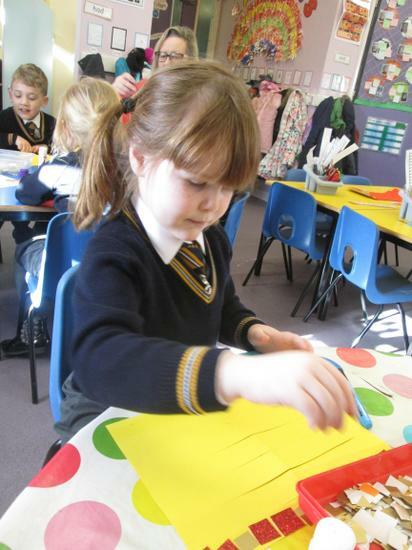 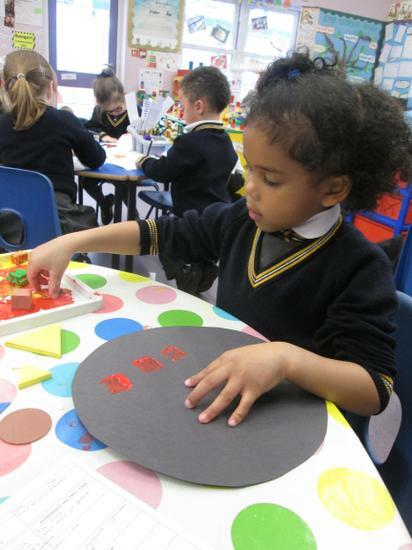 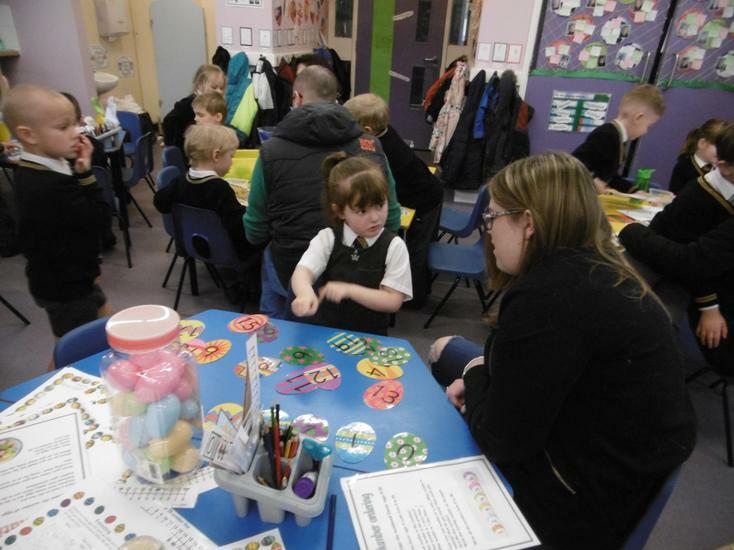 The Rainbow class took part in lots of number related activities on Friday as part of number day and to raise awareness for the NSPCC. 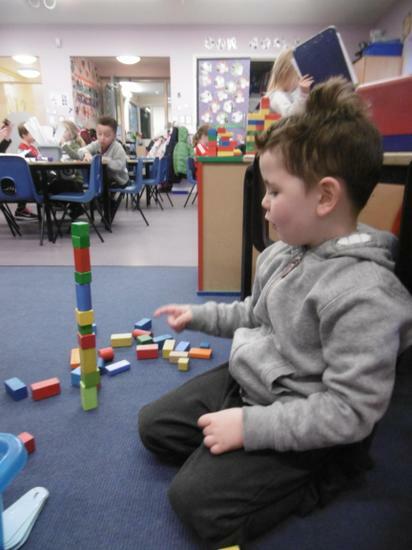 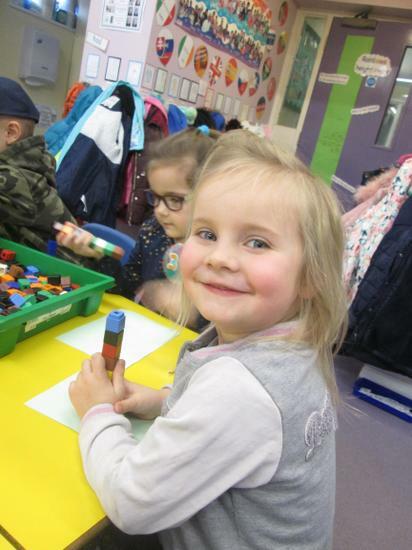 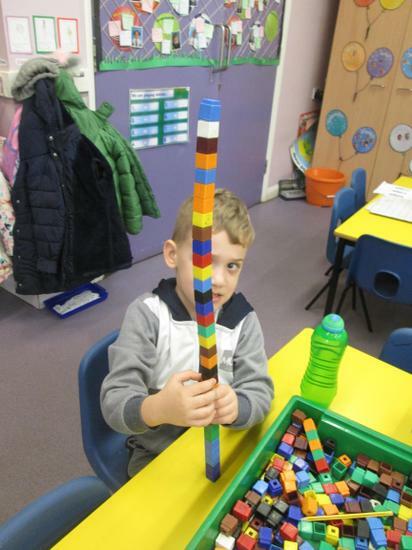 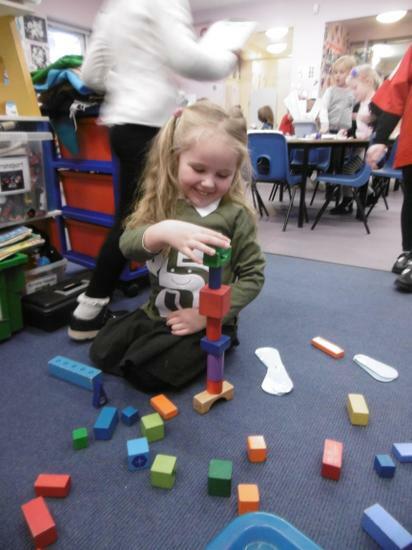 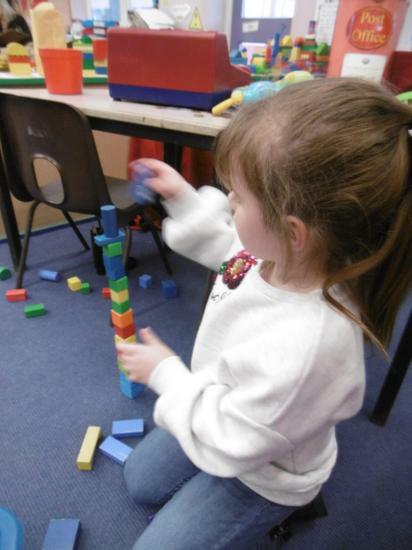 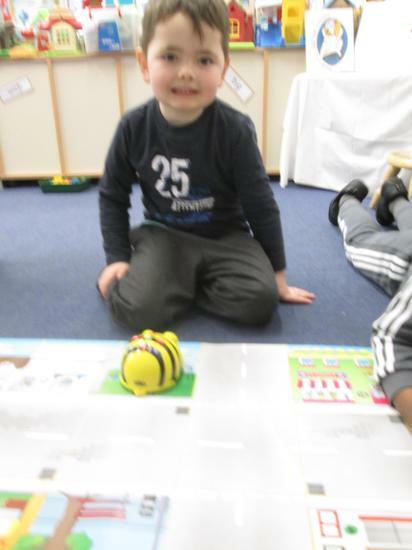 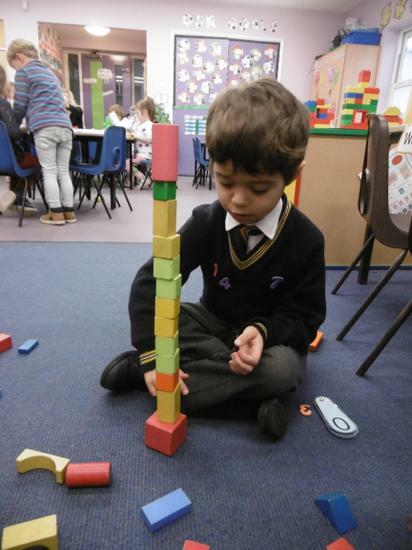 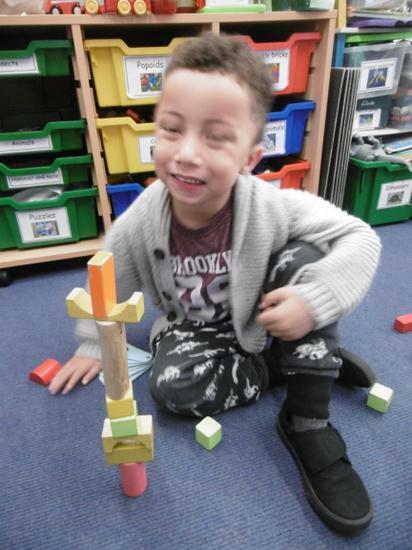 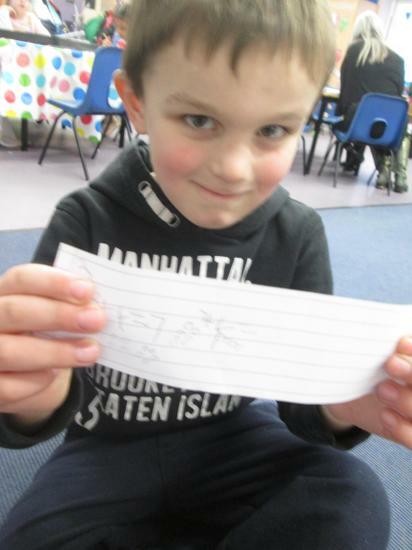 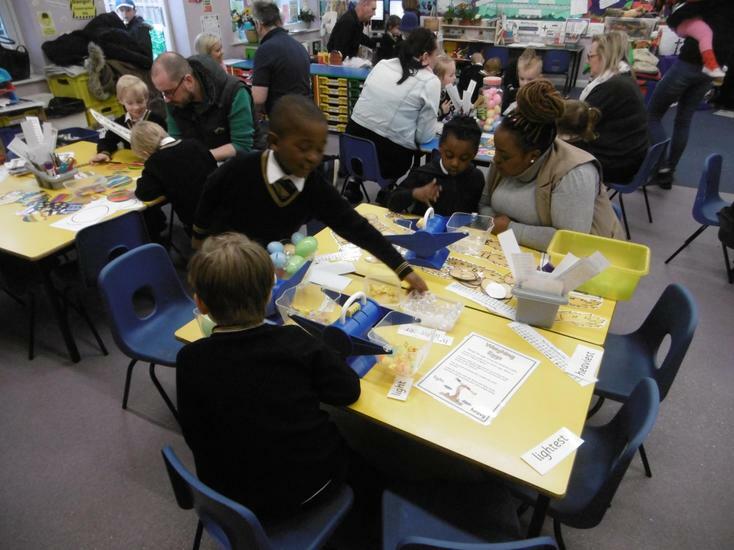 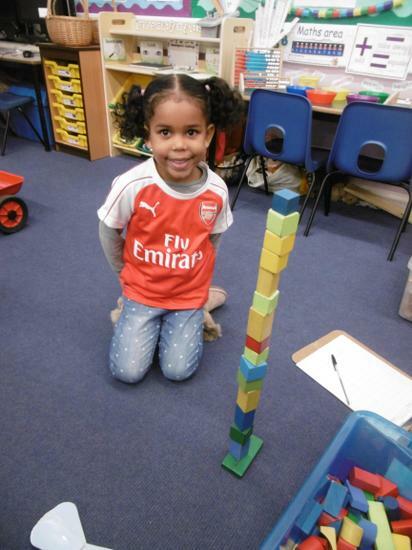 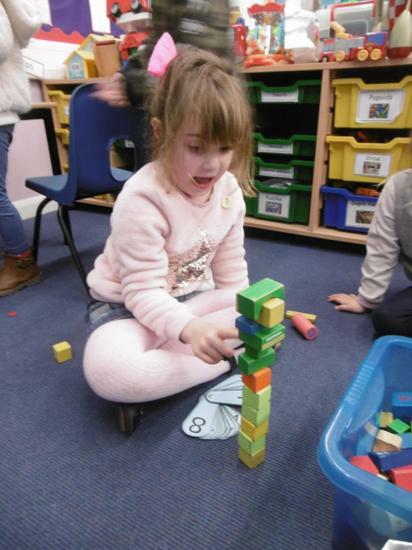 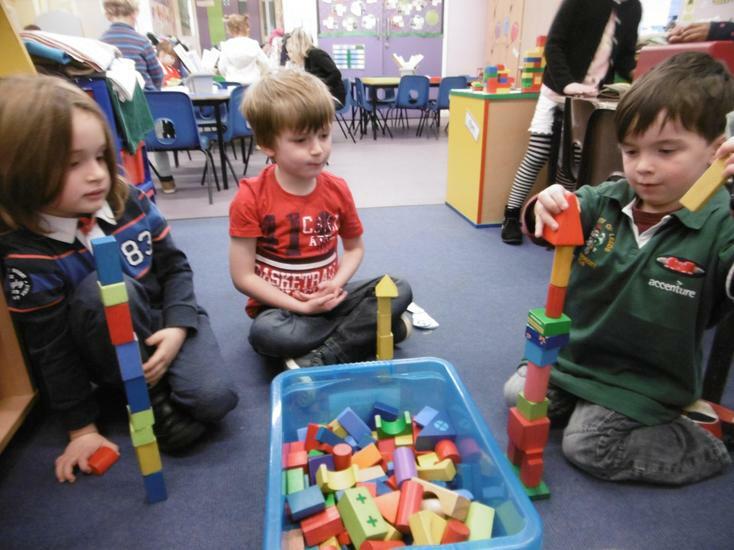 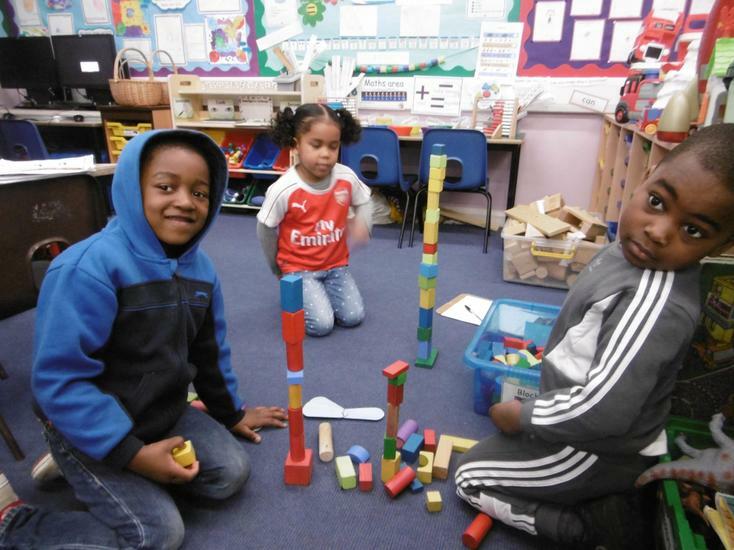 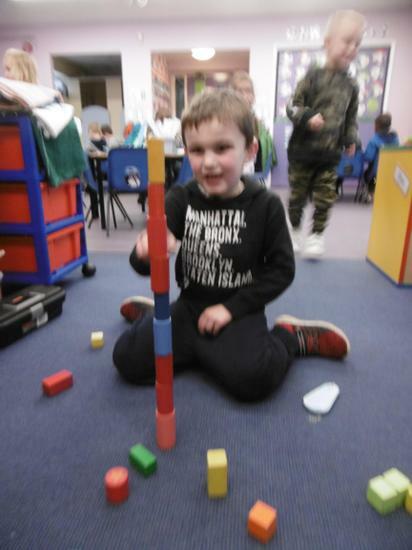 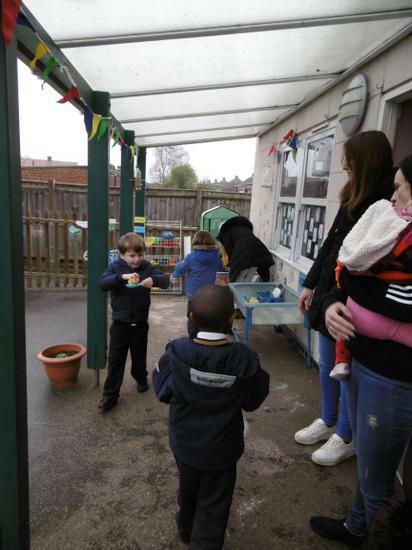 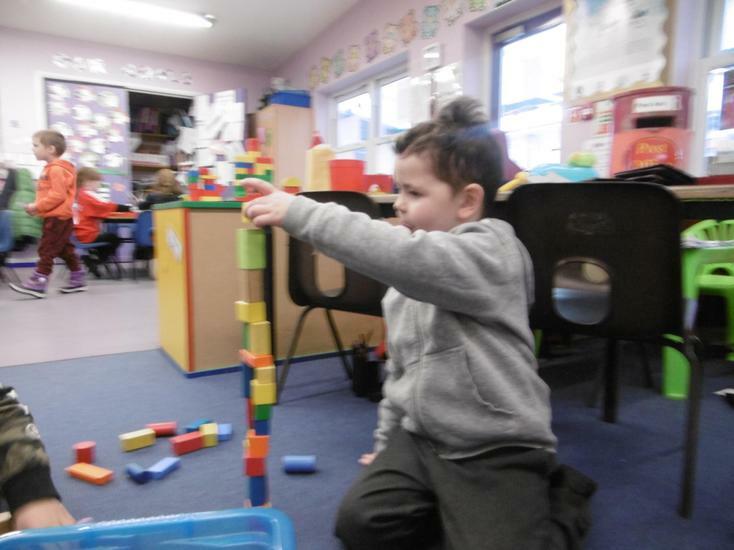 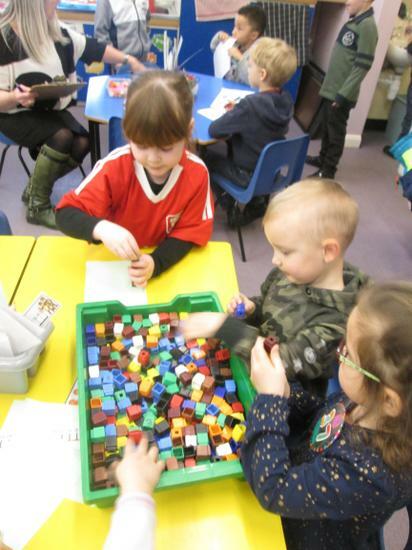 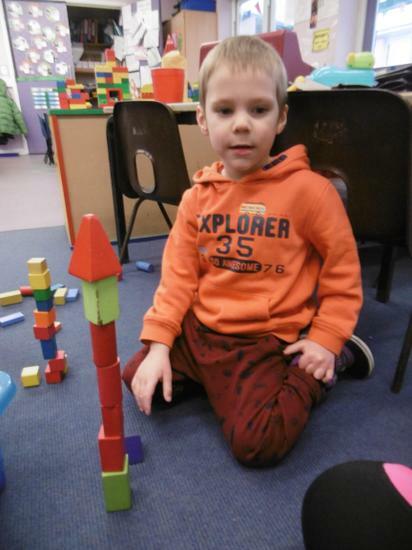 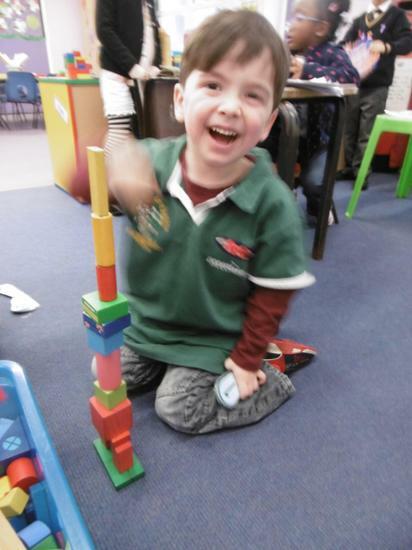 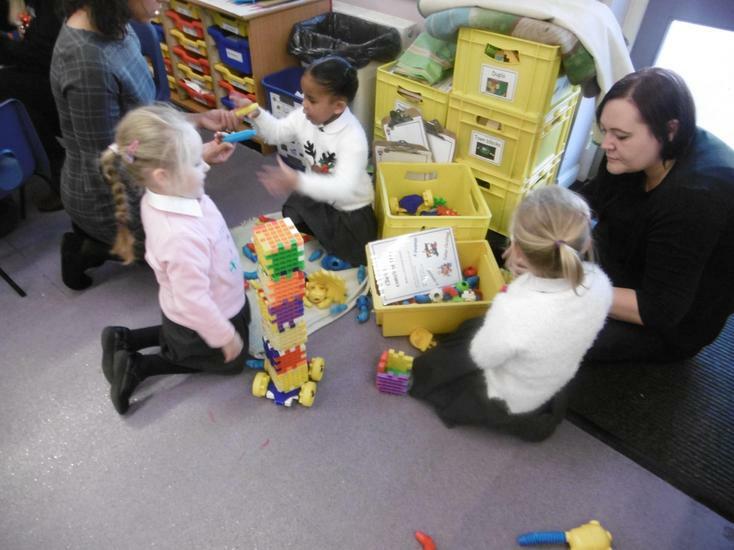 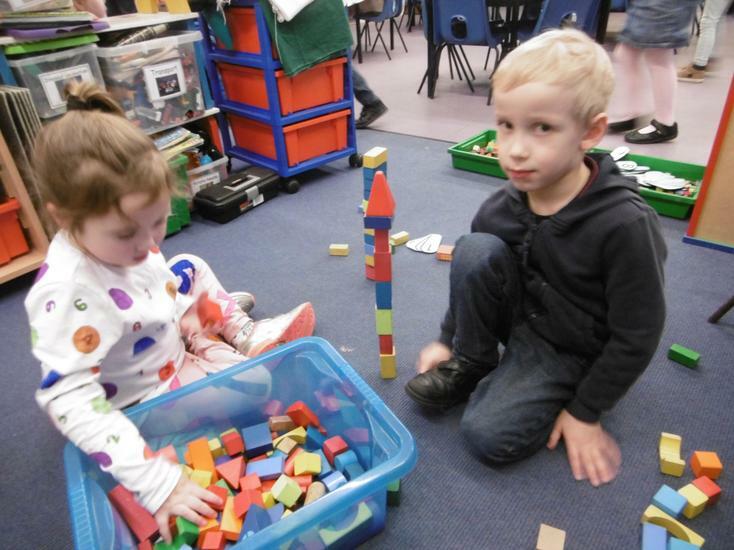 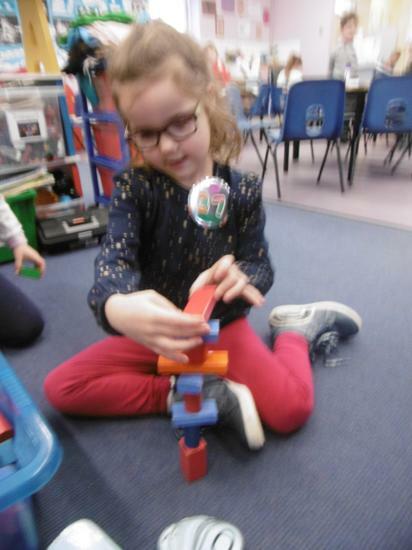 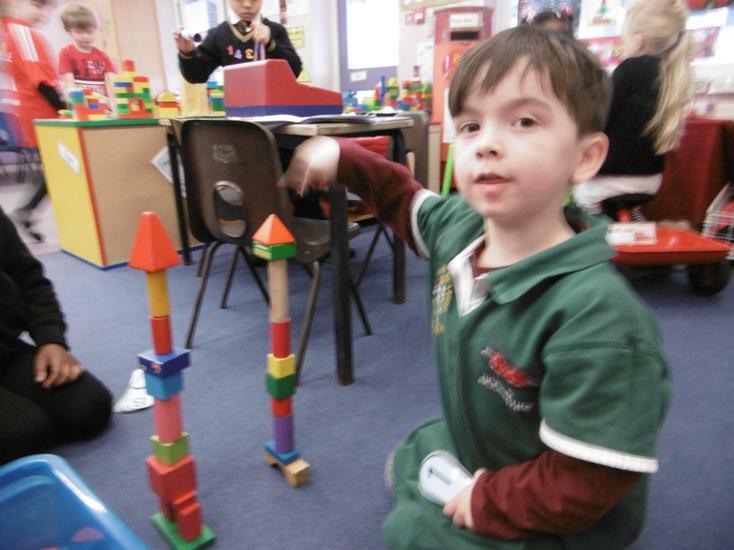 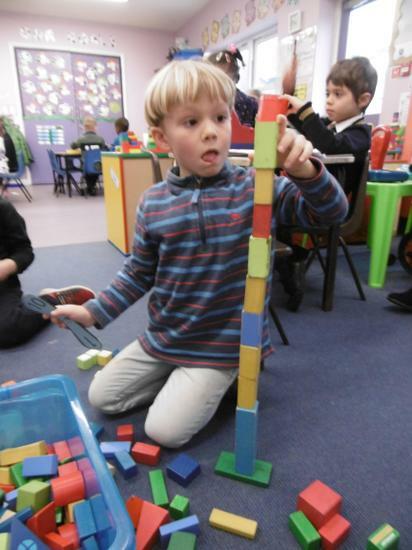 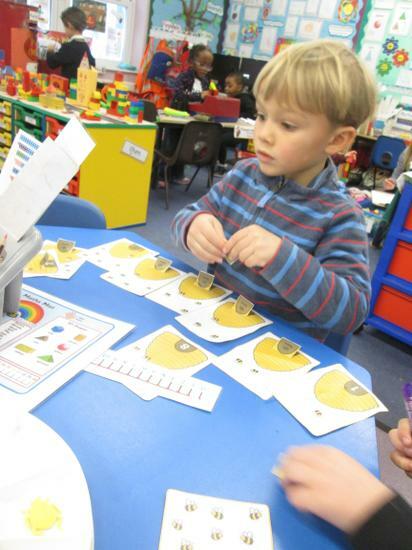 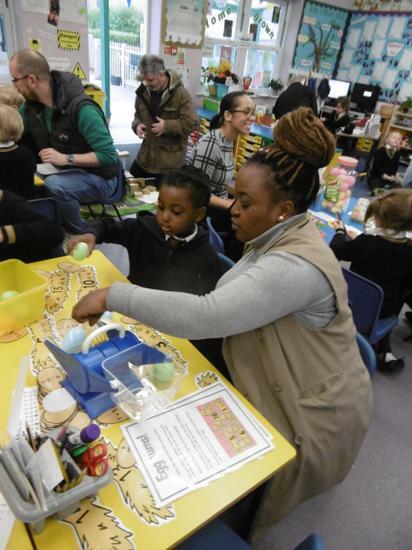 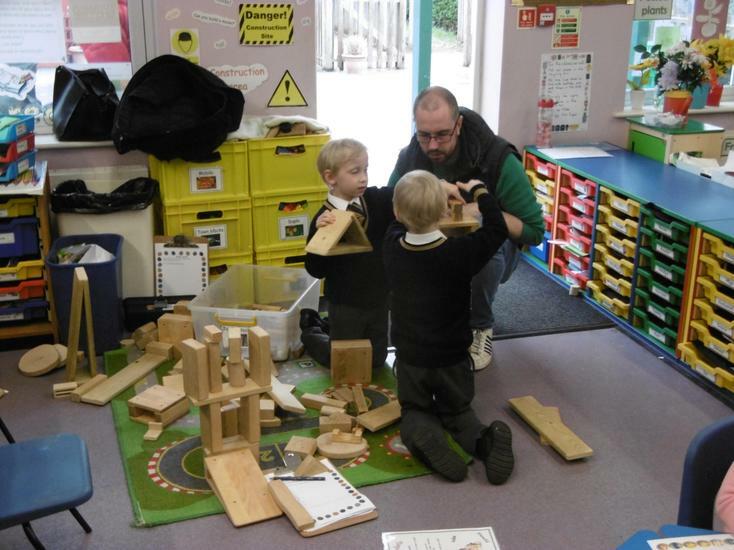 The children enjoyed lots of activities, with a focus on estimation including estimating how many bees were in the bee hive, building towers with cubes and assessing how close their estimates were and who could build the tallest tower and programming the bee bots to move to different destinations. 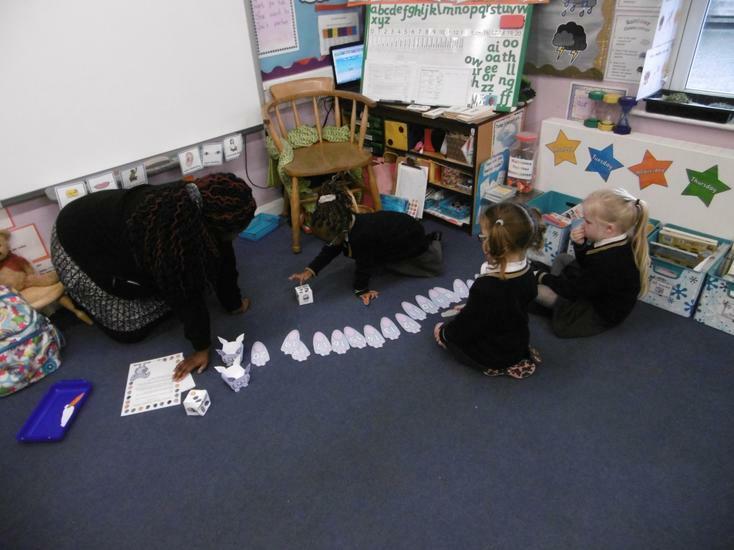 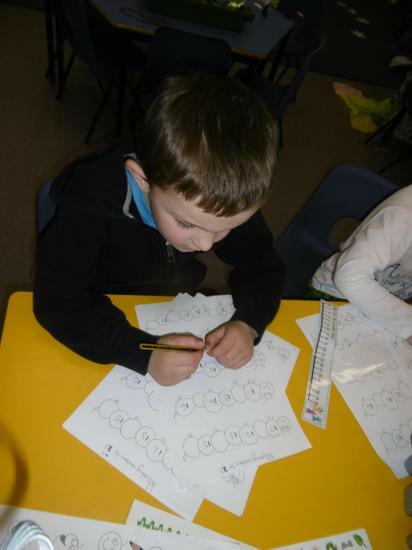 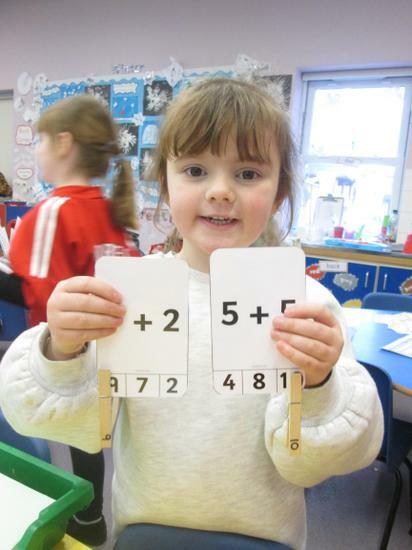 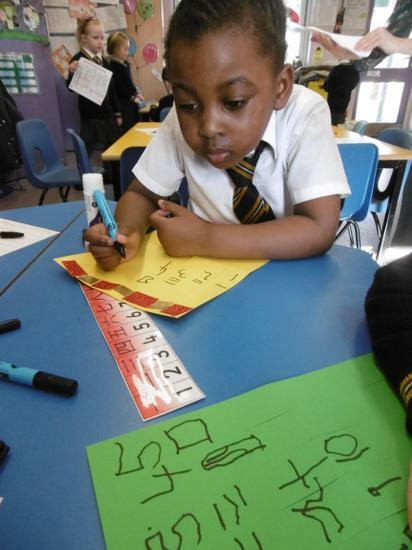 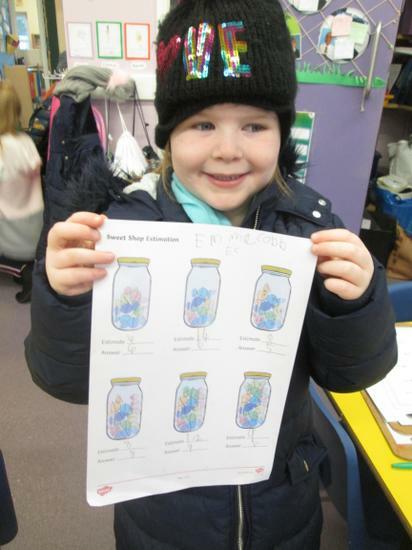 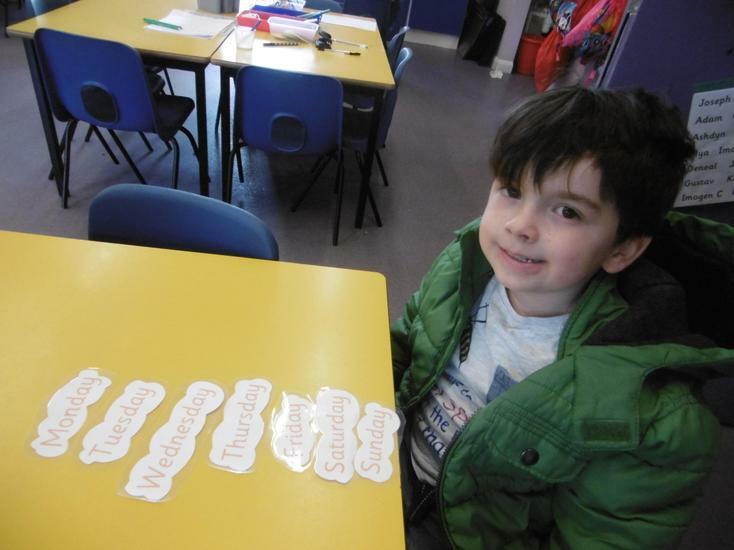 The children also challenged themselves to write and solve addition and takeaway sums, order numbers to 20, make repeating patterns and go on a number hunt in the classroom. 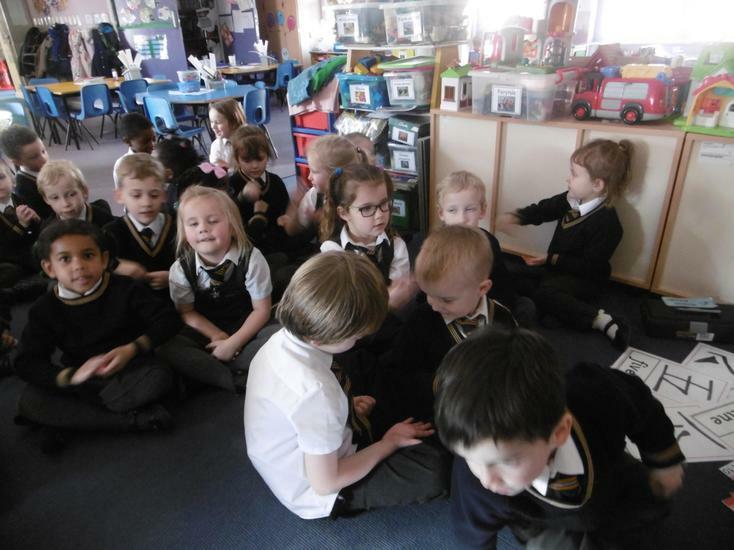 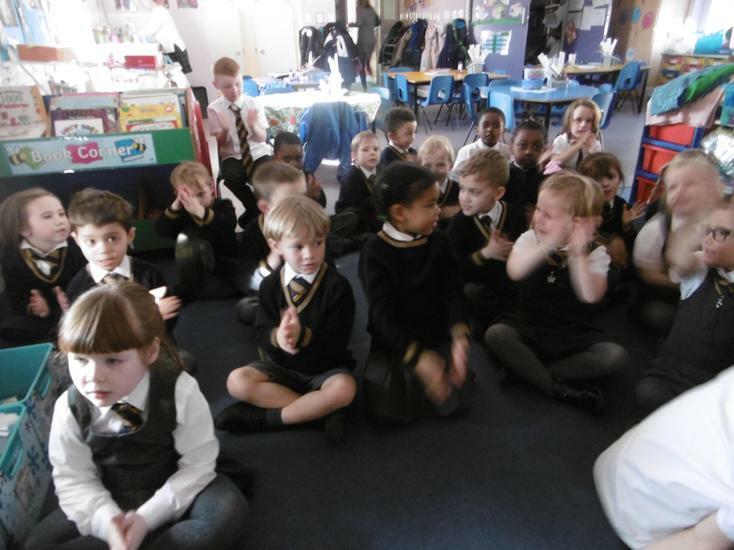 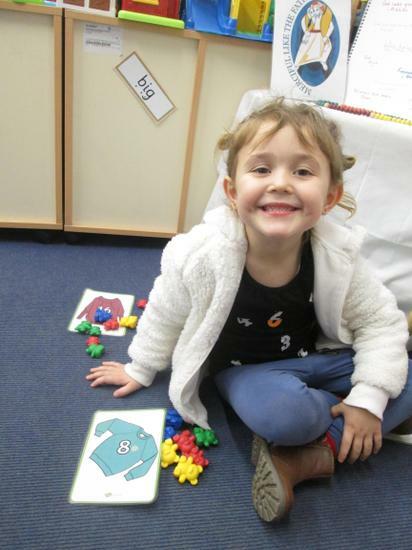 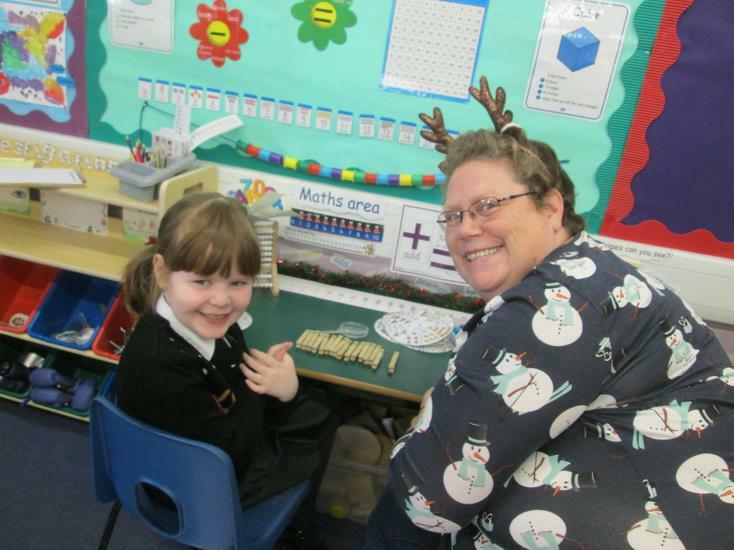 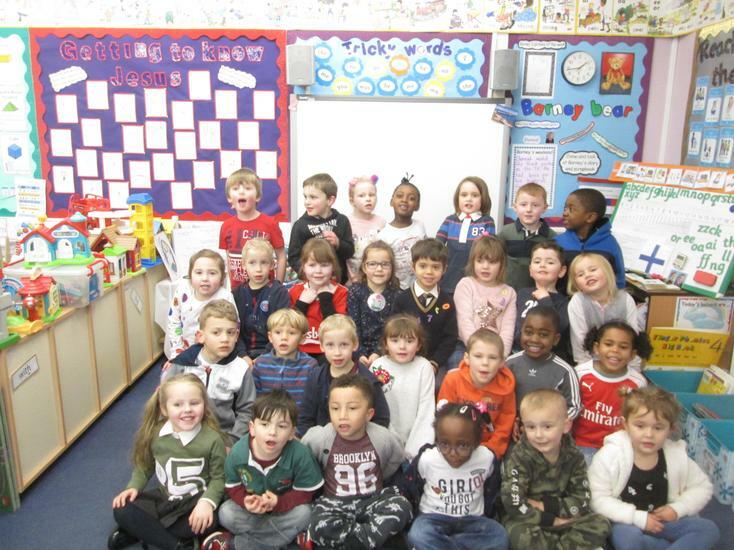 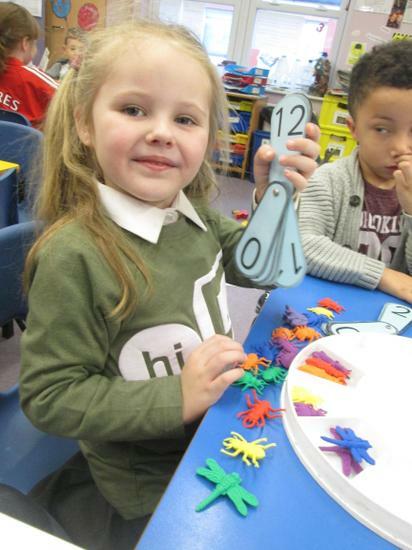 We did lots of practical and fun learning through our play for number day and enjoyed wearing our numbered clothes! 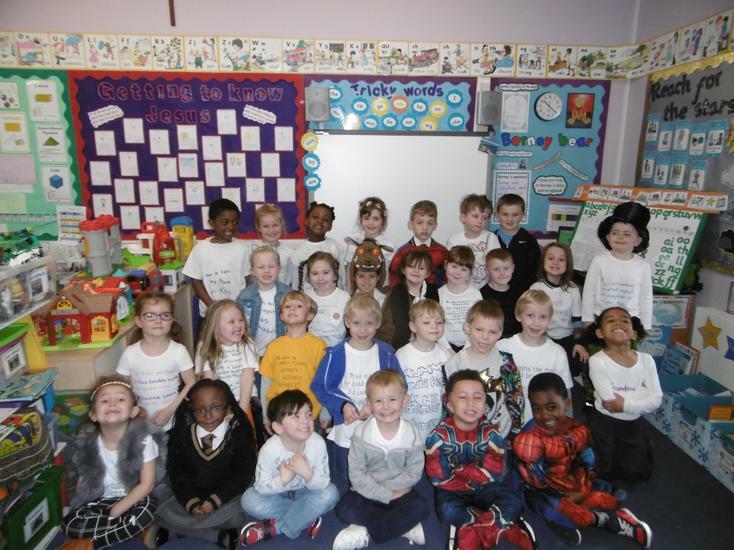 Thank you for your kind donations and sponsorship money for a very worthwhile charity. 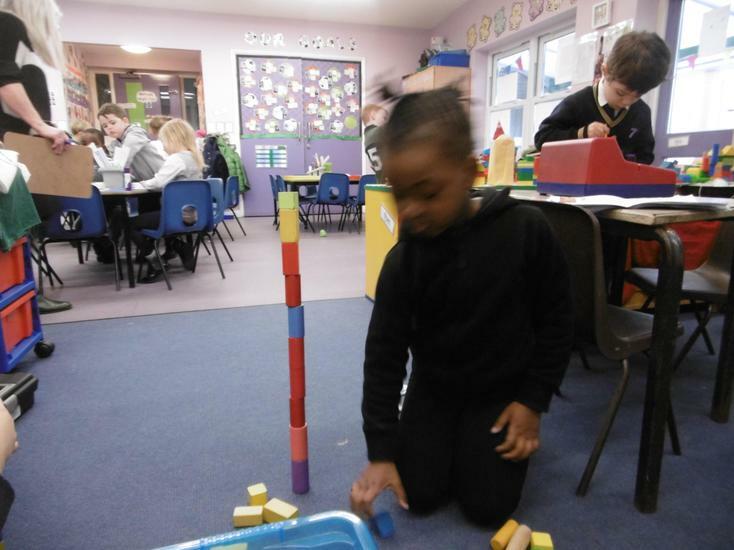 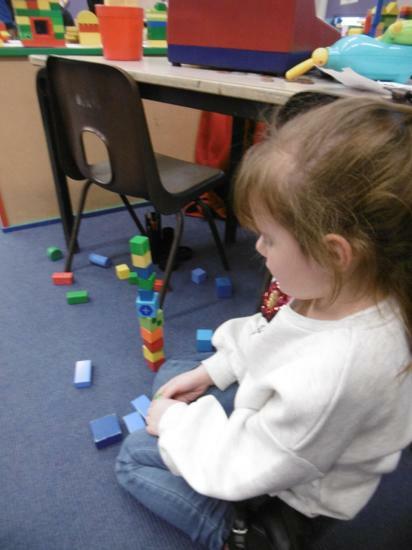 During Number Day, our class challenge was to use our problem solving skills to see who could build the tallest tower out of blocks. 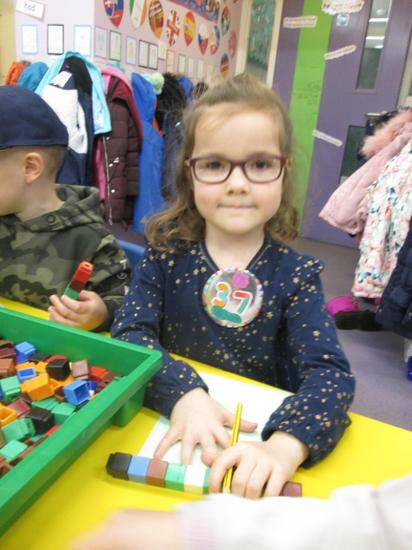 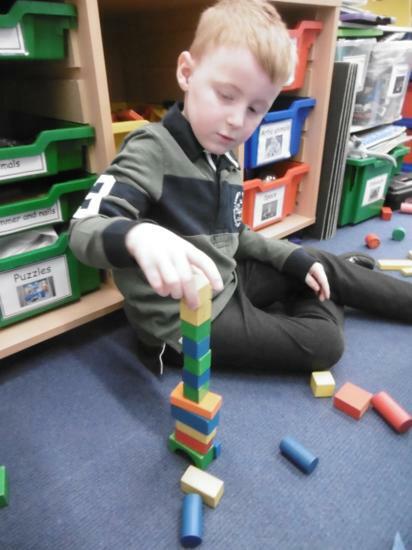 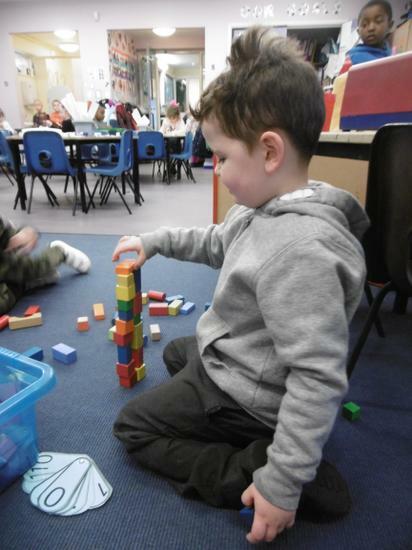 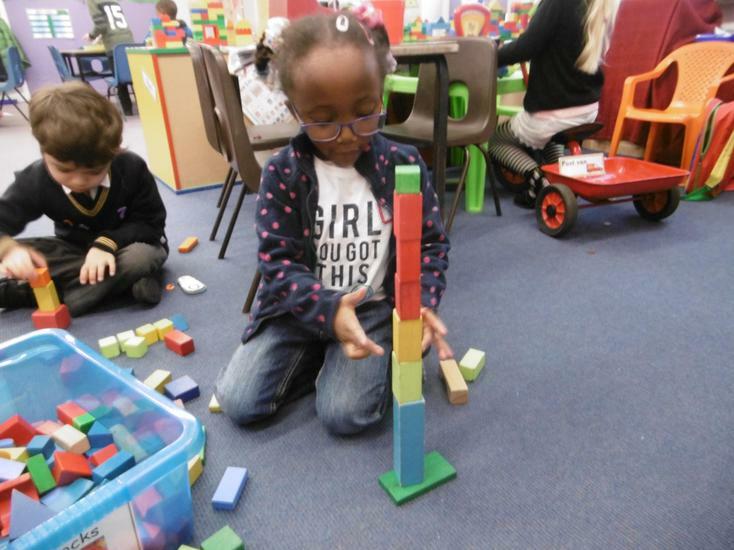 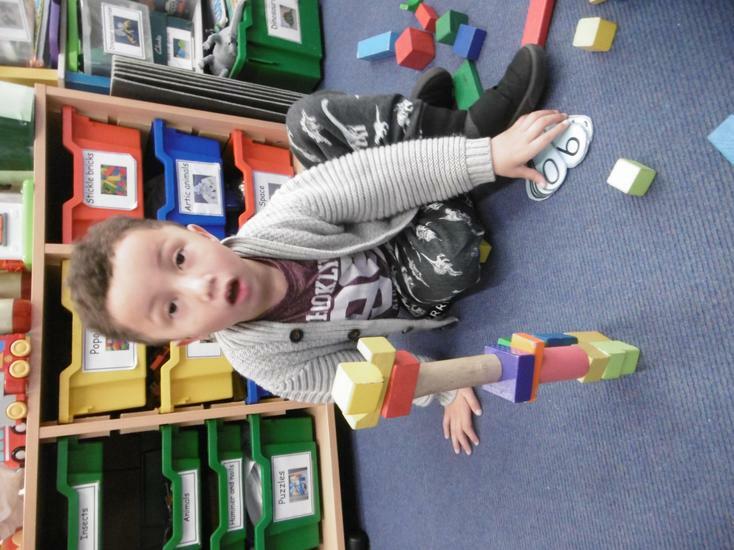 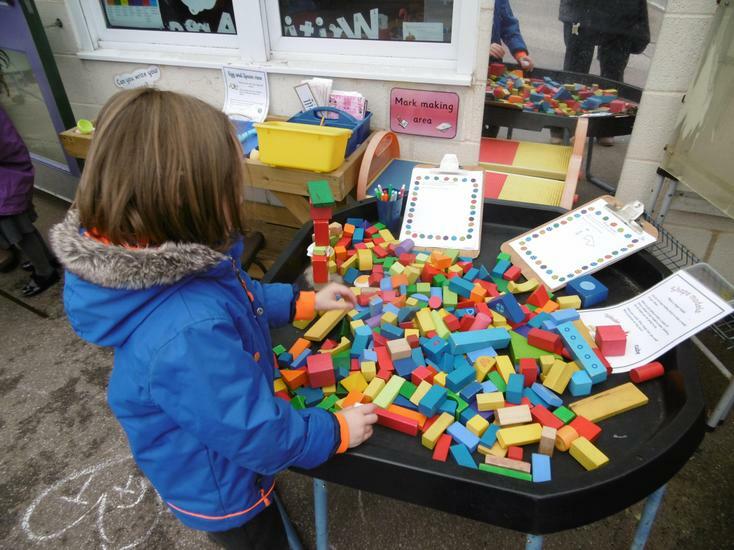 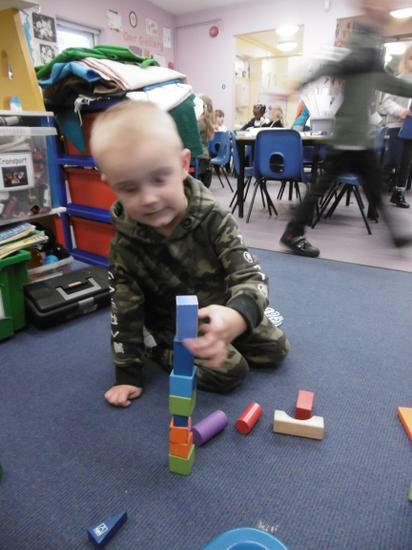 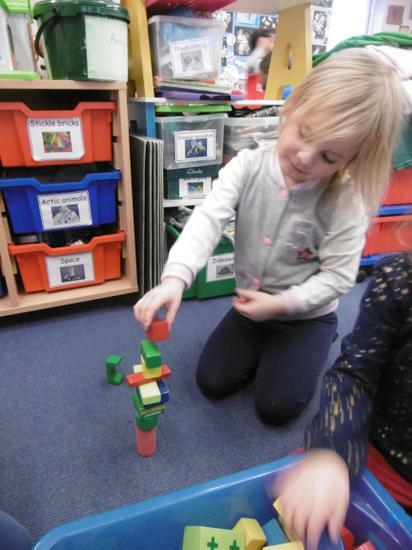 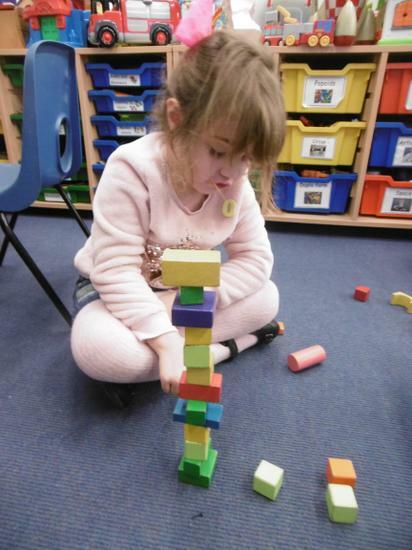 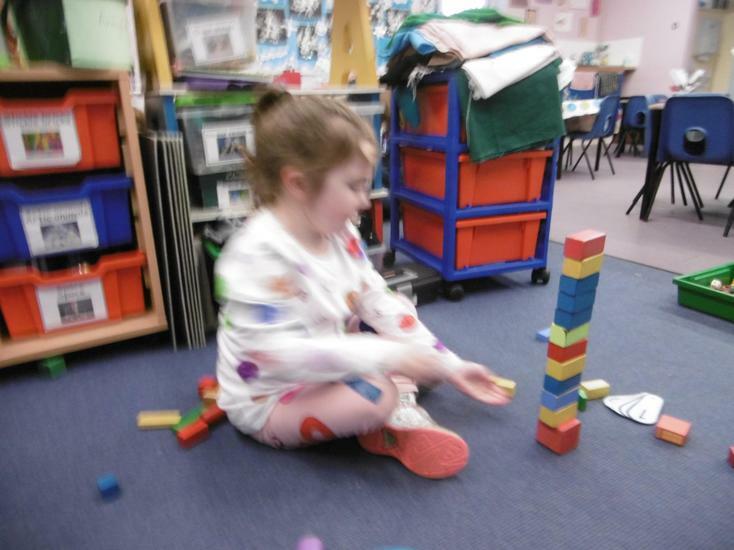 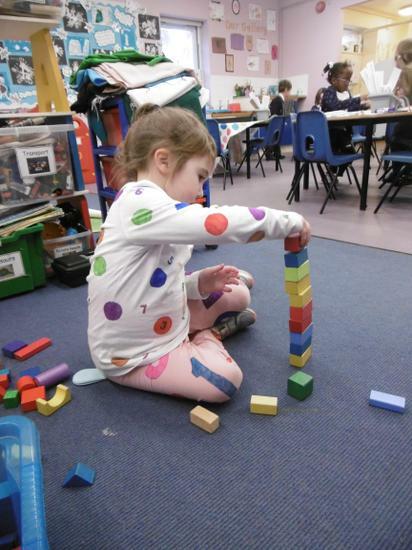 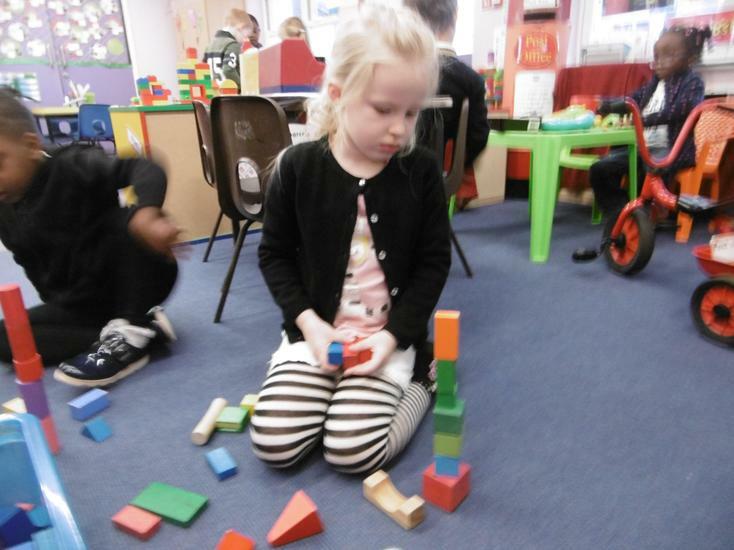 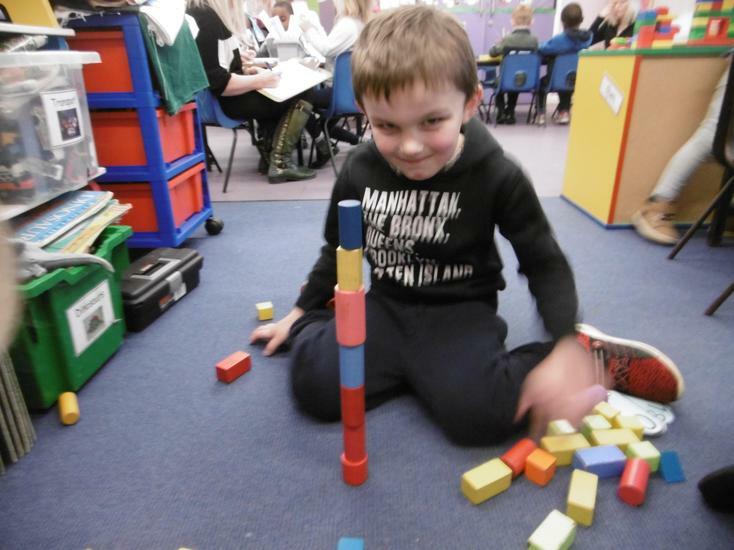 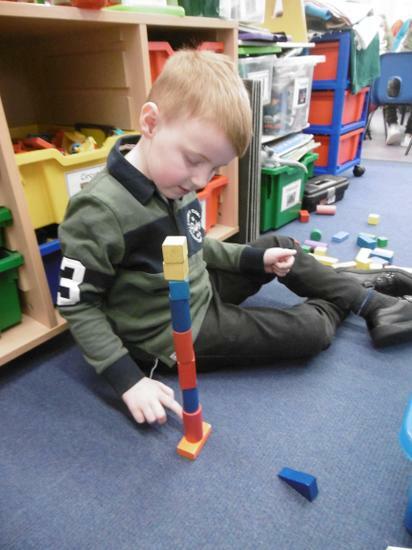 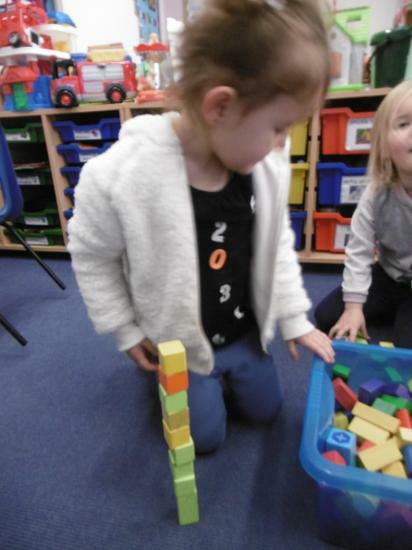 We had to work out which shape blocks were the best to use, carefully balancing them on top of one another using our fine motor skills, as well as estimating how many blocks we'd used and then counting and finding the matching number. 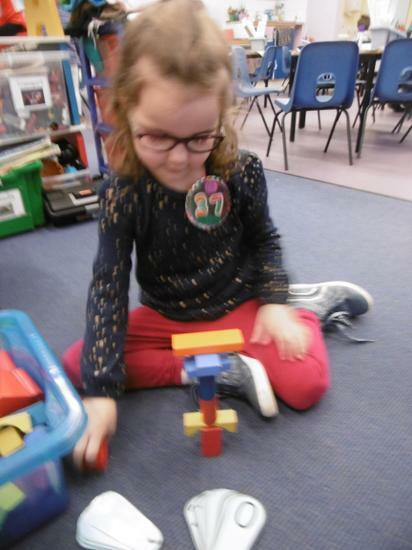 The tallest tower was built by Mya, using 16 blocks, but we all showed an amazing amount of motivation, perseverance and resilience especially as our towers fell over a lot! 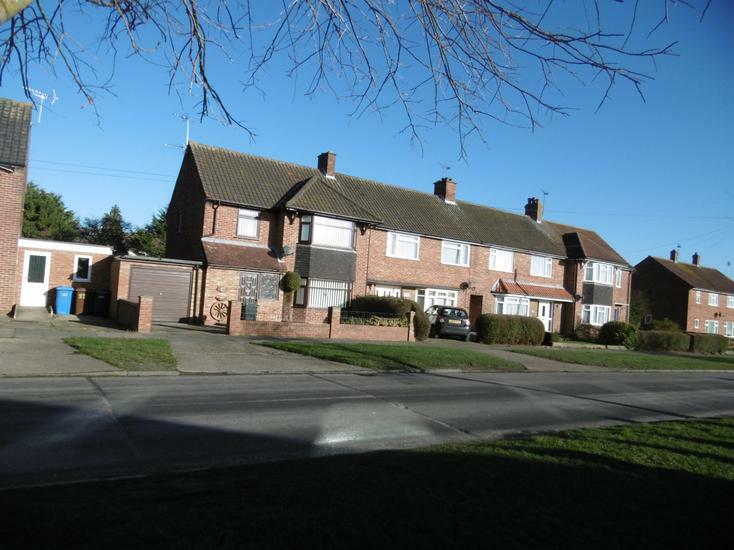 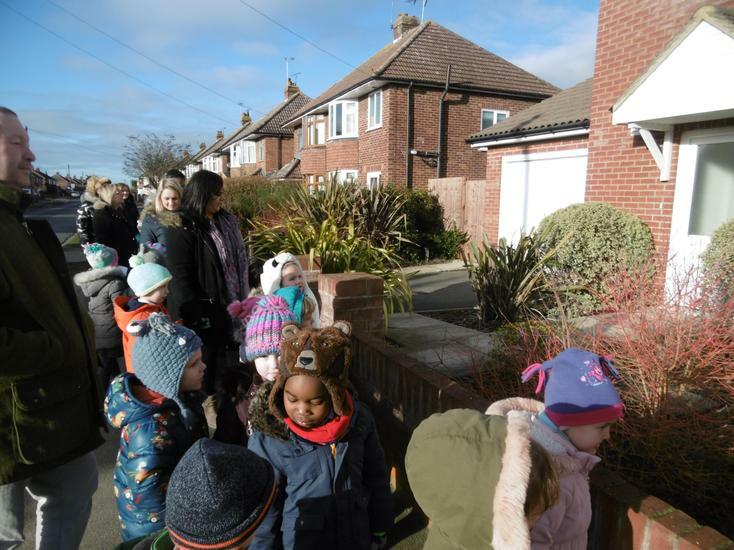 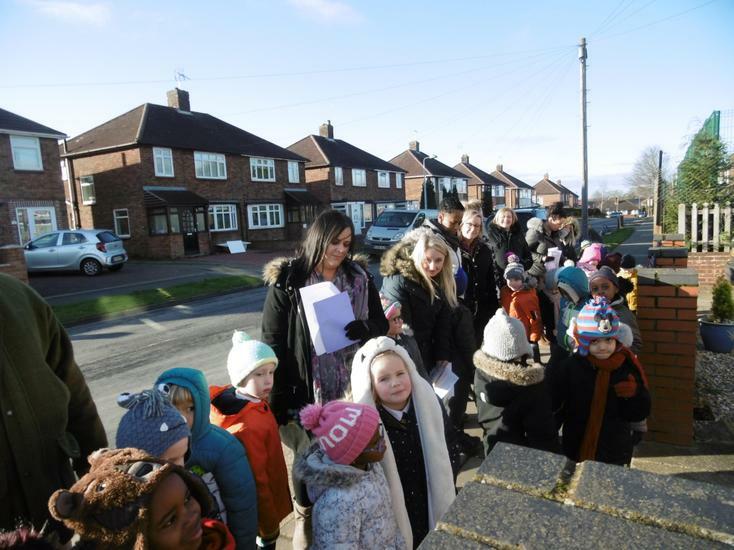 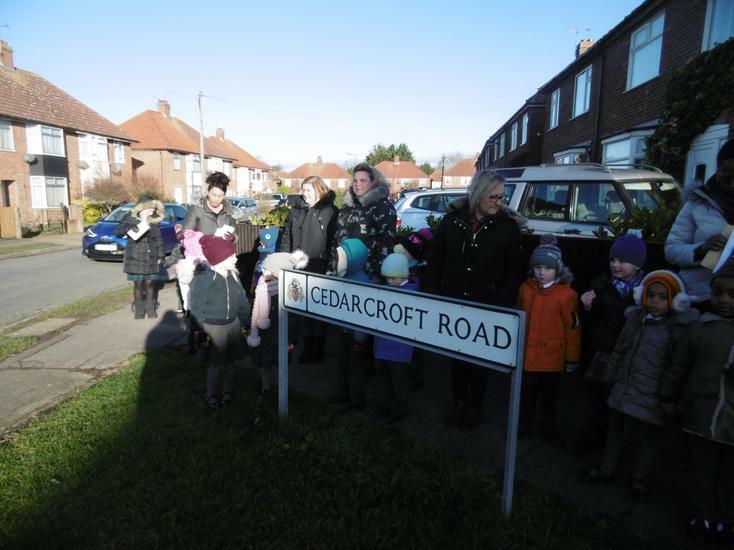 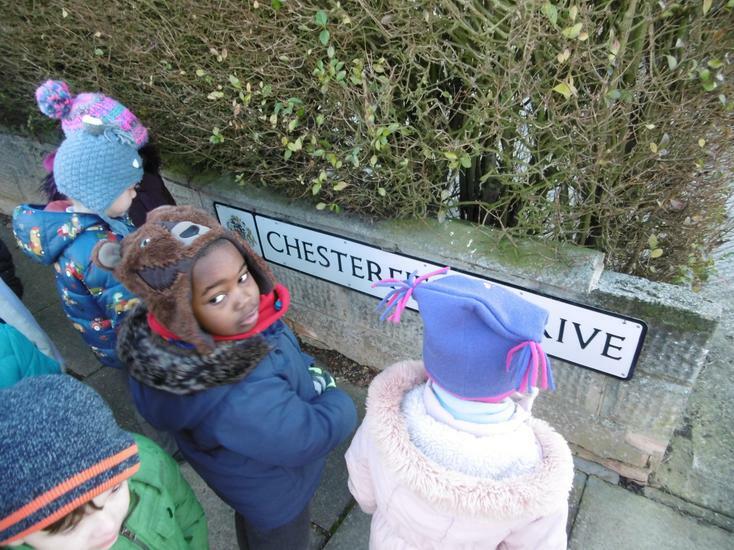 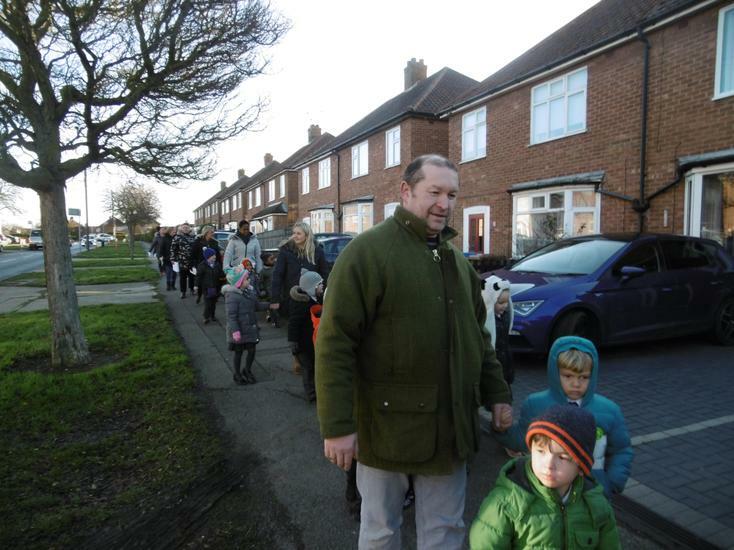 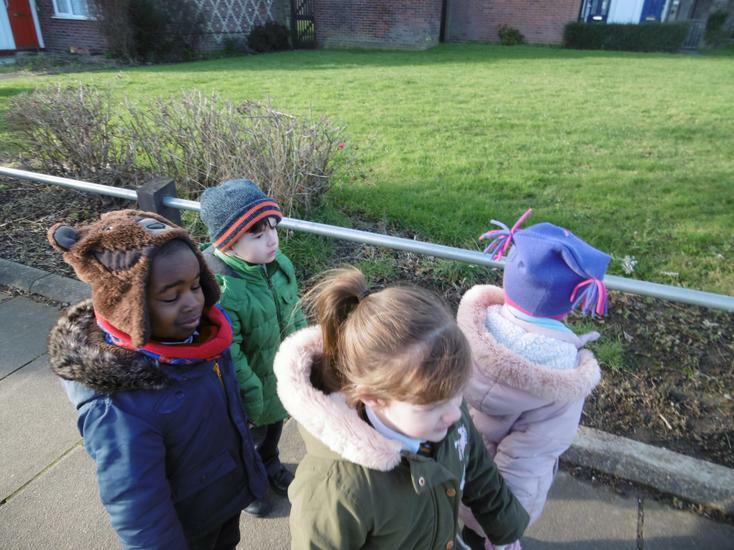 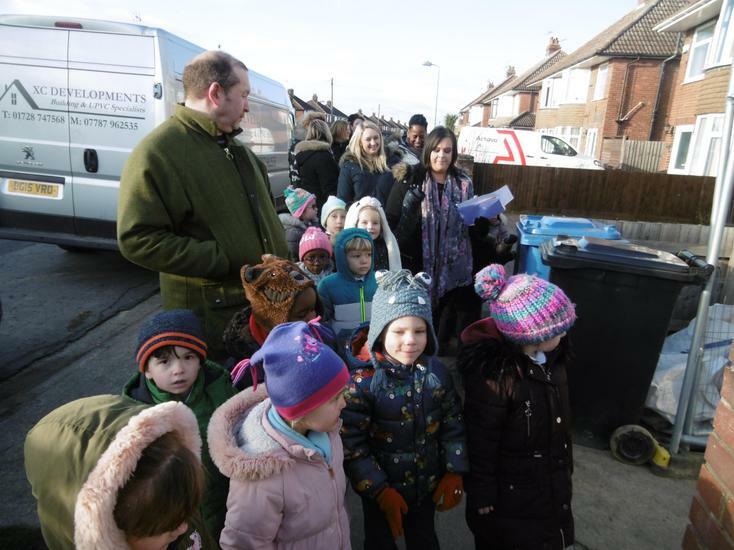 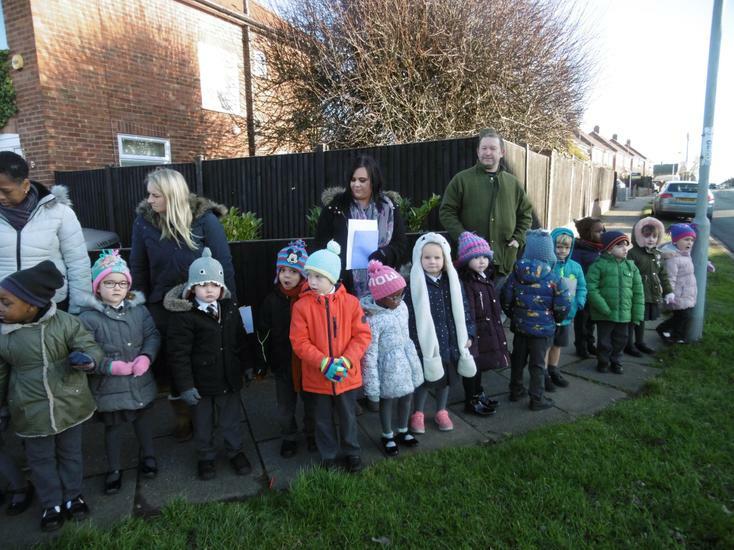 We went on a walk around our local area looking at the different types of houses, road signs and hunting for a postbox! 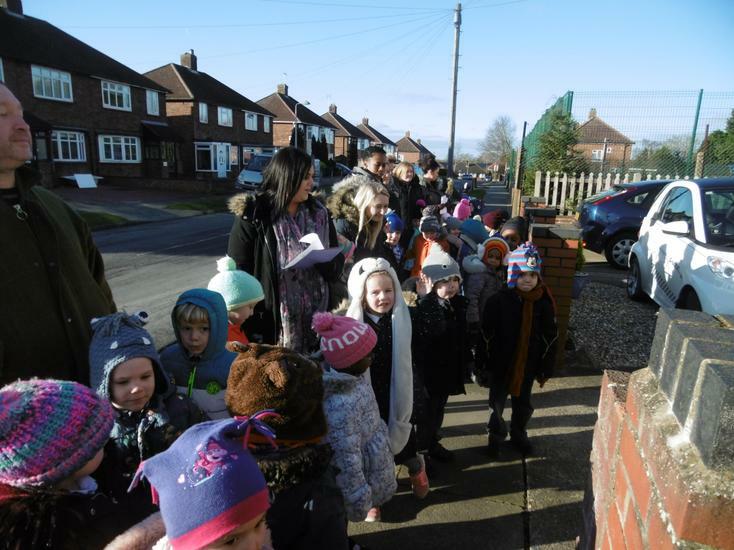 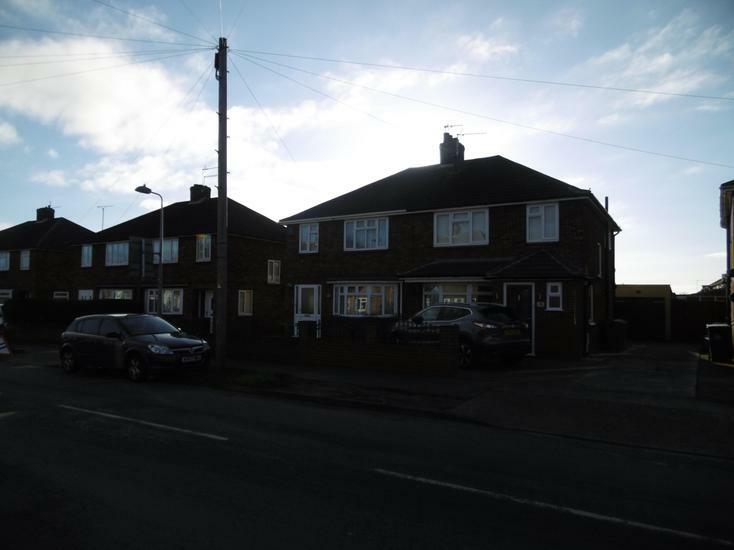 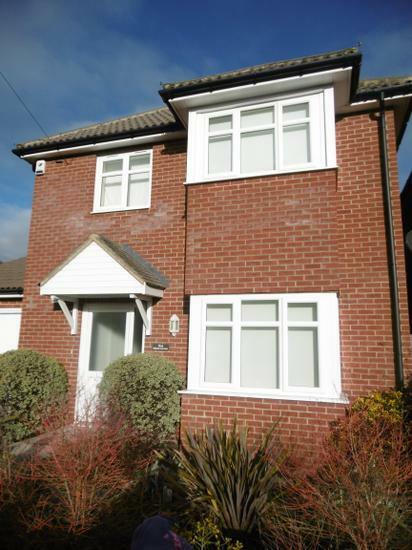 We saw semi-detached houses, bungalows, detached houses, terraced houses and flats, looking at their doors, windows, roofs and driveways. 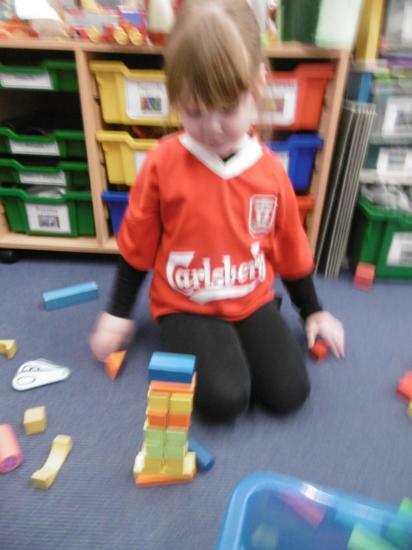 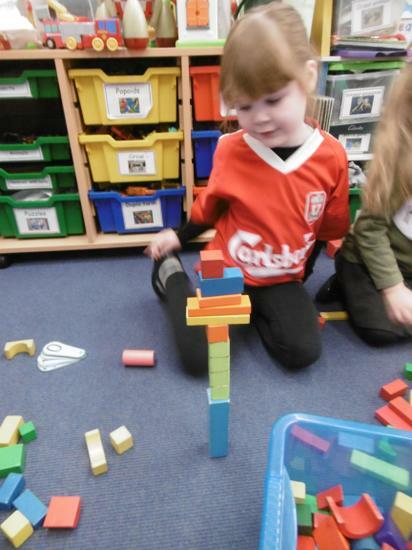 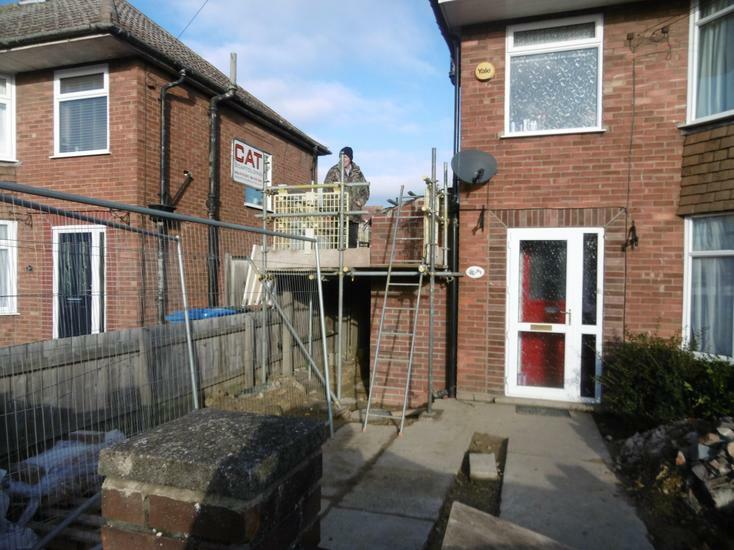 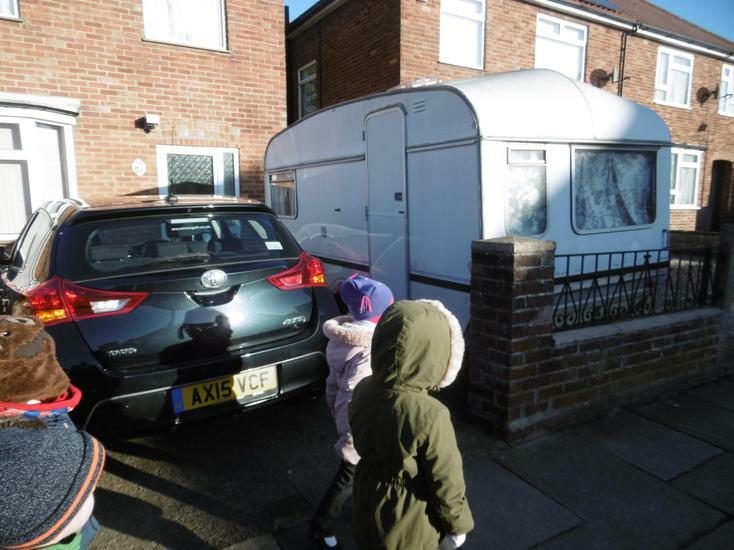 We saw a builder working on a house using bricks, felt and wooden battens and even saw a caravan. 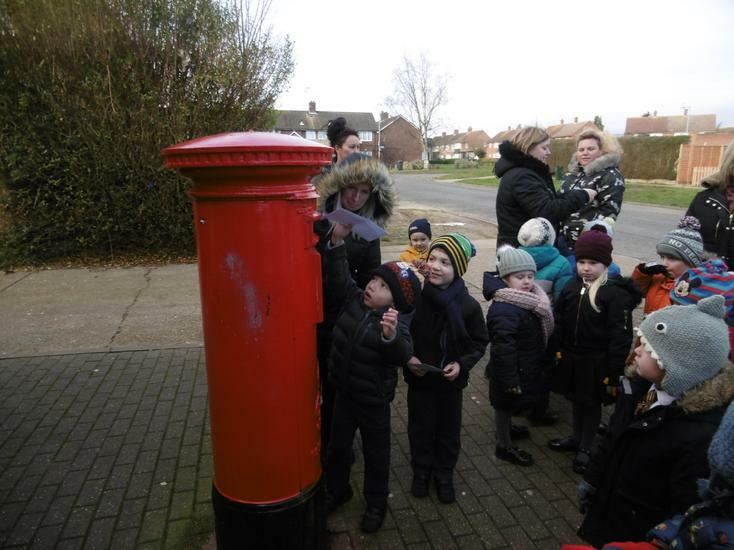 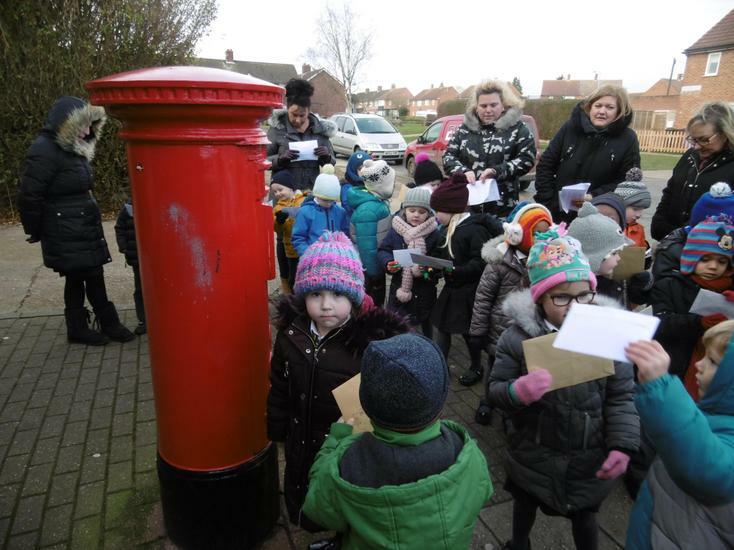 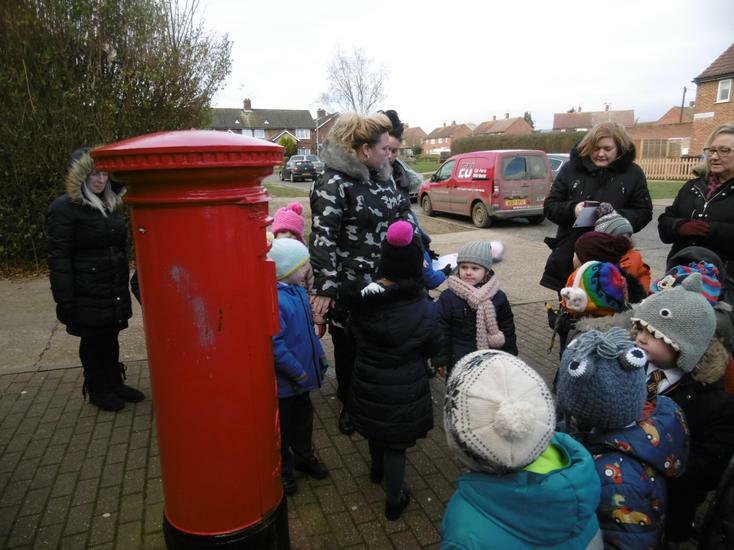 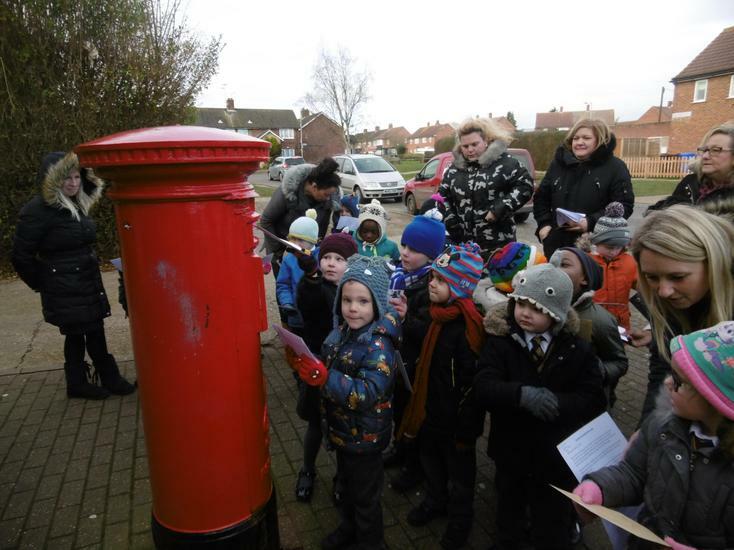 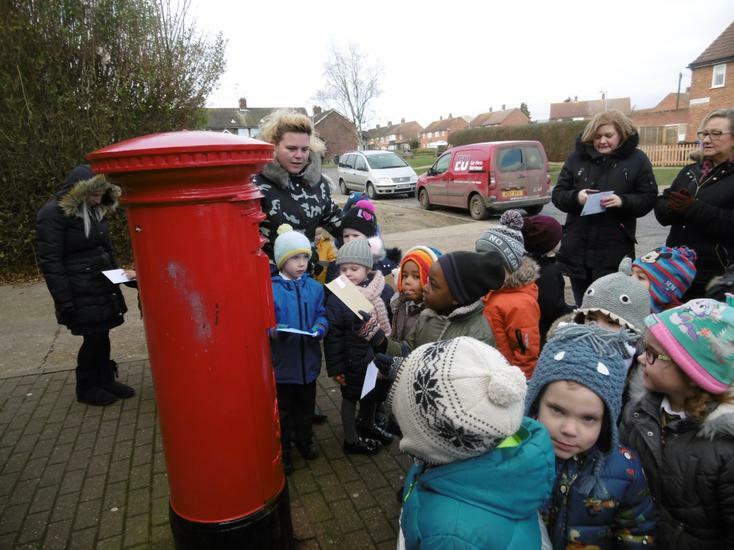 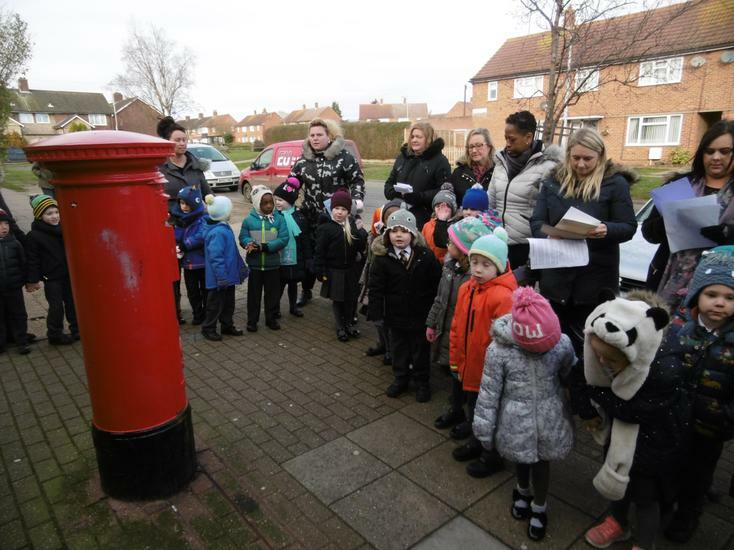 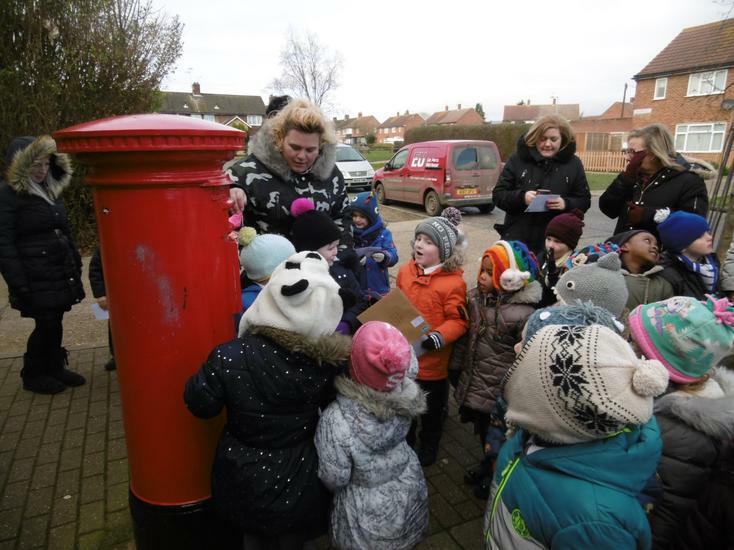 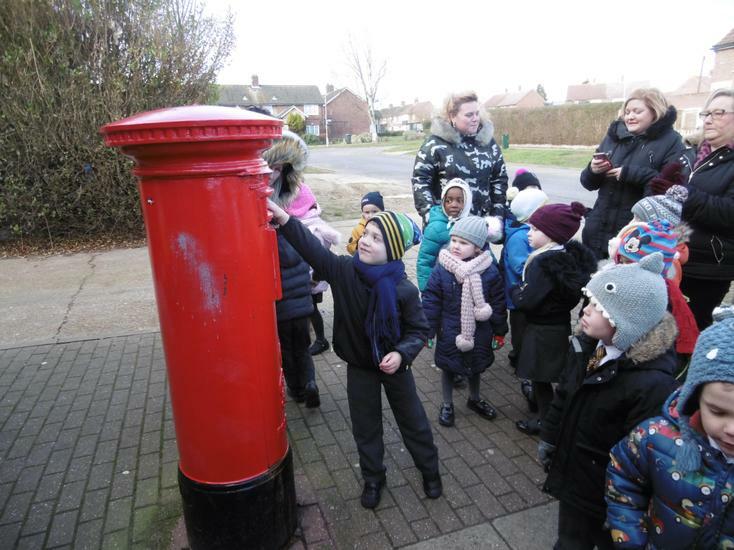 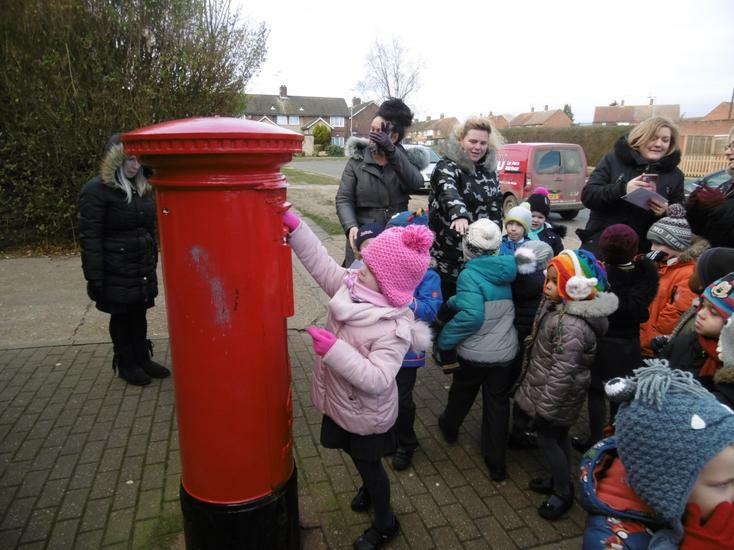 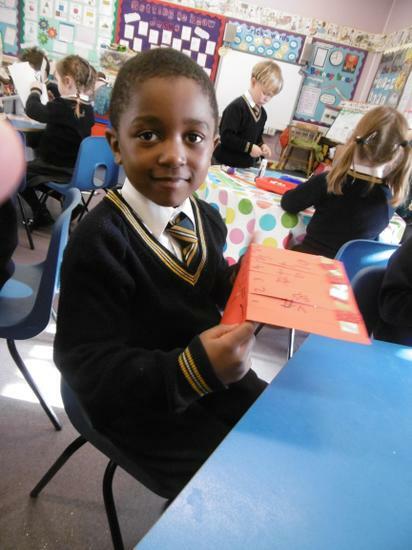 Once we spotted the red postbox, we checked our envelopes had a stamp and address on and then posted them in. 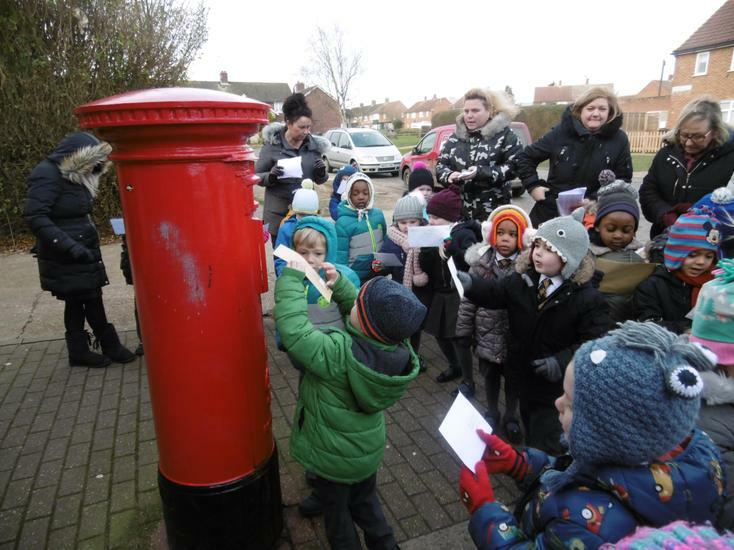 Whose letter will arrive first and whose will come second? 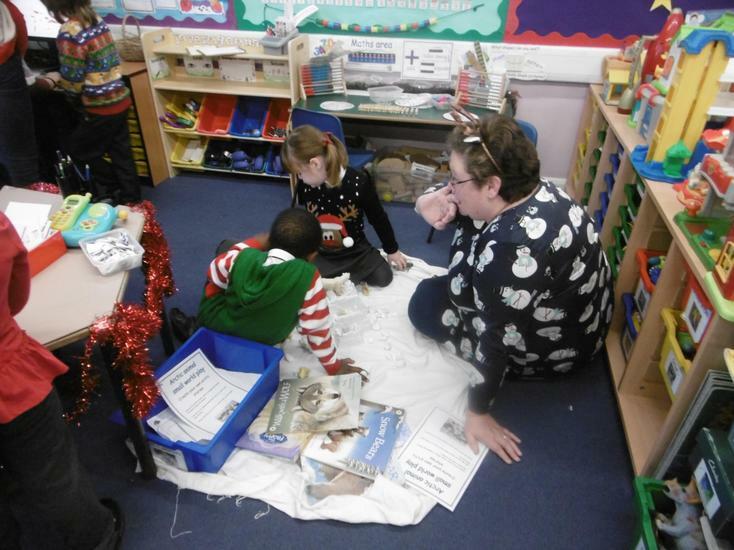 Thank you for all the adult helpers and a huge well done to all the children for listening and behaving so well. 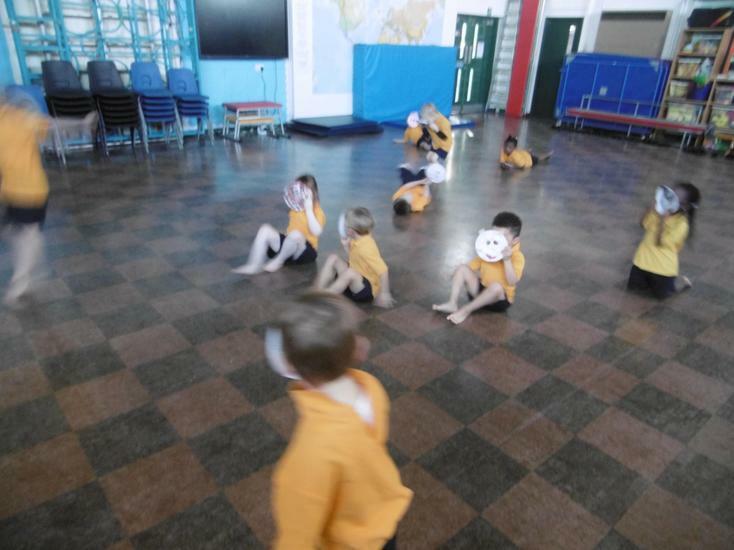 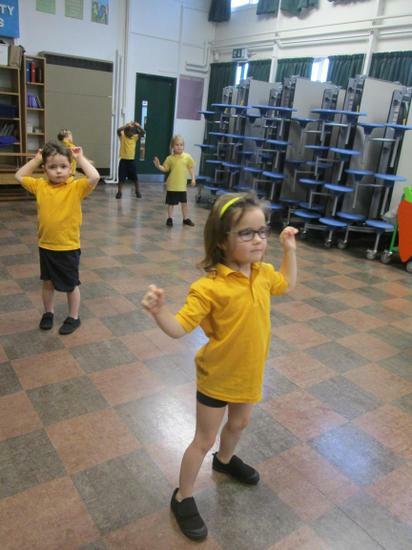 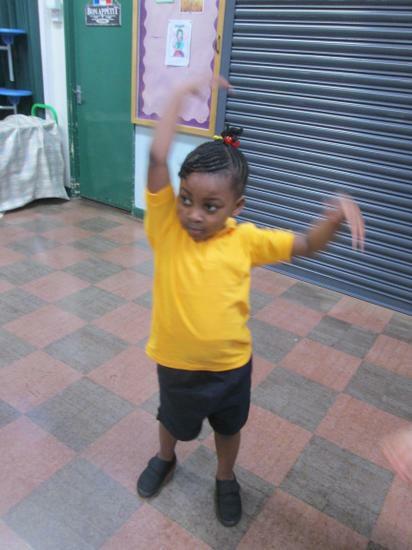 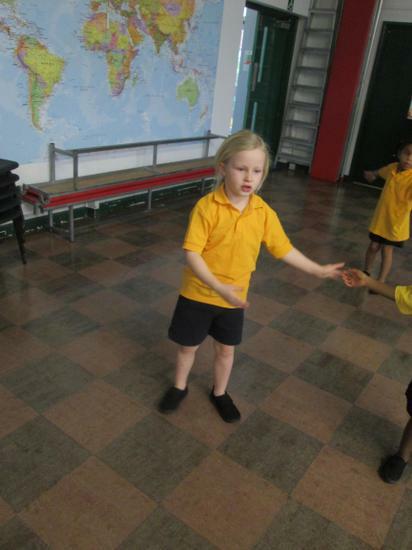 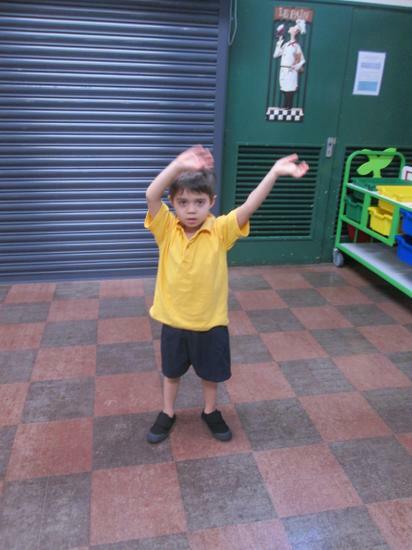 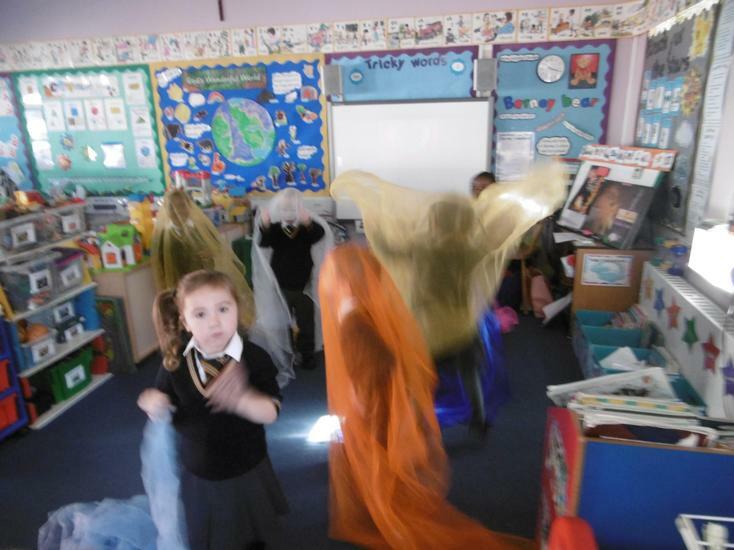 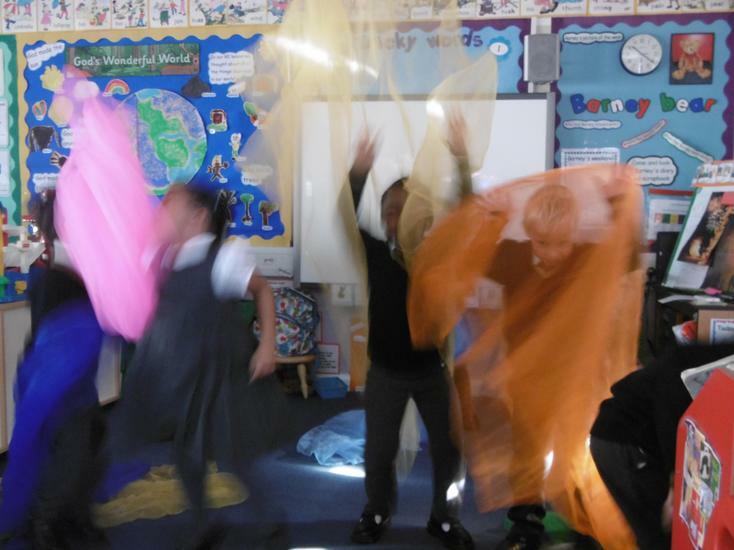 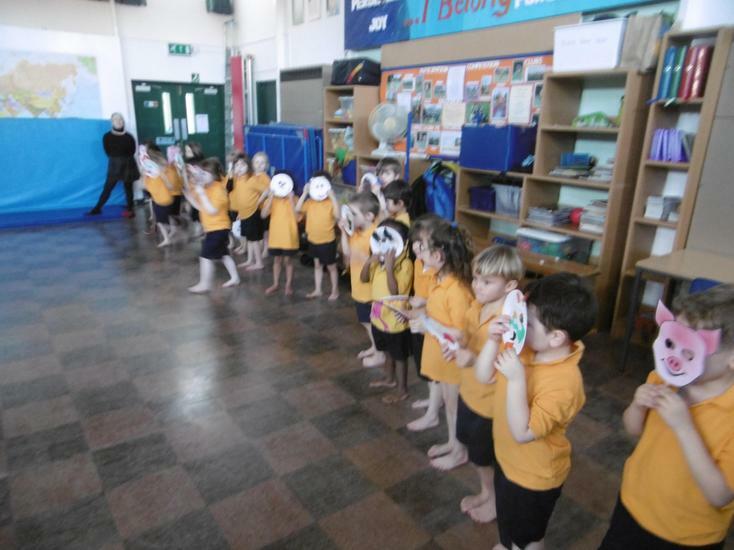 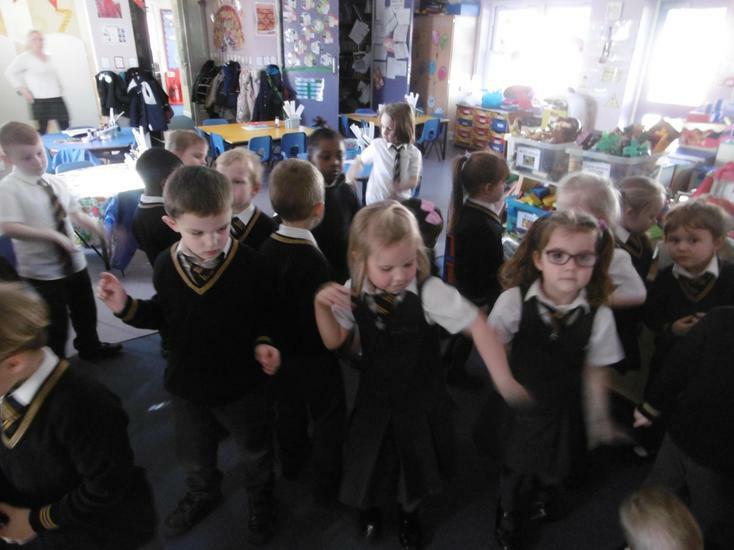 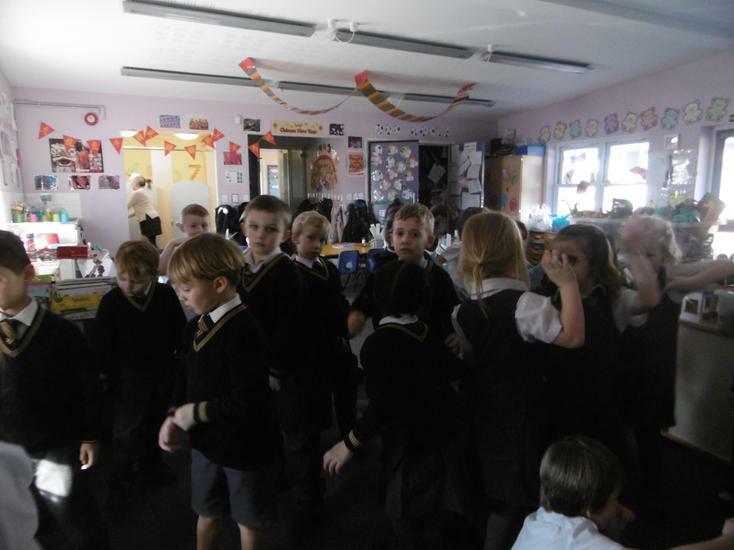 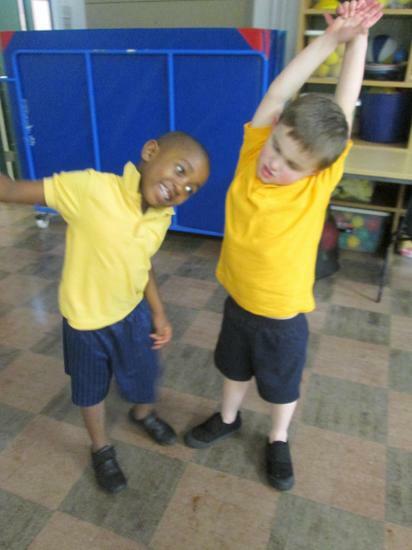 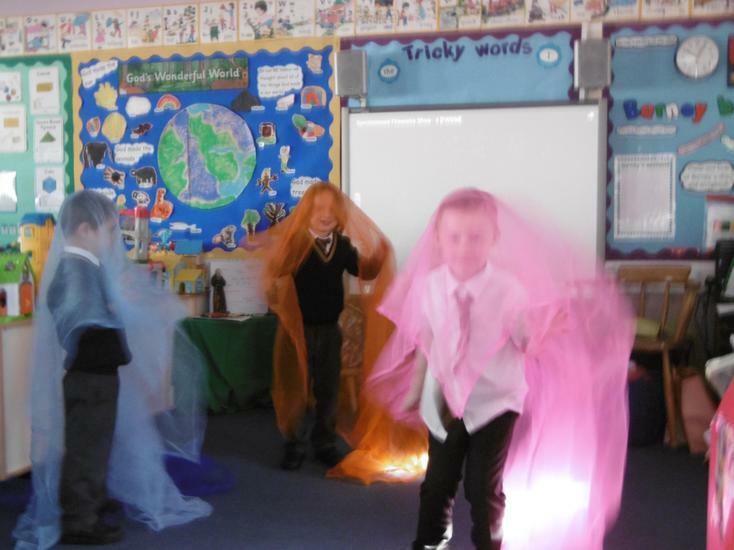 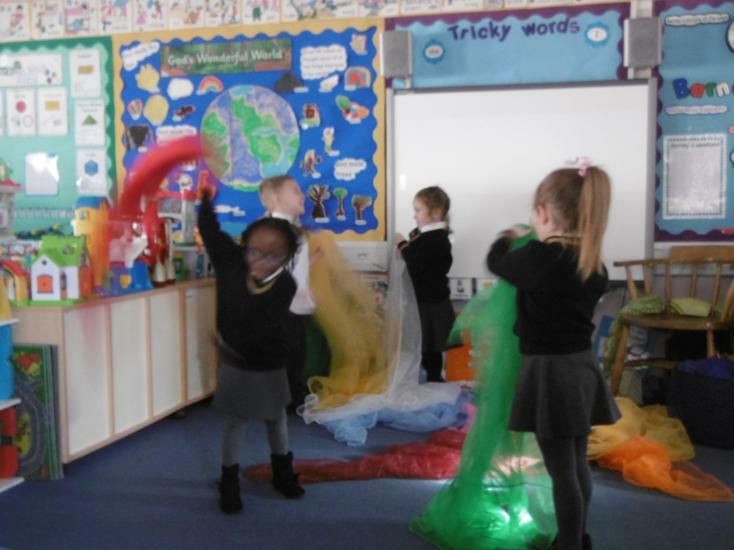 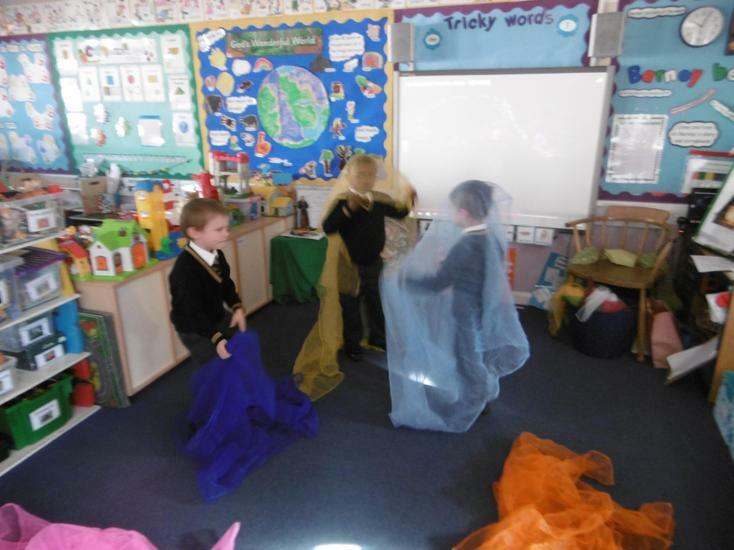 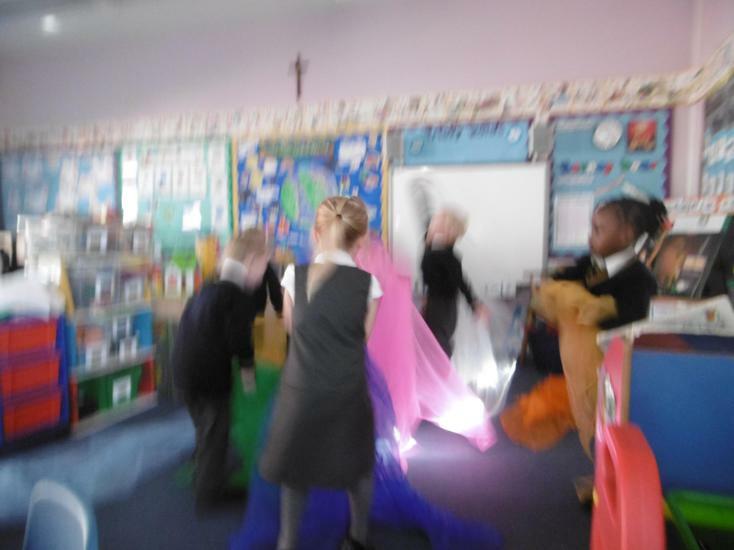 The class used their imaginations well in PE to take part in snowflake dances. 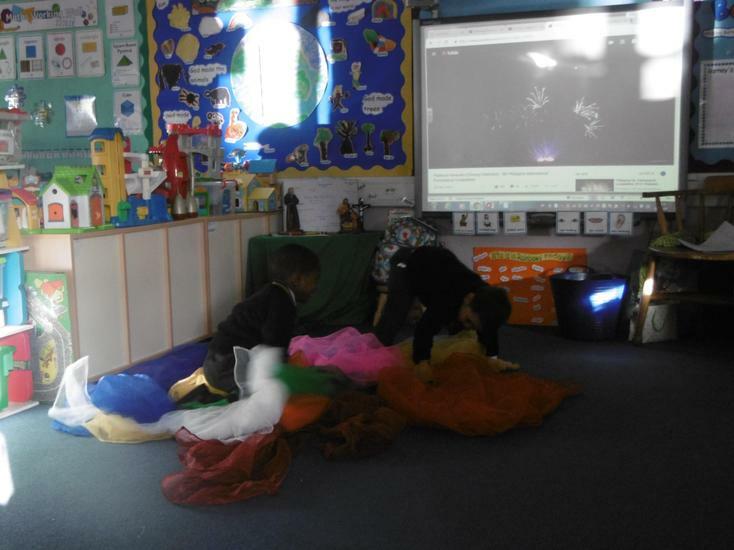 They thought about the way snowflakes whirl and twirl in the air before falling to the ground, listening to a piece of classical music also. 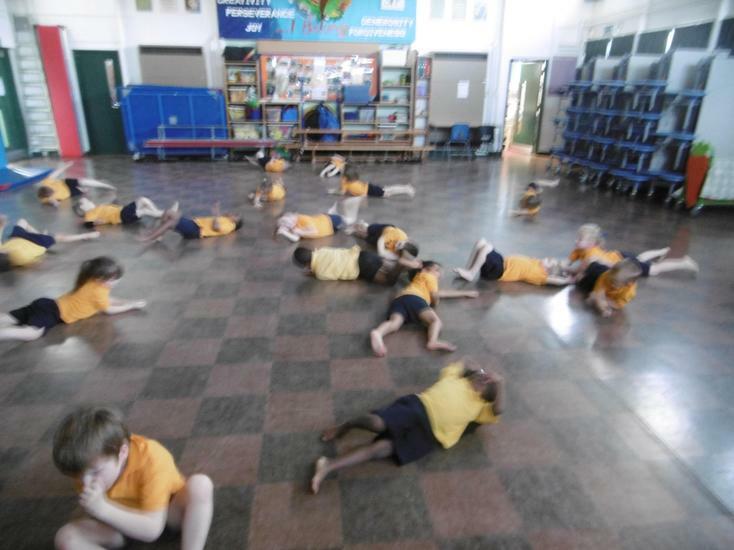 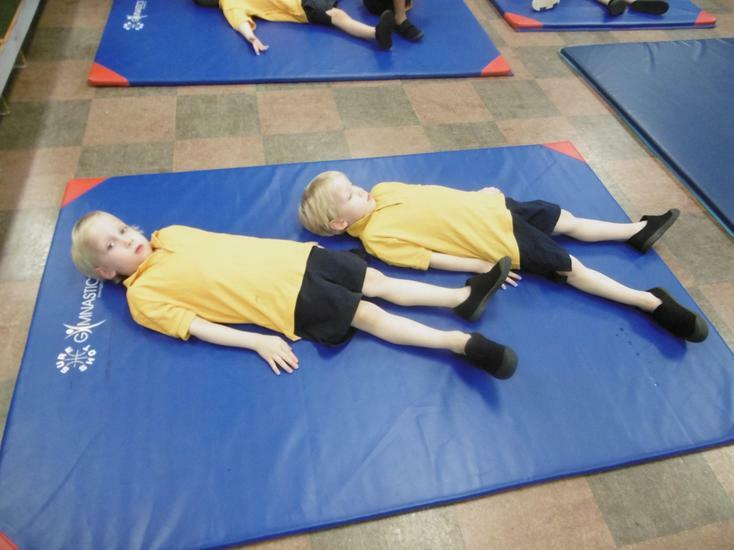 The children used their bodies well to demonstrate their snowflakes. 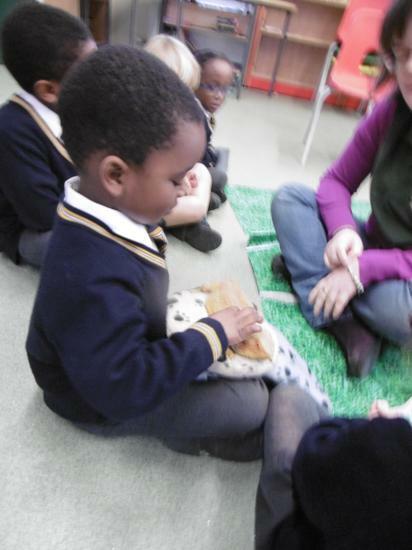 They then worked in small groups to choose a winter animal, thinking of a range of ways that the animal moved and the noises they make. 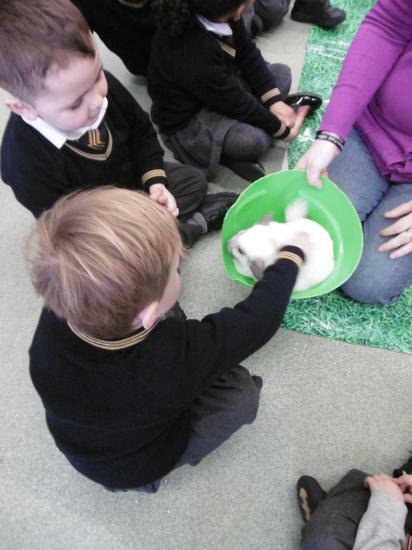 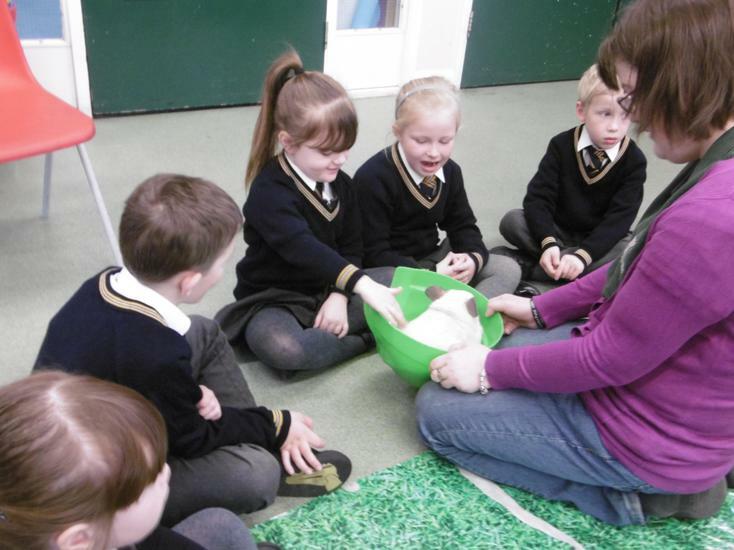 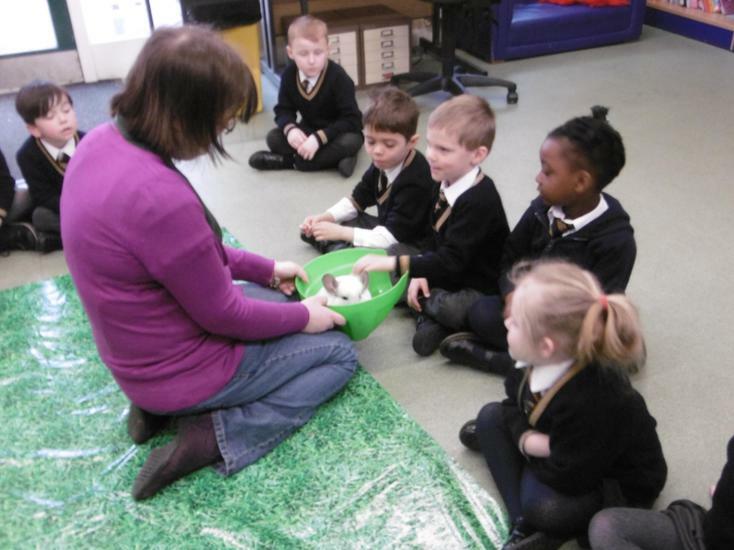 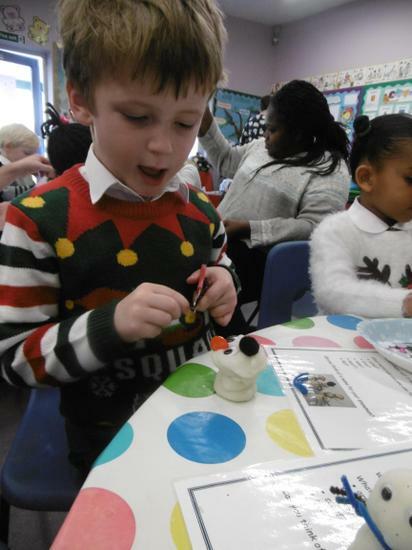 The class came up with great ideas including penguins, an arctic hare and polar bears! 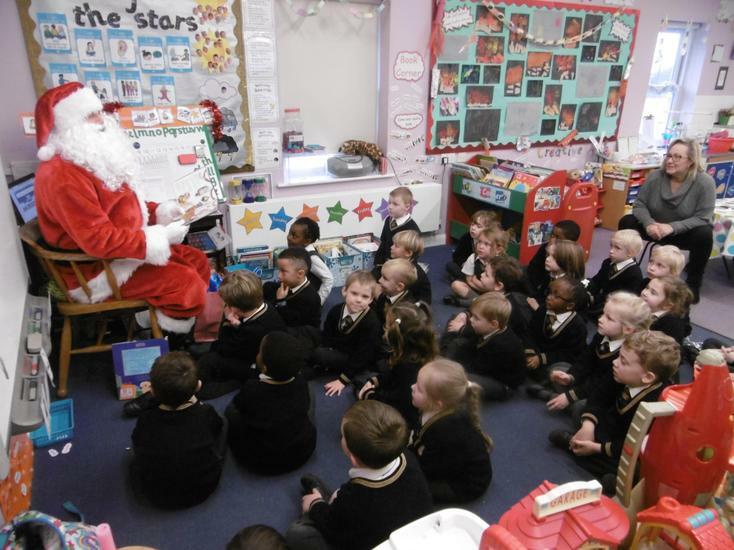 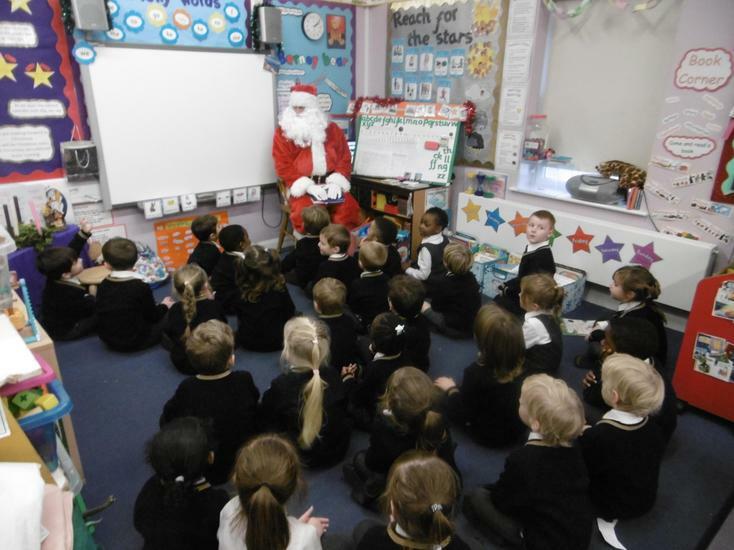 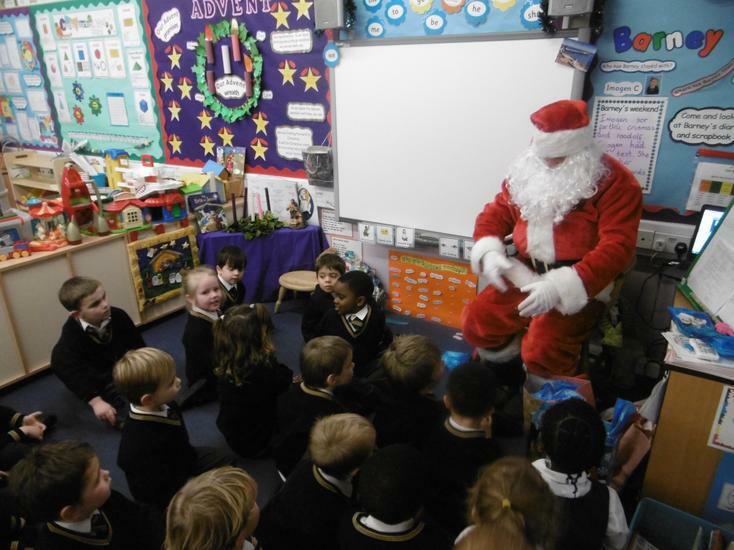 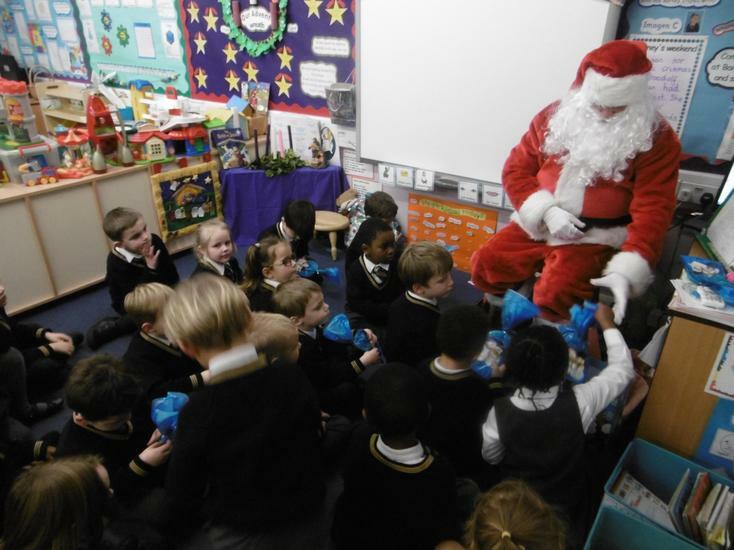 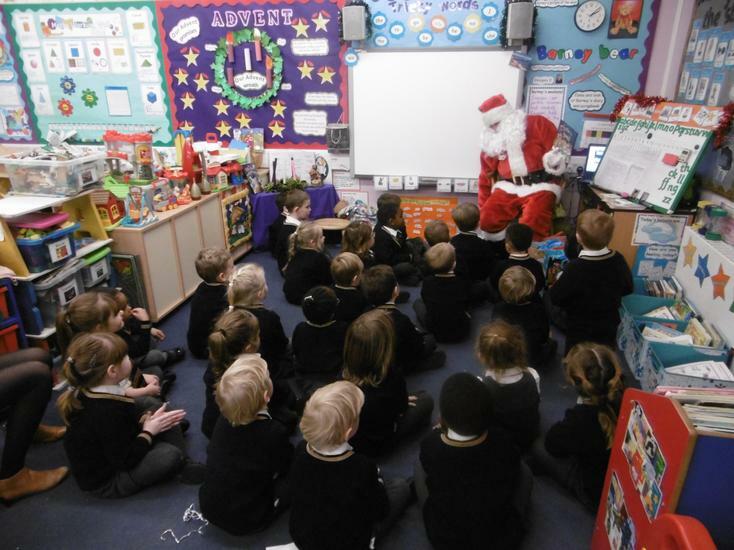 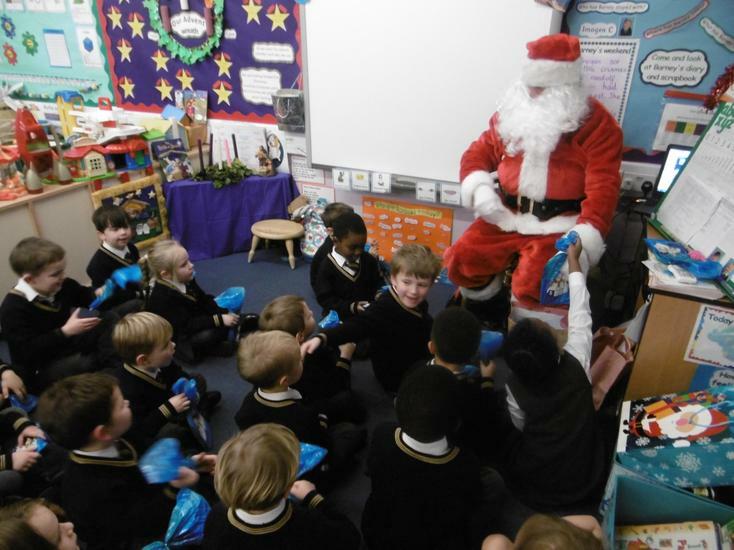 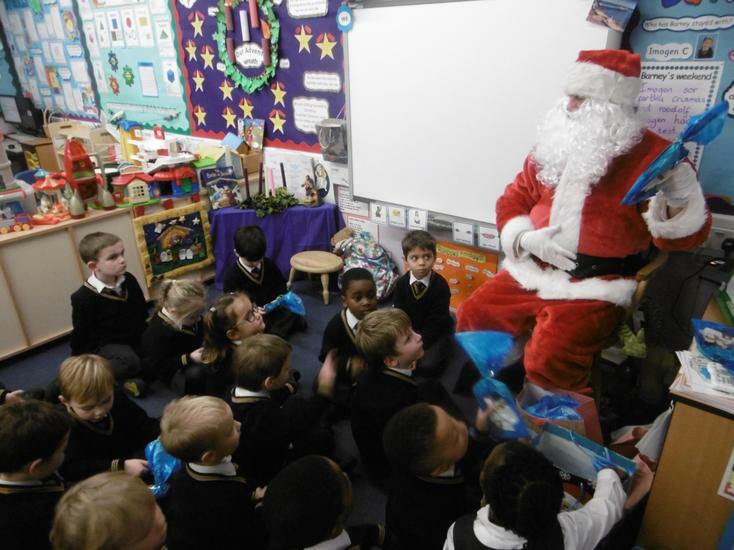 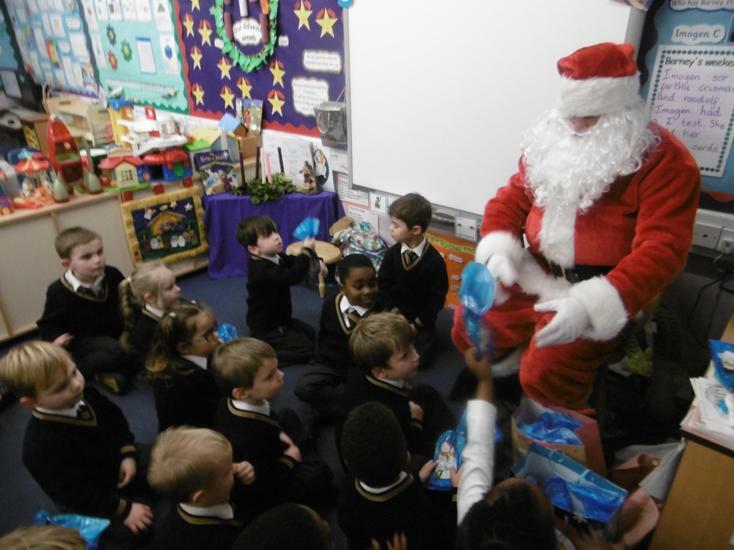 We had a very special visitor today.... Father Christmas came to see us!! 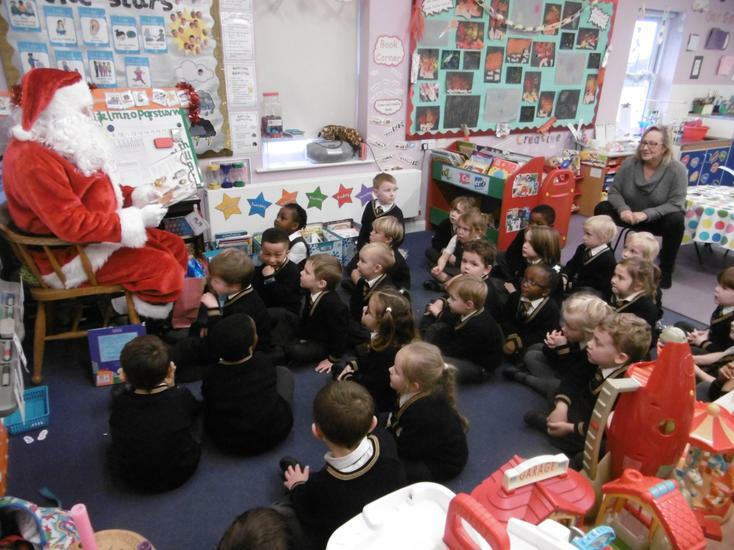 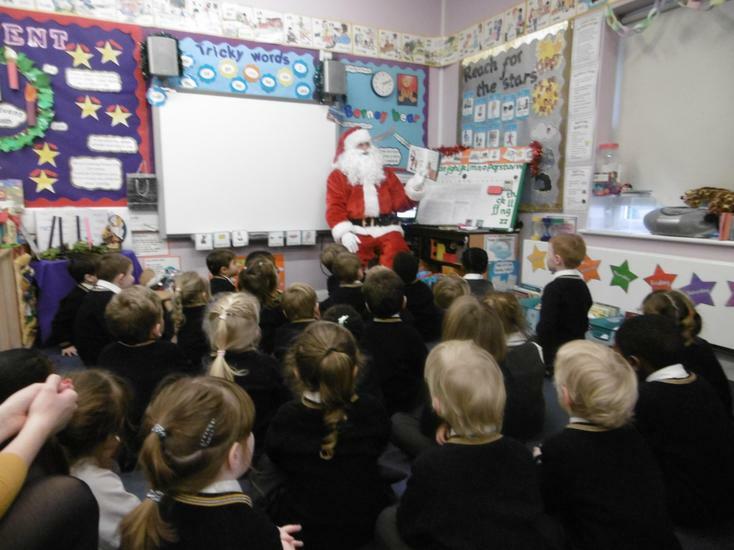 He had parked his reindeer outside and came in to give us some presents and read a story about Santa coming to Ipswich. 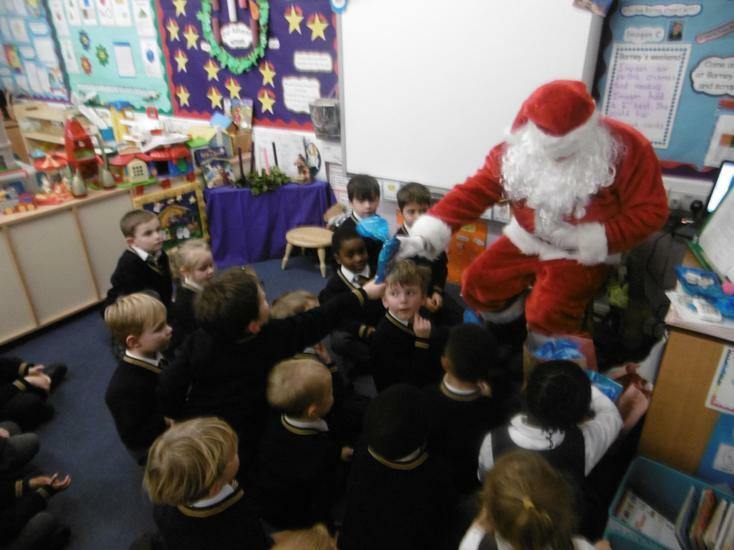 We told him what we'd like for Christmas and talked about how he manages to fit down our chimneys. 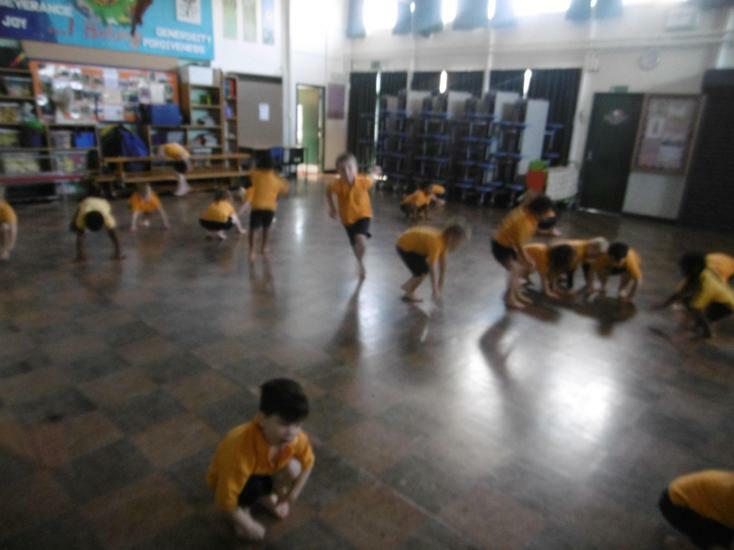 In PE today, the class took part in some Christmas yoga, going on an adventure to the North pole to help find Father Christmas! 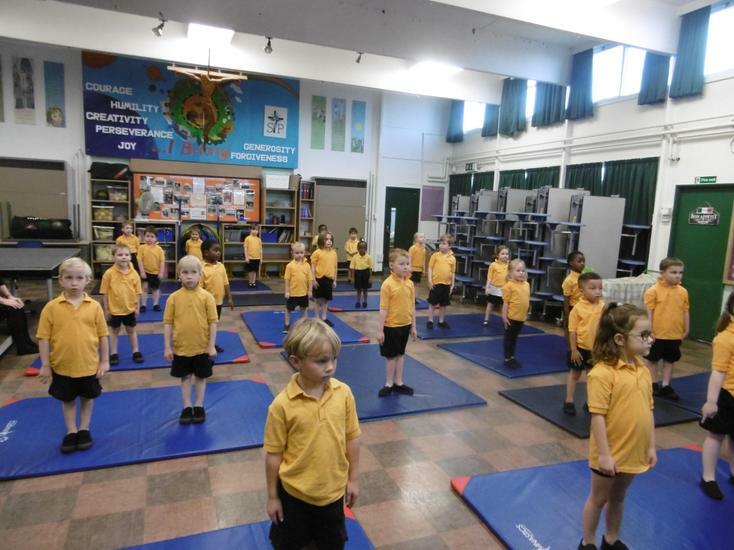 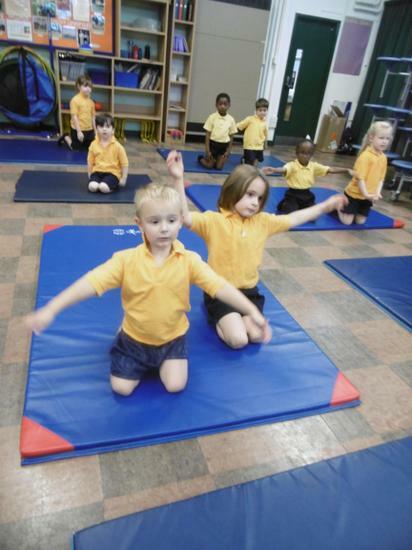 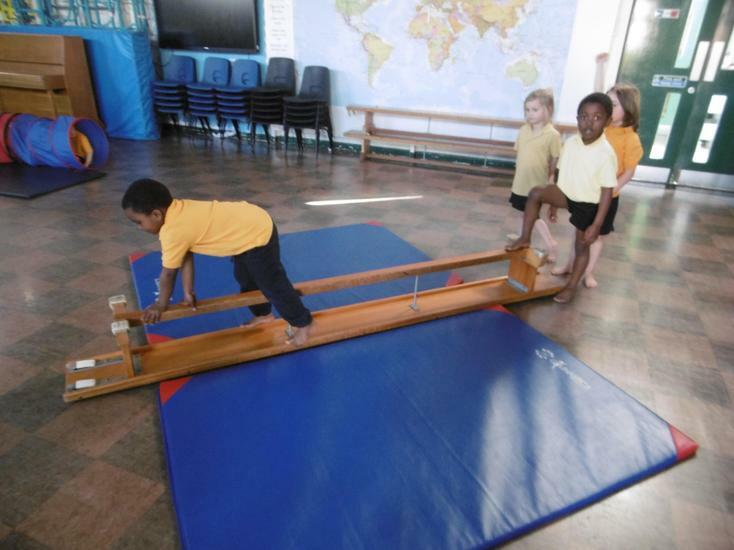 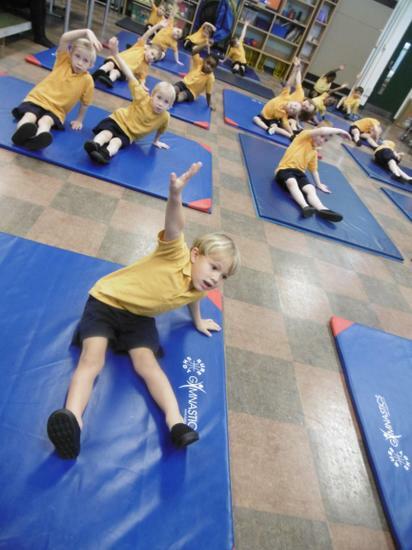 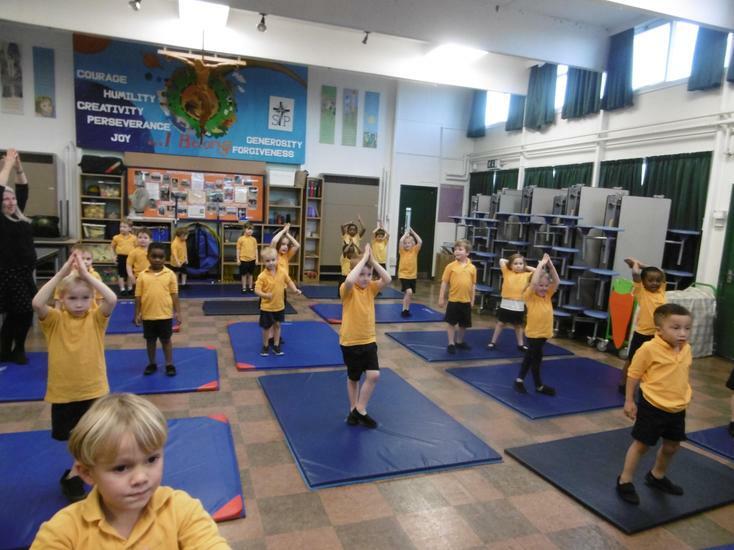 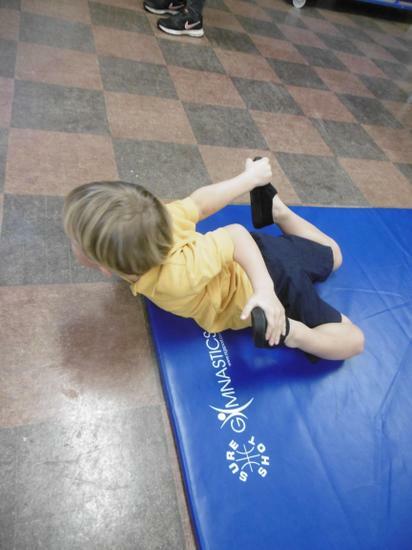 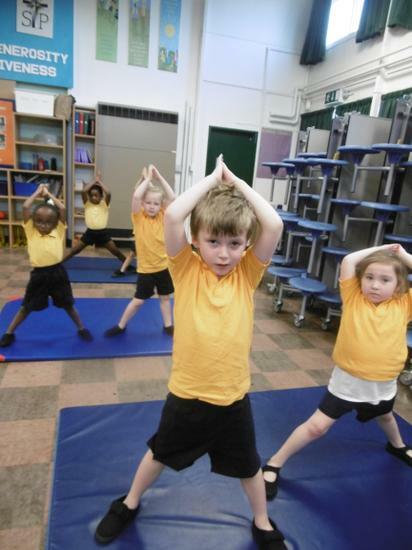 The yoga was designed to help build the children's strength, balance and confidence. 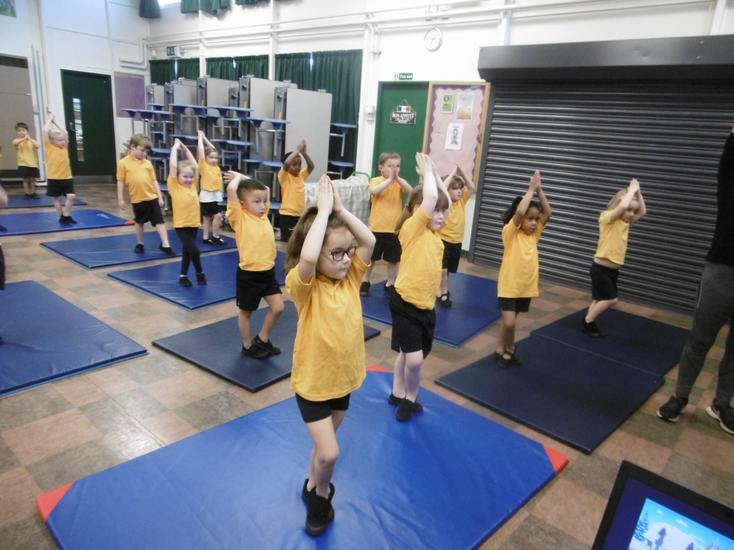 The class followed instructions well copying the yoga poses on the interactive screen. 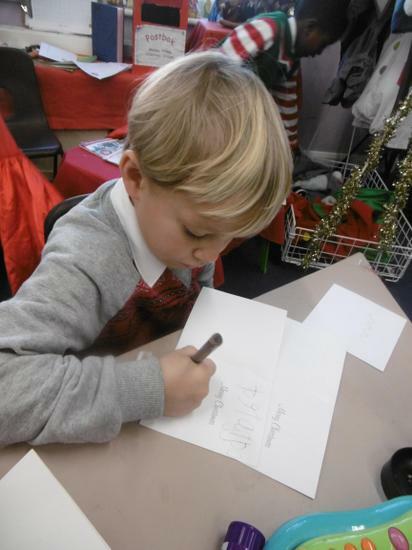 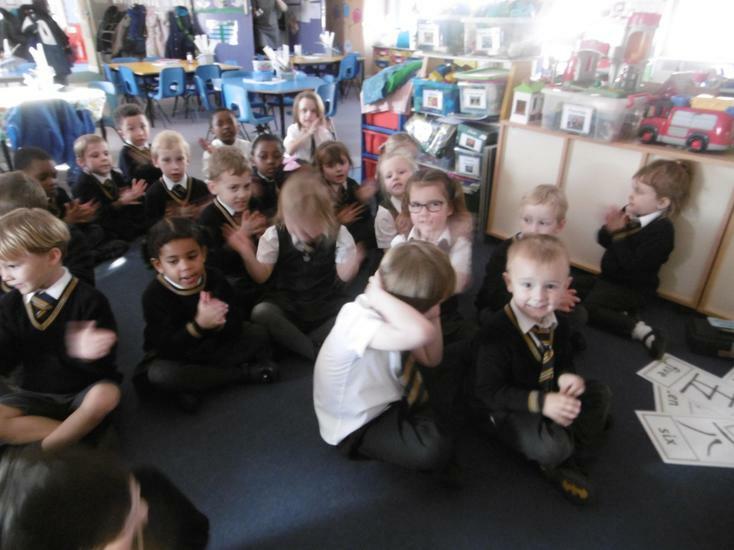 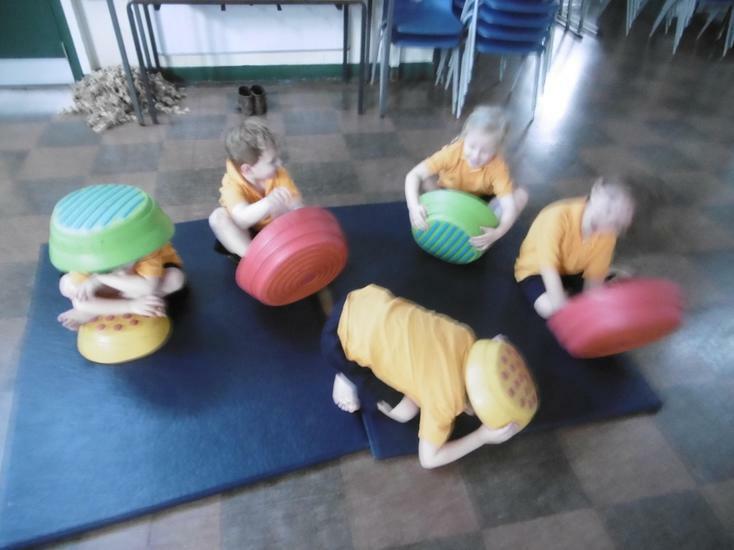 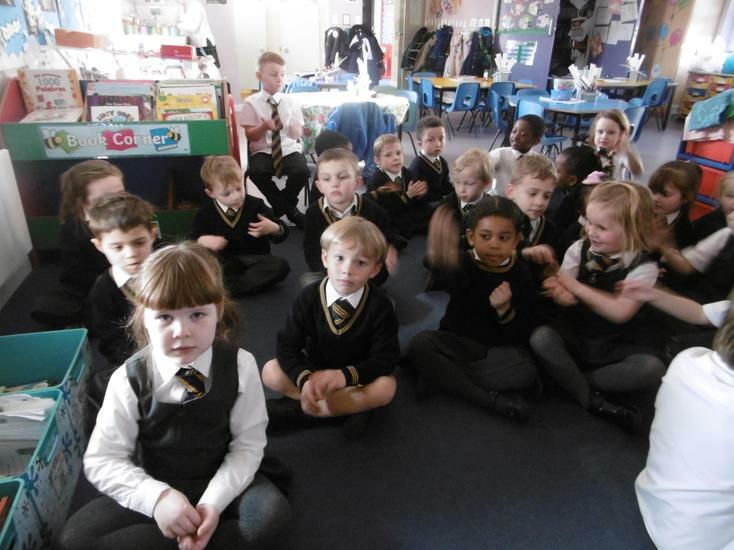 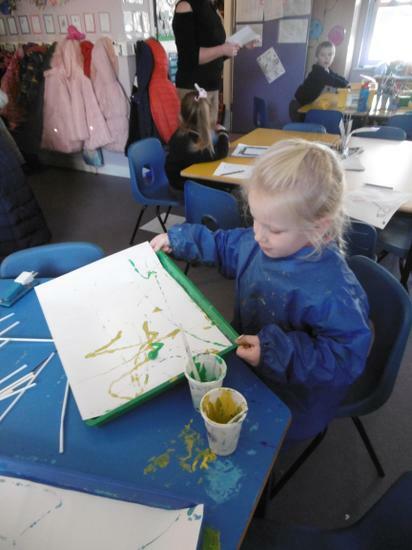 They had lots of fun and tried out a range of different poses including a Christmas tree, riding a sleigh and being a Christmas pudding and then relaxed at the end and focused on their breathing. 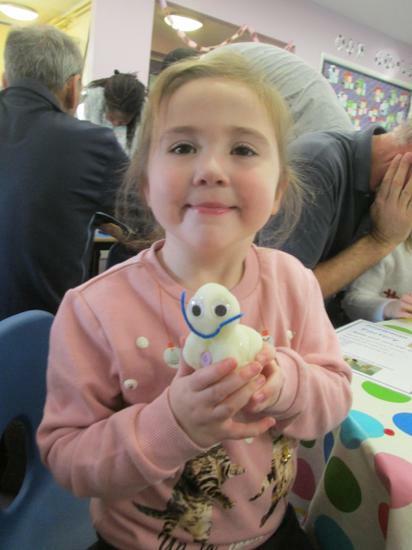 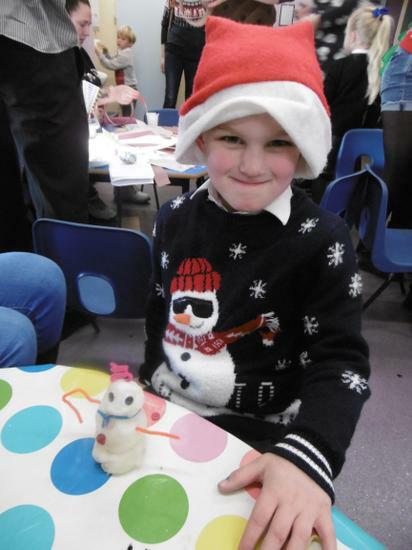 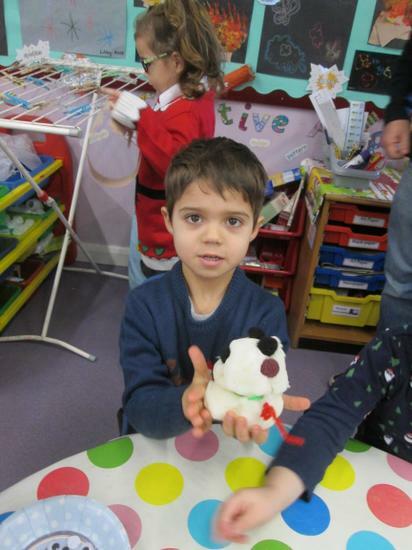 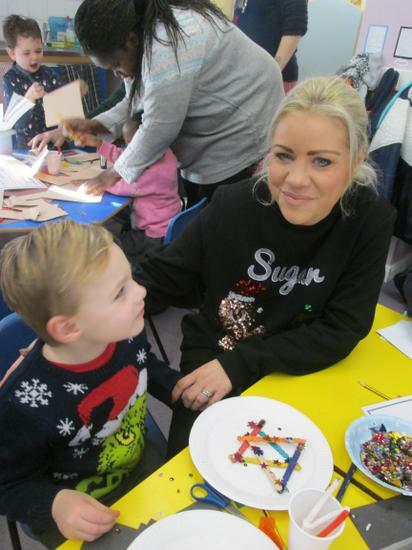 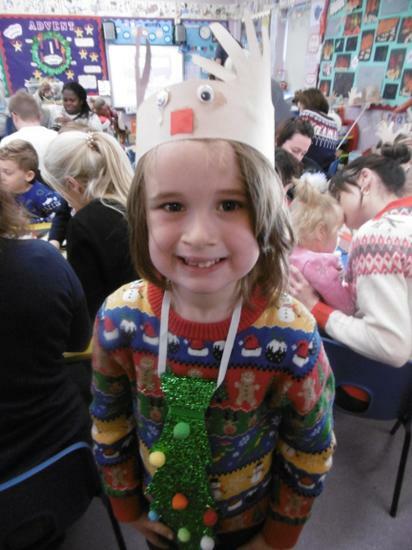 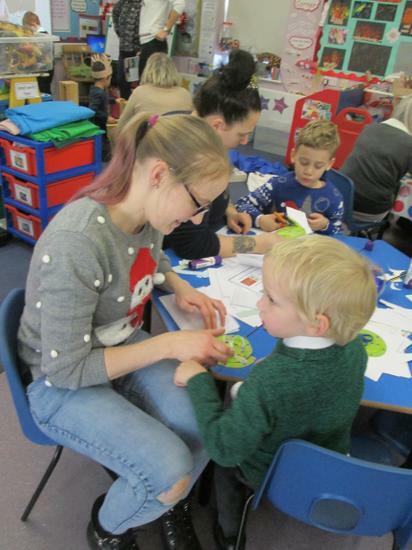 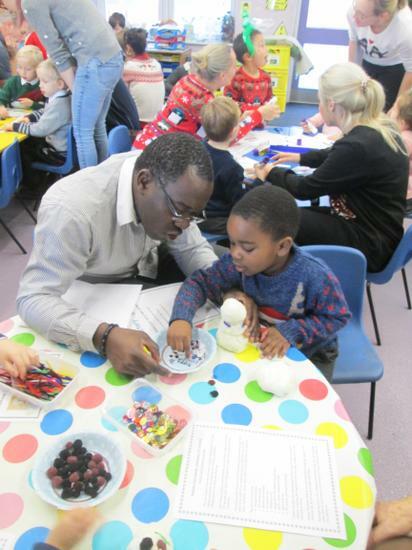 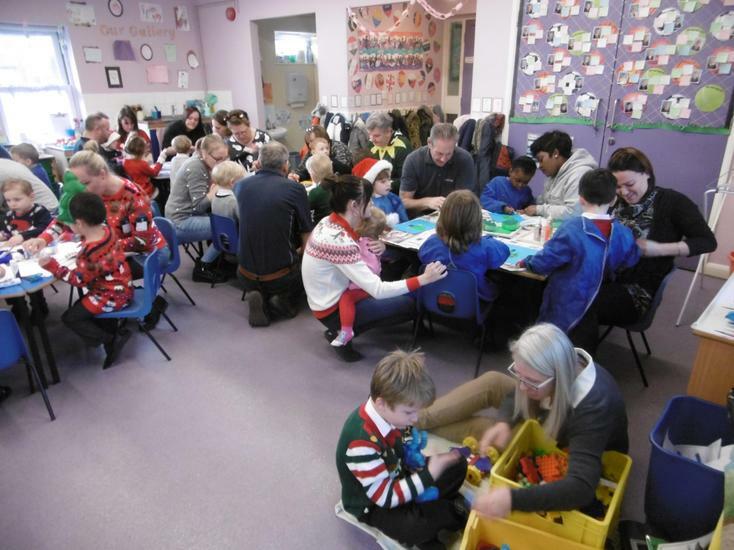 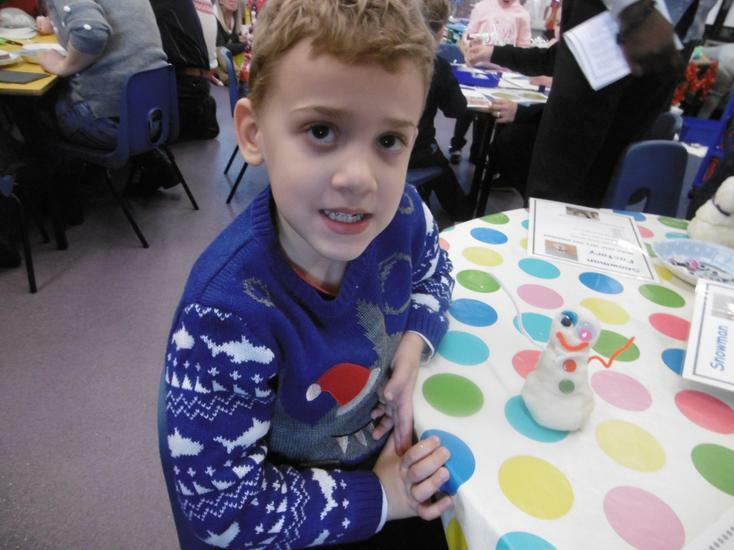 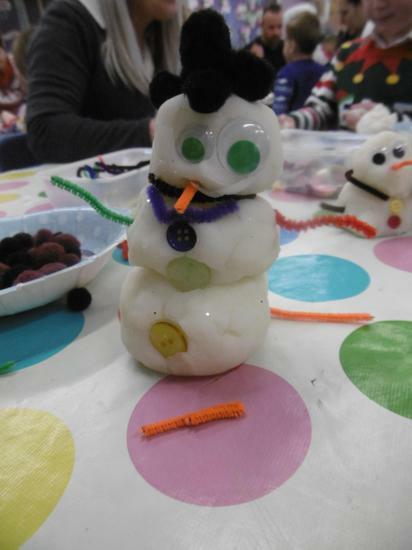 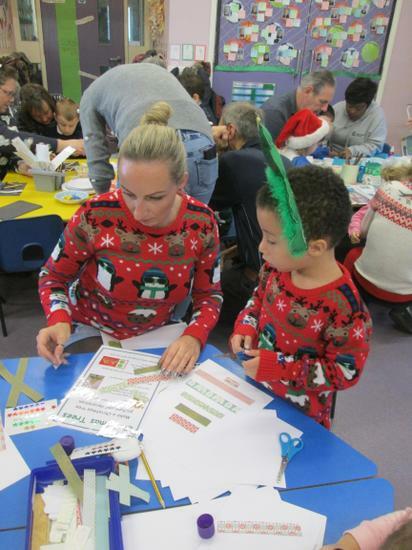 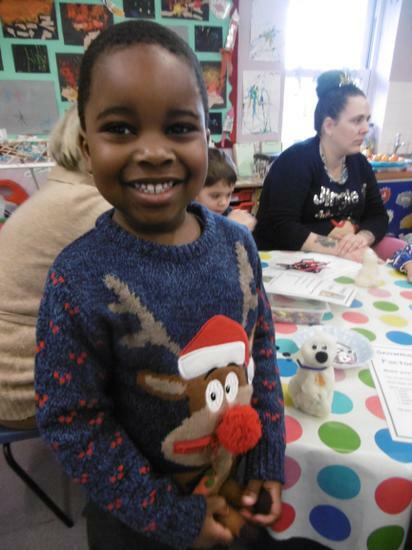 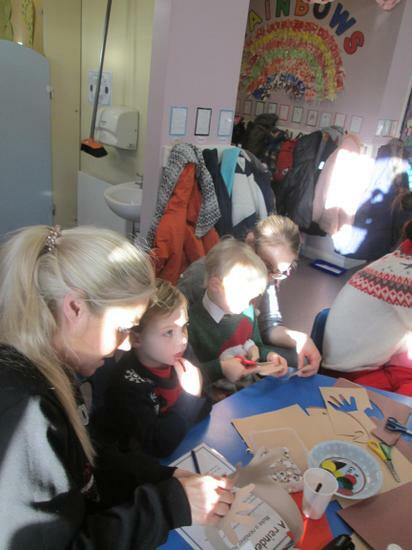 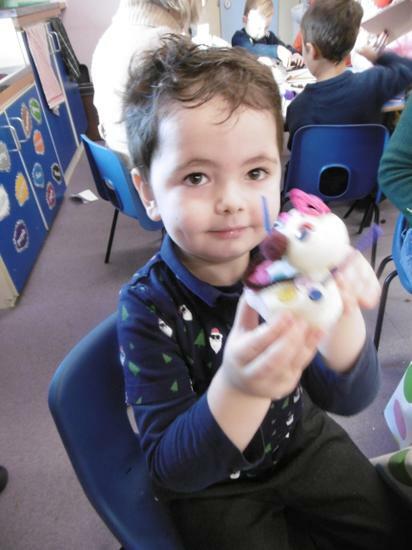 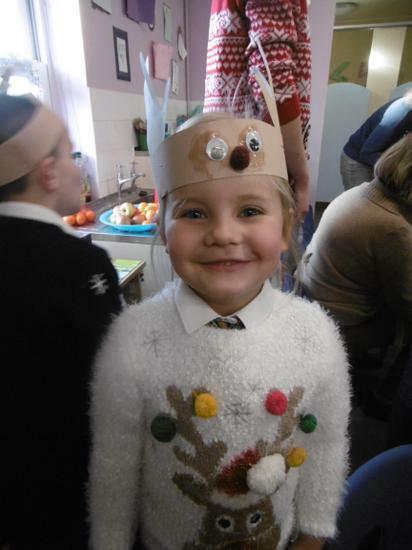 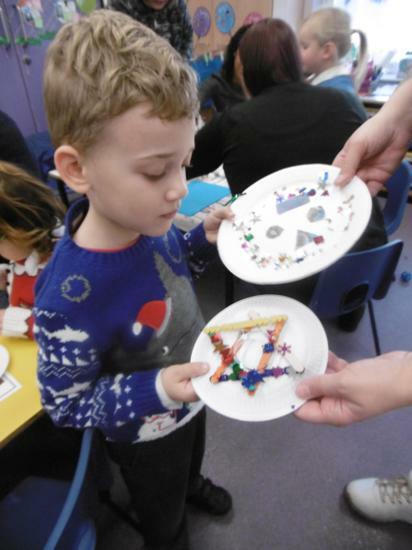 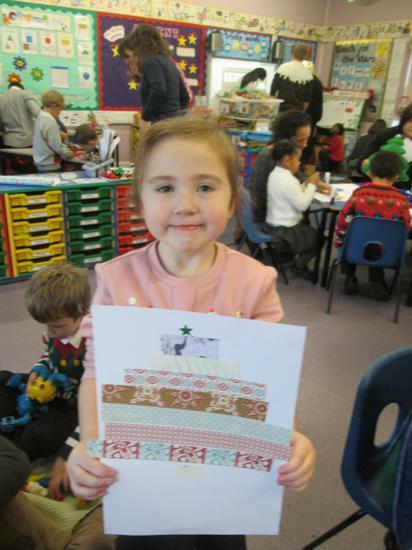 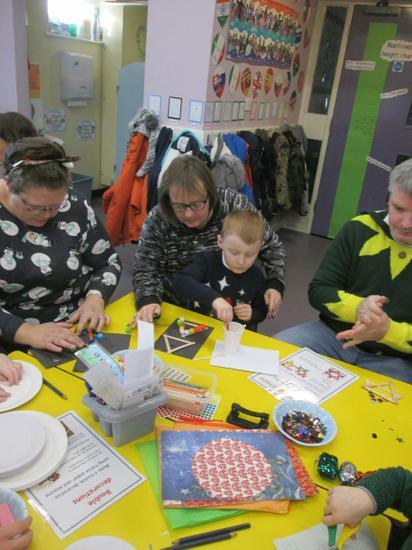 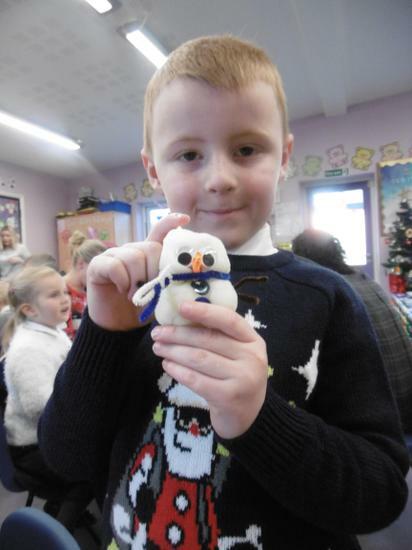 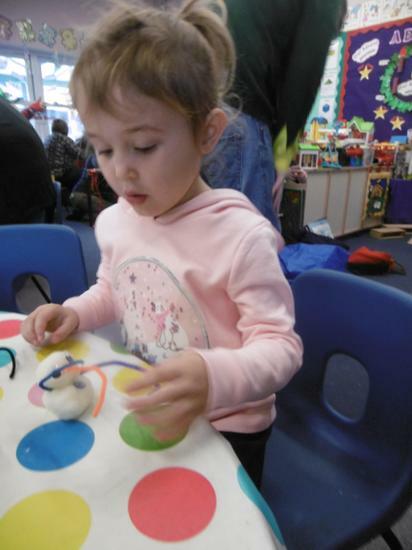 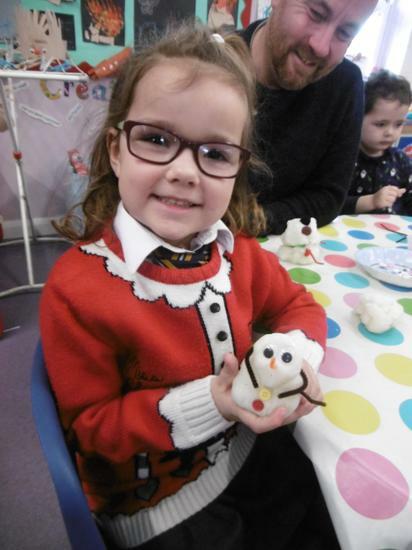 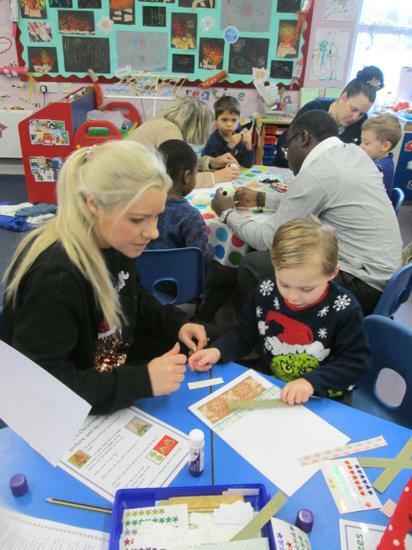 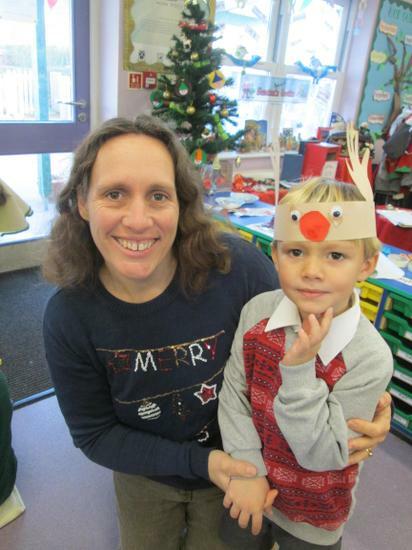 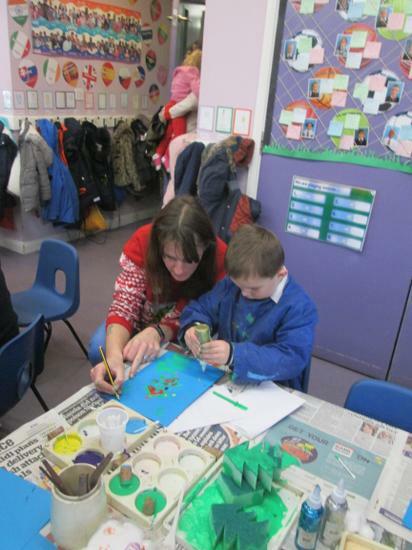 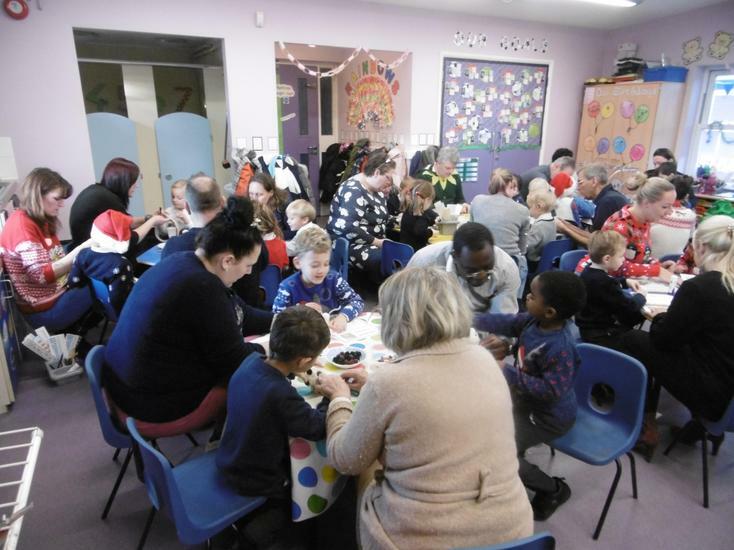 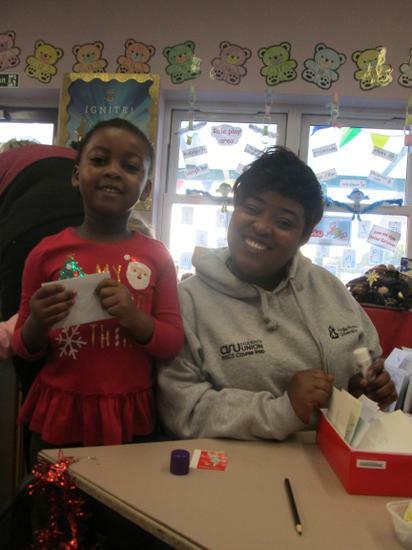 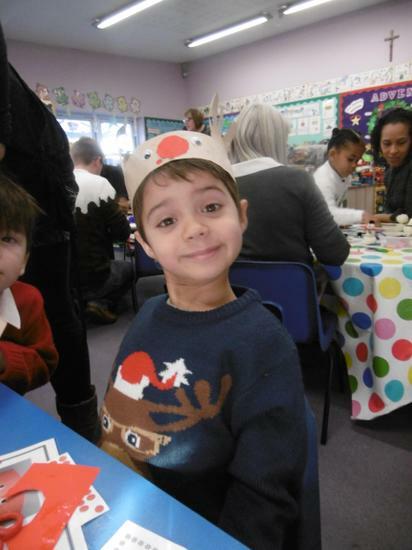 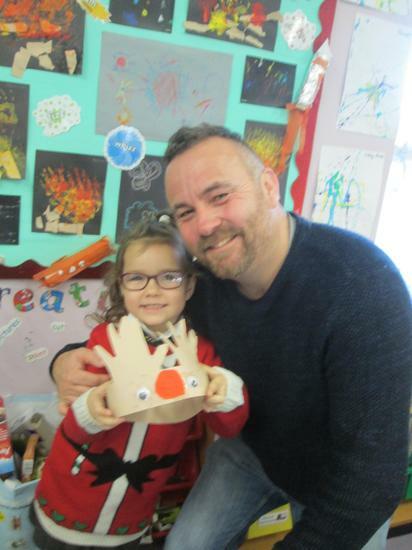 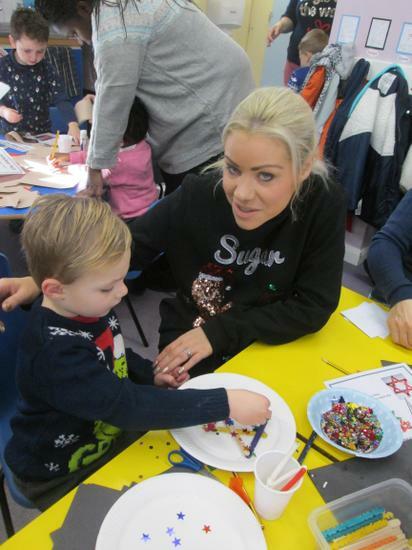 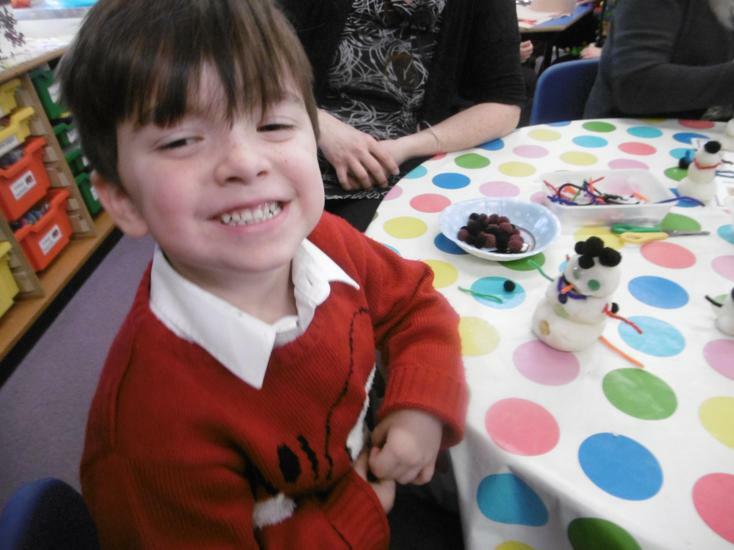 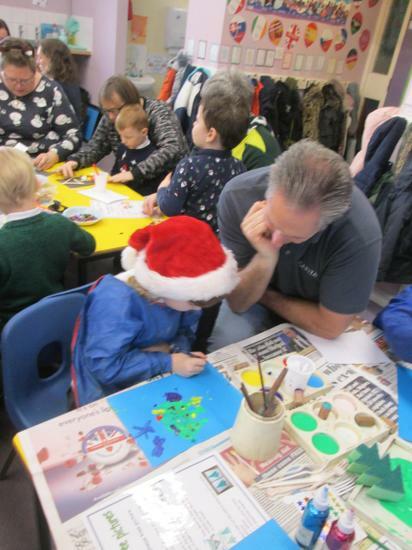 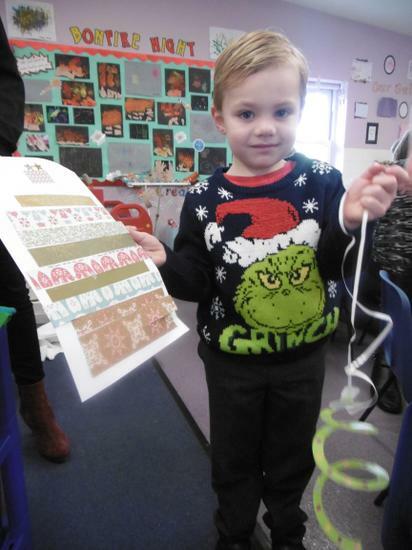 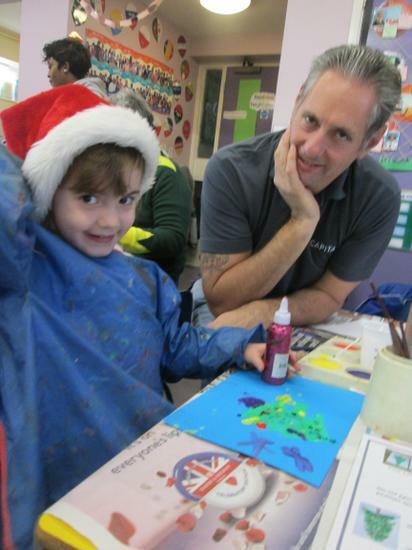 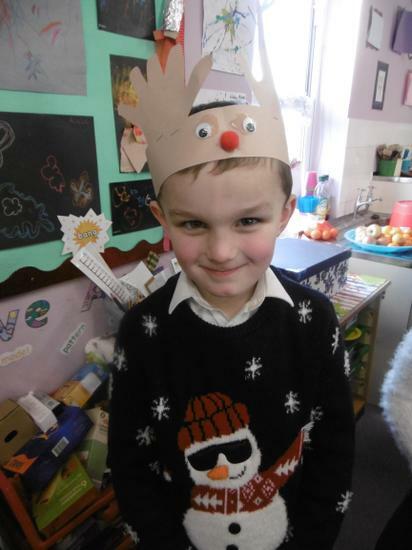 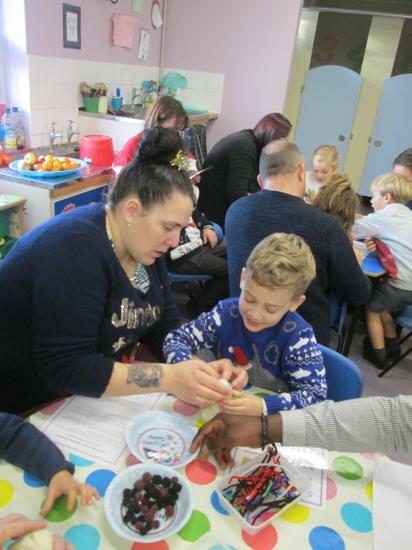 In our Christmas jumpers, we all had a great time exploring lots of different creative based activities, including painting Christmas tree paintings, making star and bauble decorations, drawing round our hands to make a reindeer hat and creating our own dough snowmen in the snowman factory. 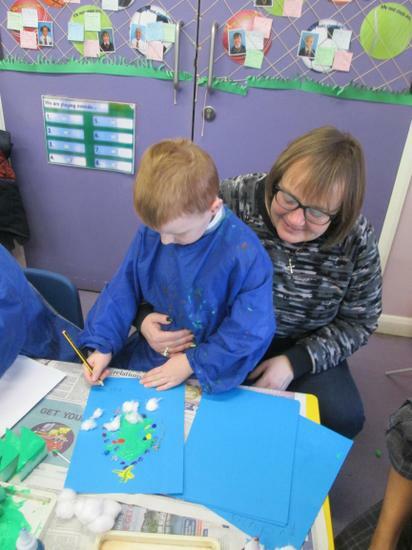 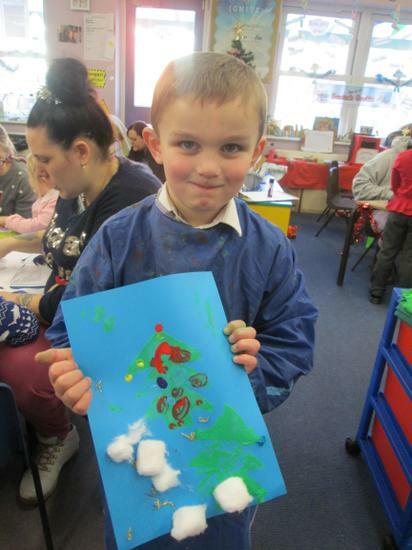 We also used our fine motor skills to cut out spiral Christmas trees as well as make trees using different sized pieces of paper. 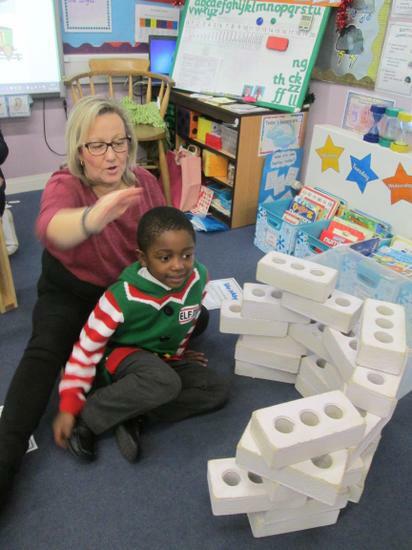 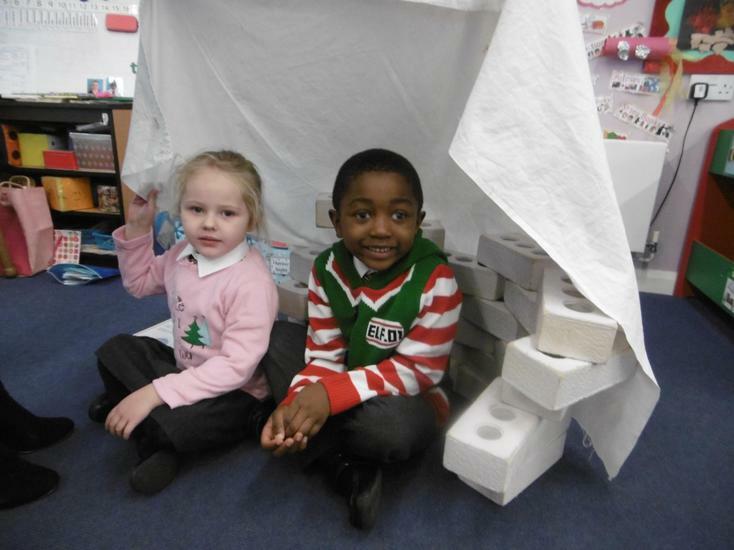 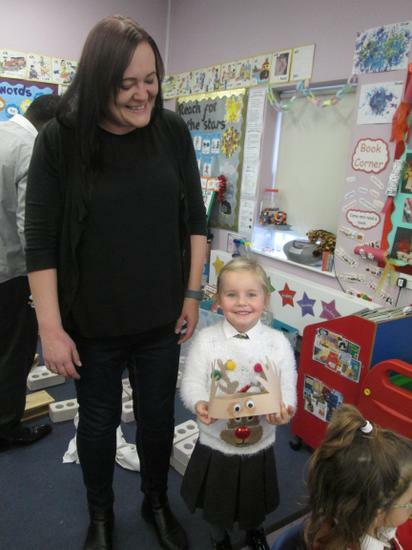 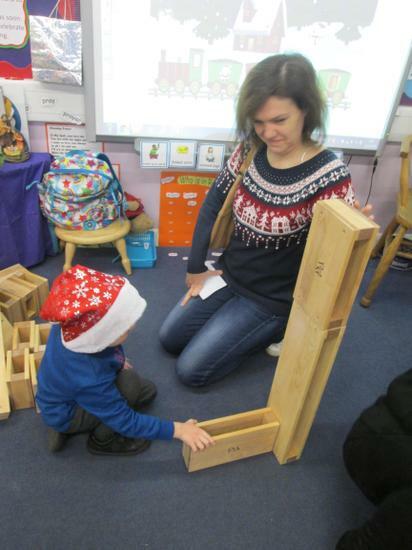 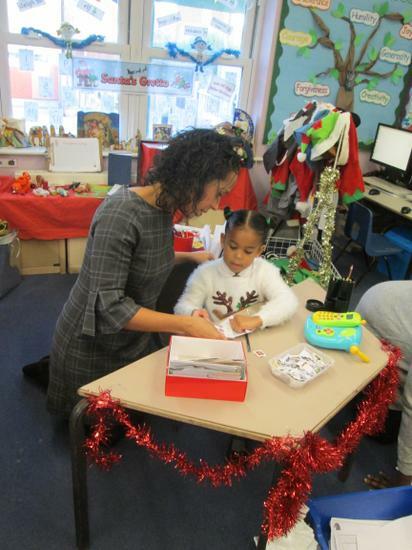 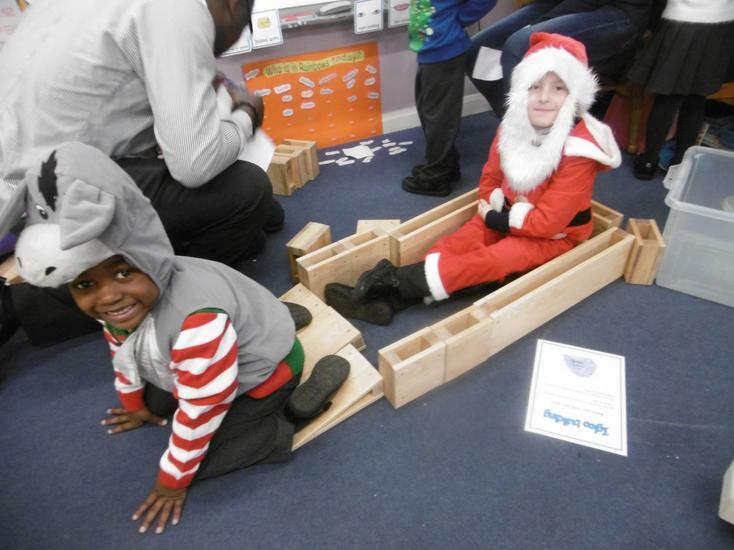 We made up stories with the arctic animals and took on roles in the Santa's Grotto role play and when building igloos and sleighs out of the blocks! 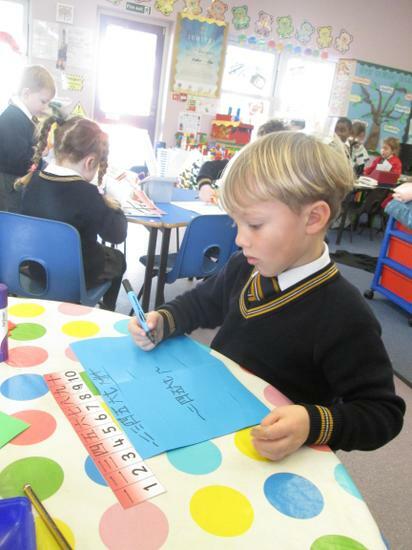 Phew, what a busy time we had!! 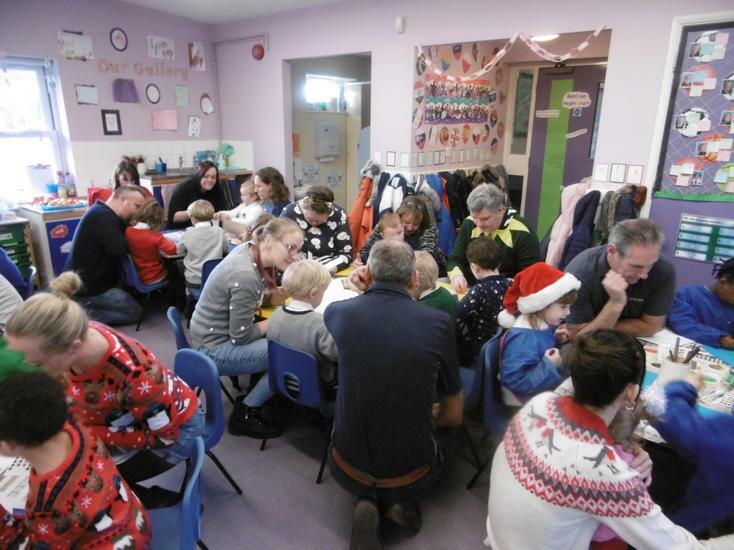 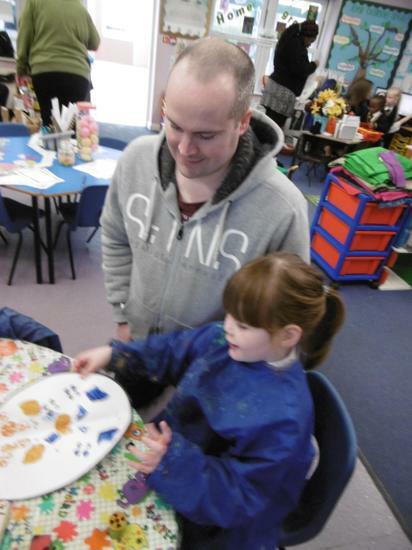 Thank you to all the family members who joined us and we hope you enjoyed your biscuits! 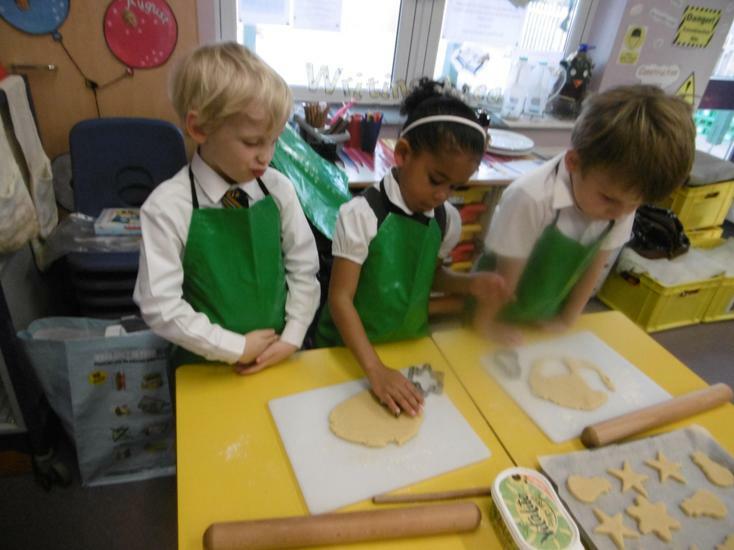 We decided to make some biscuits as a little gift for our family members at the end of the forthcoming share session. 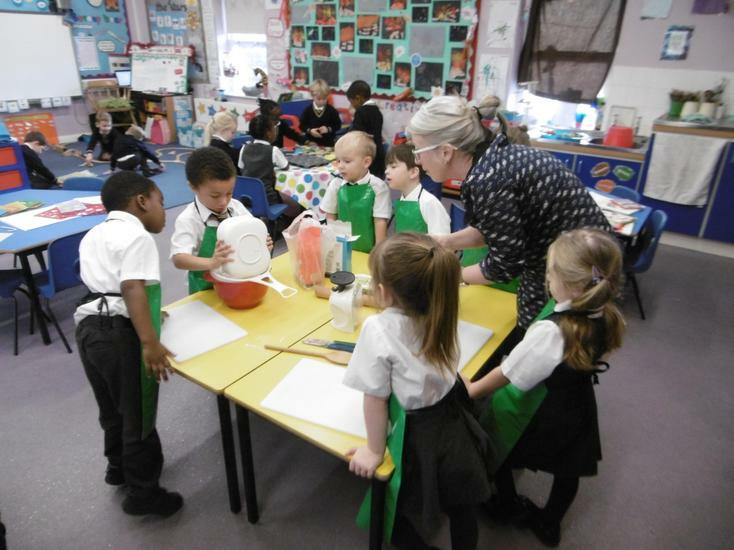 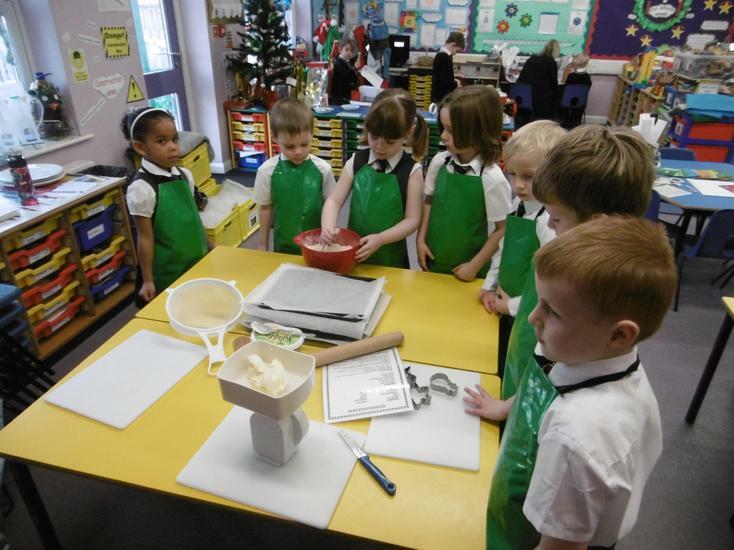 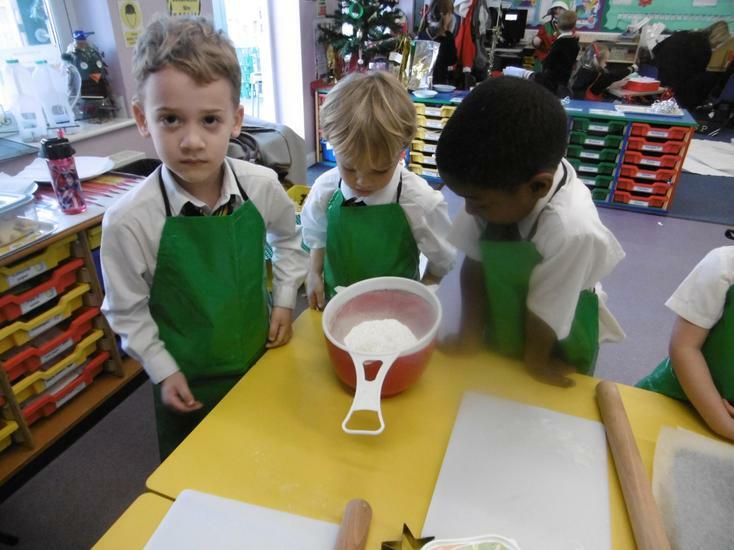 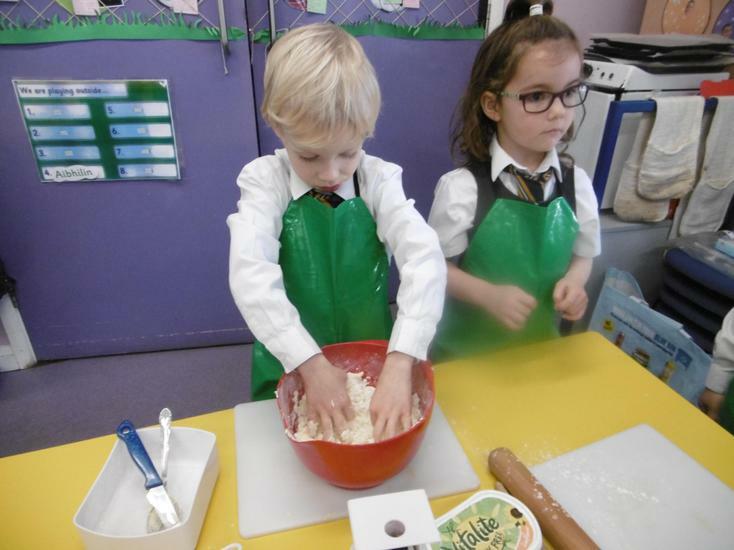 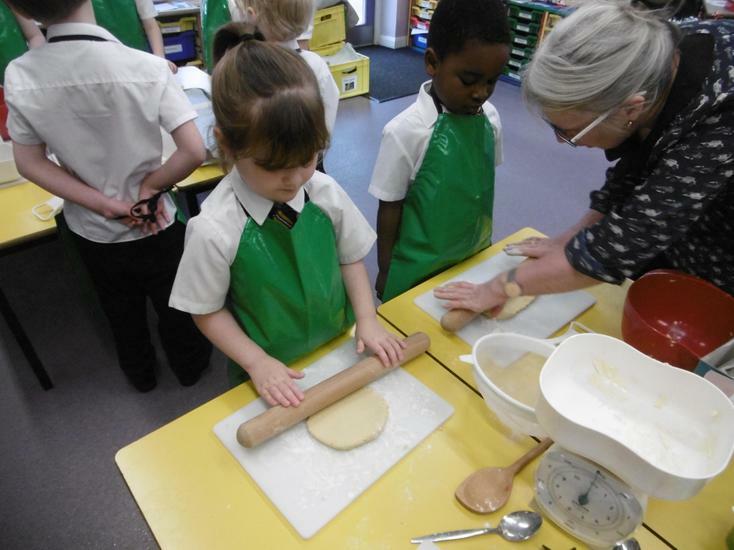 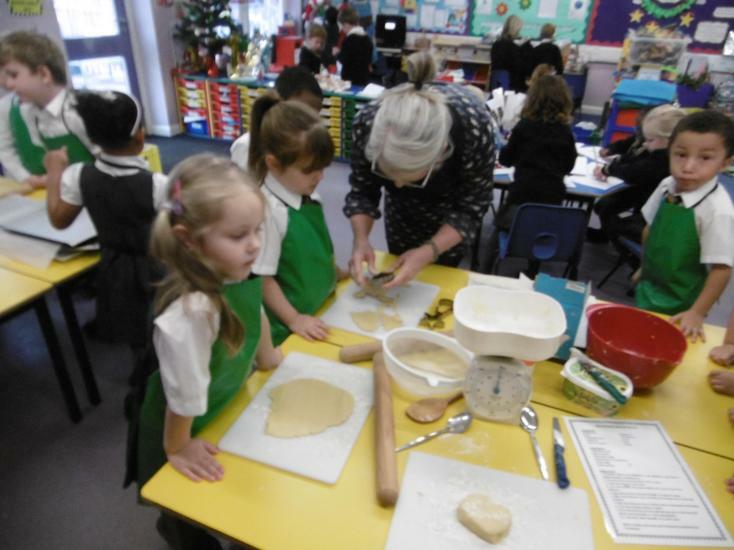 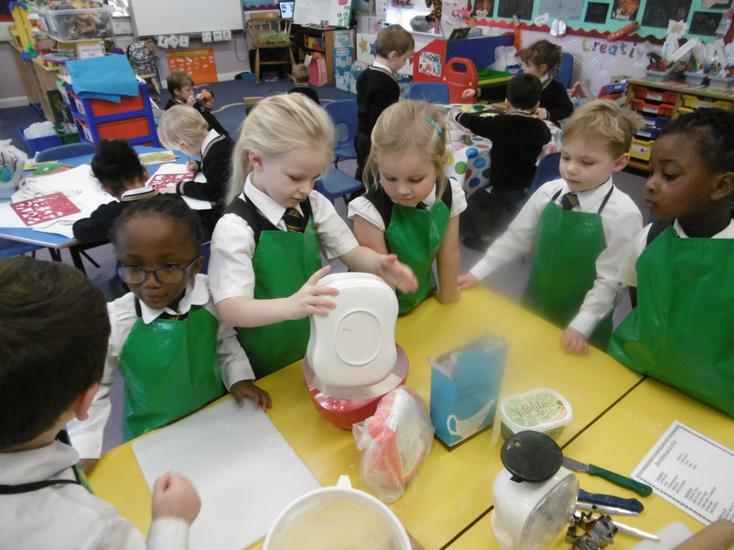 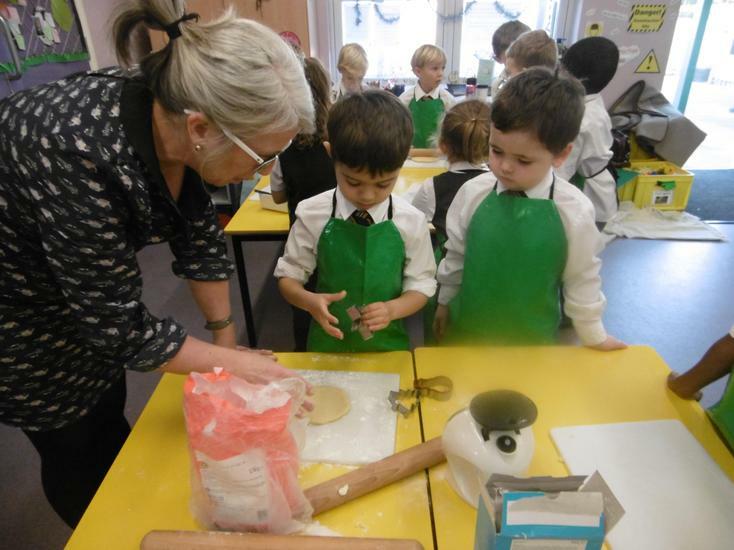 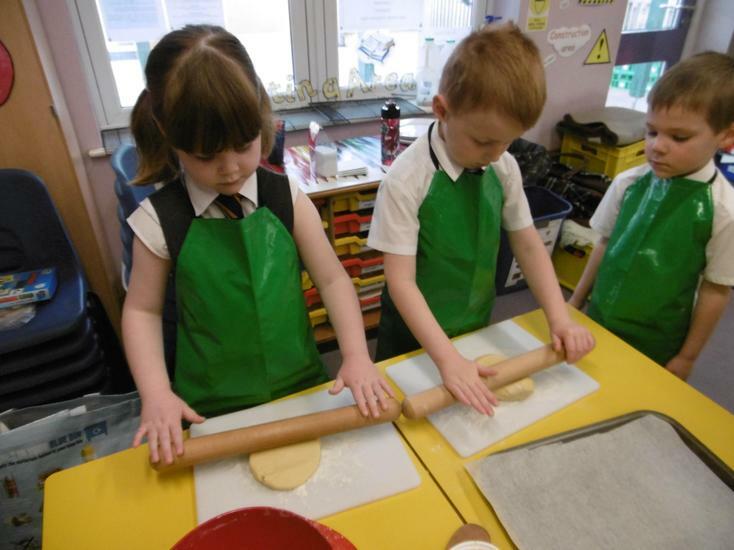 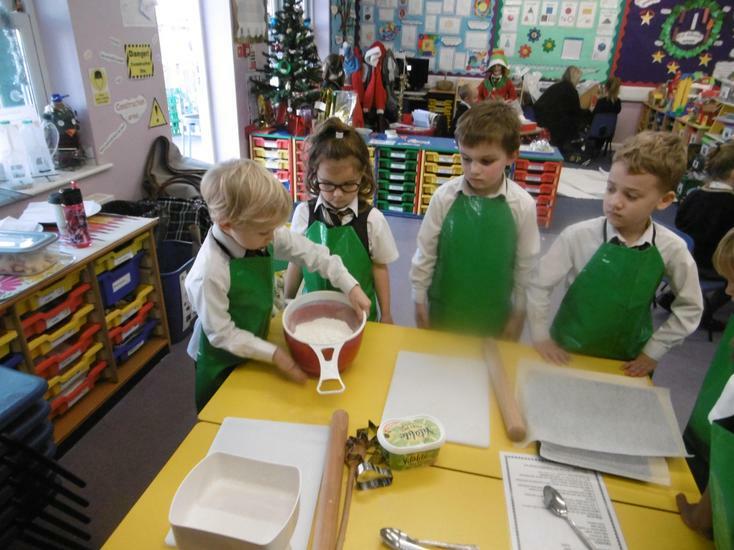 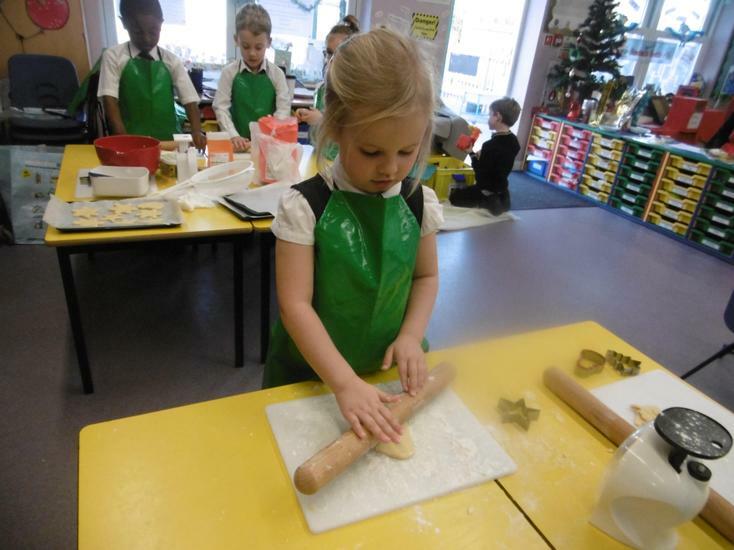 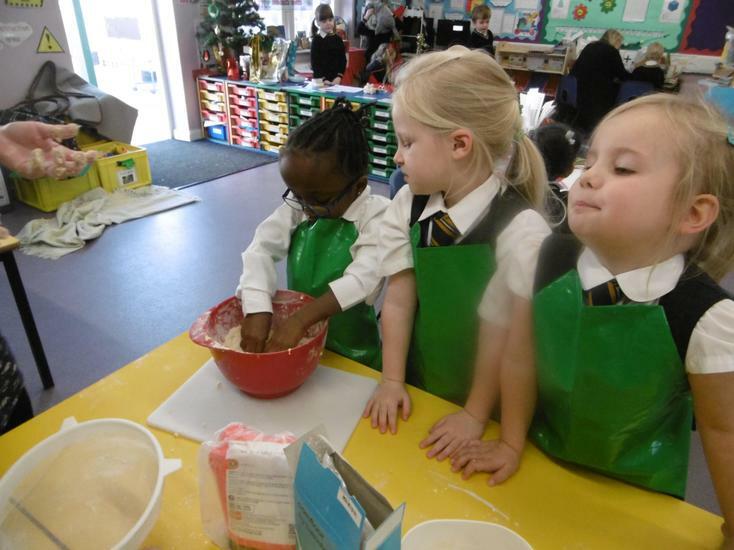 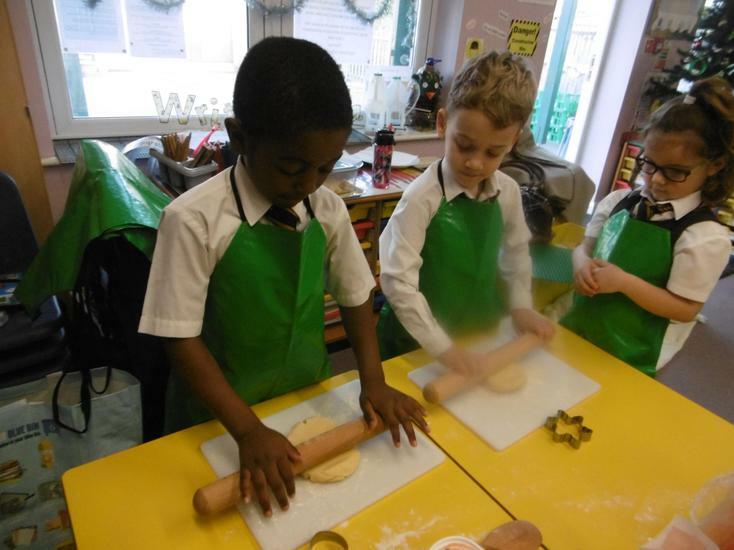 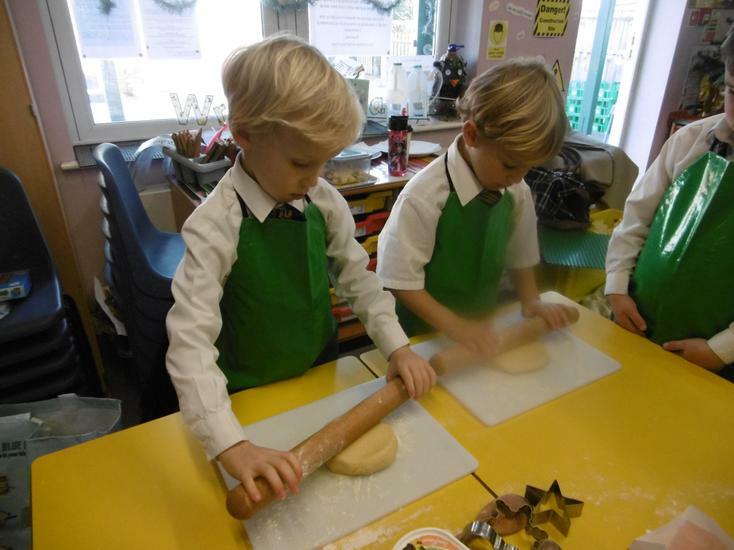 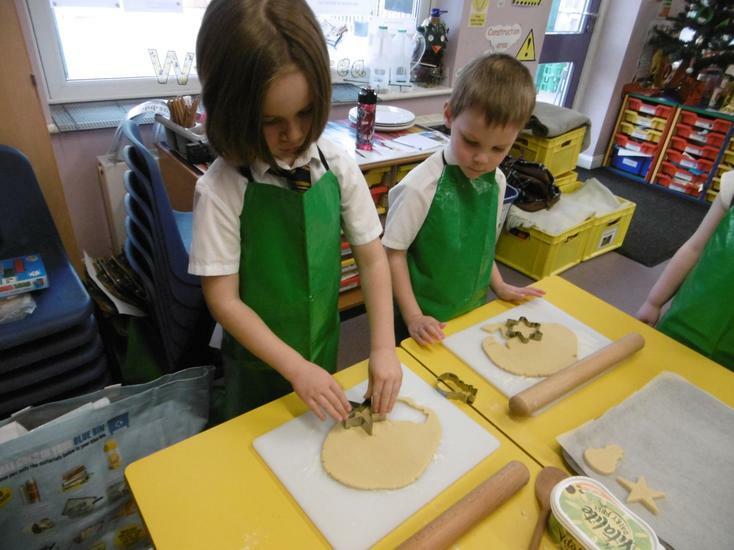 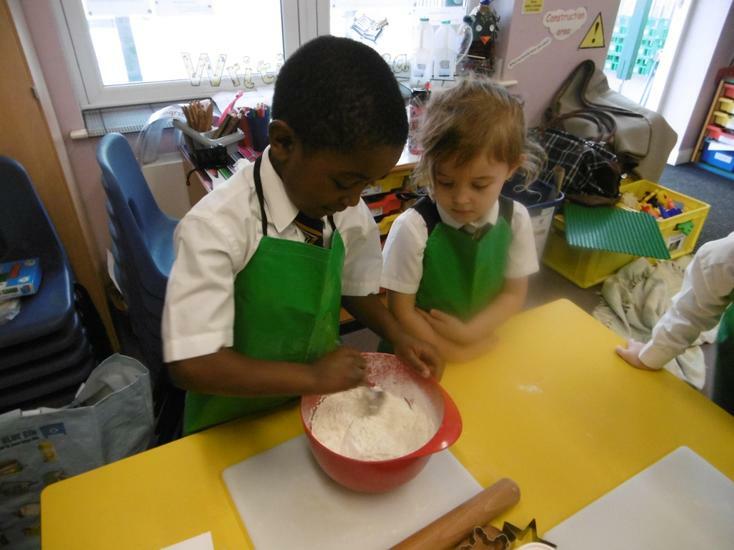 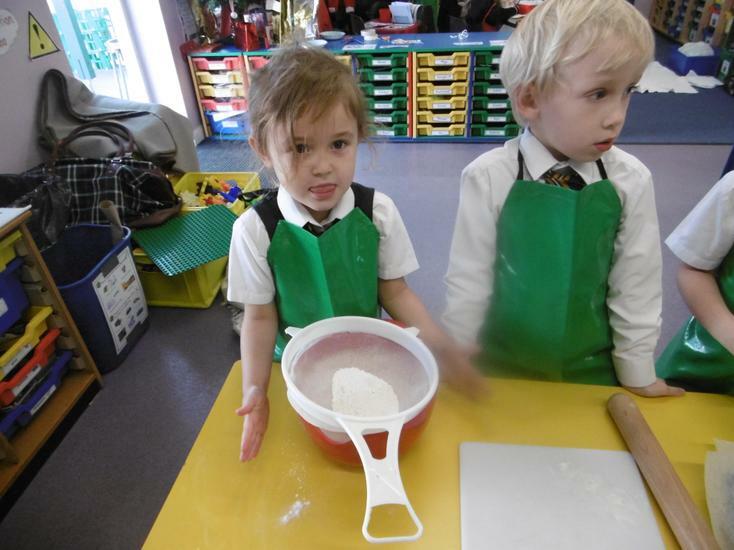 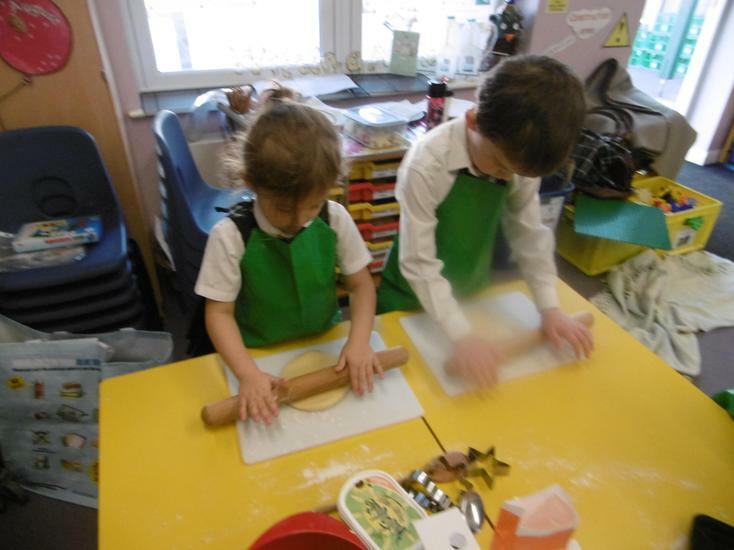 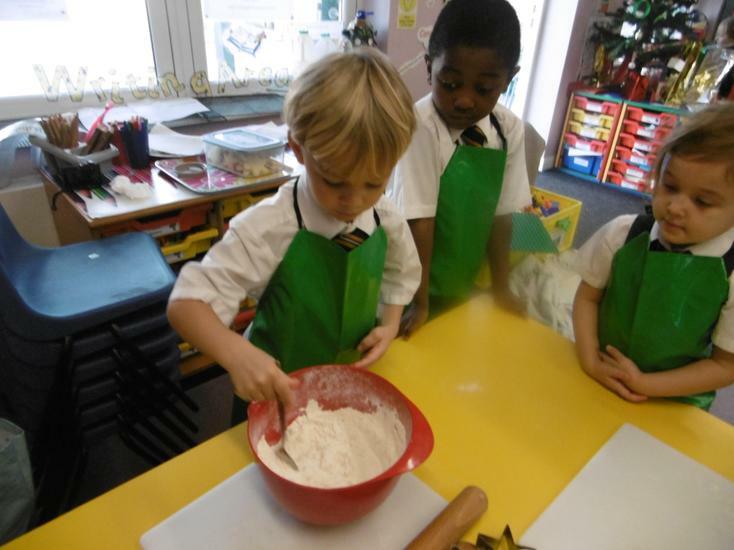 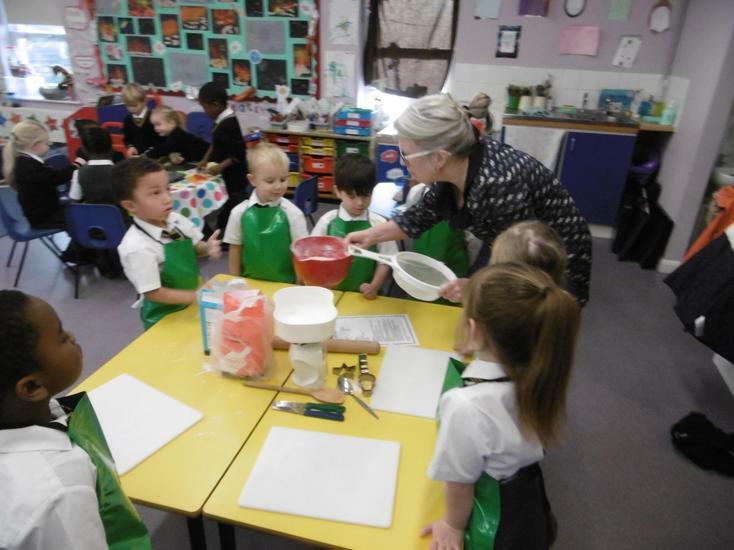 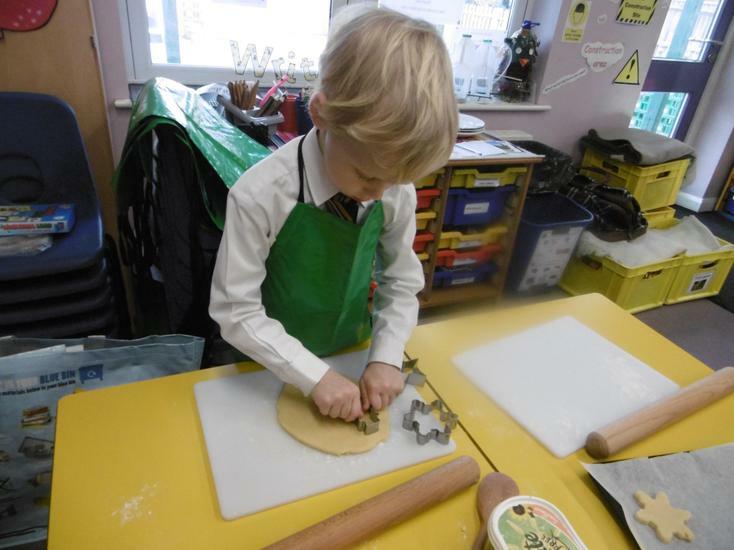 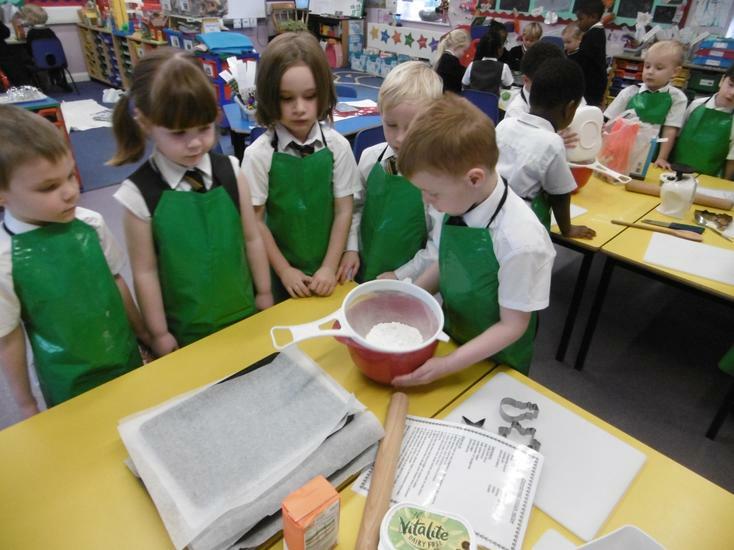 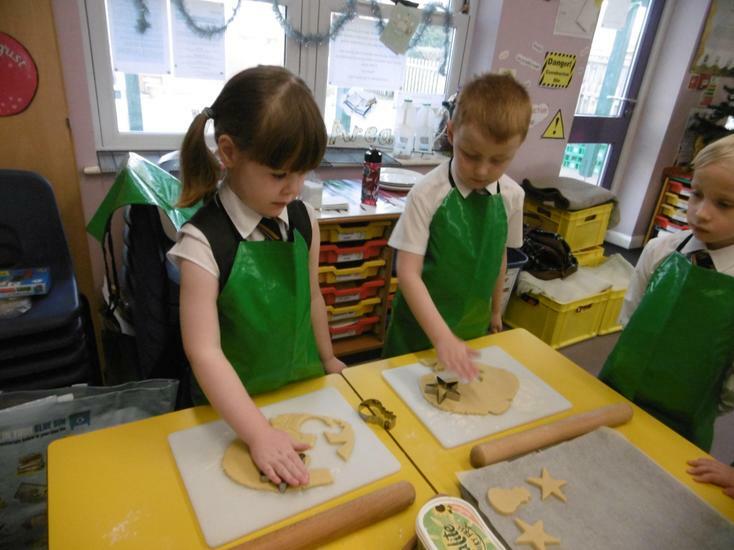 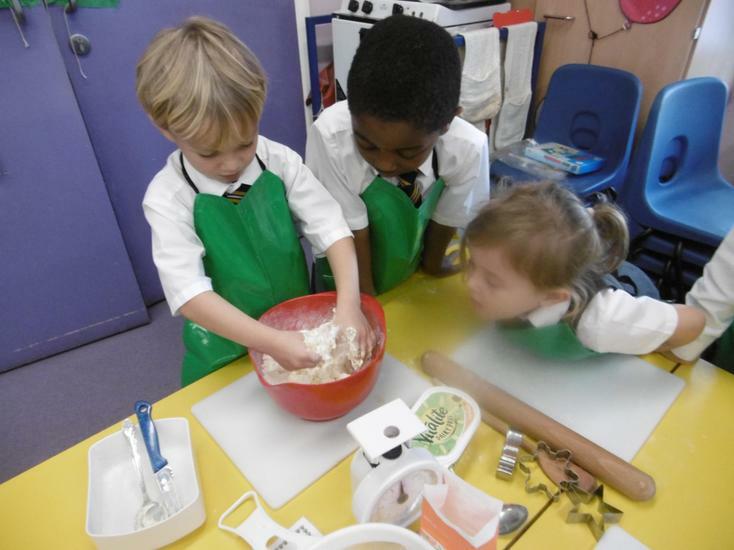 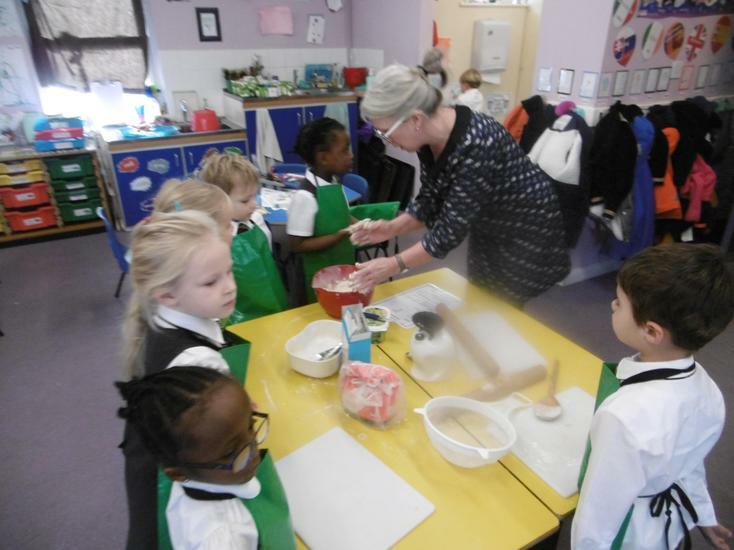 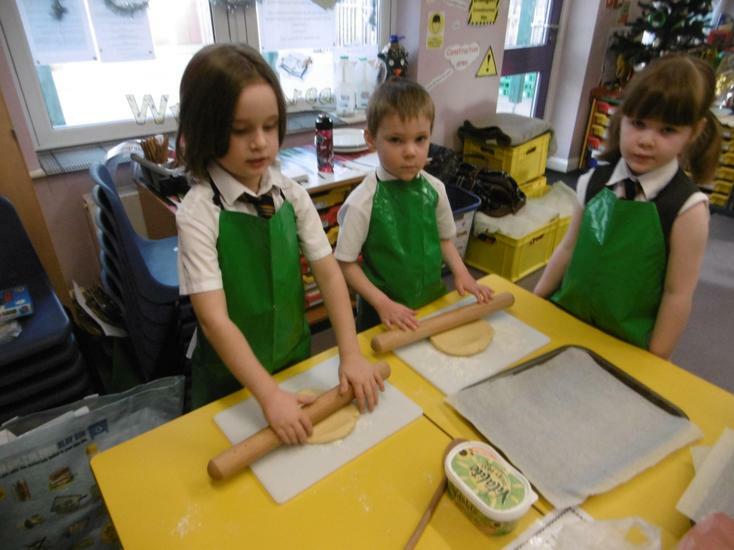 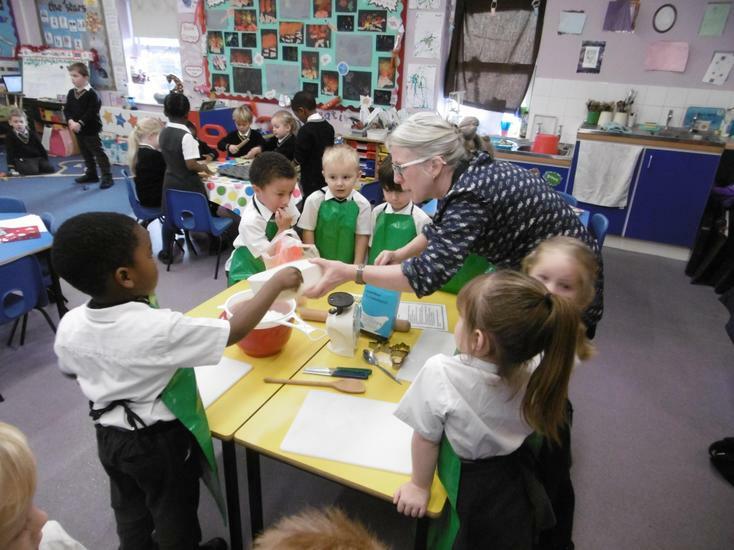 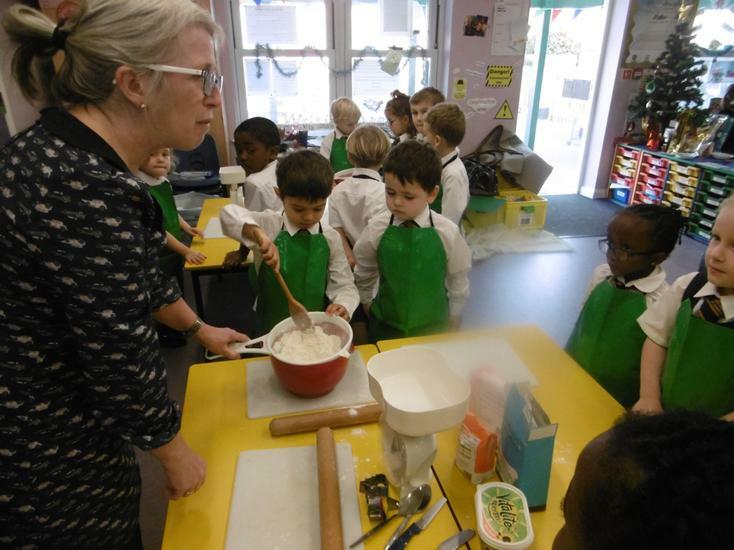 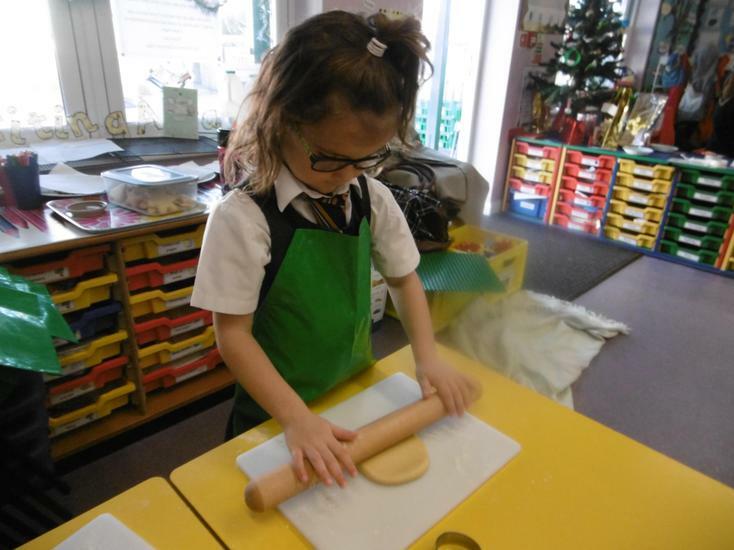 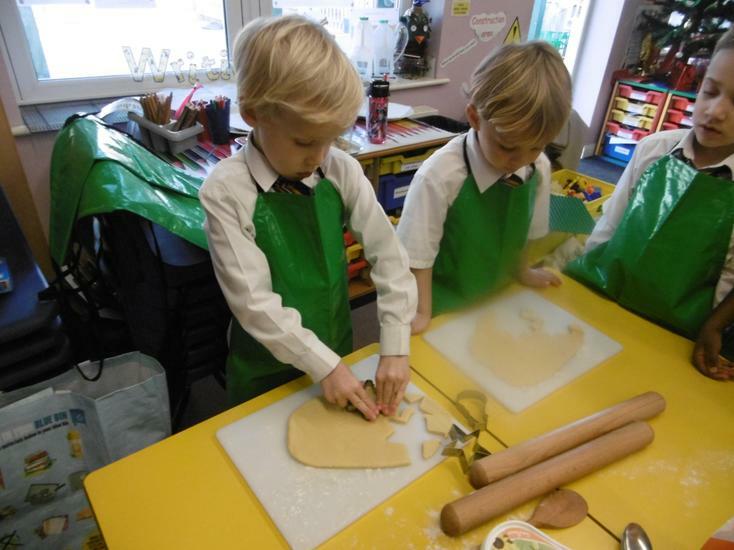 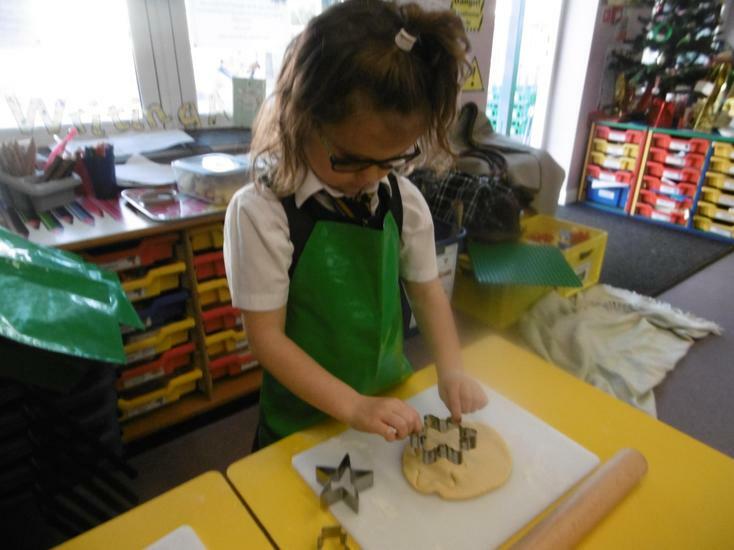 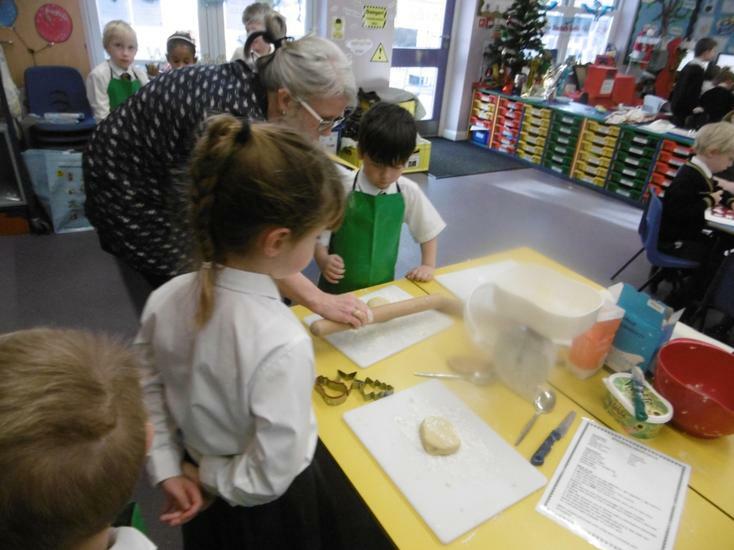 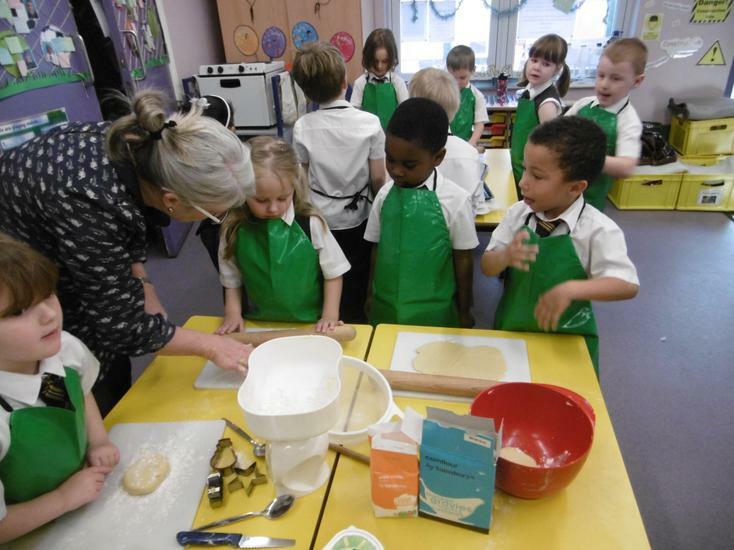 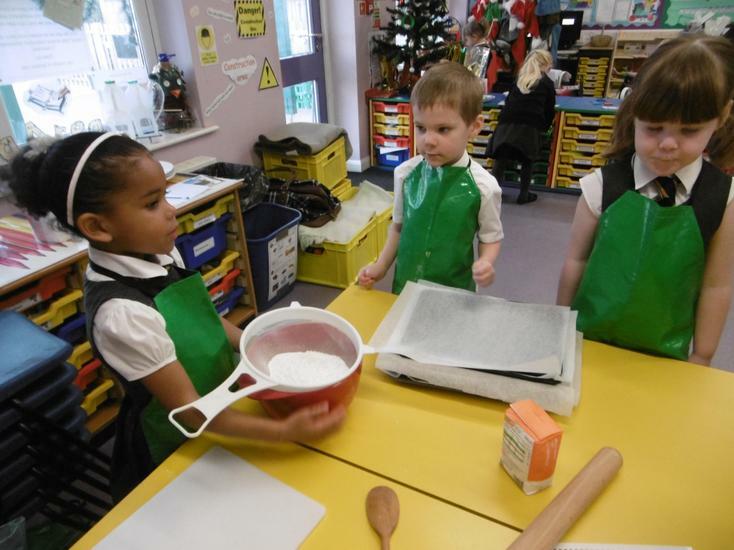 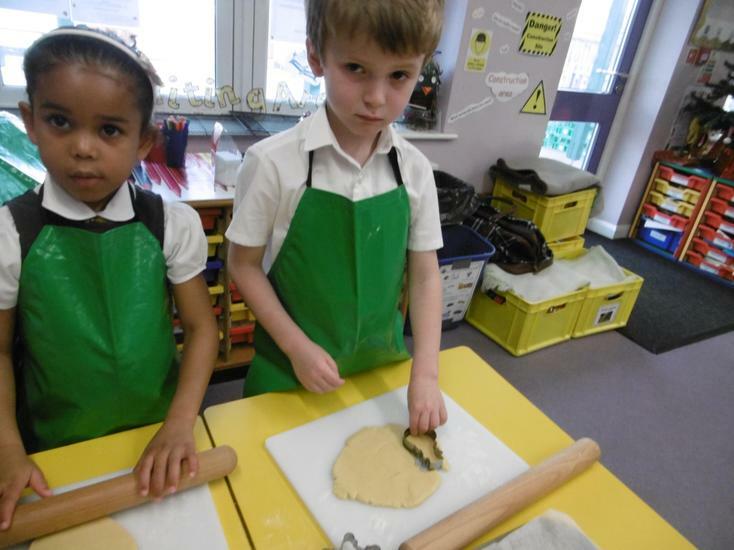 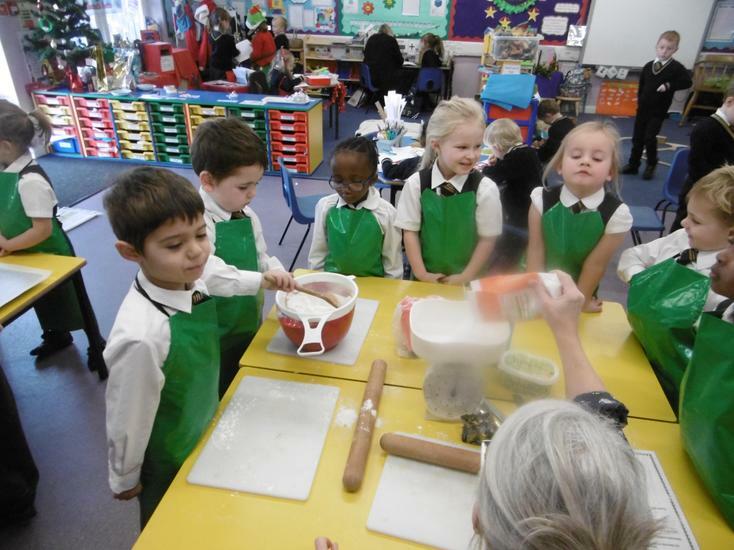 We followed a recipe, measuring out the ingredients using the scales and working together to sieve the flour, rub in the butter, roll out the dough and finally cut the biscuit shapes. 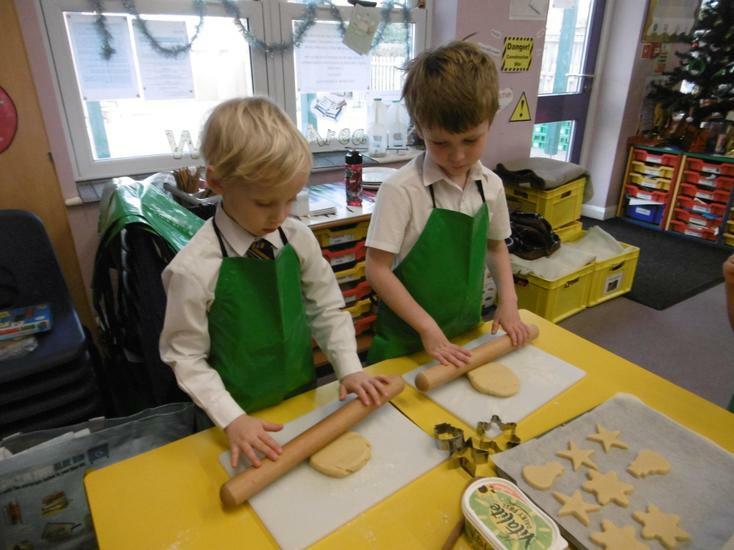 They smelt lovely as they cooked and we are looking forward to icing them tomorrow. 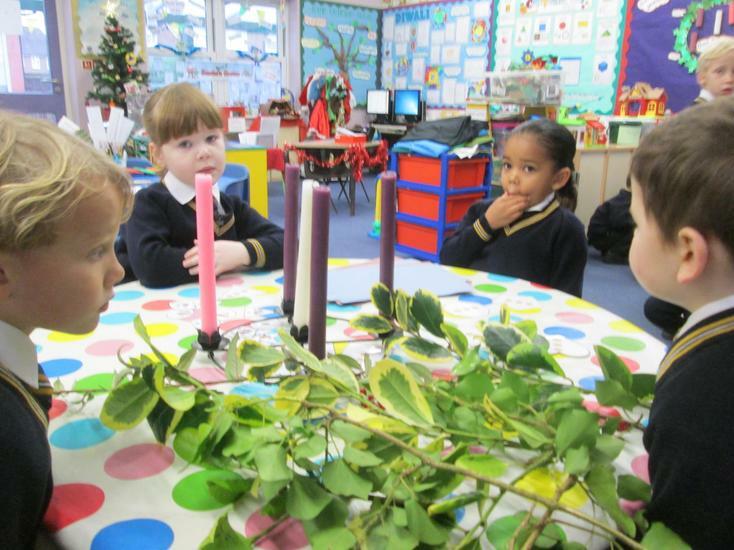 In RE, the class have been learning about Advent and its meaning. 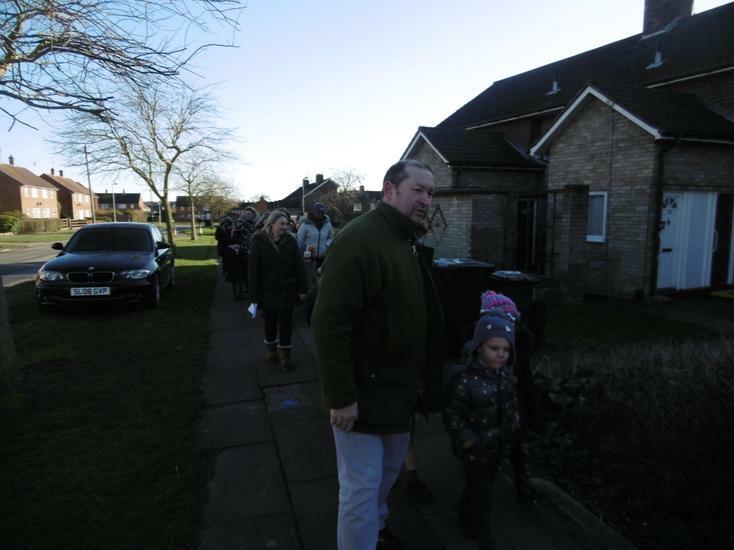 It is a time of preparation for the coming of Jesus. 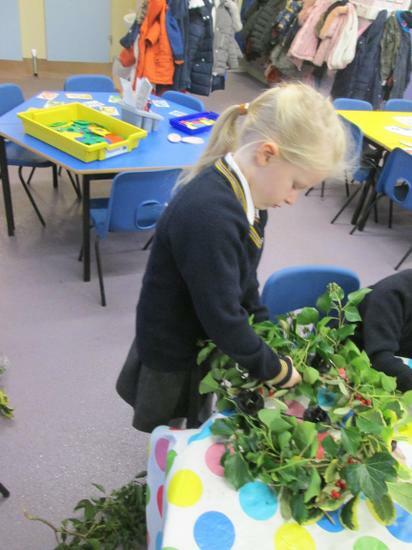 The children made their own wreaths with green handprints for the circular wreath and added red finger prints for the berries. 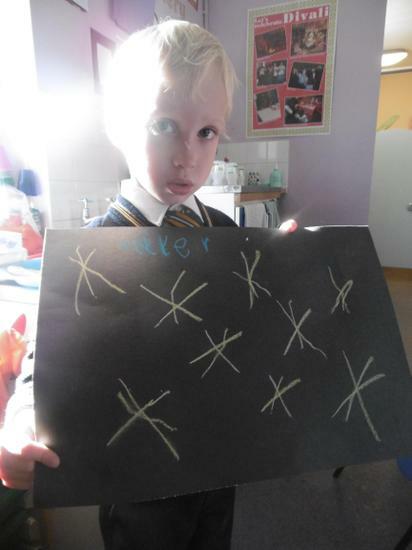 They then stuck the candles on, remembering what each candle represented- love, joy, hope and peace. 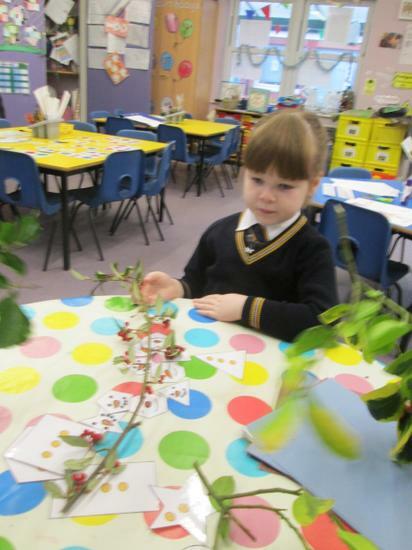 The children also worked in small groups and with adult support, decorated our class advent wreath with greenery to put in our prayer corner and added the 5 candles. 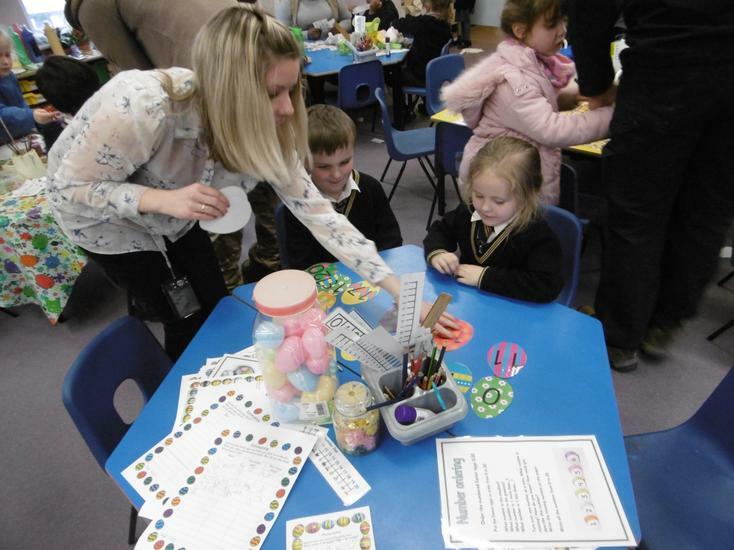 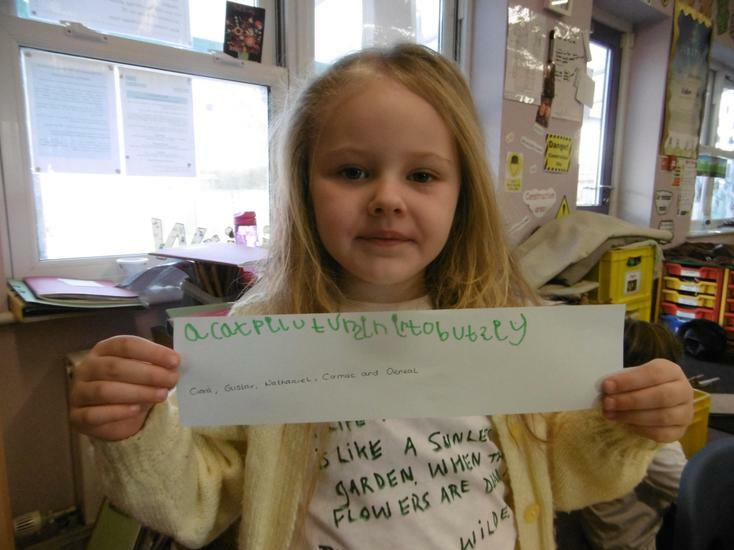 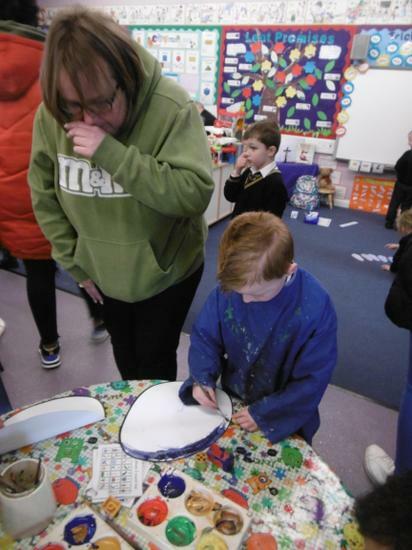 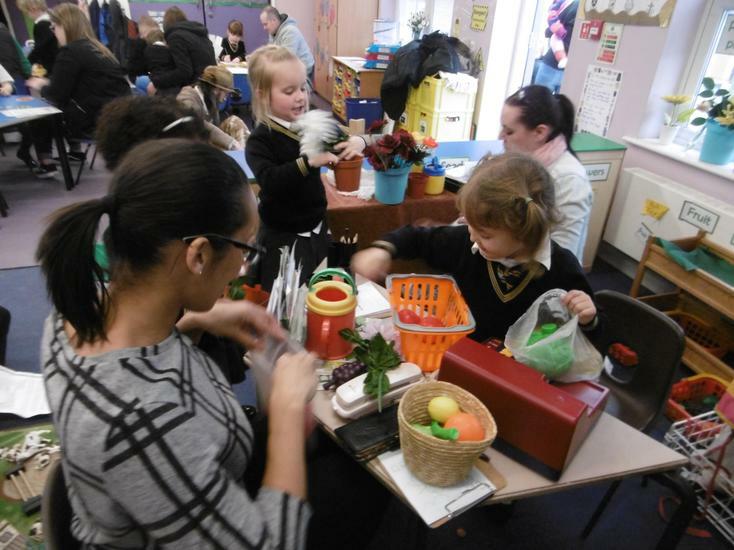 We were very busy for Green Week, focusing on the 3Rs of Reduce, Reuse and Recycle. 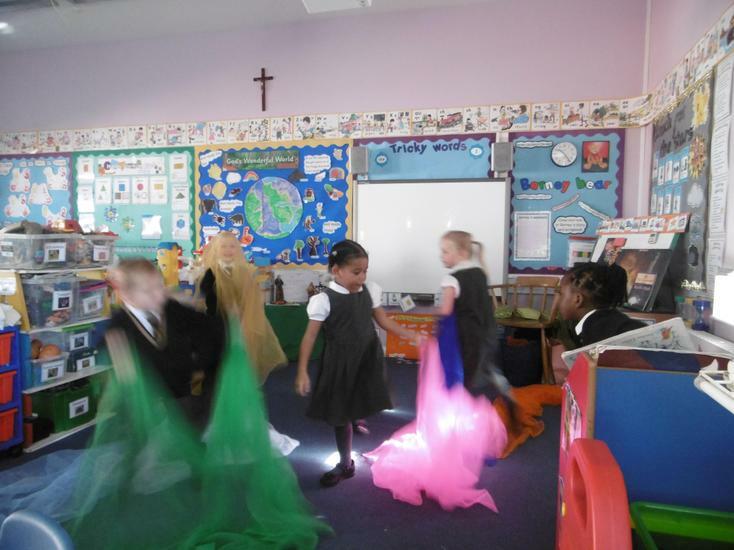 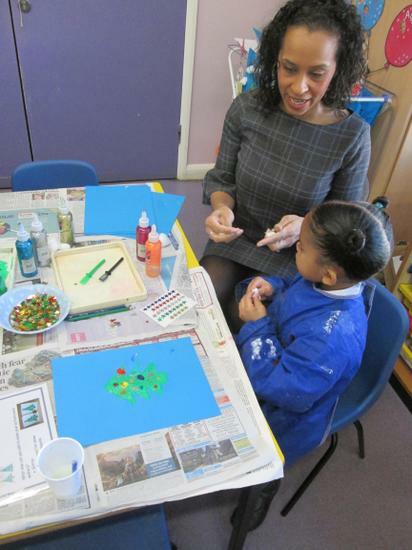 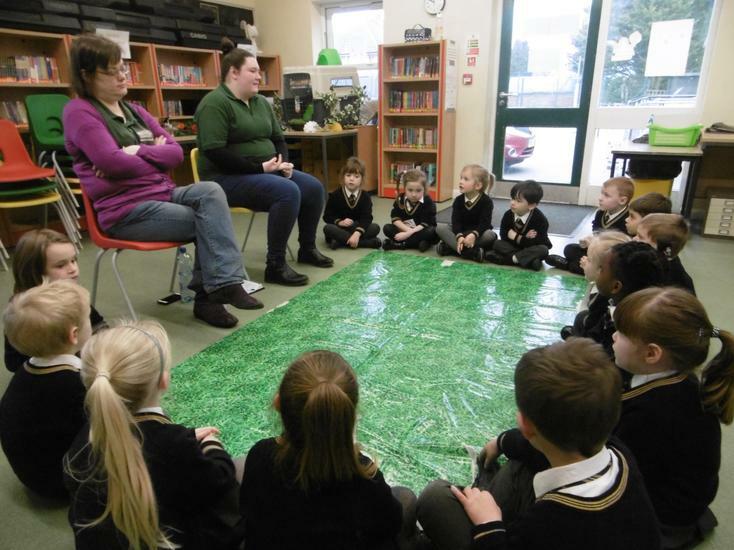 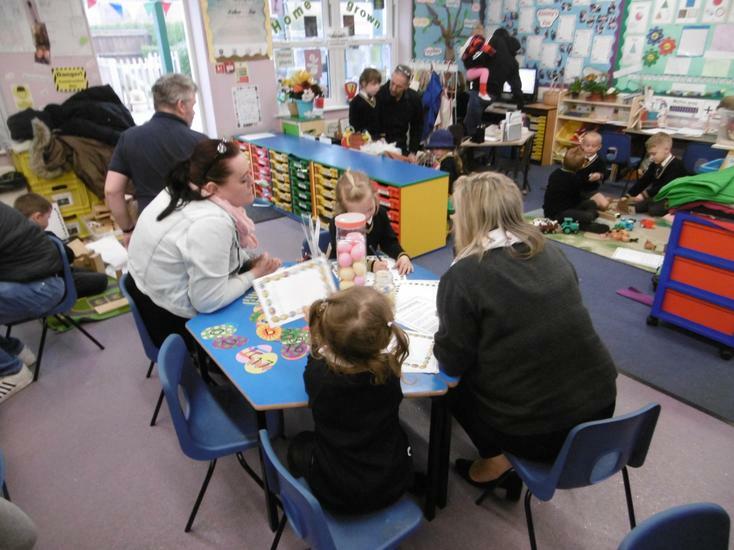 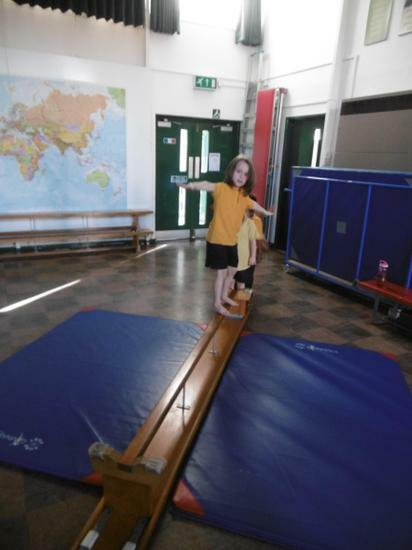 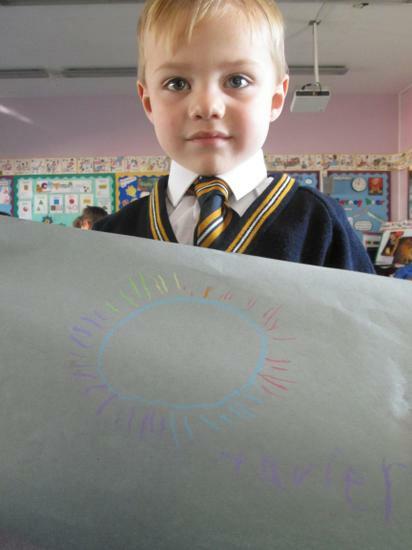 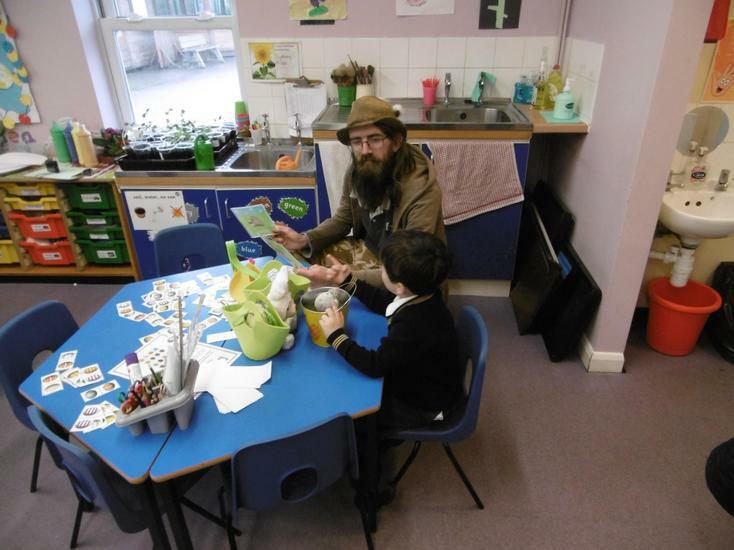 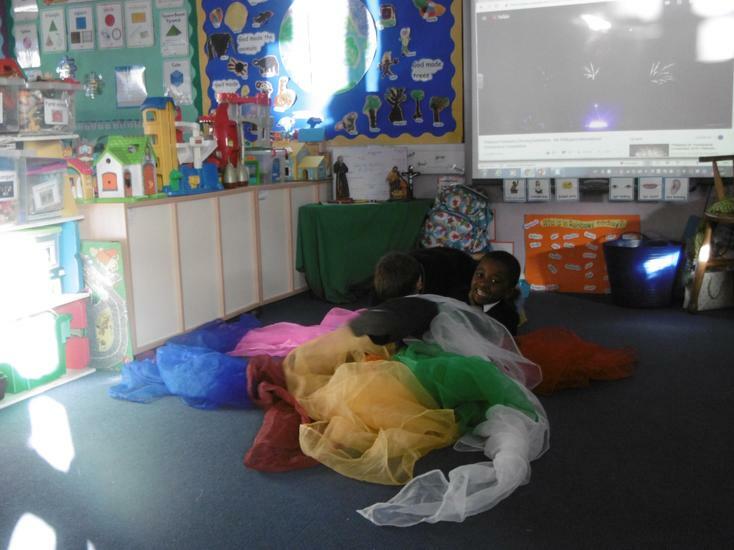 Take a look at the Our Green School area and the Rainbows section (link below). 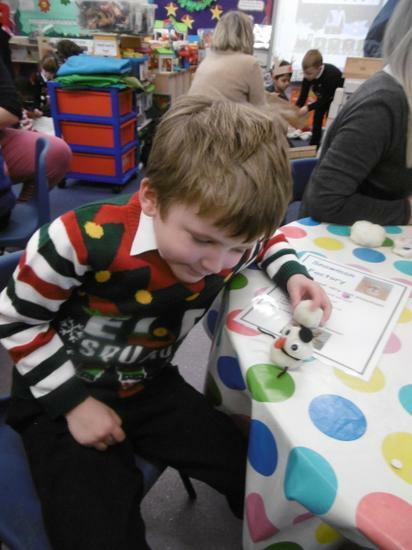 Thank you for your donations and fantastically spotty clothes today! 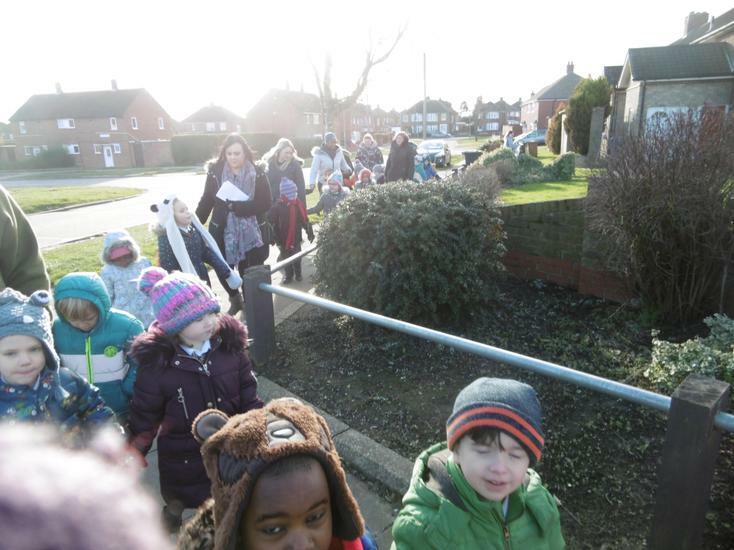 You all looked brilliant! 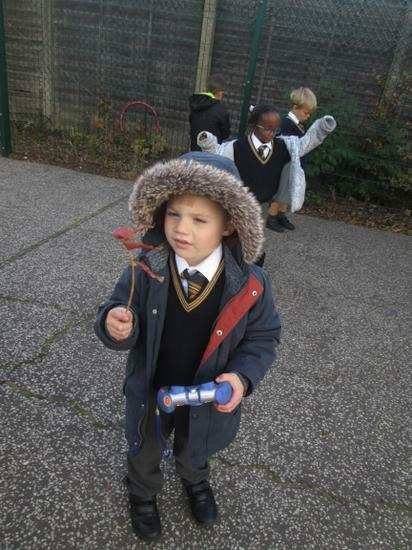 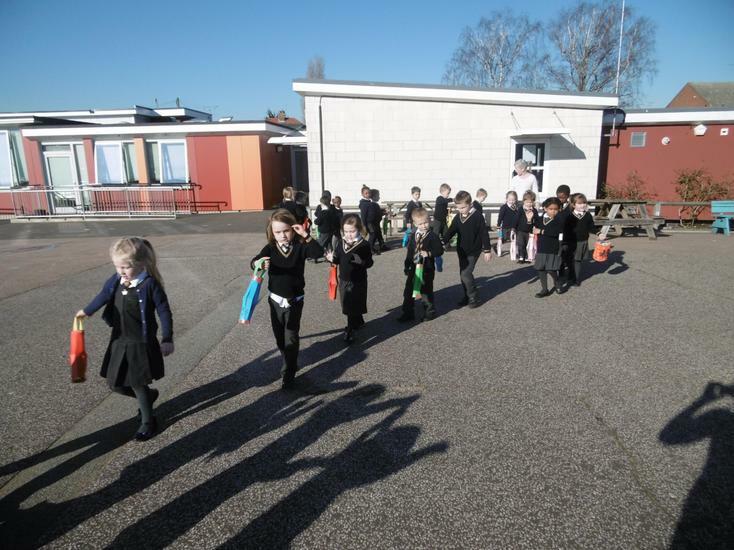 The class went on an Autumn walk around the School grounds, looking for signs for Autumn. 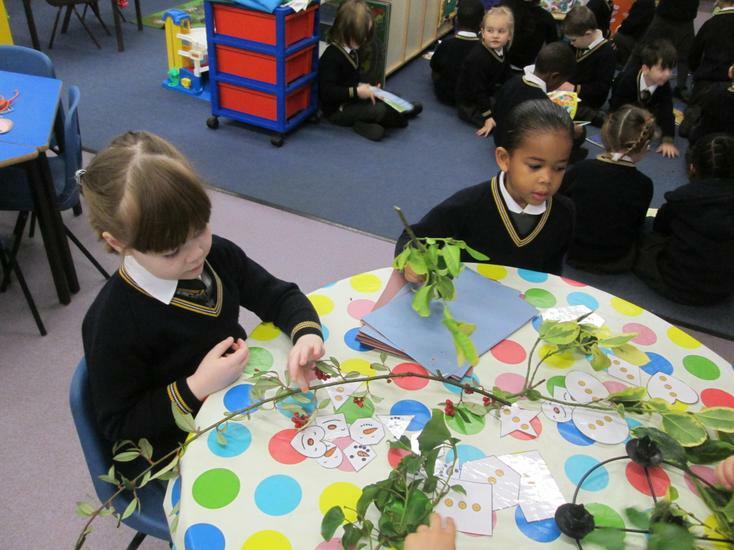 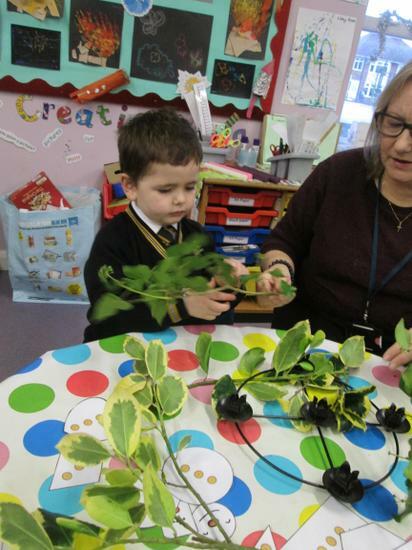 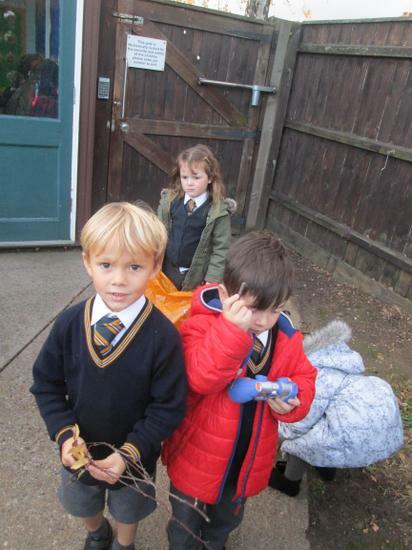 The children worked in small groups searching for leaves, twigs and looking at different trees and bushes. 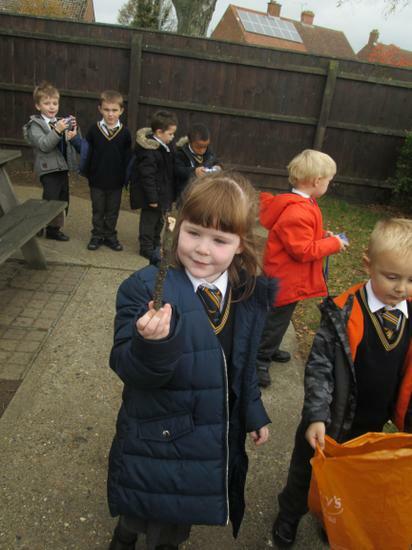 It was a windy day and the leaves were blowing around the playground! 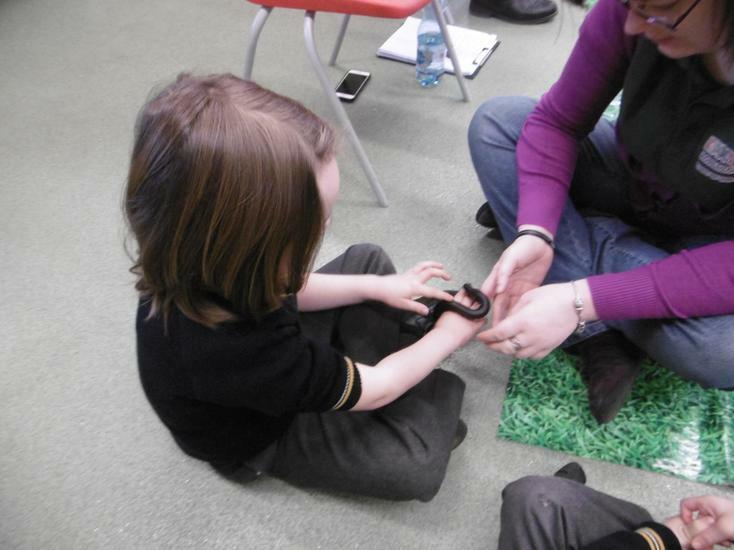 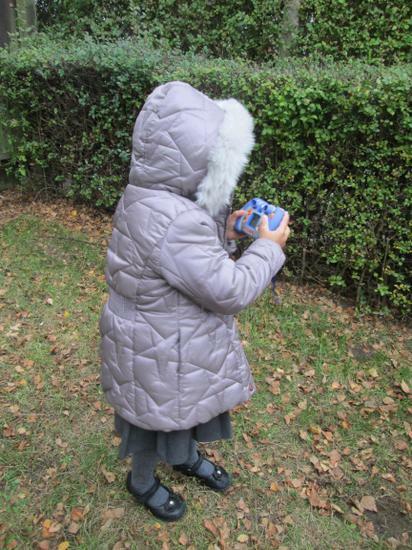 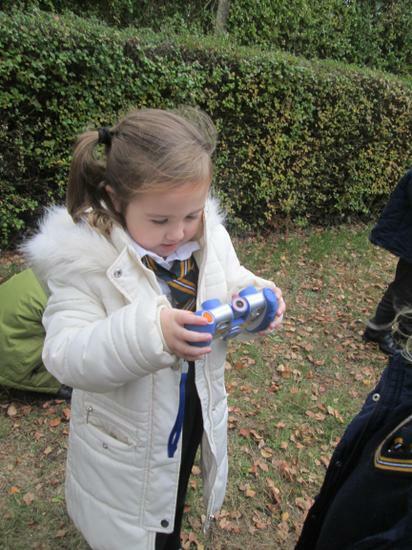 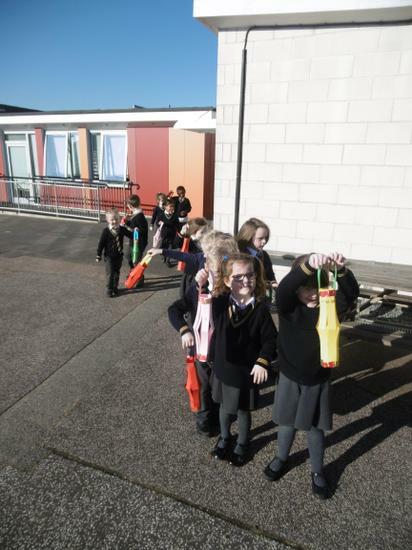 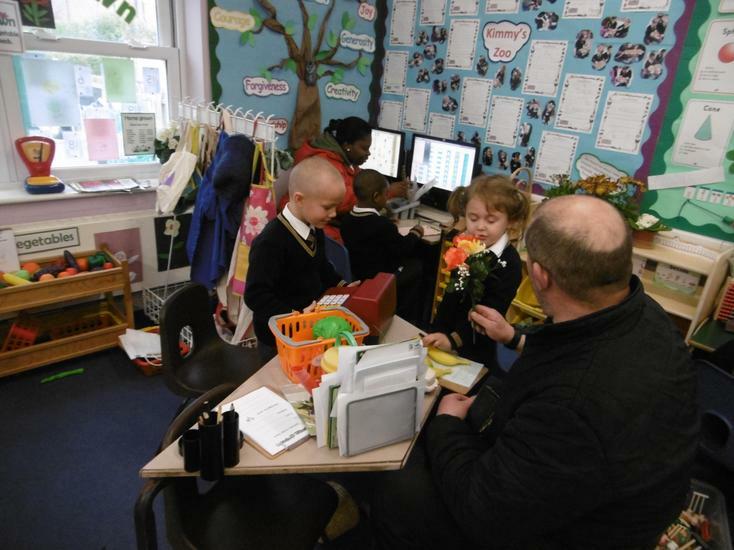 The Rainbows enjoyed using the Vtech cameras and took photos of all of the Autumn materials they found. 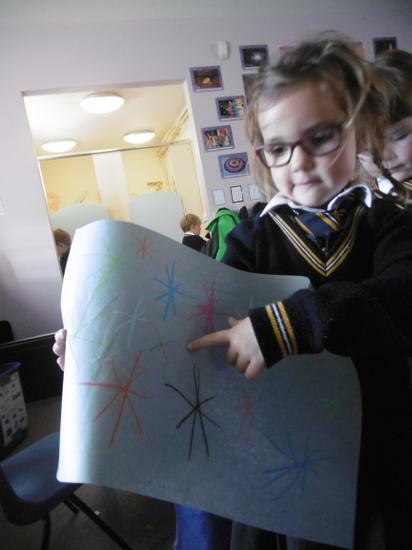 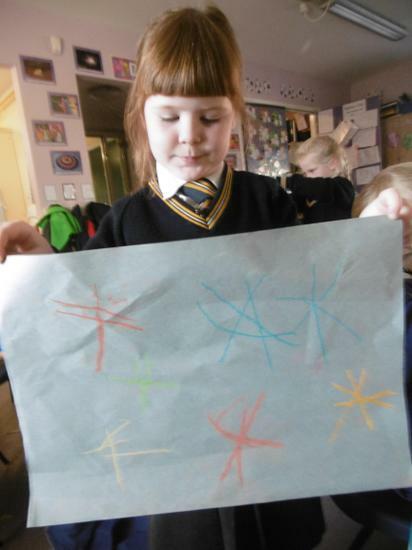 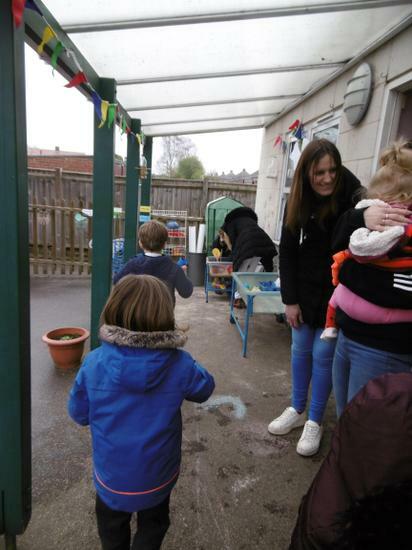 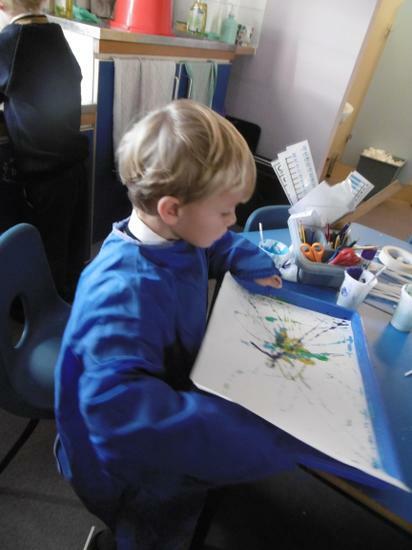 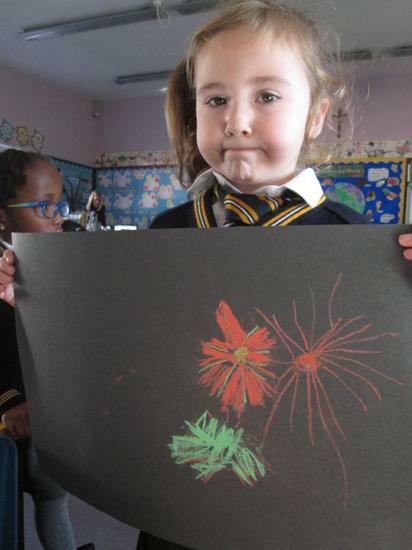 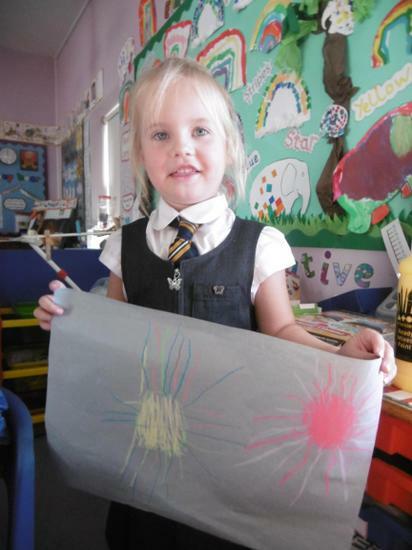 We found out about Bonfire Night, listening to the story of the gunpowder plot, creating firework dances, chalk pictures, marble paintings and firework models.